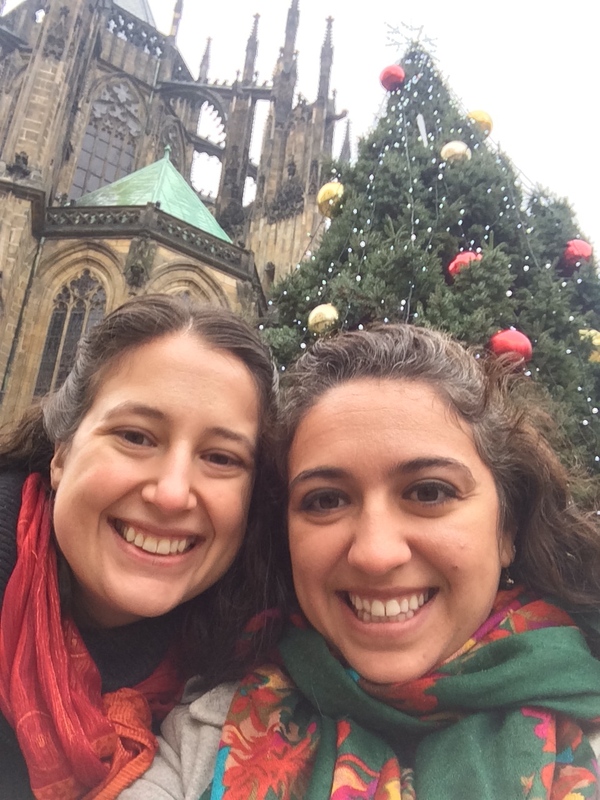 Our journey abroad…faith, history, culture, and beyond! | We invite you to share in a glimpse of our travels as we explore our spiritual and cultural roots. 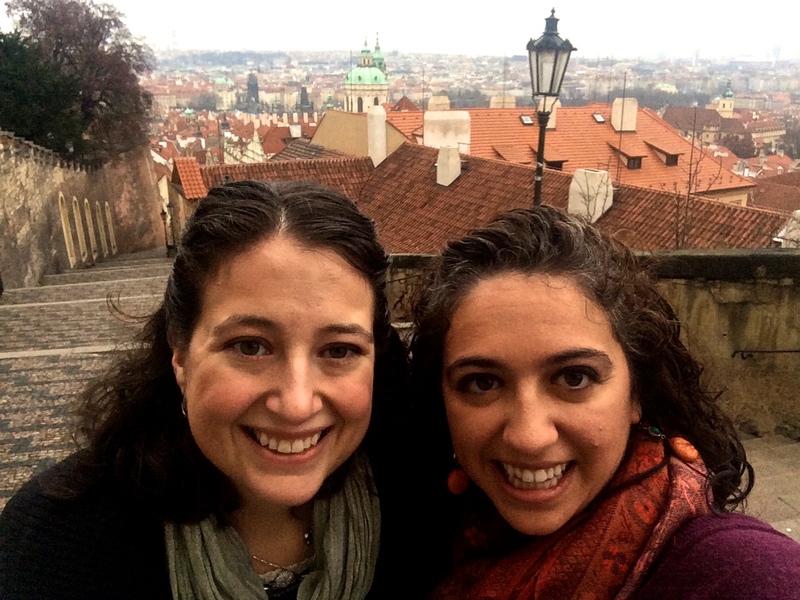 Our journey abroad…faith, history, culture, and beyond! 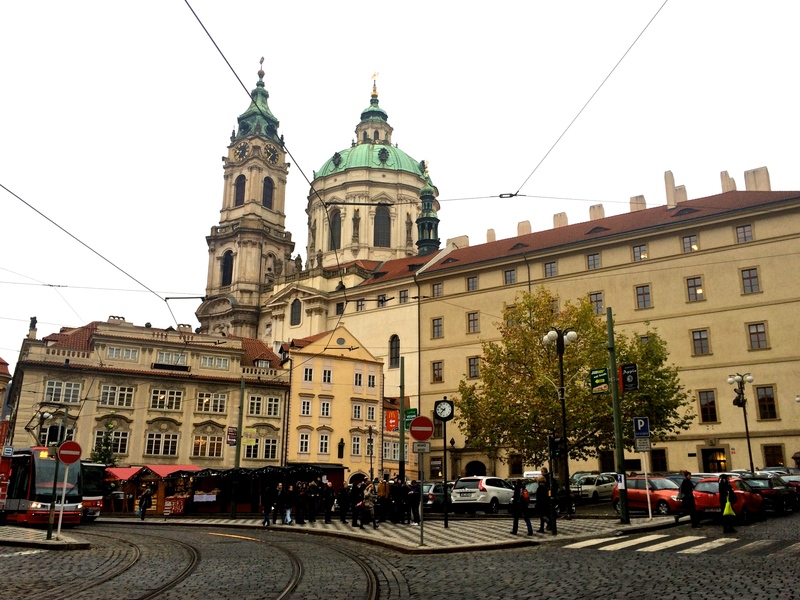 Prague: dynamic history, spectacular architecture, delicious food and more! 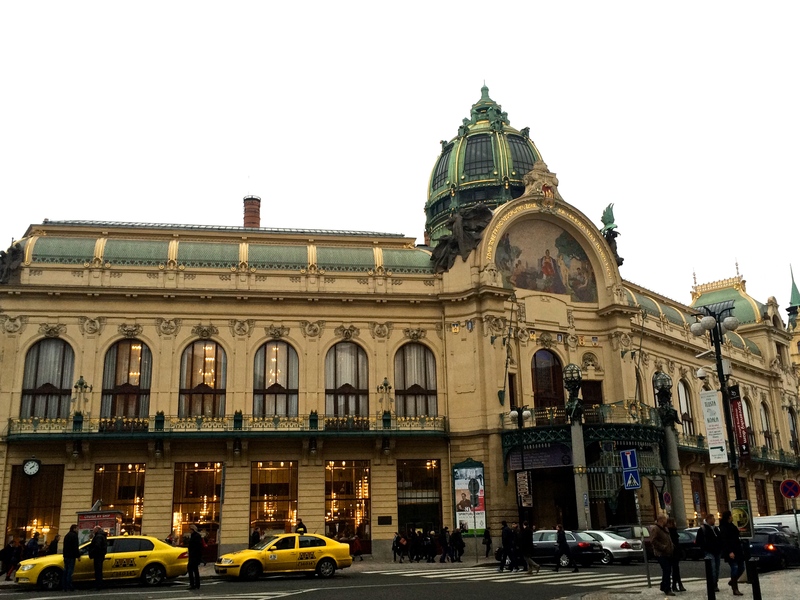 The third and last city on our agenda: Prague! 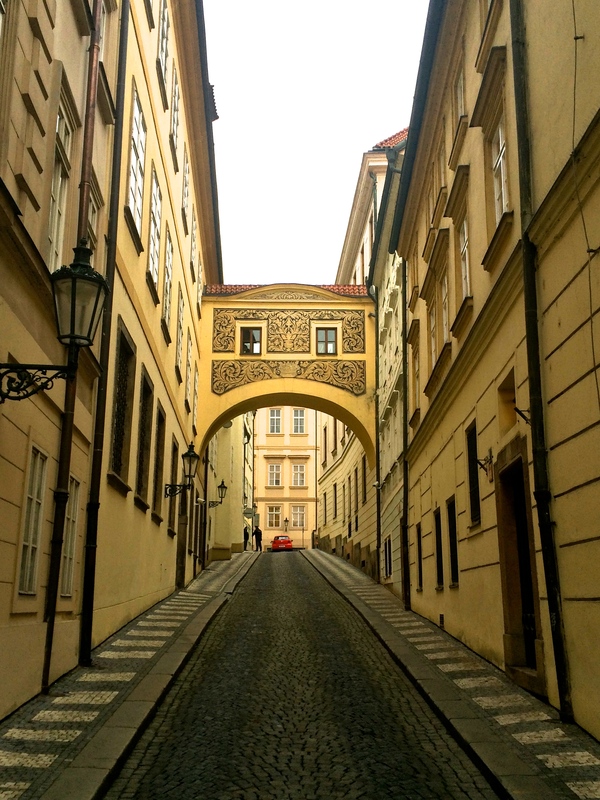 In recent conversations, Prague has been mentioned as a spectacularly beautiful and “must-see” city! 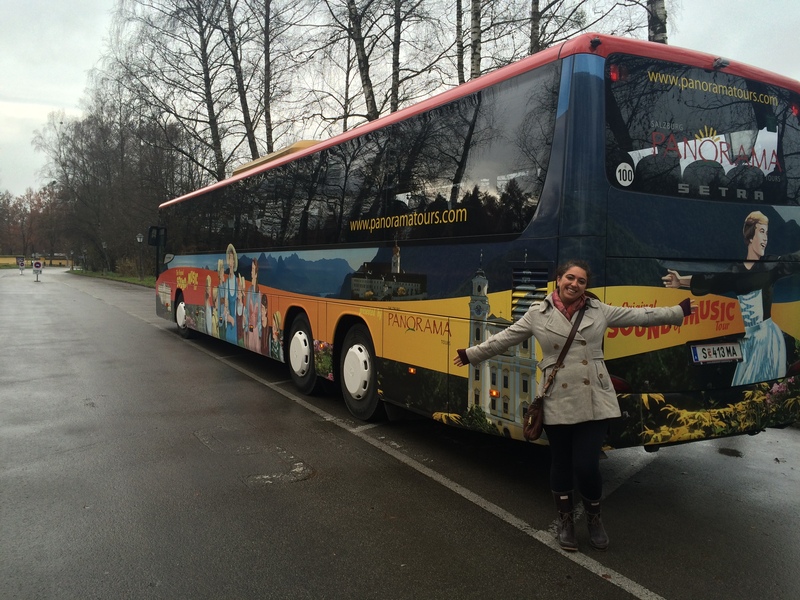 I was very excited when it became apart of our itinerary for this trip. 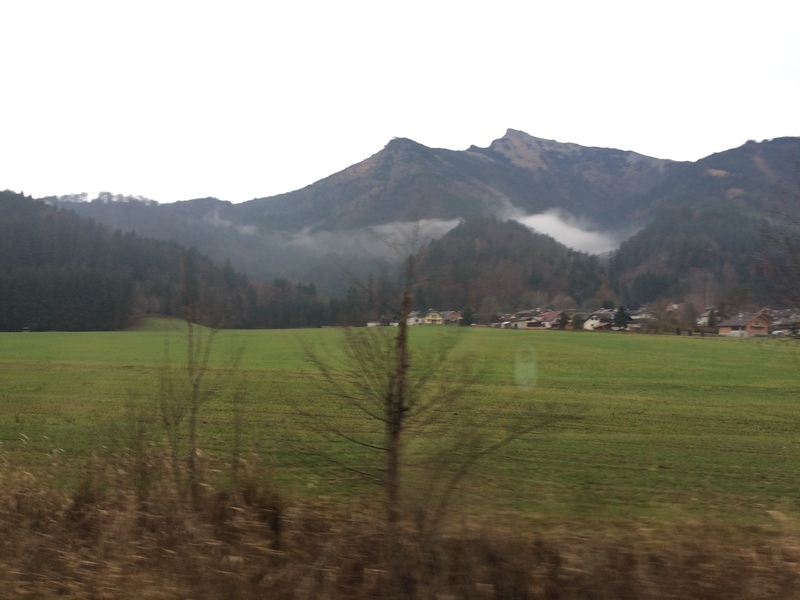 After a magical few days in Austria, we headed off by train from Salzburg to Prague. Thankfully we made both trains without any problems. As it turns out, my meticulous and arguably over the top planning tendencies have made our trip run quite smoothly! What a contrast to Austria! 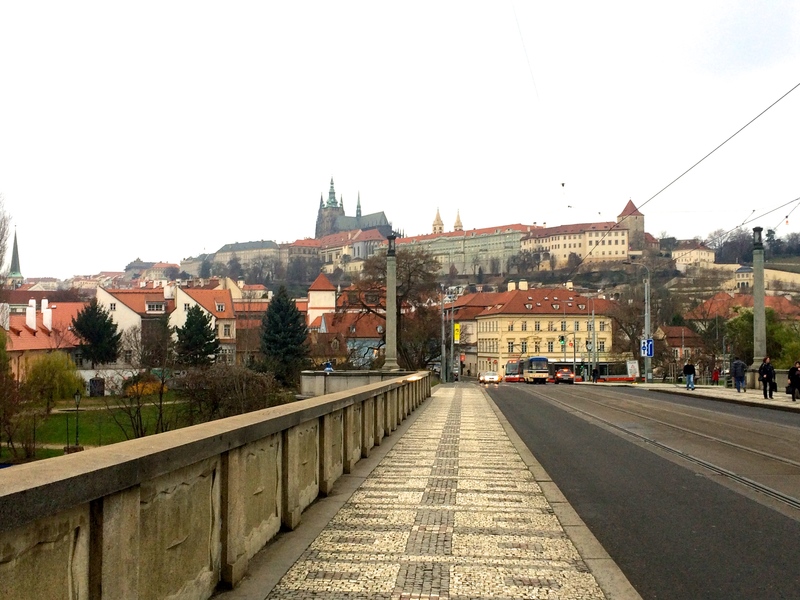 While their histories are very intertwined and their boarders touch, I found the Czech Republic to be very different from Austria. As our train entered the Czech Republic we started noticing the Czech words on buildings and hearing their spoken language on the loudspeaker. While German was definitely a foreign language to us, it shares similar roots with English and so it seemed more approachable. Czech on the other hand had a distinctive eastern European sound and was completely foreign to us. Based on the lack of English from the train manager, we assumed (and ended up assuming correctly) that people in the Czech Republic generally do not speak English as well as the Austrians but we still managed to get by alright! 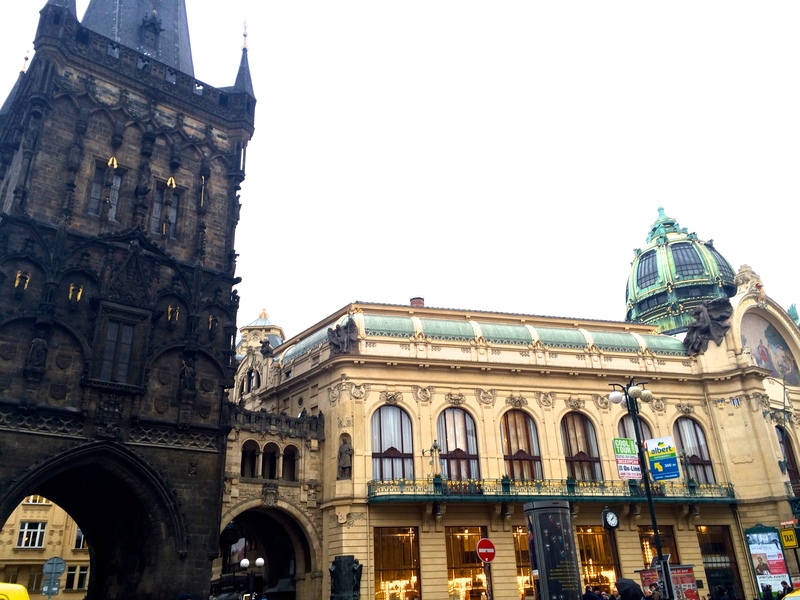 I had no idea what to expect from Prague except for stunning architecture. 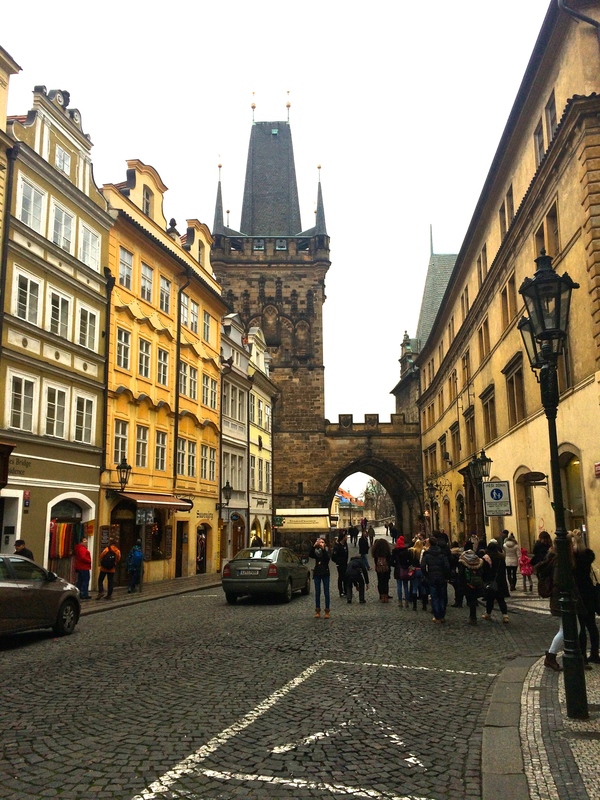 Prior to this trip, I knew essentially nothing about the history of Prague or the Czech Republic or anything about their culture. 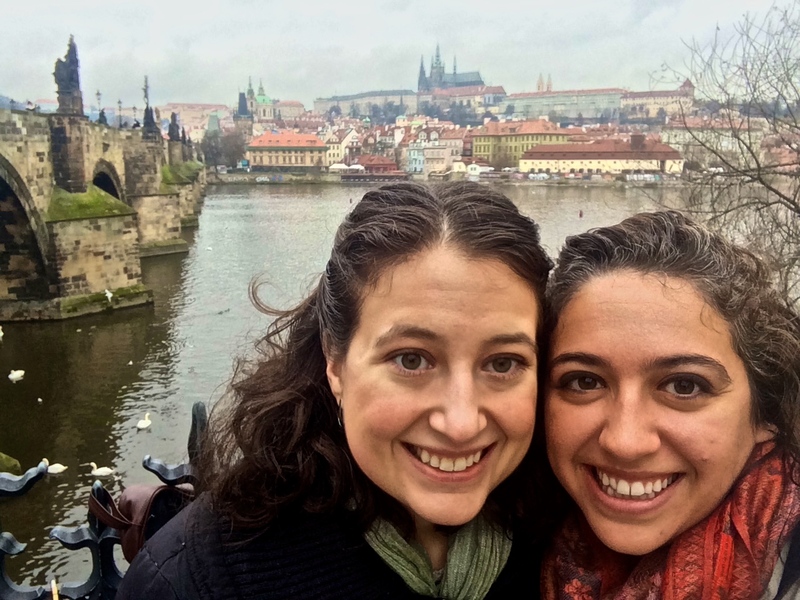 Michelle and I did some research before arriving to Prague, picking the sites we wanted to see, and we downloaded more of Rick Steve’s tour guides so that we could become better informed. We got off the train and made our way to another beautiful Hilton hotel! Again, we received the perks of the lovely executive lounge and were greeted with a bowl of fresh fruit, nuts, yogurt, and a pastry. 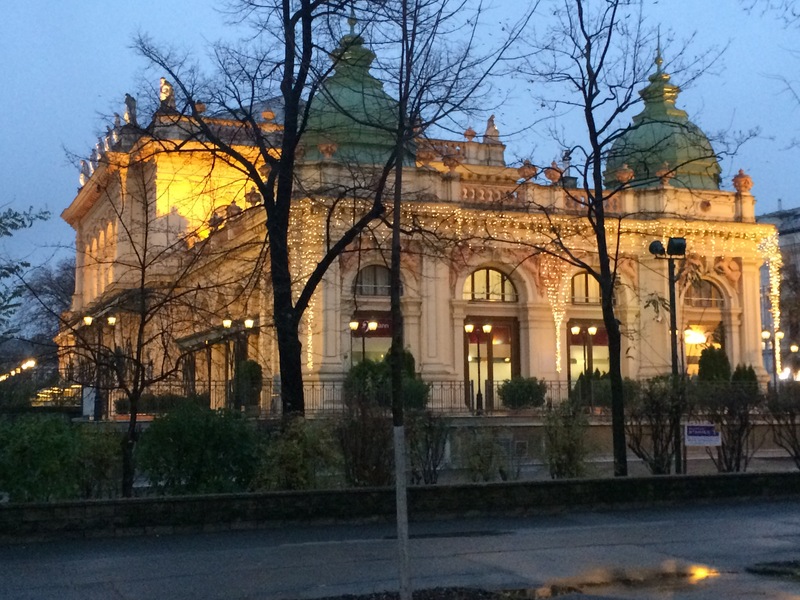 On our initial ride form the train station to the hotel, we were amazed by our brief glances at the architecture. 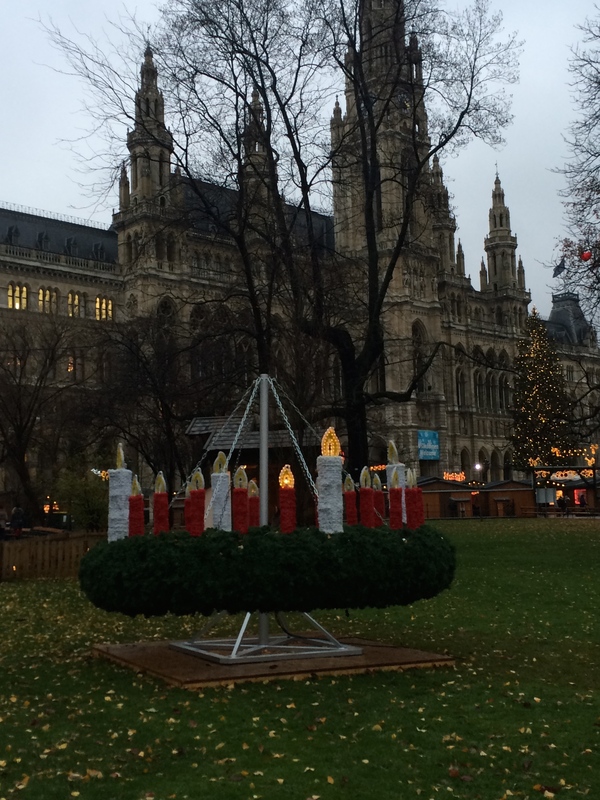 We quickly settled in and per our routine, asked the hotel to mark the Christmas markets on a map for us! 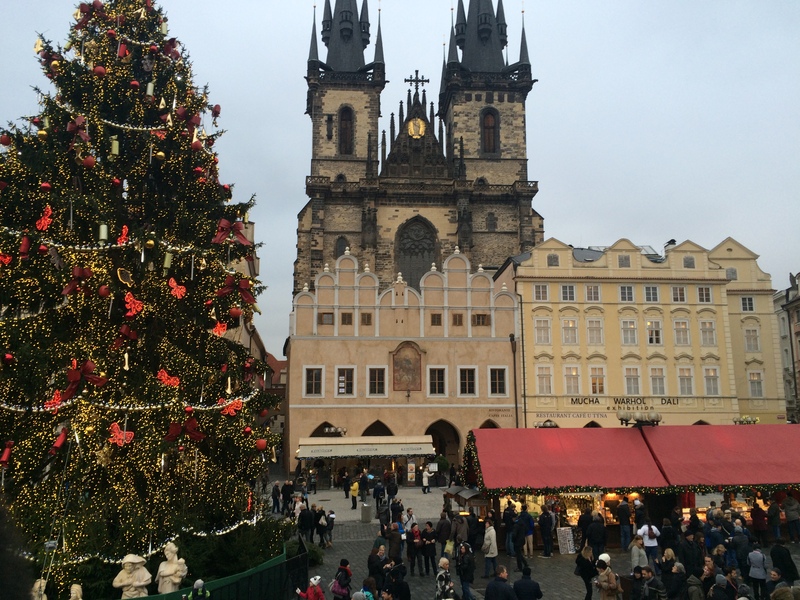 Prague also has Christmas markets and we were excited to see what they would be like in such a different city. 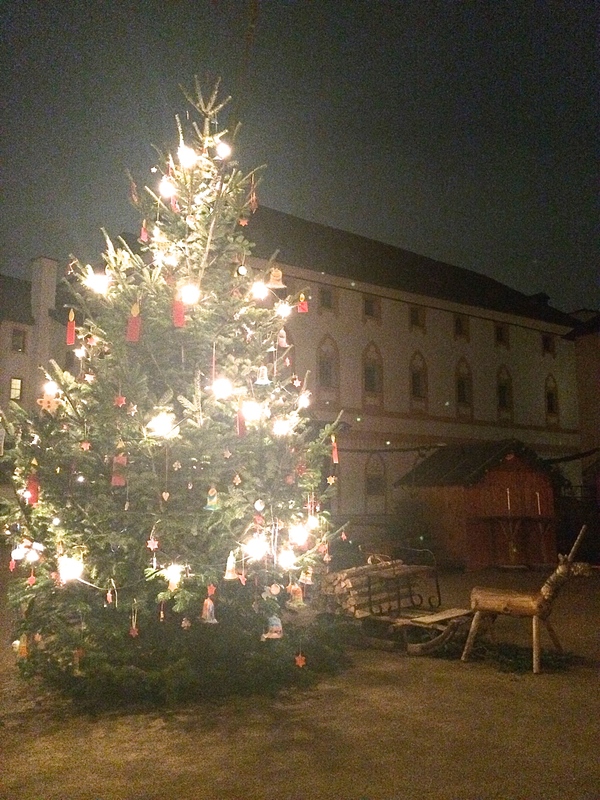 We had a wonderful first night exploring the Christmas markets. 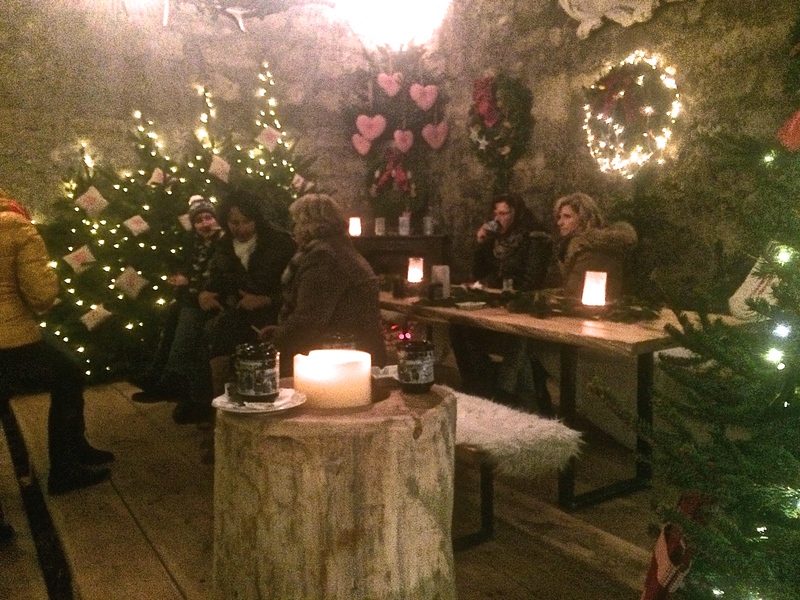 While beautifully decorated and the concept similar, we found these markets to have a different feel. 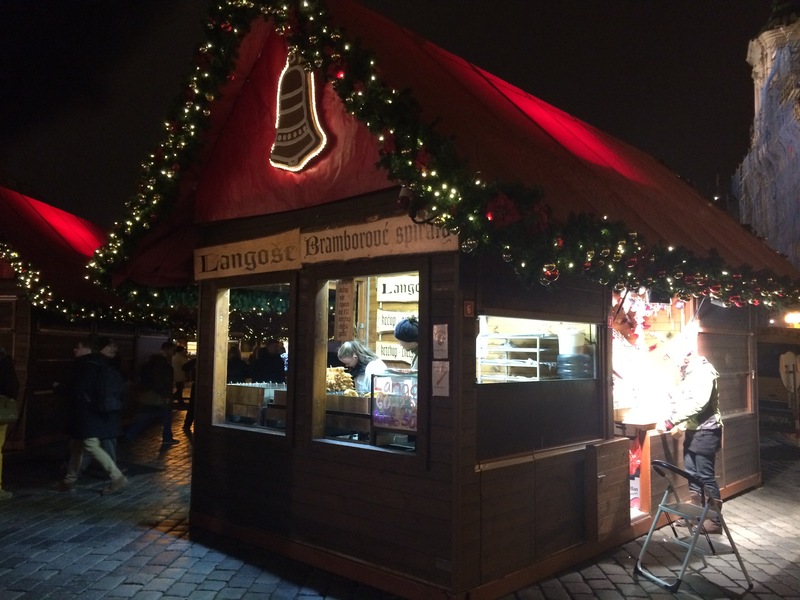 They lacked Austria’s distinctly cozy personality – the hot drinks were sold in paper cups instead of mugs and the goods for sale were not as unique and few were handmade, it felt a bit more touristy. However, they had their own personality! 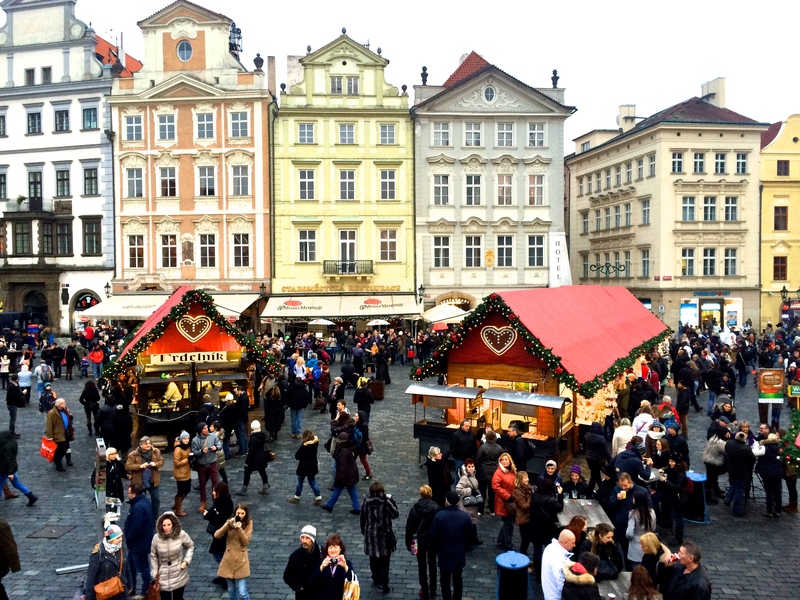 The main square of Prague was busy and lively! 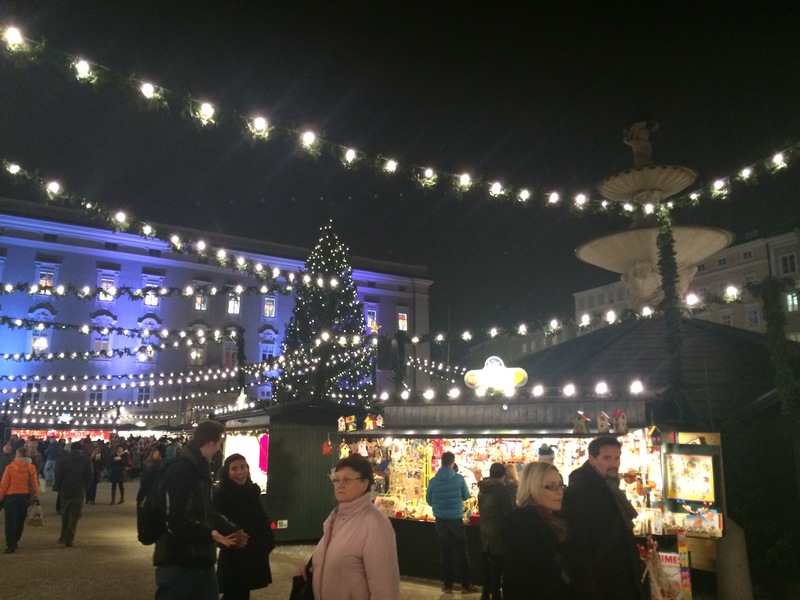 The stalls and the square were decked out in lights and festive décor. 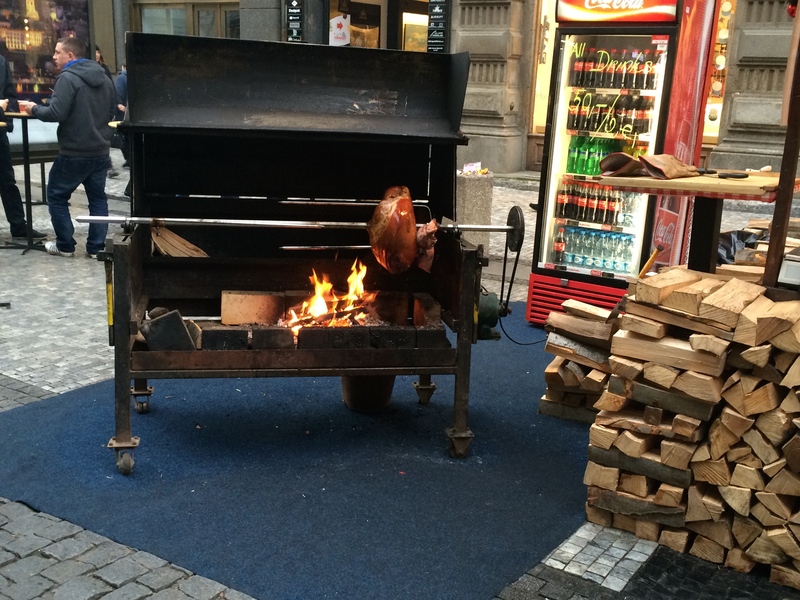 The smells of ham roasting on a rotisserie, sausages grilling in giant cast iron pans, and cinnamon sugar doughy cylinders of deliciousness cooking over an open fire flowed through the open air of the square. While the market sold all of the hot drinks we have grown to love, they had their own specialty: hot mead. Michelle was familiar with the drink, but this was my first time tasting fermented honey, and oh was it delicious!! 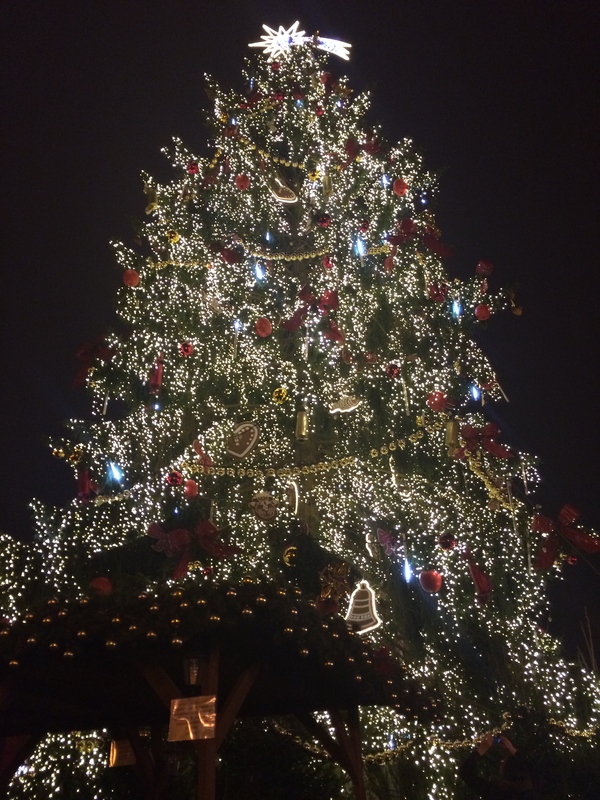 I think this was my favorite Christmas tree yet!! 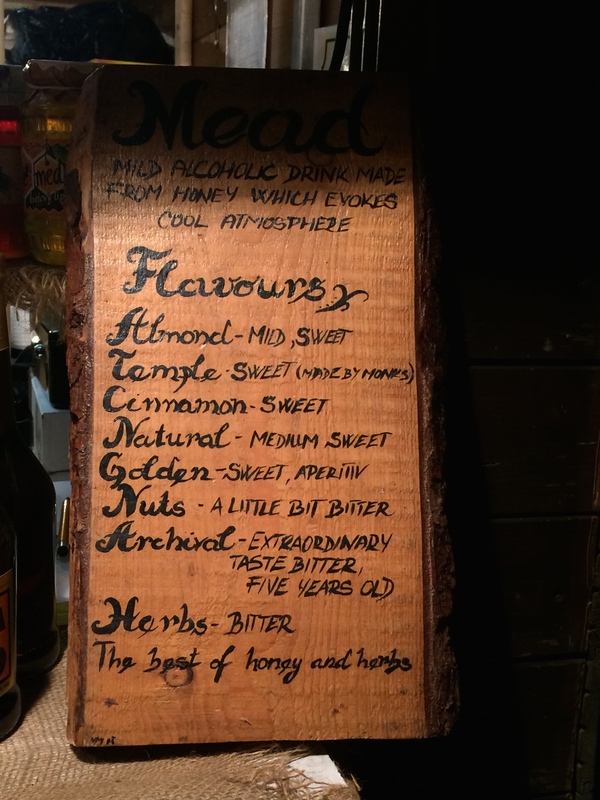 The flavors of mead, my favorite was almond! That would be the doughy cylinder of deliciousness rolled in cinnamon and sugar! The ham roasting!! We had a huge hunk for dinner the first night! 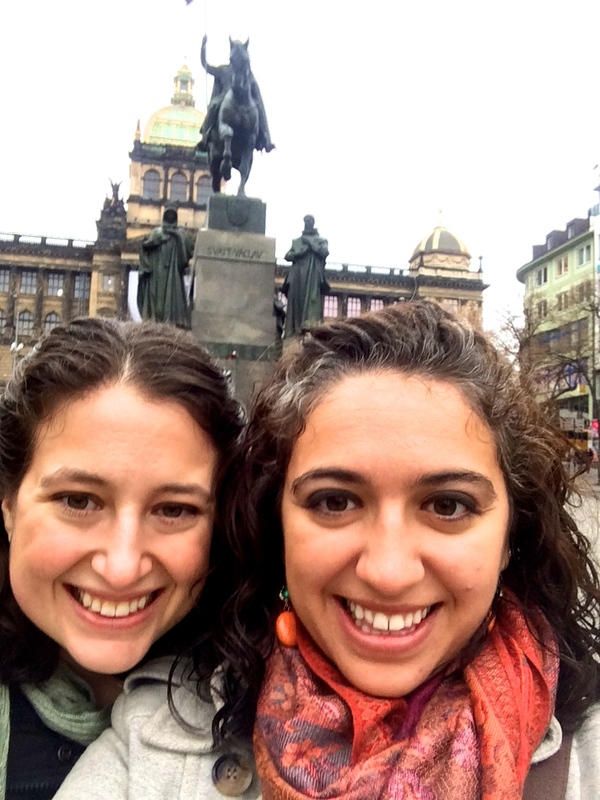 We had a lovely night becoming acquainted with Prague and woke up early on Friday ready to take the city by storm! 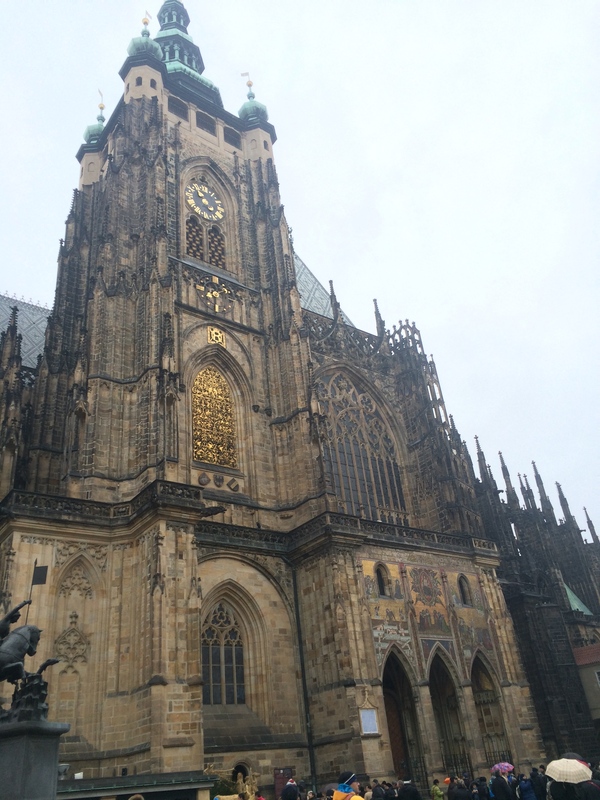 We started by walking up to Prague Castle to begin our day of touring with this prominent spot. After walking up a couple hundred steps we were bummed to find out that the historical cathedral in the castle complex was closed for the day. 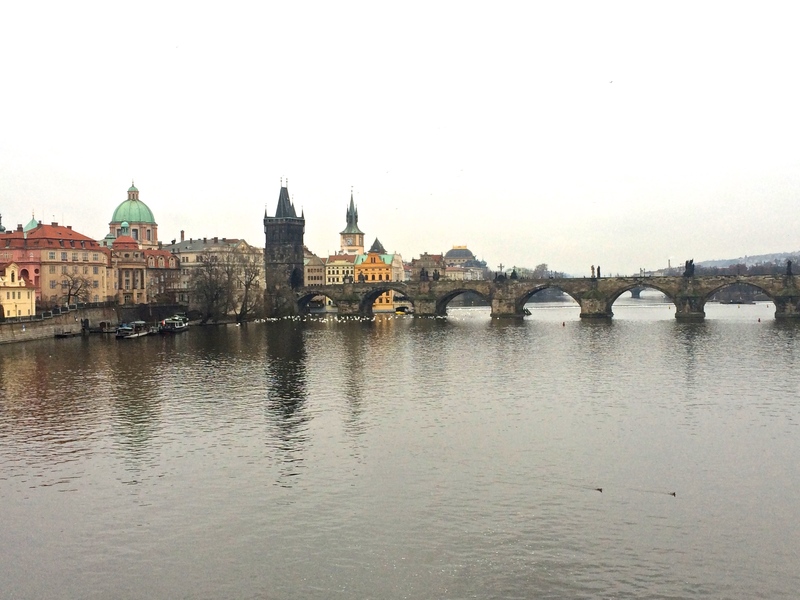 We decided to save our tour of the castle for the next morning, snapped some photos of the incredible view, and headed back down to the remarkable Charles Bridge to start the Rick Steves walking tour of Prague. 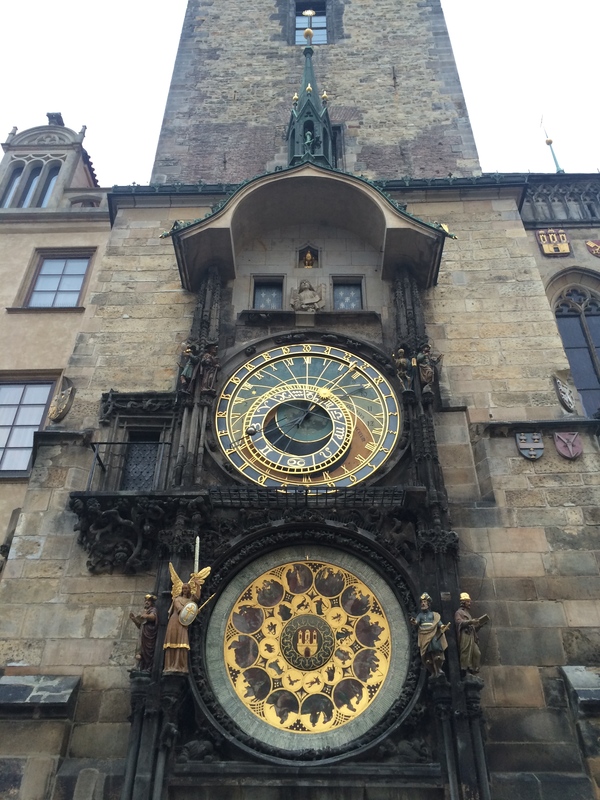 We learned so much about the rich and fascinating history of Prague and the Czech Republic. This country has encountered many twists and turns over the centuries, constantly fighting to assert itself as an independent country. Through it all, the country has regained its independence and is making great strides. 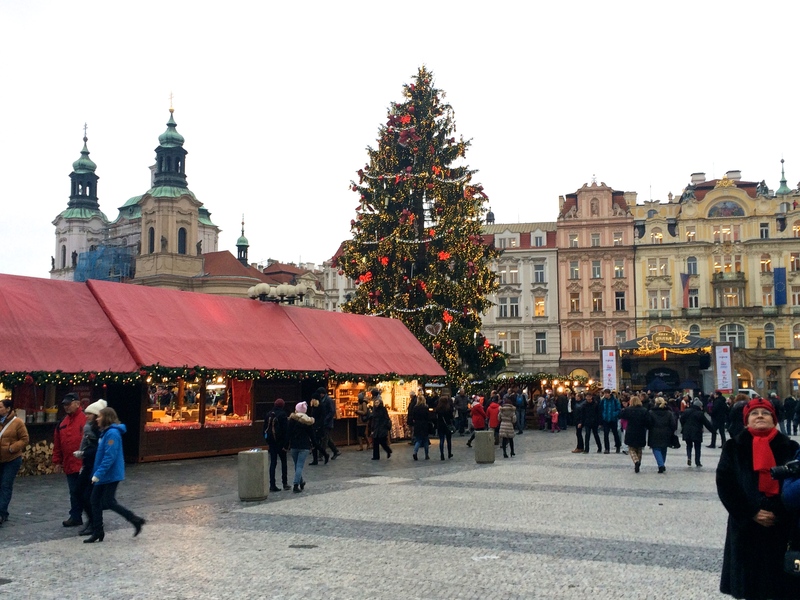 Prague is prospering; the energy is clearly that of a country on an upswing and the rest of the world has caught on to the incredible splendor that Prague has to offer. The city has definitely become a significant tourist destination and we could identify the obvious tourist traps: lots of street carts selling the same collections of knick knacks, many souvenir shops some of which selling things that are not even native to Czech like Russian dolls, and so many people everywhere gawking at the amazing sites. 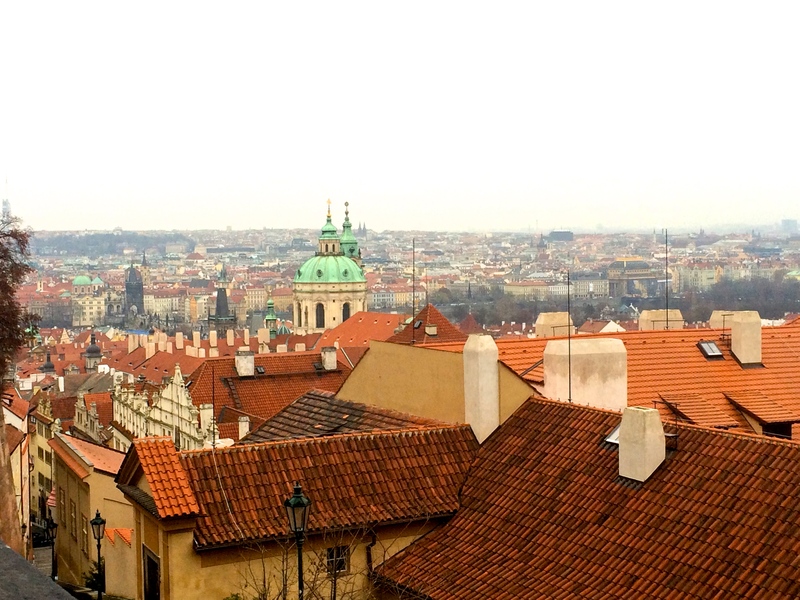 While the touristy feel can be a nuisance for those seeking a local experience, I understood immediately why people want to come visit, Prague it is one of the most architecturally beautiful cities I have ever been too. 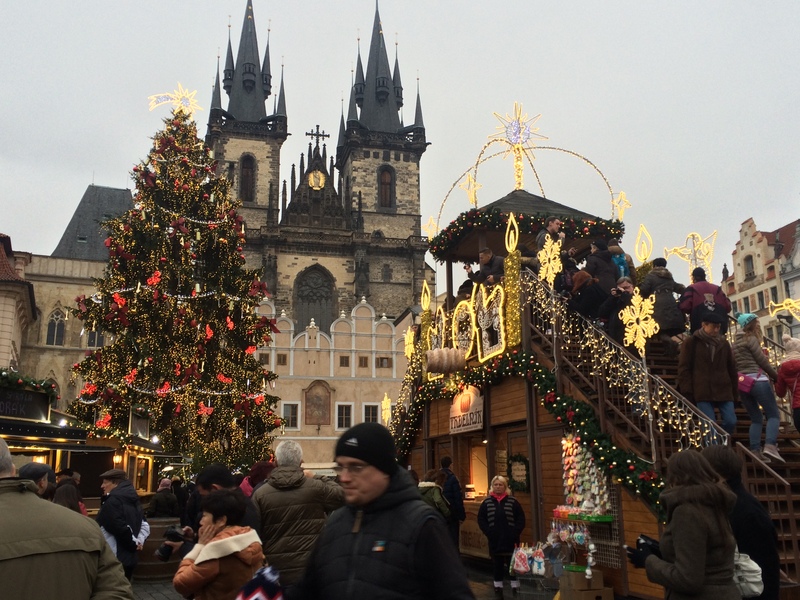 One of the reasons Prague stands out as such a disctincly stunning city is that, unlike many other European cities, it was spared the bombings of the World Wars. While the city underwent siege by both the Germans and the Soviets and existed as a dark and depressing city for many years, the structure of the city was preserved and stands a glowing portrayal of its rich history. I fell in love with the spectacular structures and intricate facades of the medieval, baroque, renessaince, and art nouveau architechture. 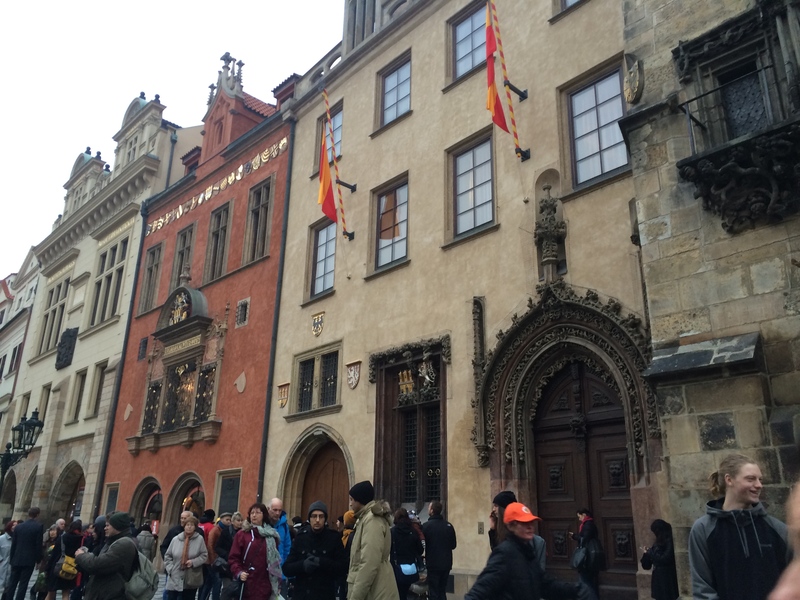 Yes, Prague has maintained architecture through all of these periods and as result, my eyes were constantly catching beautiful sight after beautiful sight lining the streets of the city. Remarkably, but not unintentionally, the different styles of architecture blend beautifully with one another. We learned that with each new building, in each new era, the architects prioritized blending their unique creations with the preexisting structures. 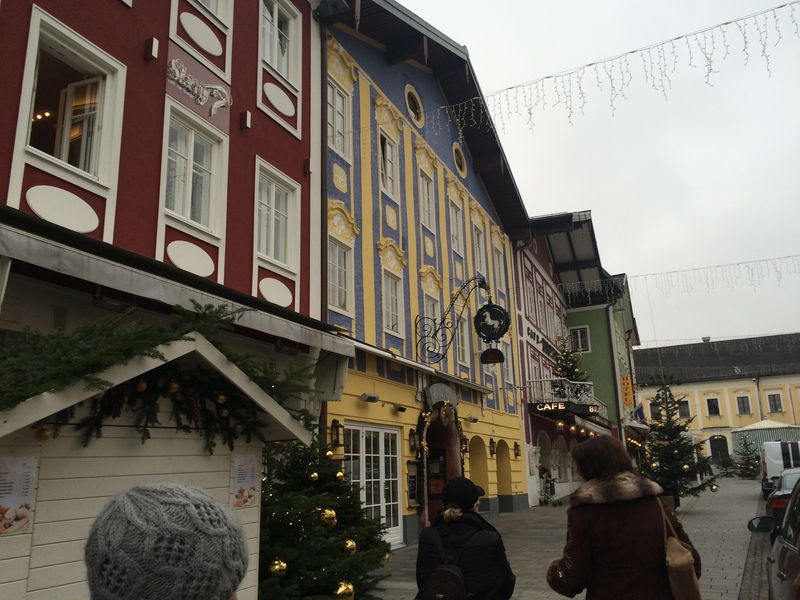 I found the colors of these buildings richer and deeper when compared to the more pastel tones of Austria. 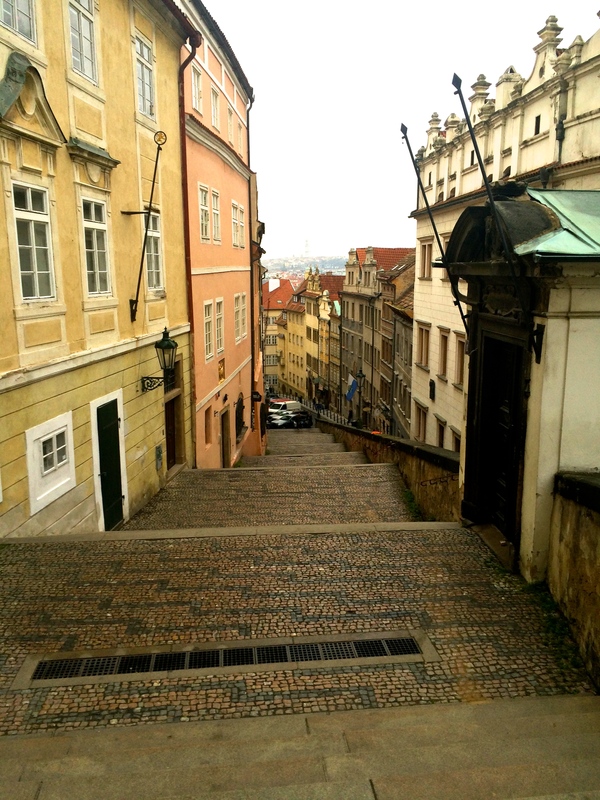 In fact, despite the shared boarders, I found next to no Austrian or German influence in Prague, the city had more of an eastern European flair. 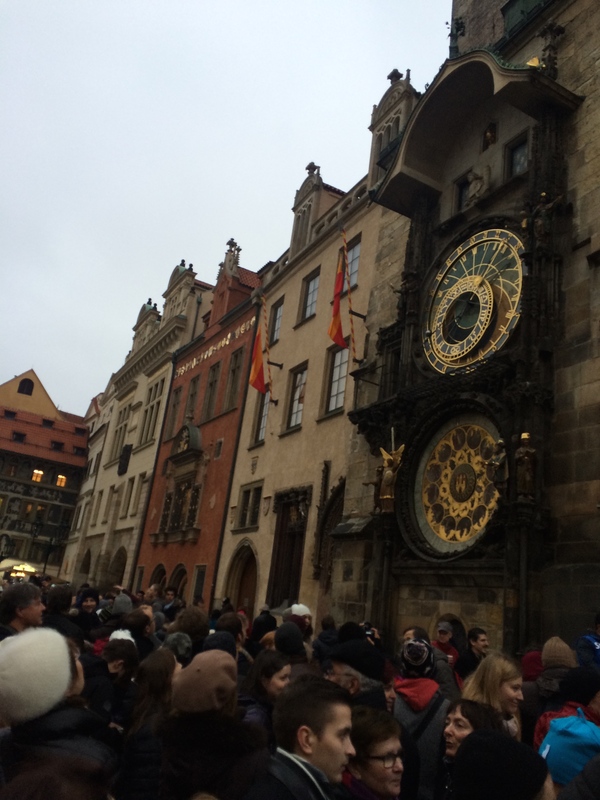 The famous clock in the town square – note the huge crowd waiting to see the show as it strikes the next hour! 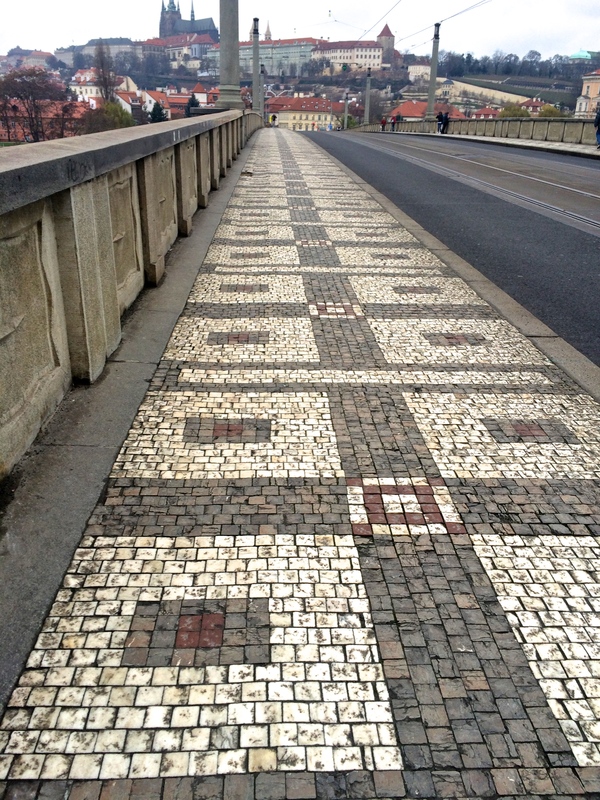 Even the sidewalks were all beautifully tiled like this! 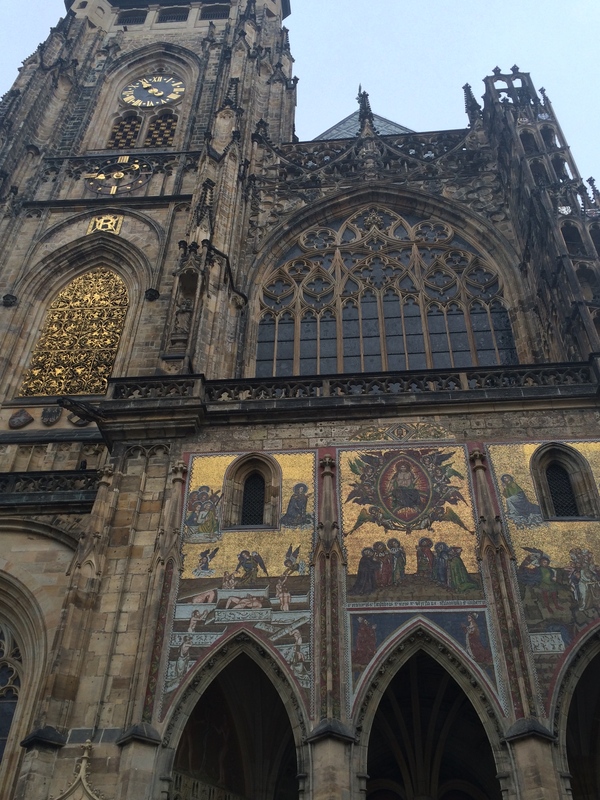 There is a rich religious history in Prague as well. 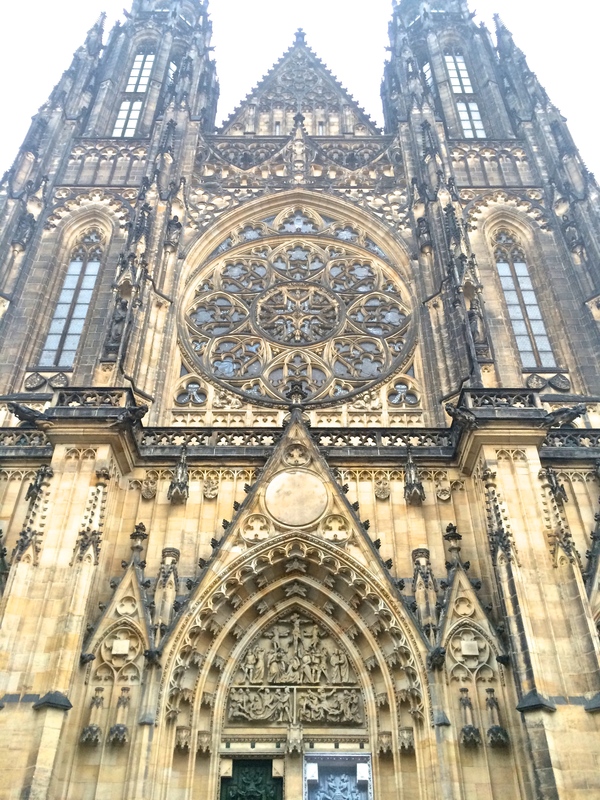 The city was full of statues of religious figures, gleaming church spires, and the most impressive St. Vitus Cathedral. 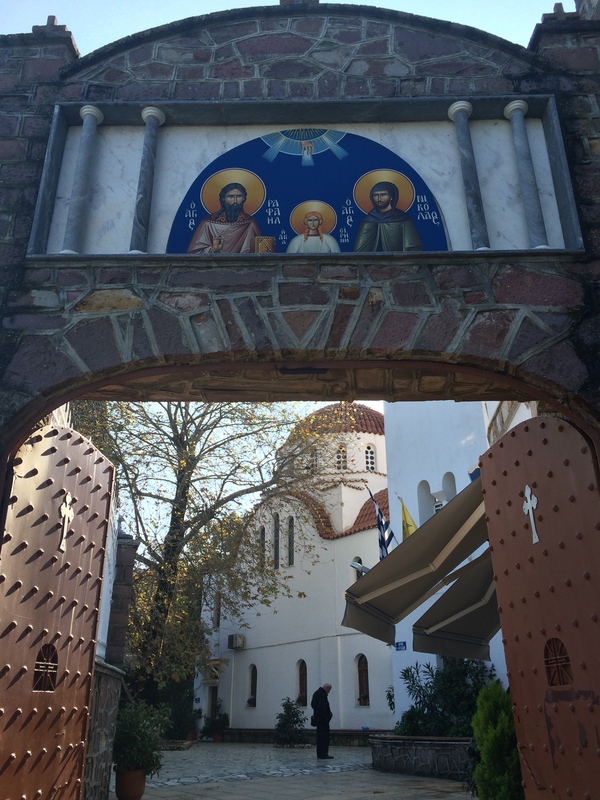 It is a predominately Catholic city but we were very excited to learn that the city also has deep Orthodox roots! 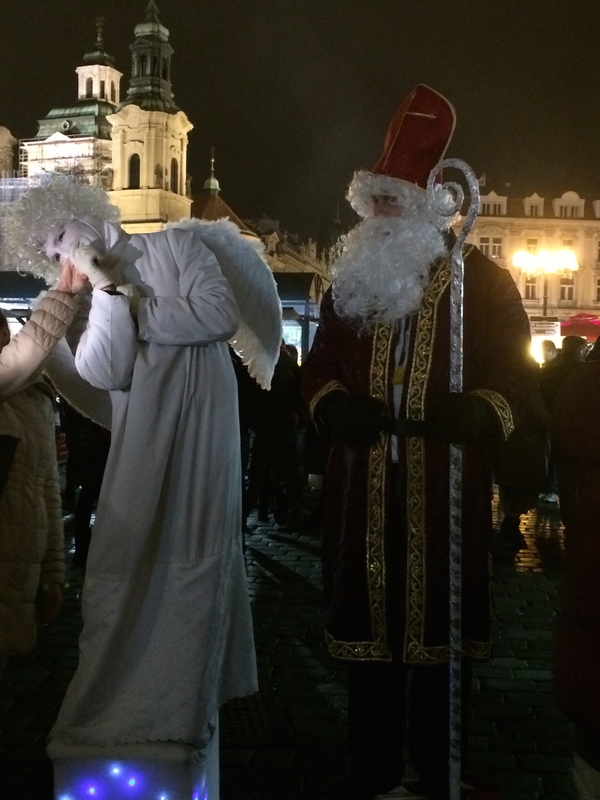 Many of you have most likely heard the Christmas carol, “Good Saint Wenceslaus” but did you know that he was a Czech native, a great king and patron saint of Prague? I did not either until I started learning about this city. 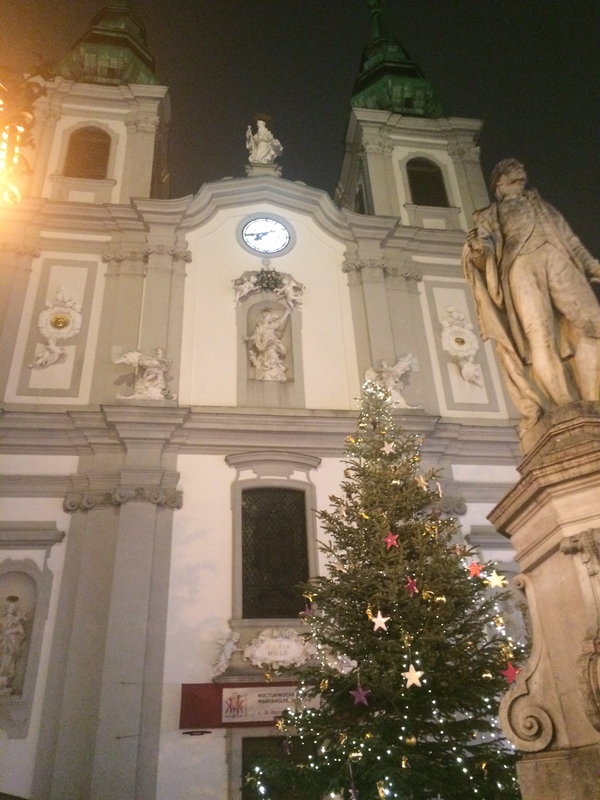 He is very beloved by this city commemorated through the popular St. Wenceslaus square and statue and his body is buried in St. Vitus Cathedral. Through researching more about St. Wenceslaus, I learned that he is also considered a saint in the Orthodox Church along with his beloved grandmother St. Lyudmila. 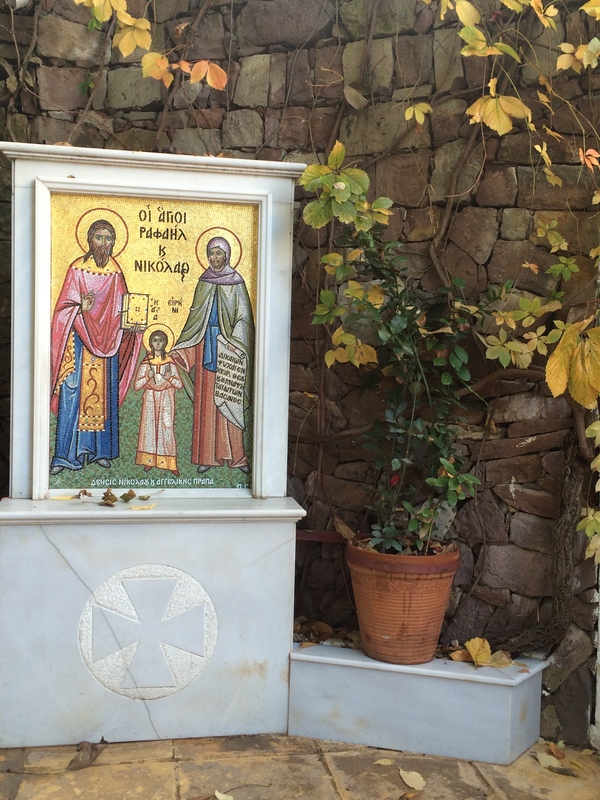 We were amazed to find out that St. Lyudmila was baptized by saints Cyril and Methodius. Saints Cyril and Methodios are big saints in the Orthodox Church most well known for spreading Christianity to the Slavic nations and coming up with the first written Slavic alphabet. They serve as models for effective missionary work as they went in to the Slavic nations and instead of imposing their own language and cultural ideals on the people, they came up with an alphabet that fit their native language! Now I have learned their story extensively over my years in seminary, but I had never connected the dots as to where exactly this all took place. 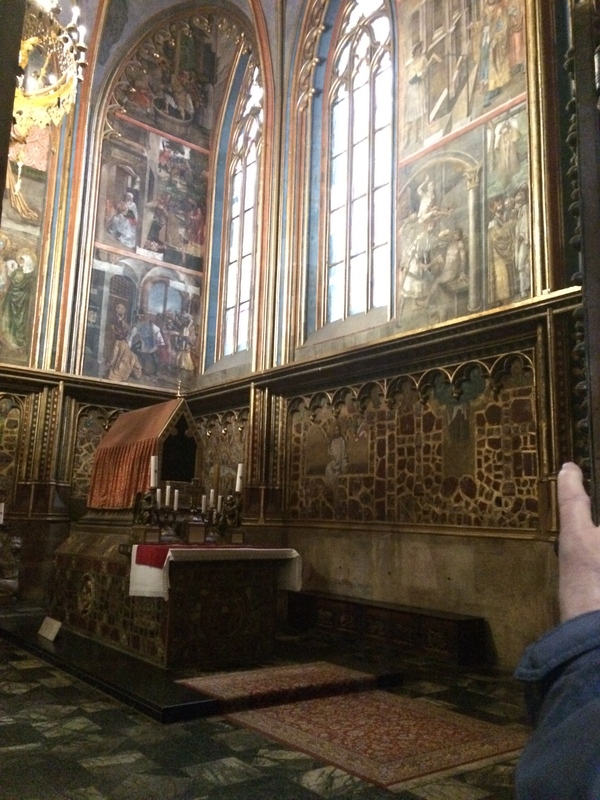 Well, much of their work took place in Prague, with the family of St. Wenceslaus. 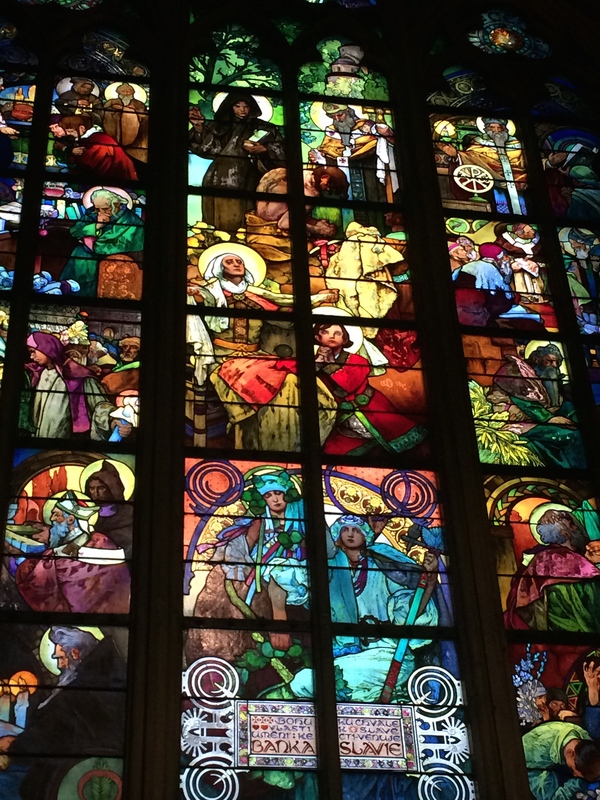 They are beloved in Prague also and we found incredible stained glass windows and woodcarvings depicting them in St. Vitus Cathedral. 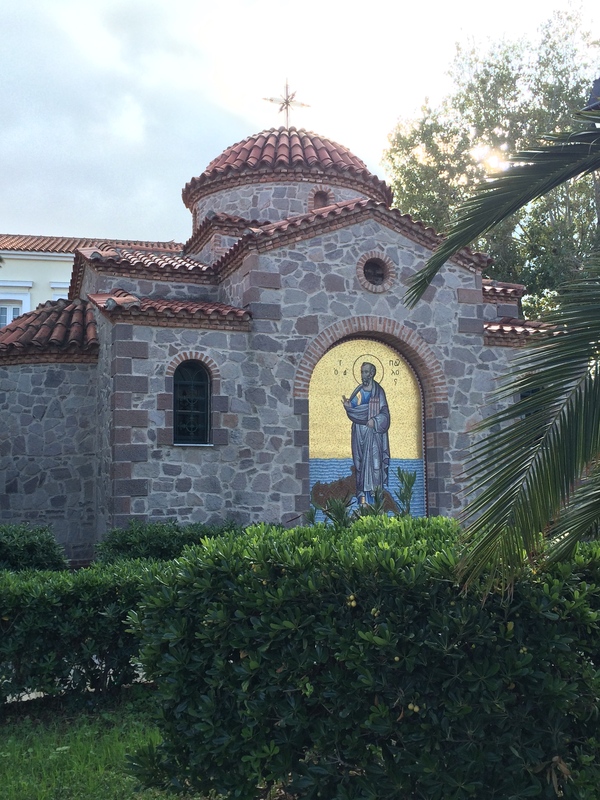 Saints Cyril and Methodios were originally from Thessaloniki and their relics are kept in a church here. 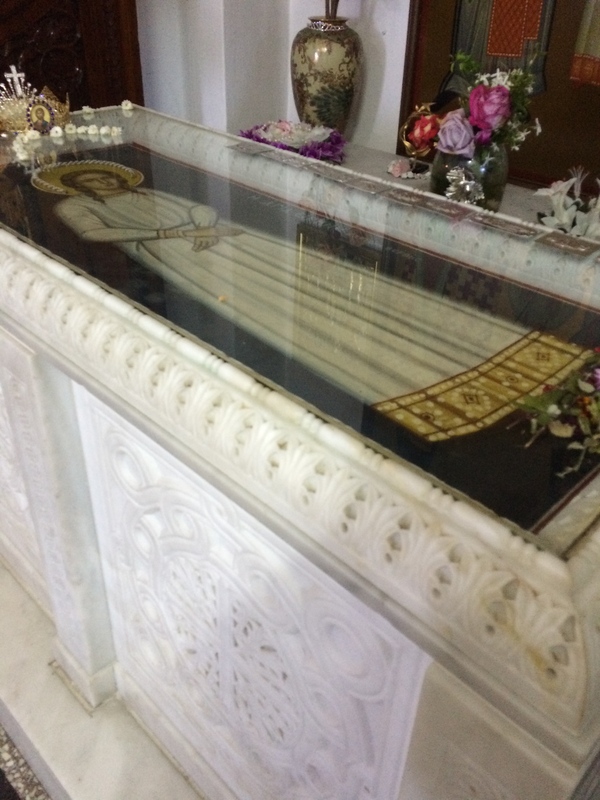 The relics are taken out for people to venerate on Sundays during liturgy. We have been wanting to go to this church on a Sunday for the past few months but have not been able too. Just by chance, we went with Michelle the Sunday before we left on this trip. 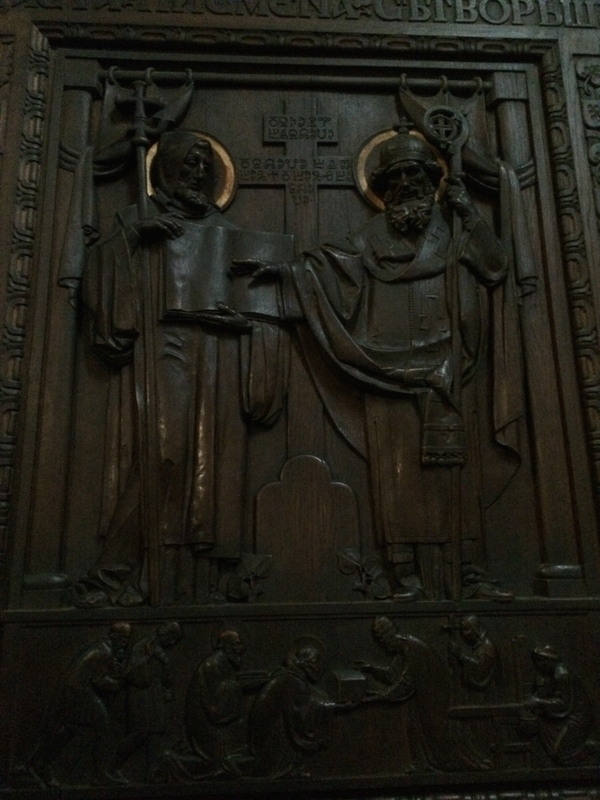 At that point, I did not know the significance of these saints in Prague. 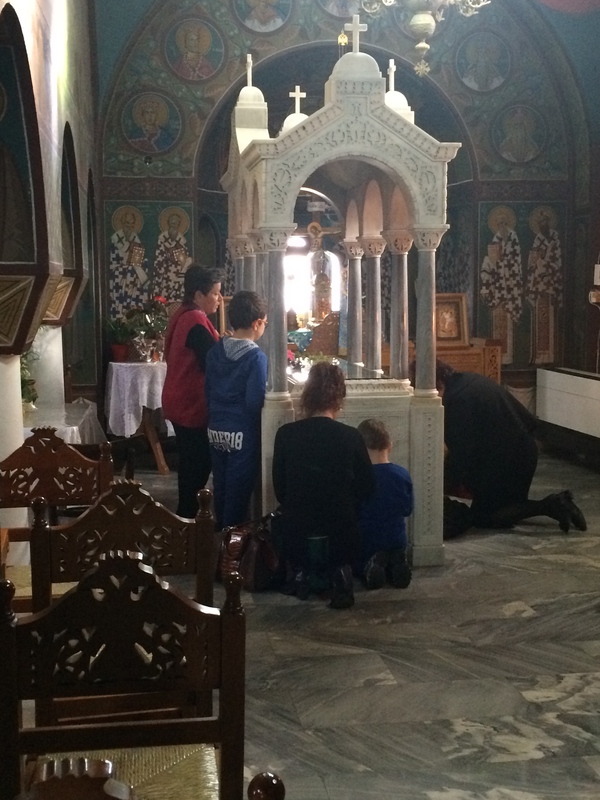 We started our journey venerating their relics and ended it in the city where they did their mission work. What and amazing way to bring our trip full circle! And the wood carvings on the door! 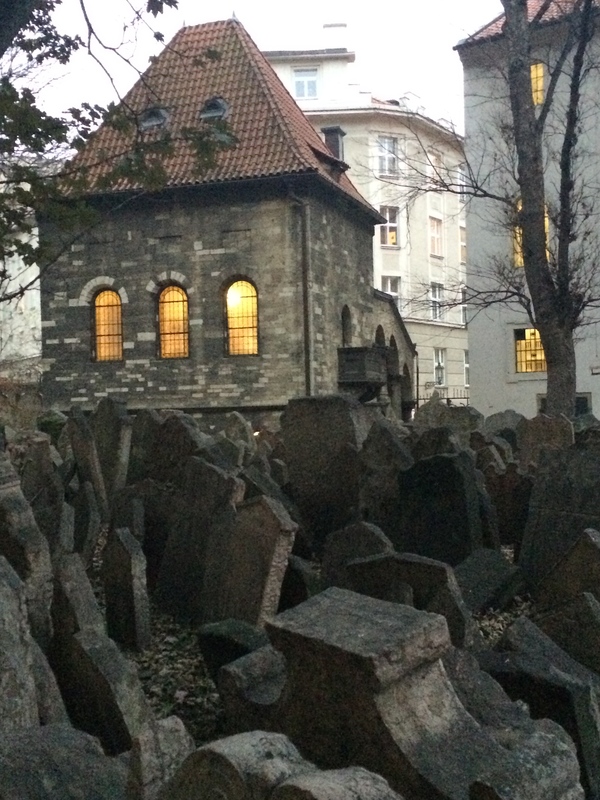 The final piece of history incredibly moving to us was the Jewish roots in Prague. 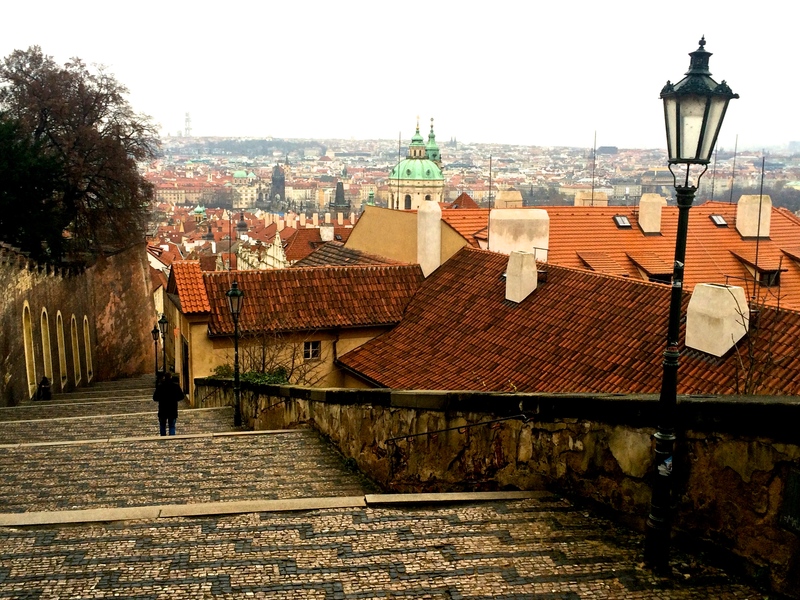 When the Nazis invaded Prague, they took the significant population of Jews captive. In a nearby town Hitler started a “model” camp that was intended to prove to the rest of Europe that he wasn’t crossing too many lines with regards to his treatment towards the Jews. This of course was not remotely a five star hotel but a camp where while they were fed and the children were allowed to attend school, all other freedoms were stripped away. At the same time Hitler started building a museum in Prague. His plan for this museum was to display the race that he planned to completely wipe out; it was intended to be a Jewish museum after the Jewish race no longer existed. We were stunned and got chills as we listened to the commentary on this museum. 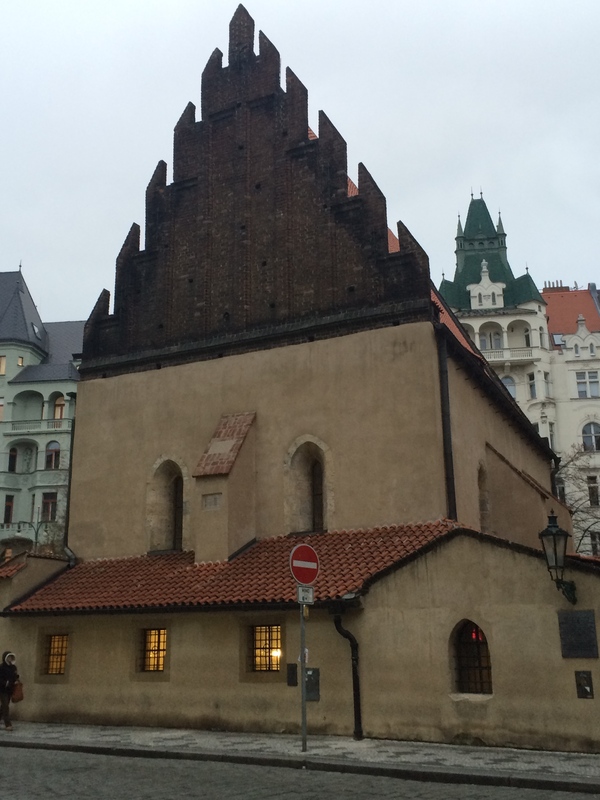 This museum now stands to share the long rich history of the Jews in Prague, a population of about 80,000 who were eventually killed, but a population that Hitler did not successfully wipe out, thanks to the good forces of this world. 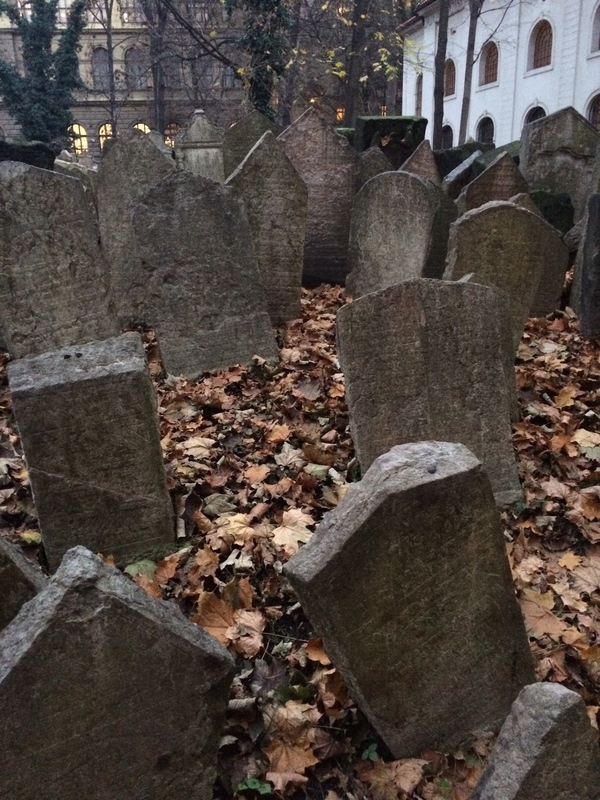 Today, there is a Jewish quarter situated in Prague that contains several Synagogues that have been converted into museums and a Jewish cemetery all telling the devastating story of the years of the Holocaust in Prague. We were deeply moved during this tour. The most striking part for me was the memorial synagogue where the names of all 80,000 Jews killed are hand painted on the walls as a way to commemorate their death. It is an incredibly moving sight to see. Another remarkable display was hundreds of pictures painted by the young Jewish children of the camp outside of Prague. In their school there was a remarkable teacher who implemented a type of art therapy for the children to maintain their spirits. The result now is an amazing display where we could share in the emotions of the children of the Holocaust. The whole experience was so moving, my heart was full of sorrow and thankful for the courageous forces that brought this terrible era to an end. 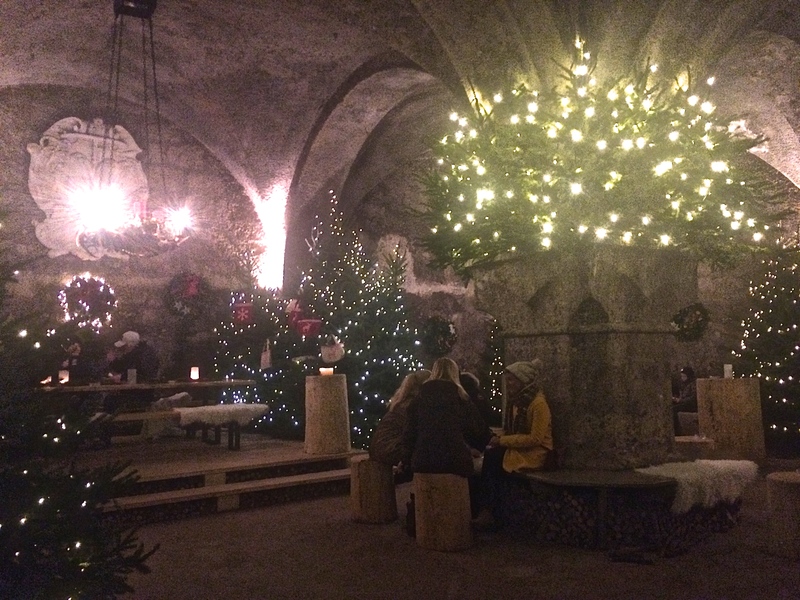 After a full day of touring, we went back to the hotel, had a complimentary happy hour cocktail, and made our way back out for another evening of Christmas markets. 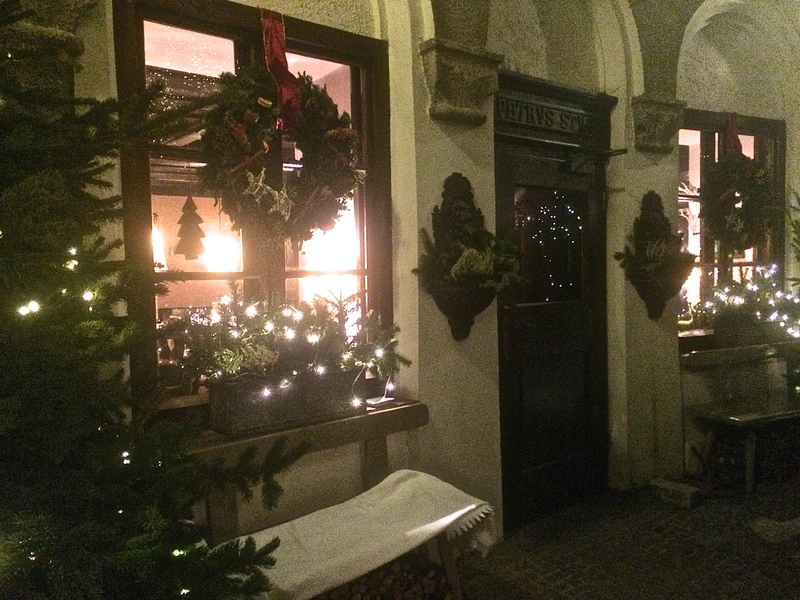 It was December 5th, the eve of St. Nicholas day and we had heard that there would be some St. Nicholas festivities near the square that evening. 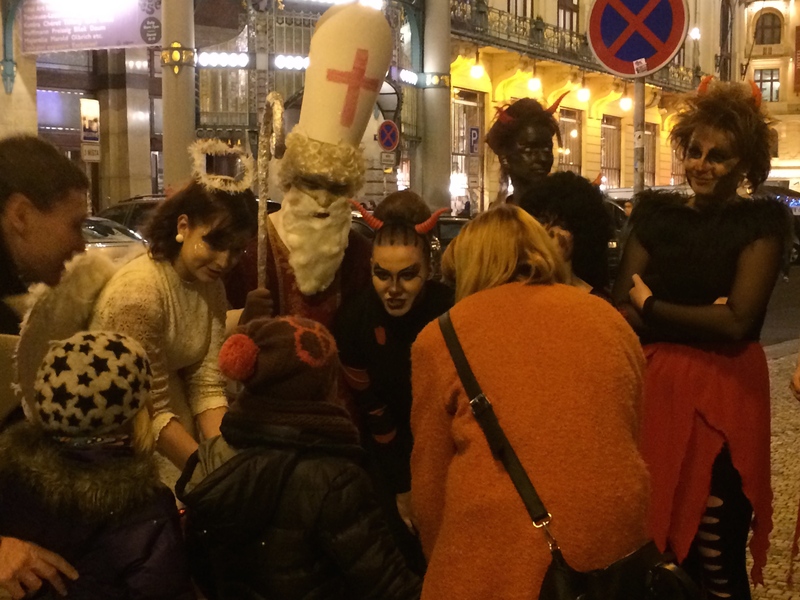 As we made our way back towards the square we were excited to encounter several clusters of dressed up characters. 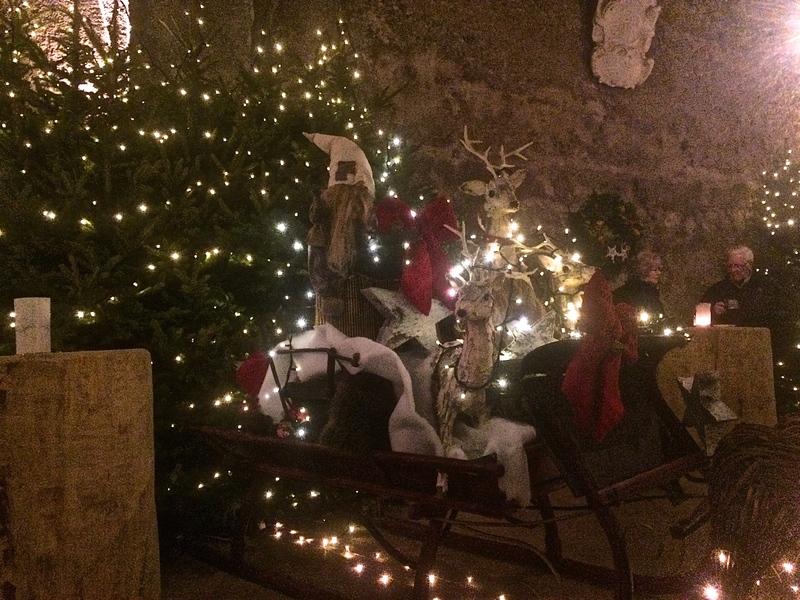 In each cluster there was one St. Nicholas dressed not like Santa but like the Western European depictions of him in a Bishop’s outfit and staff. There was also an angel and a devil in every cluster. 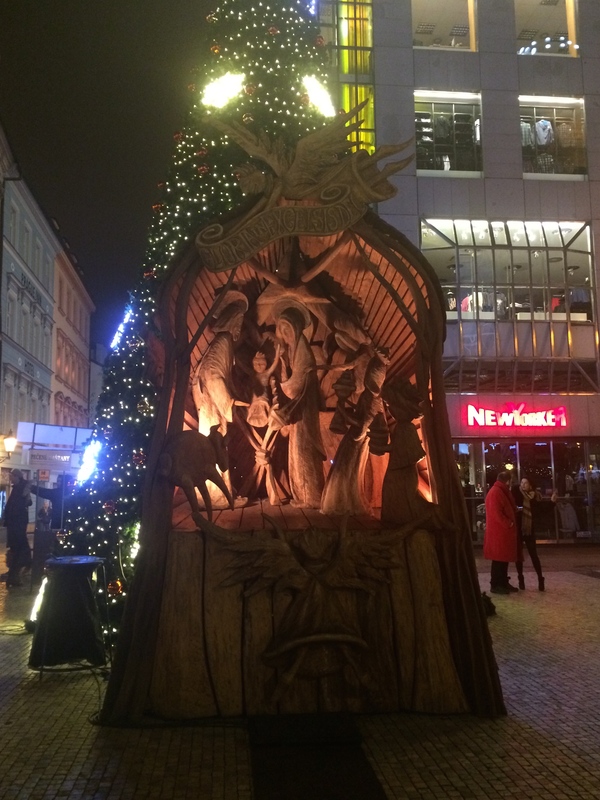 Again, we saw the terrifying character of Krampus showing up in Prague! We asked a local to share a little more about this tradition and we came to find out that the trio walks up to young children on the streets and asks if they were good or bad. 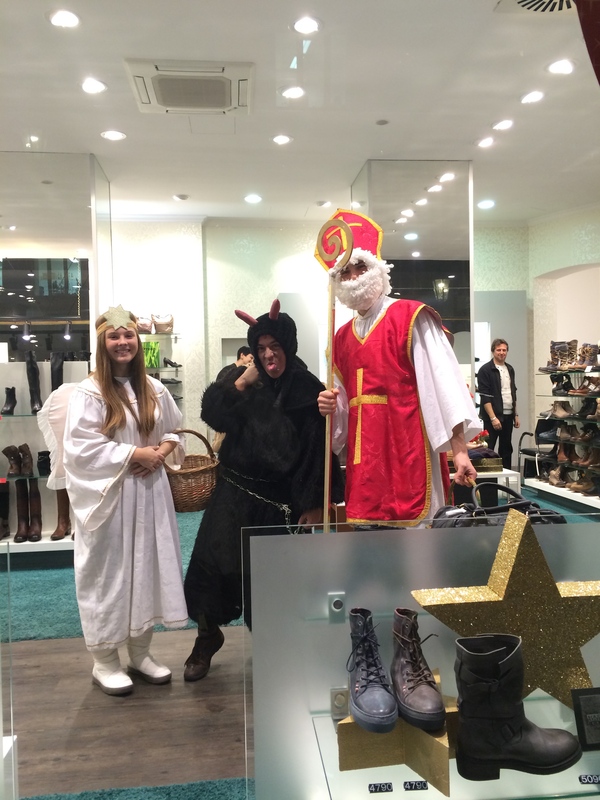 If they were good, they sing a song to St. Nicholas and he gives them a treat! I suppose if any admitted to being bad, the devil character would give them coal but I doubt in the face of chocolate that any child admits to being bad! It was quite a sight to see this happening all over the city! There was also a big outdoor children’s show on a stage in the main square which concluded with the children receiving gifts. The most impressive spectacle however was the show that happened well after the children’s show. We noticed a crowd gathering near the famous clock and so we pushed our way through the crowd following the sounds of the loud drums. 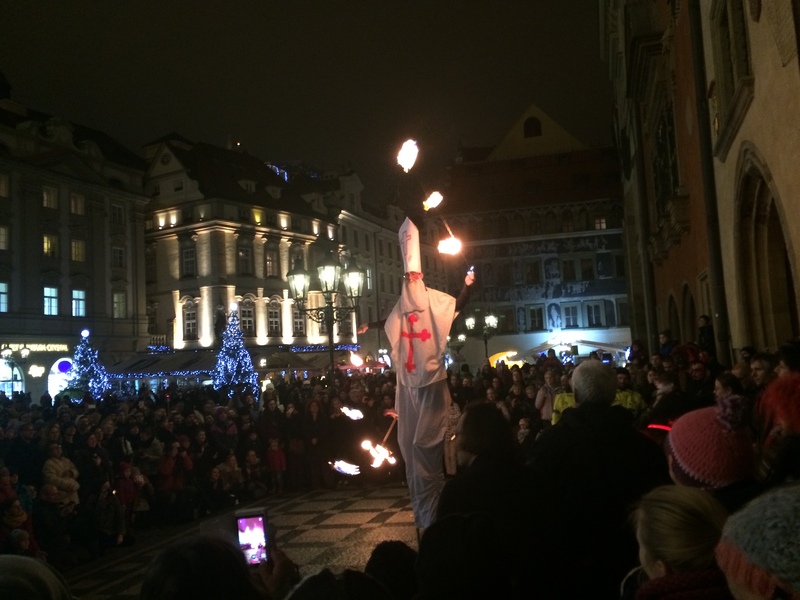 We were surprised to find St. Nicholas on stilts surrounded by several devils and angels in the midst of an intricate and intense fire performance!!! What a sight to see! 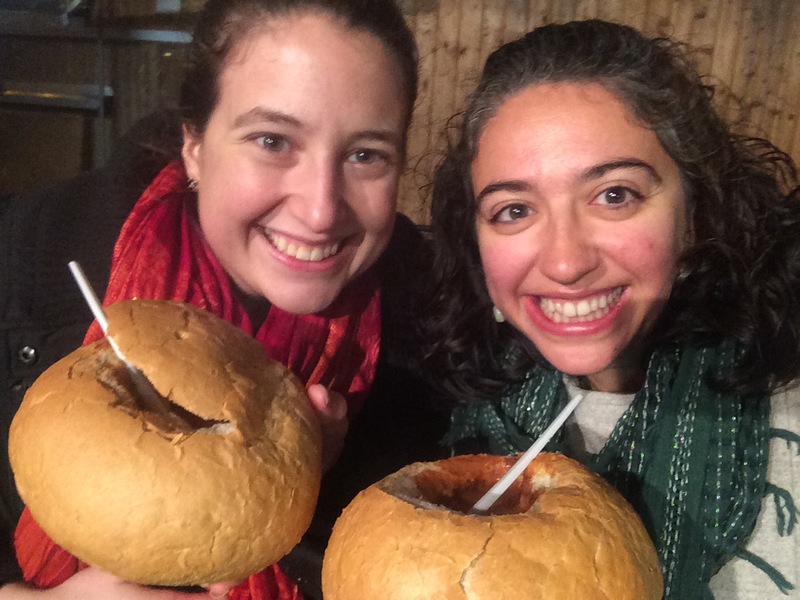 It was a fun night of exploring and experiencing local customs! This cluster was in a shoe store and happily posed for my picture! 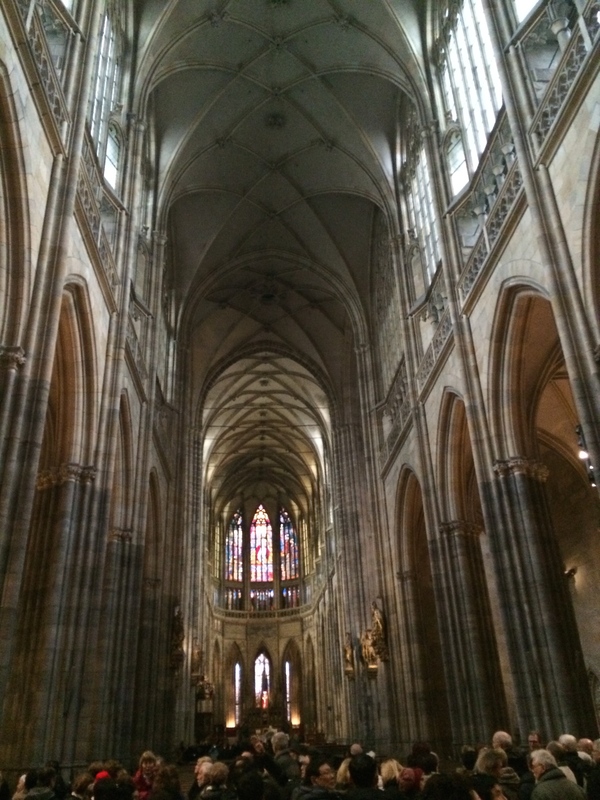 The next morning we toured the extensive Prague Castle complex including St. Vitus Cathedral. 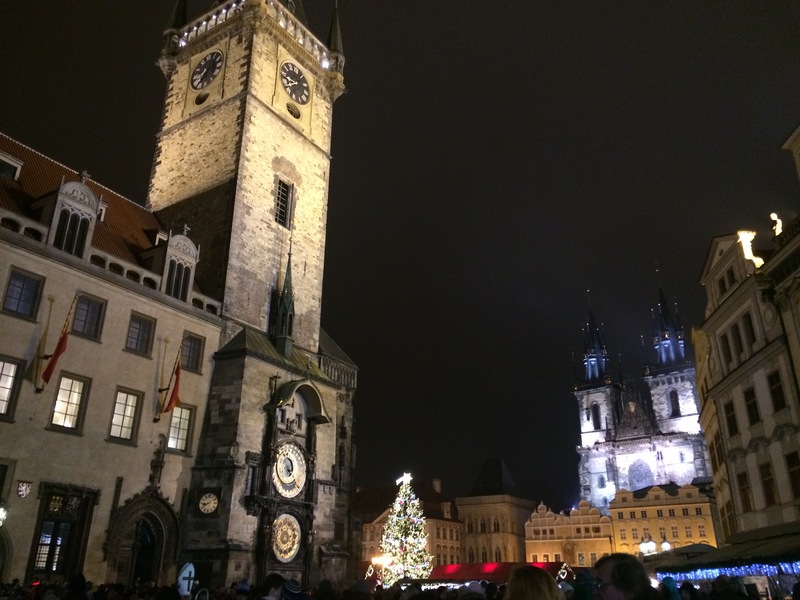 It was an outstanding way to end our visit in Prague. The complex is extremely impressive and the Cathedral was just stunning and packed full of interesting both religious and political history. 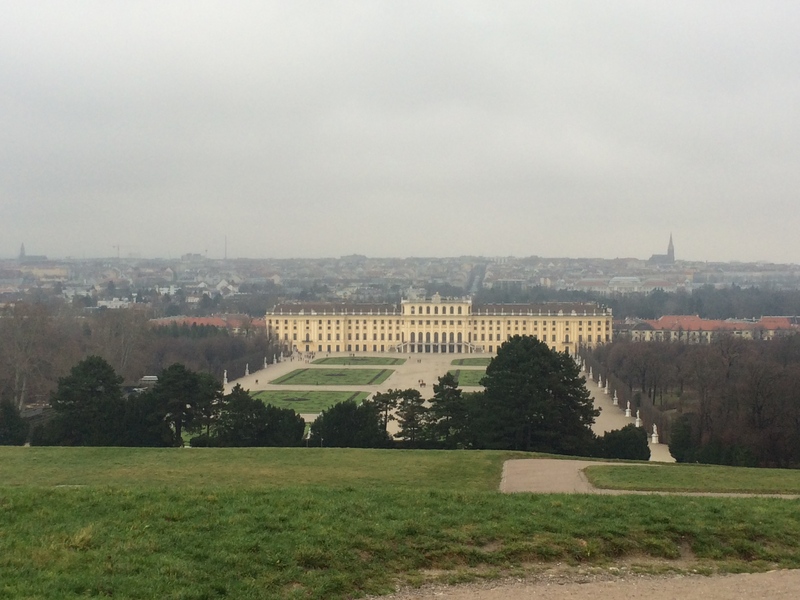 We said a sad goodbye to this gem of a city and made our way to Vienna for the final night of our trip. We stayed with Michelle’s friends Lauren and Tice who are from the states but living in Vienna for a couple years for work. 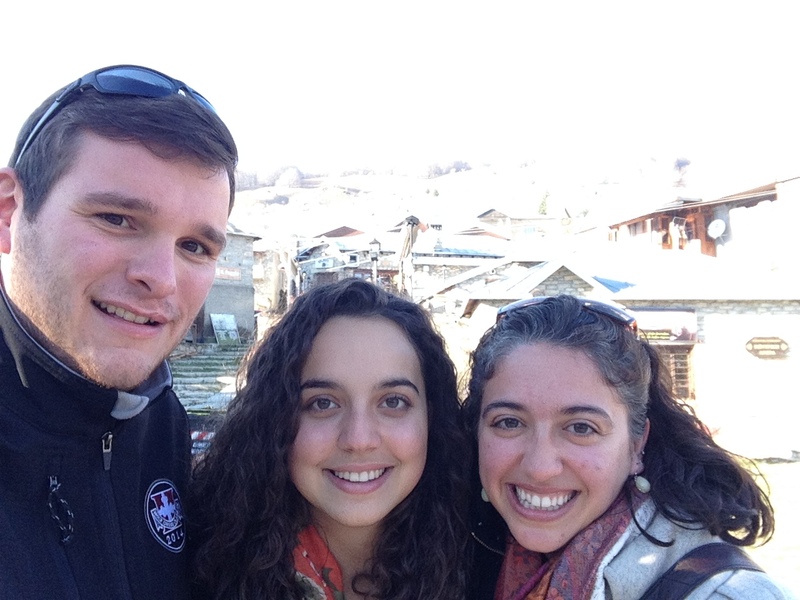 It was fun to hear how they are adjusting to living in a foreign city and they offered us incredible hospitality! 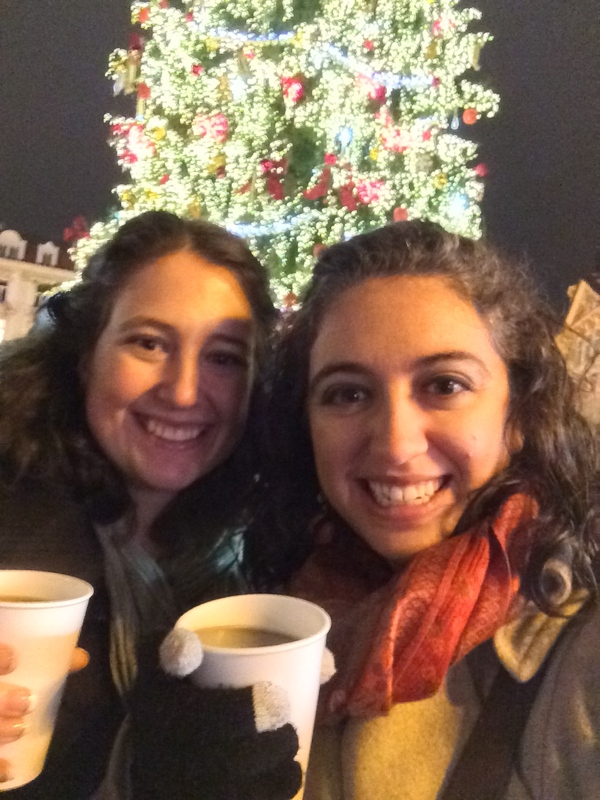 We got to peruse our beloved Vienna Christmas Markets one more time before making our way back to our respective homes, Michelle to D.C. and me, back to Thess! What a trip! I can hardly believe all that we saw and did and I am so grateful for beautiful adventures, wonderful conversation, quality time with a dear friend whom I don’t get to see enough in the states, a visit to long anticipated destinations, new lessons in history, and a widening of my global perspective. I am reminded of the beauty of travel in that it allows us to have a better understanding of this small and yet very very big world we live in. 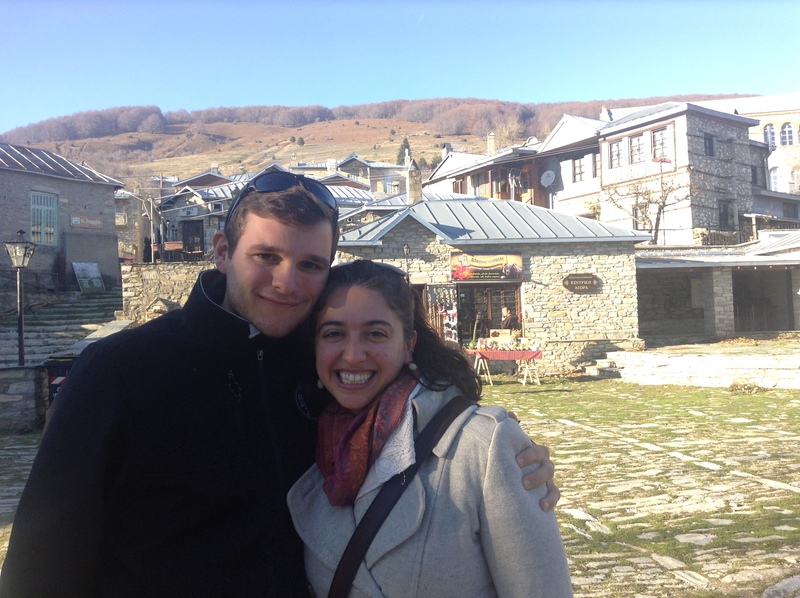 It was really wonderful to be able to branch outside of Greece and travel some of western Europe from the perspective of my time living in Greece. I am so beyond grateful for all of these amazing opportunities I have had over the past three months and especially right now for this truly perfect trip. Now, home to my incredible husband whom I have missed SO much!!!!!! 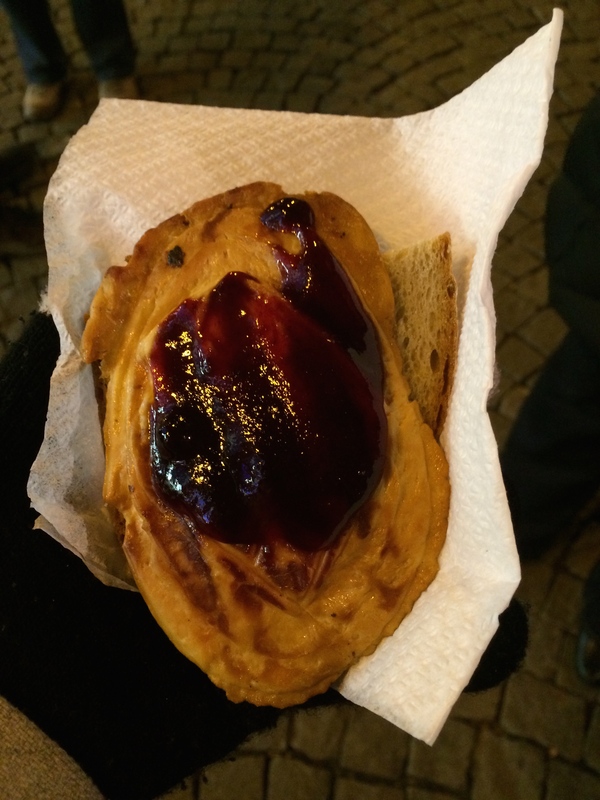 Their version of “grill cheese” – melty cheese open faced on bread with delicious marmalade on top – fantastic! Gnocchi cheesy goodness with ham and cabbage! 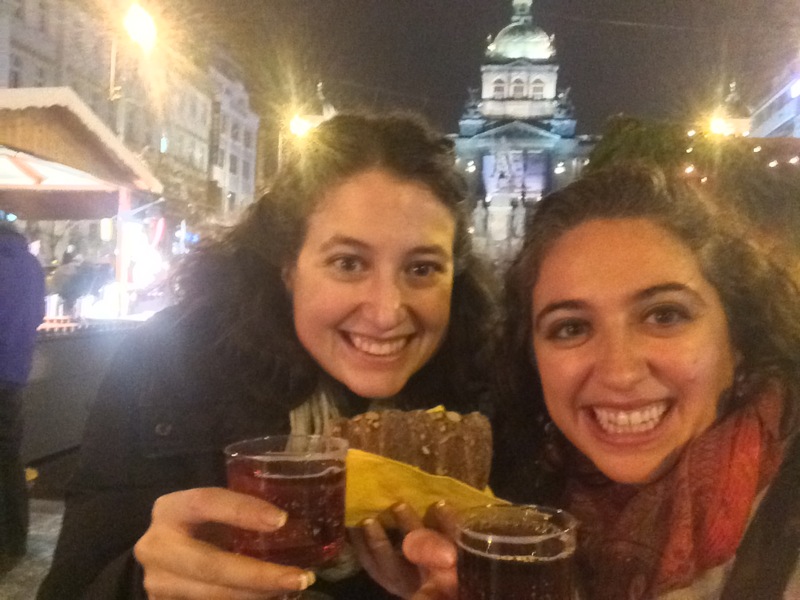 Yummy Prague specialties! Many variations on meat and potatoes! all of the trdelniks baking! The Hills are Alive and the Streets are Enchanting! 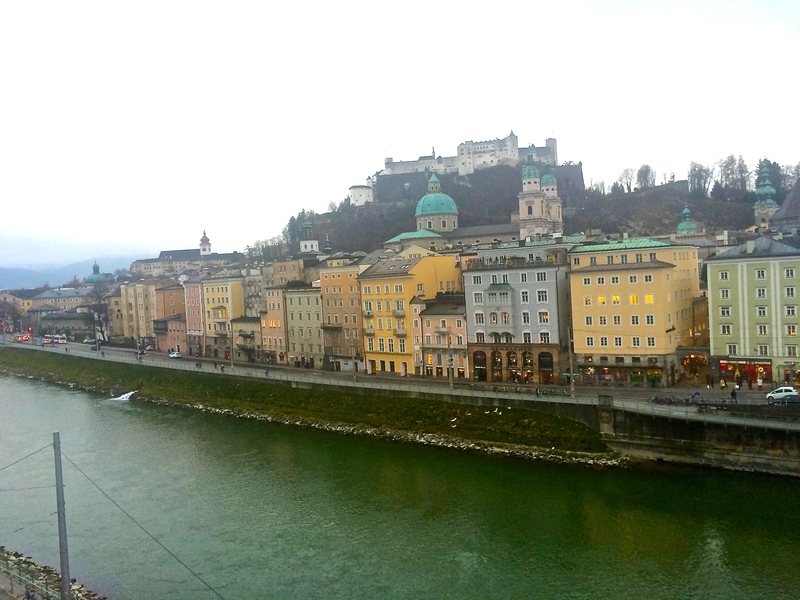 How do I even begin to describe the gem of a city that is Salzburg! Salzburg enchanted us immediately upon our arrival and we fell absolutely in love with this small and incredible charming city. 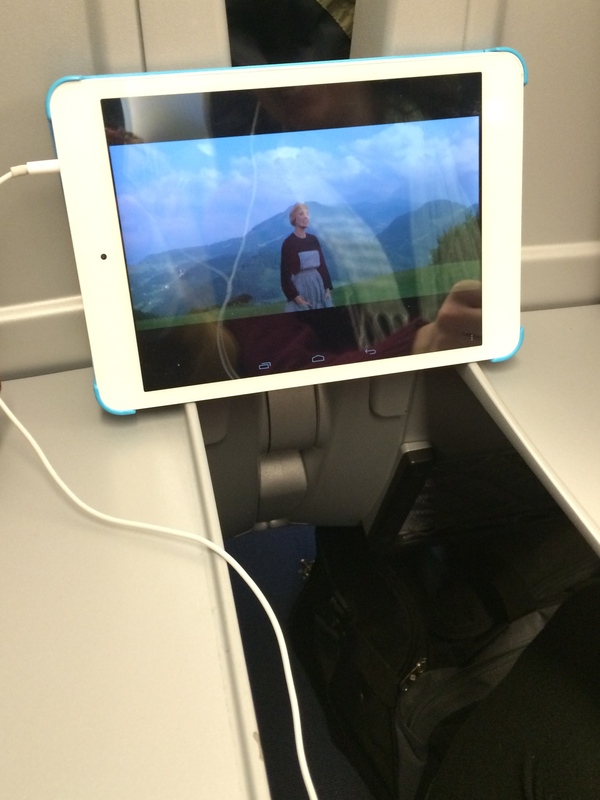 To set the stage for our visit we watched the Sound of Music on our train ride in. What a way to roll into Salzburg watching the picturesque views in the movie while looking out the window to find similar real life views. Captain Von Trapp’s patriotic love for his home began to be contagious. As I mentioned in my last post, I have been dreaming of one day visiting the treasured city of the Sound of Music ever since I fell in love with this movie as a child. 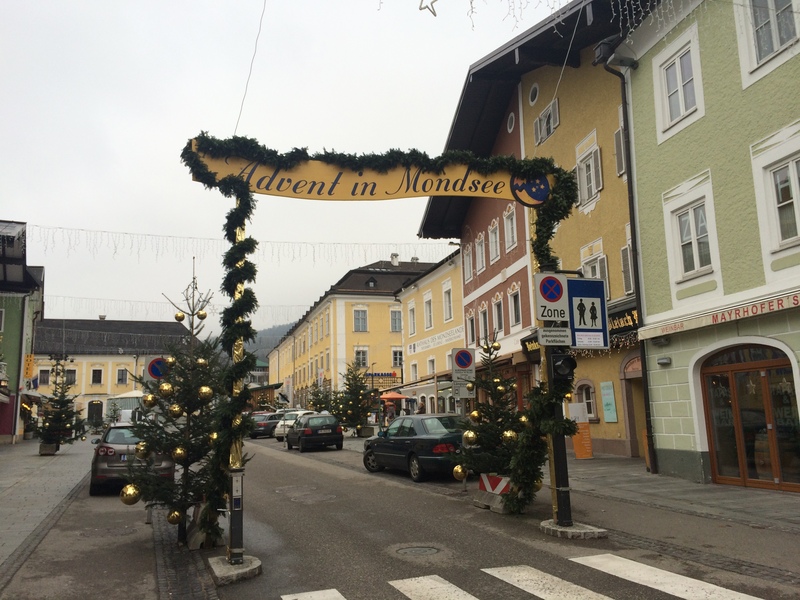 As I got a little older I learned there was an actual Sound of Music tour you can go on to visit the sites of the movie; it was decided, I HAD to go on this tour! When I was in eighth grade I actually started writing a bucket list of things I needed to do before I died, while I can’t find this original bucket list, I remember very distinctly writing The Sound of Music tour on it, near the top. 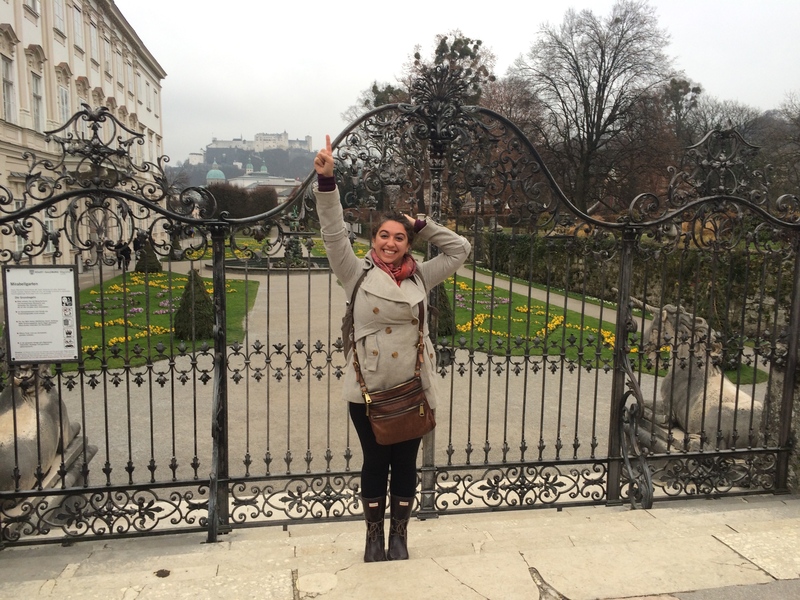 When Michelle and I planned this trip, going to Salzburg and going on this tour was my only nonnegotiable. 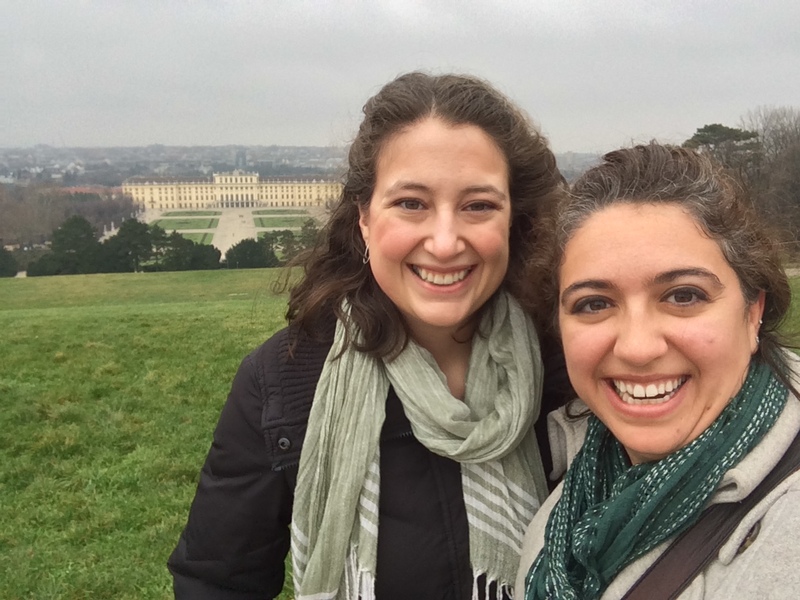 Now, while Michelle is fond of the Sound of Music, she isn’t quite the groupie that I am… So I greatly appreciated her willingness to humor me and accompany me on this long anticipated personal pilgrimage. 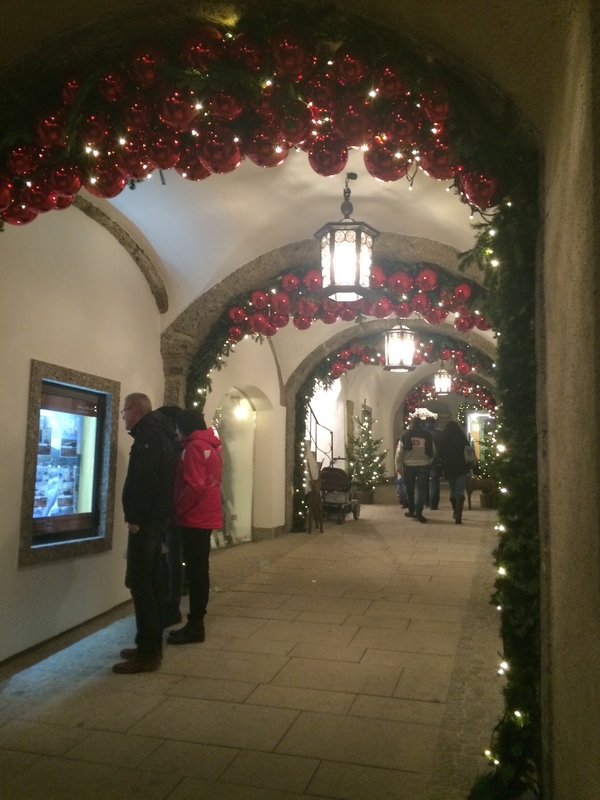 As we got into Salzburg and rolled our bags through the city to our hotel, we were immediately struck by the sweet charm and festive air that swept through the town. 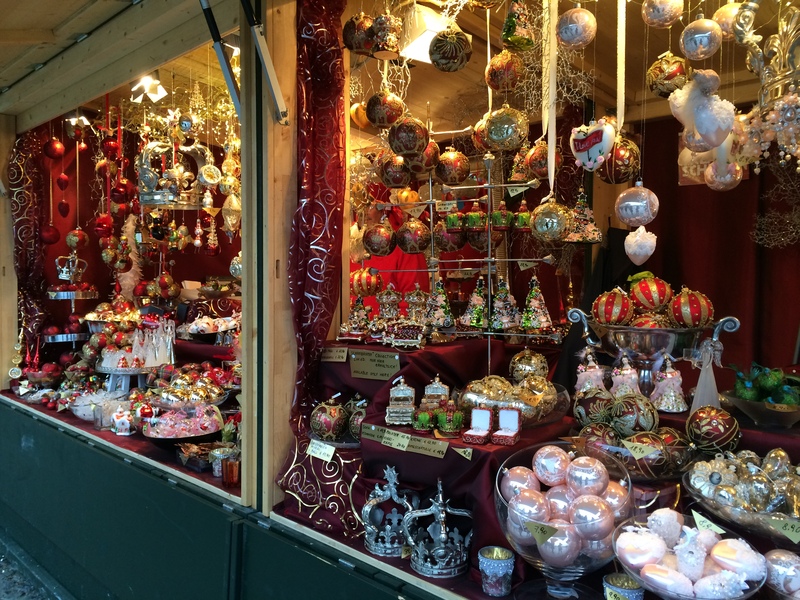 We passed a Christmas market that looked just as charming, if not more charming, than the ones in Vienna and we grew excited to explore a new city and also a new collection of Christmas markets! We only planned for limited time in Salzburg so we checked in quickly intending to visit a couple sites before they closed for the day. 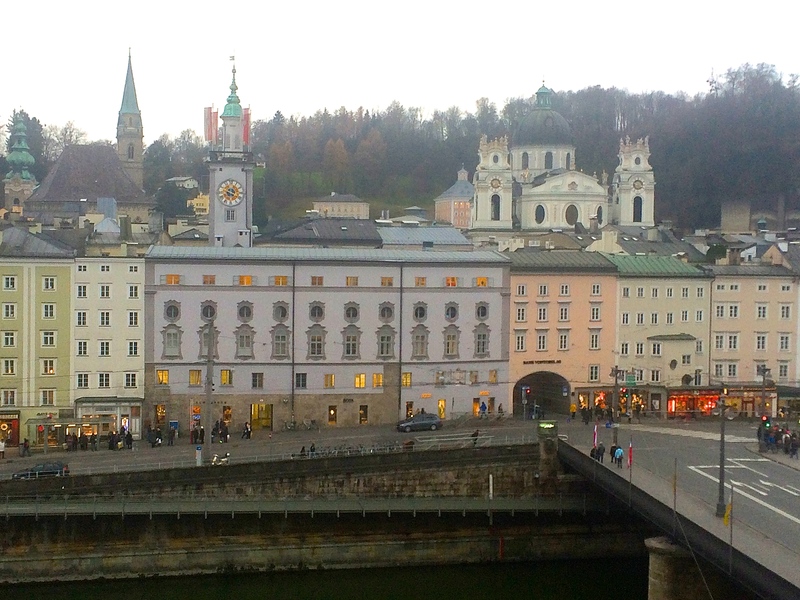 As we put our belongings in our eclectic and quite comfortable hotel room, we glanced out our window to find the most beautiful view of Salzburg’s Old Town along the river. The green copper domes, tall curvy spires, and different pastel colored buildings were set up so perfectly along the water. The large white fortress sat prominently at the top watching over it’s small but vibrant city. 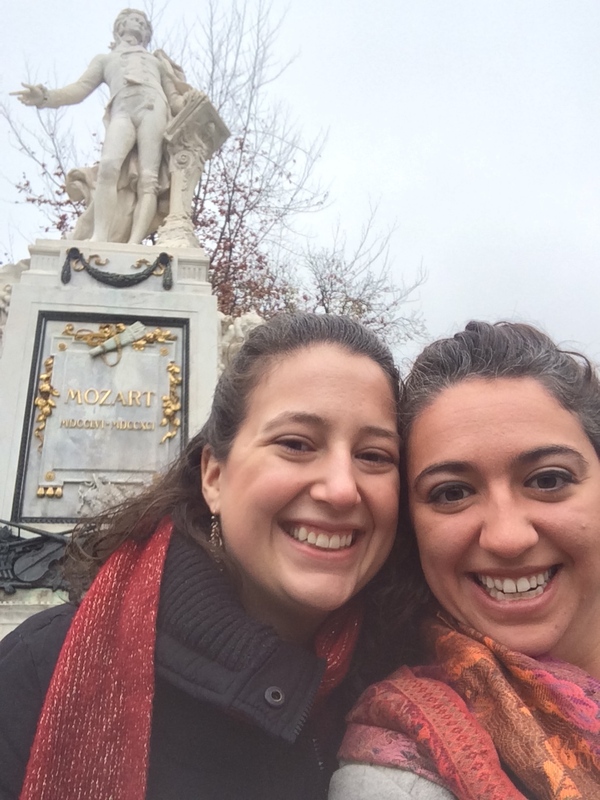 After snapping a few photos of our five-star view, we grabbed our map and set out to find Mozart’s residence! 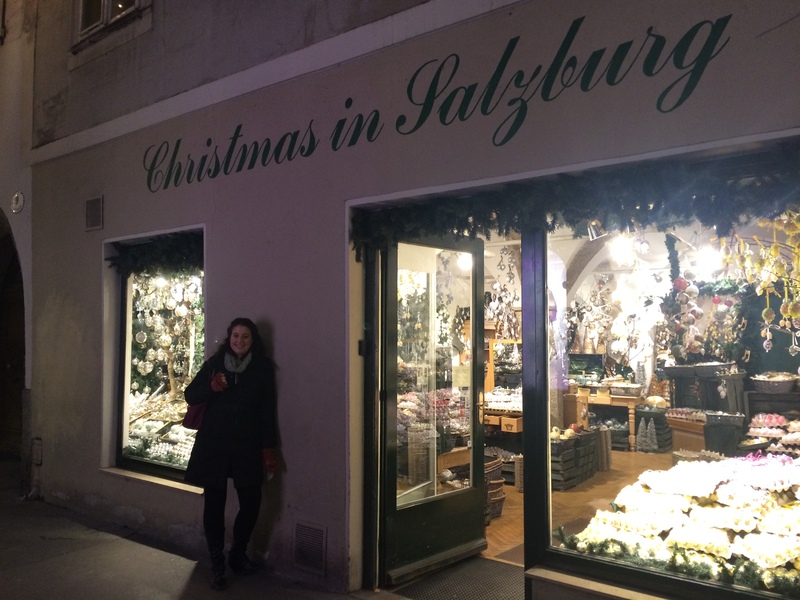 Yes, as it turns out, The Sound of Music is not Salzburg’s only claim to fame! 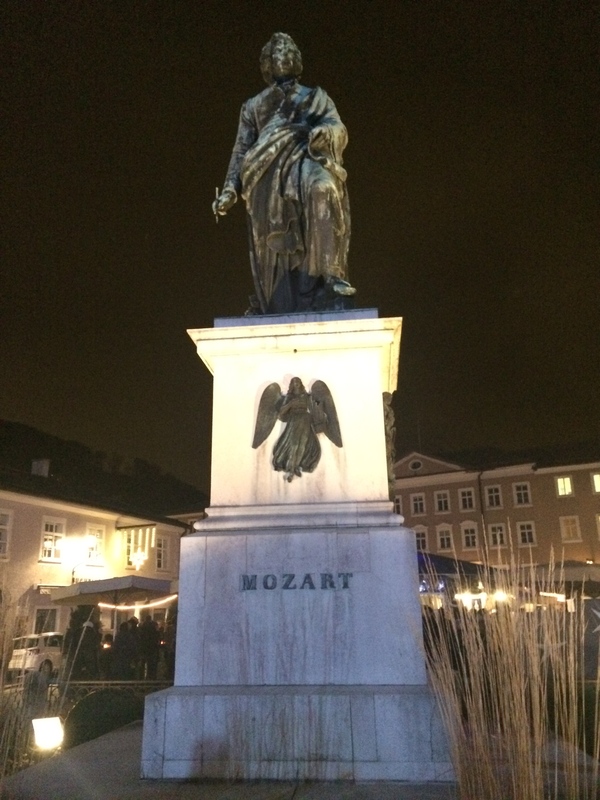 I had no idea prior to researching this trip, but the famous musical genius was actually born in Salzburg and spent some of his young and adolescent years in this city. 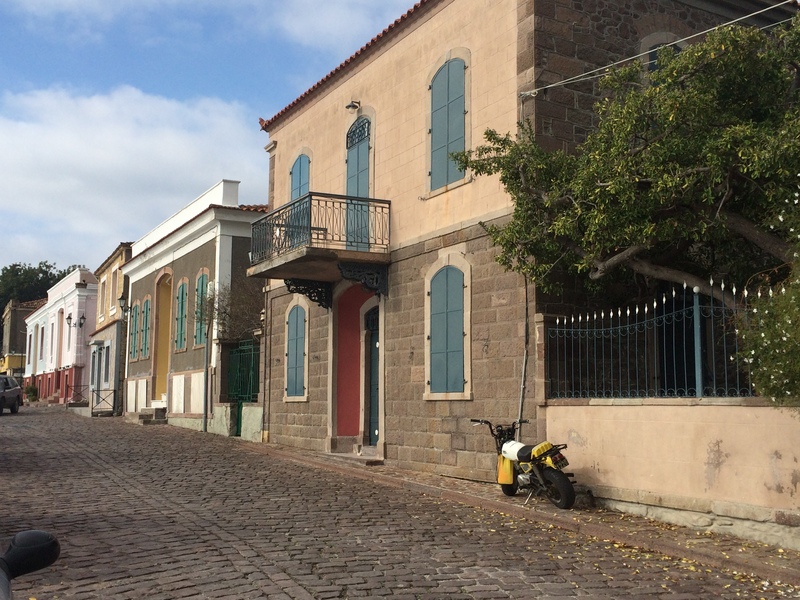 His home has been turned into a museum portraying the story of him and his musical family. 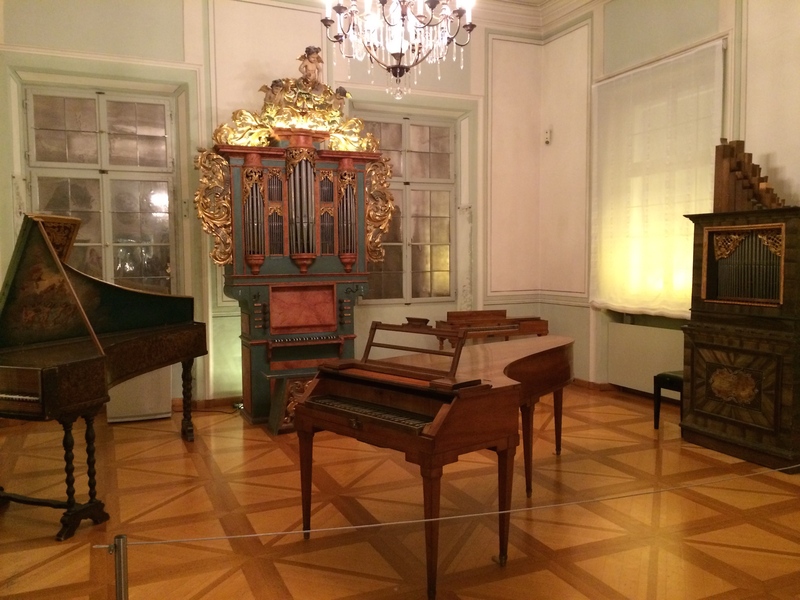 Most notably, the museum has some of the instruments that Mozart used to play and compose on as a young budding musician. 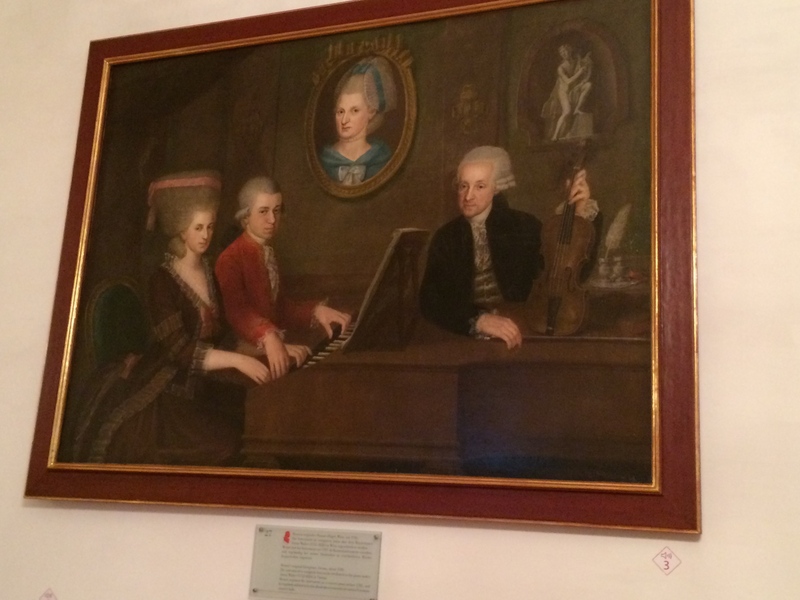 Much unlike a lot of the famous artists, Mozart’s genius was recognized all of his life. As a young child he played for the emperors and noblemen in grand halls and venues. Salzburg eventually became too small for this renowned musician and he moved to Vienna but Salzburg takes pride in being his birthplace and first home. 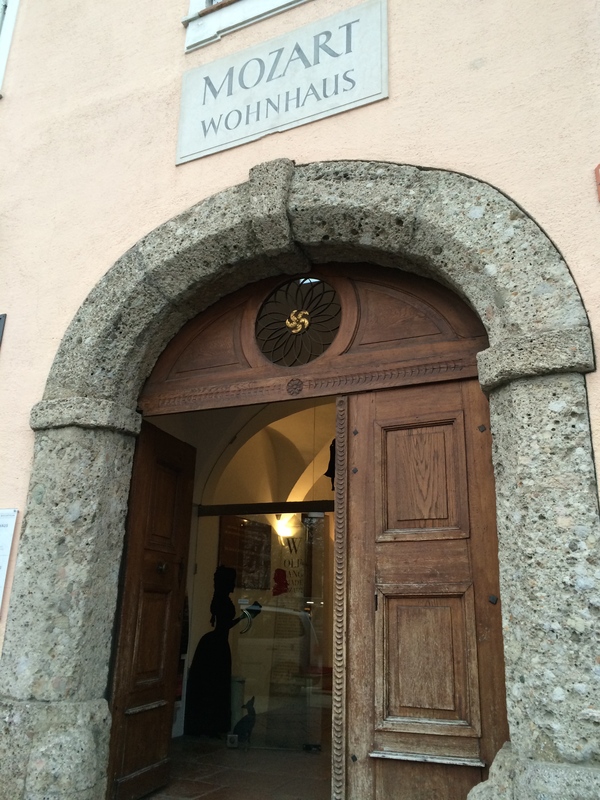 It was fun to learn that Salzburg’s history of music dates back far earlier than the Rogers and Hammerstein hit. 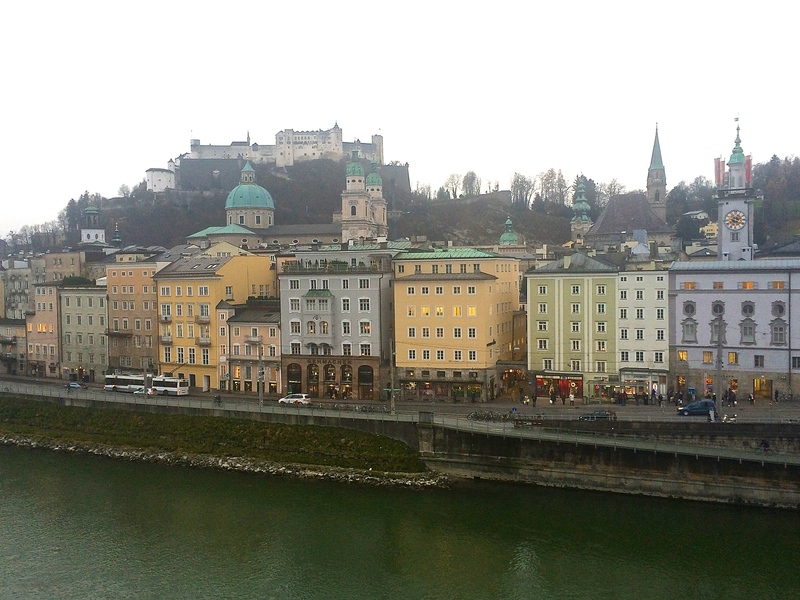 After a rich history lesson, we set off towards the grand fortress at the top of Old Town Salzburg. 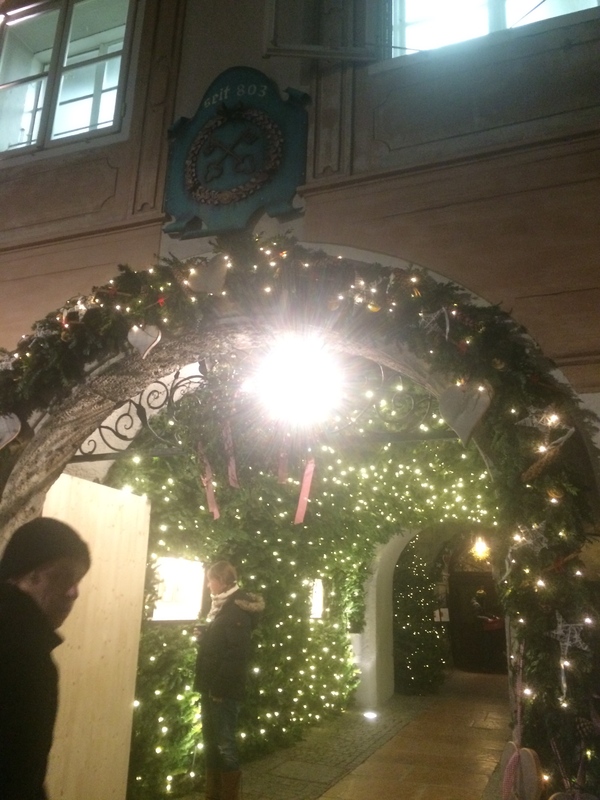 We passed through a huge Christmas market and had to force ourselves to put up our blinders up and keep towards our destination which we were afraid was going to close, the Christmas markets would have to wait! 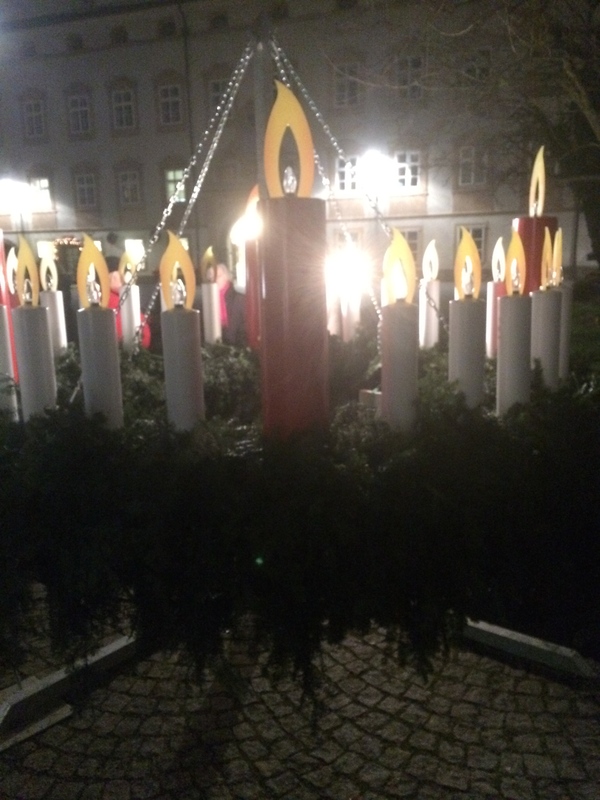 We were almost at the tram when we heard the most beautiful sound of a choir singing in the square. I had to literally tear myself away from this absolutely picturesque scene – a lovely Austrian choir with the purest of voices singing on the steps of a grand cathedral in the middle of a perfectly lit up Christmas market. 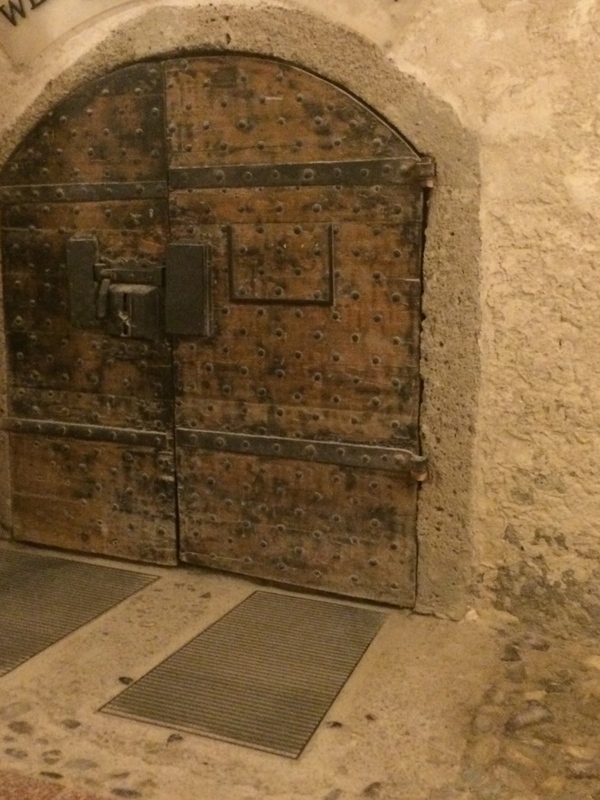 But we HAD to get to the fortress. 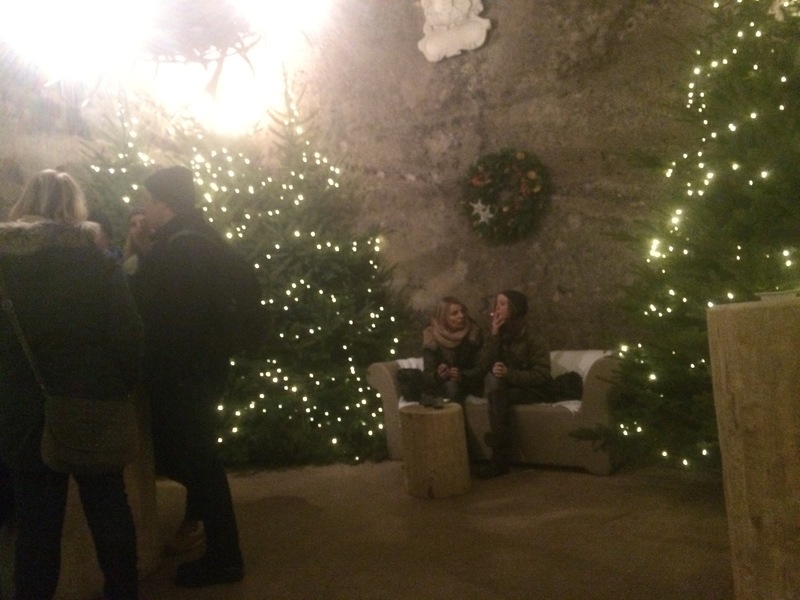 We got on the tram that carried us up to the top and let us off into the quiet and dimly lit stone corridor of the fortress. We heard the faintest sound of music (pun not intended I promise) and we hurried to follow it making our way to the outer walls. 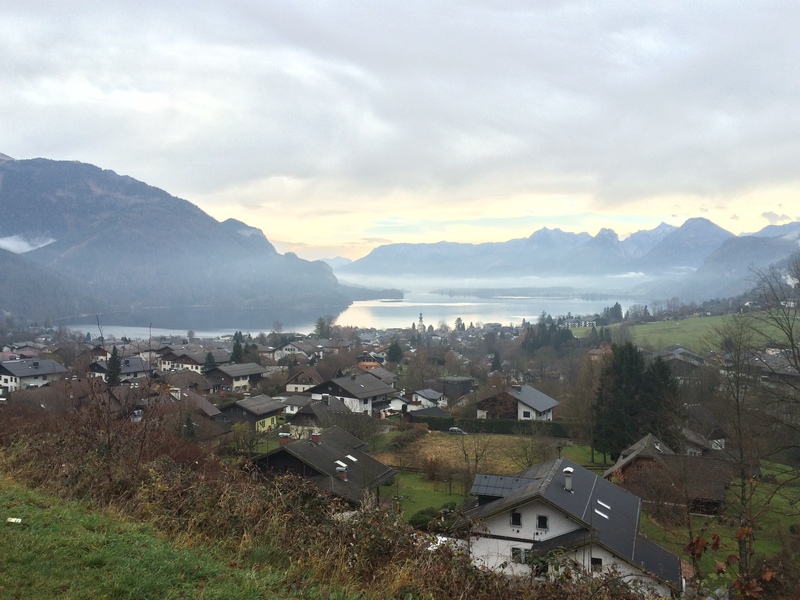 We leaned over breathing in the crisp fresh air of the Alps and could not believe the scene. We looked down over the Christmas market as the voices of the choir rose perfectly and clearly to where we were standing hundreds of feet above. There was no noise but the choir. We heard no sound of traffic or city commerce; there were hardly any other tourists, and the ones that were there were silent. 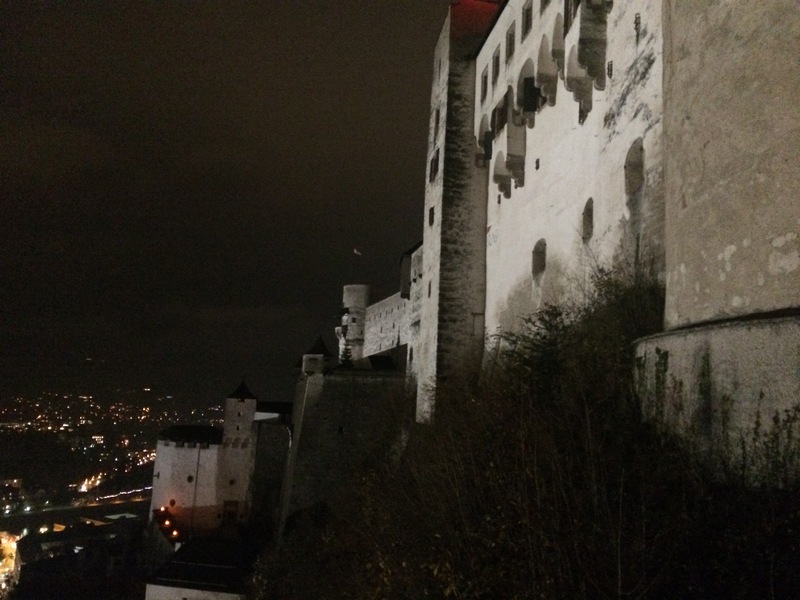 It was dark at this point, the only light came from the spotlights lighting the fortress. 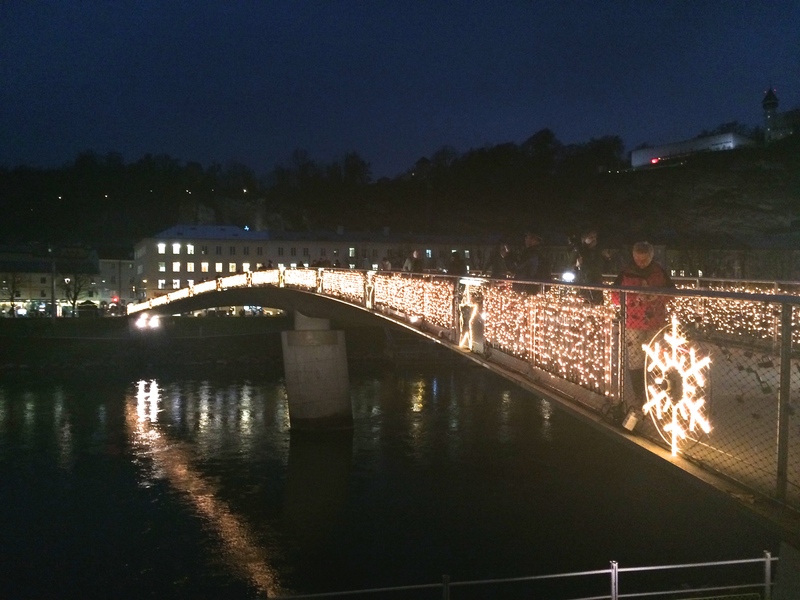 We stood in the peaceful stillness of the evening looking over the lit up city of Salzburg and listened to the angelic sound of an Austrian choir. I am finding it hard to articulate the peaceful joy that took over both Michelle and me. It was one of those moments where the rest of the world disappears; all that existed was the stillness, the music, and the air. We reveled in this moment as our emotions began to take us over. What a beautiful and unexpected moment, I felt perfectly welcomed to this almost magical city. I still to this moment have no idea how the sounds of the choir so perfectly carried up to the fortress, as it is significantly high above the ground. We could have stood there all night absorbed in this enchanting moment, but we felt compelled to explore before the last tram went down. 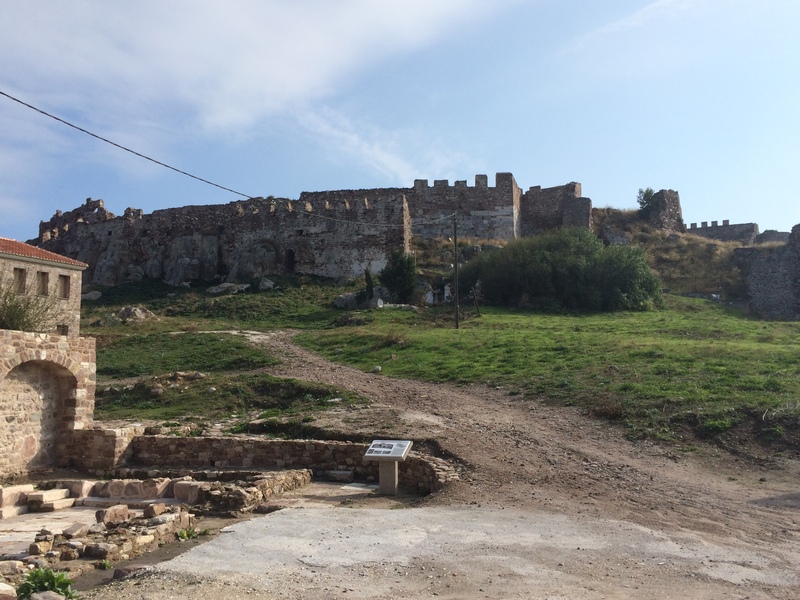 I later learned that this fortress was built to serve as the protective force for the city but that it was never actually used. The structure served its purpose however, as merely its foreboding edifice scared off potential enemies. The interior of the building was closed for tours but the large and intricate complex was still open to roam around. 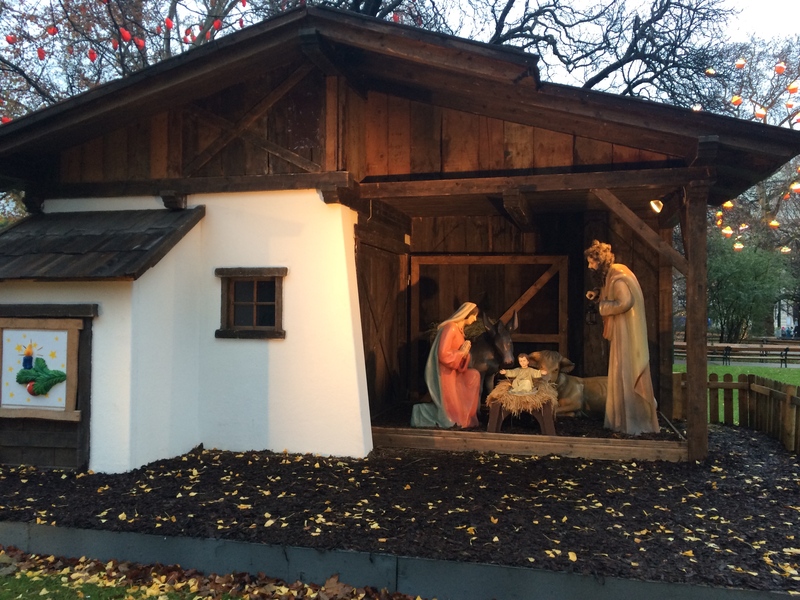 We stumbled upon a couple closed Christmas markets with lit up trees and a beautiful nativity scene. We enjoyed spectacular views of the lit up city, and like I mentioned earlier, enjoyed the noticeably fresh air of the surrounding Alps. 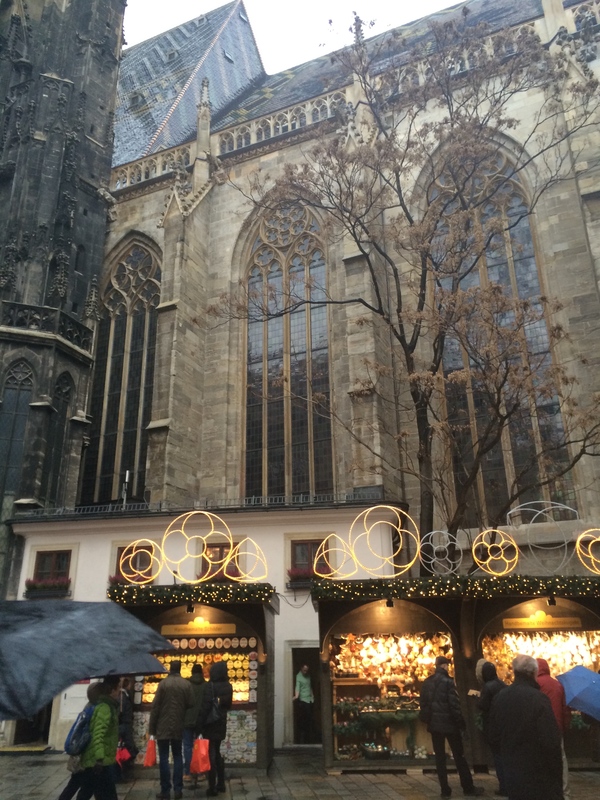 We made our way back down excited to explore a new city full of Christmas markets! 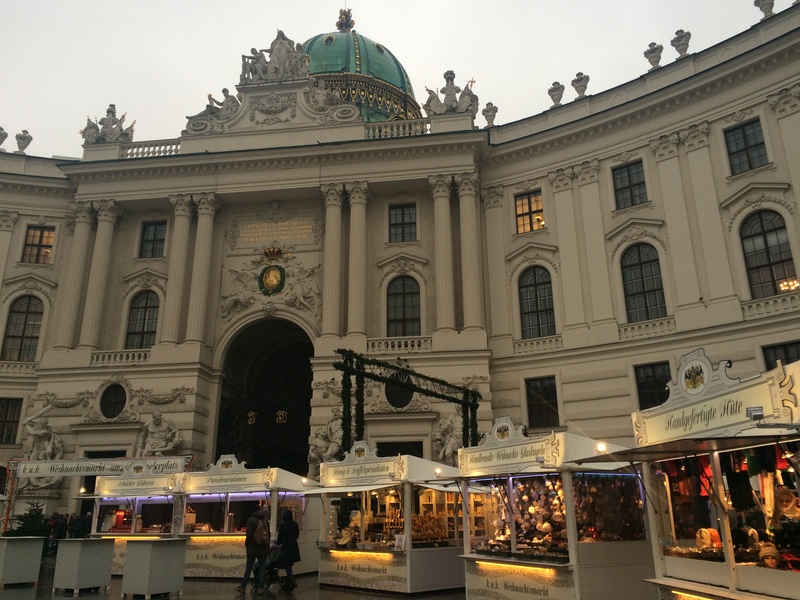 Much like in Vienna, there were booths full of beautiful handmade goods and piping hot spice infused punsches and delectably intriguing local delicacies. 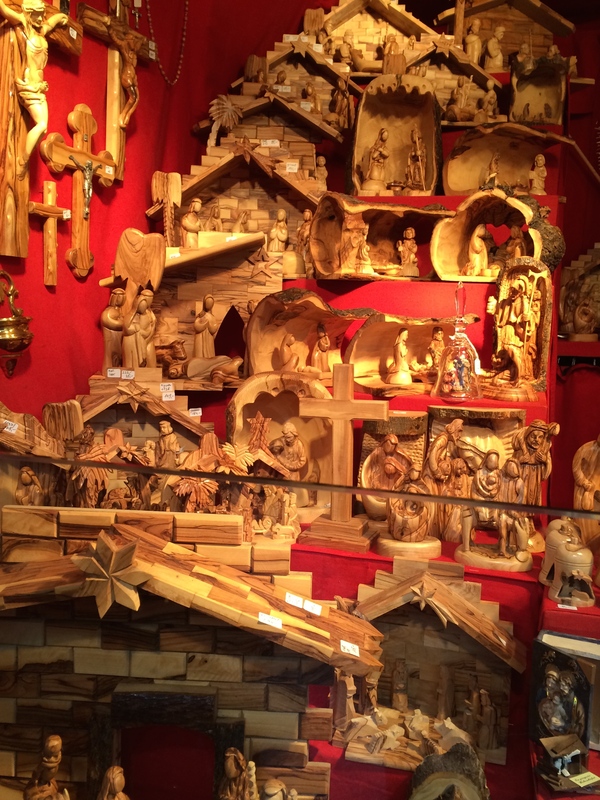 If possible, we stumbled yet upon more unique crafts and goods, again impressed with the Austrian handiwork. 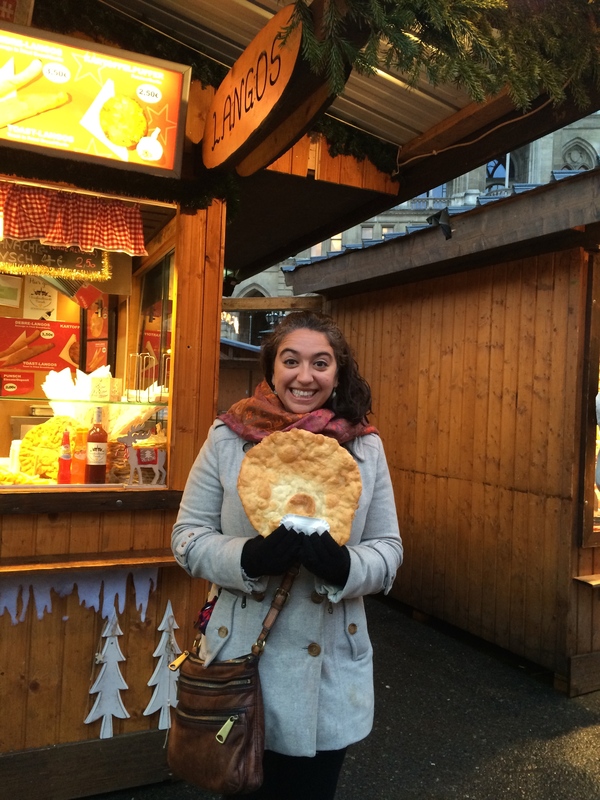 In all our travels through the markets we have been exposed to a large variety of the Austrian foods. 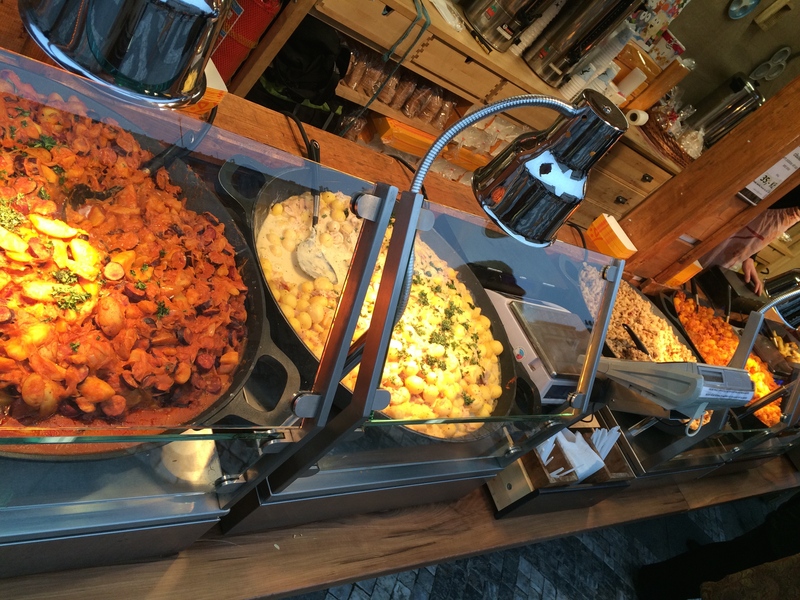 We have eaten most of our meals in the markets finding no reason to pay the higher prices of the restaurants when we have access to all of the local favorites right here! And besides, food off of a cart is always better! 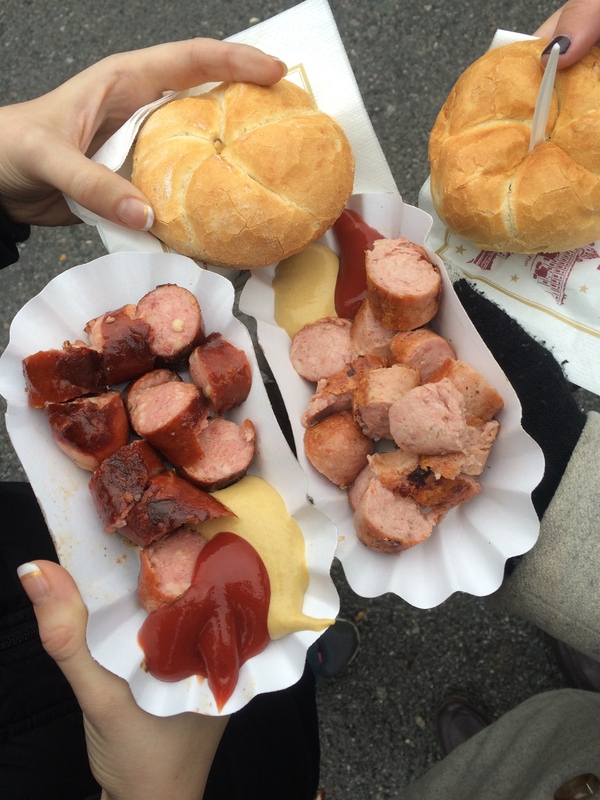 We continued down our list of foods we had to try. We have had a good system of sharing each food item so that we get to try a larger variety of items. 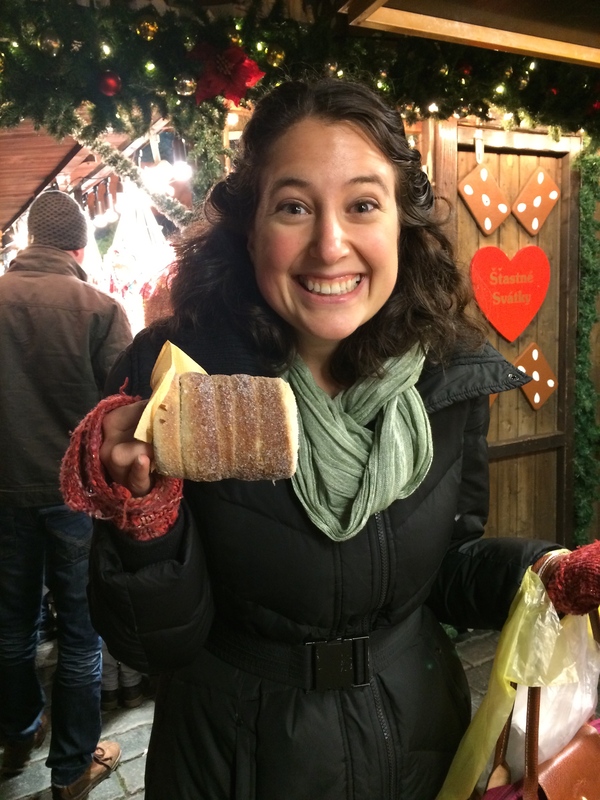 Anyone who knows me know I am an AWFUL sharer of food, but I have to say, put me in a market full of foreign and intriguing foods, on a limited budget, and I learn how to share real quick! Bosna and Schnitzel were on our list for tonight. 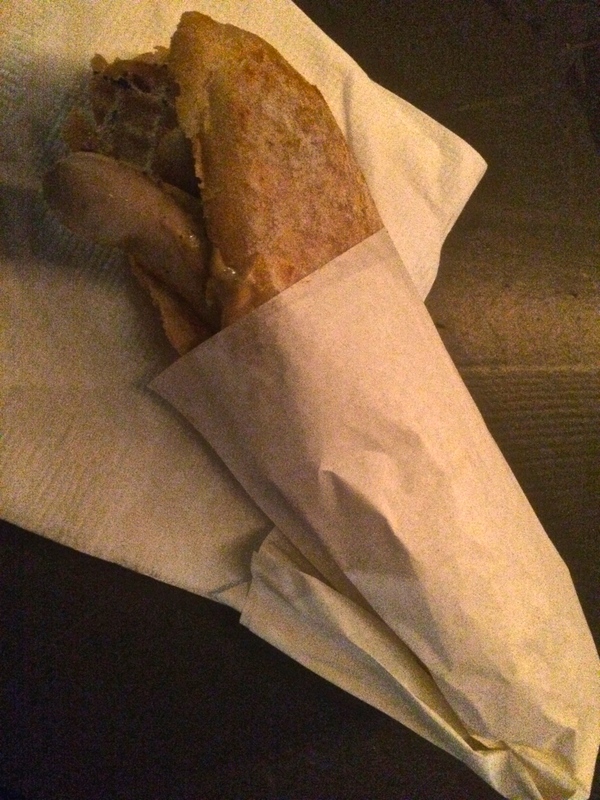 Bosna is a Salzburg specialty and we salivated over this tasty sausage, covered in a thick curry sauce, served in a baguette. Mmmmmm! It was so tasty! Schnitzel just sounds so quintessentially Austrian/German to me, so I insisted on trying it. We ordered the sandwich version of it and came to find out that “schnitzel” merely refers to a fried meat patty… so we essentially had a fried chicken sandwich. This worked for me since I haven’t had this favorite dish of mine in over three months due to my diet (by the way I’m clearly taking a break from my diet this week…) but I can’t say it seemed much different than something we would find in the states. Regardless, I can now say I have had schnitzel! 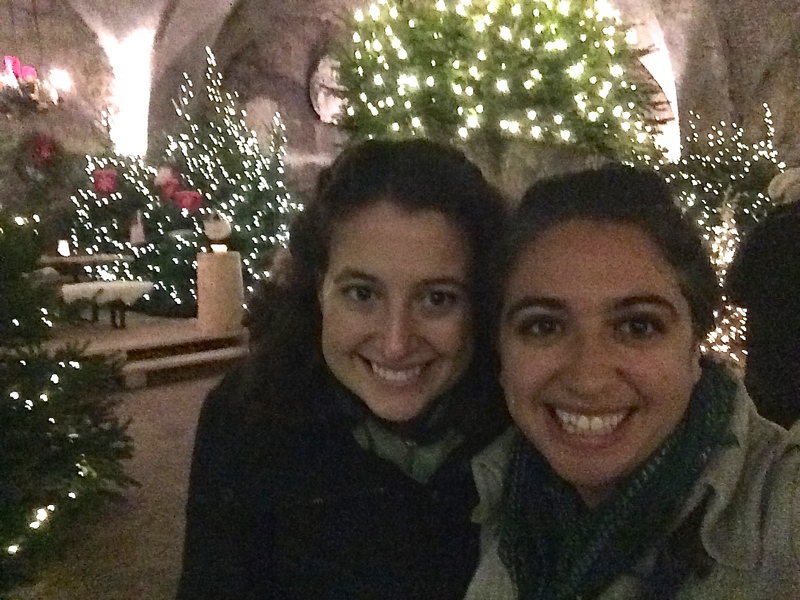 We warmed up with a couple glasses of mulled wine and made our way through the maze of markets. 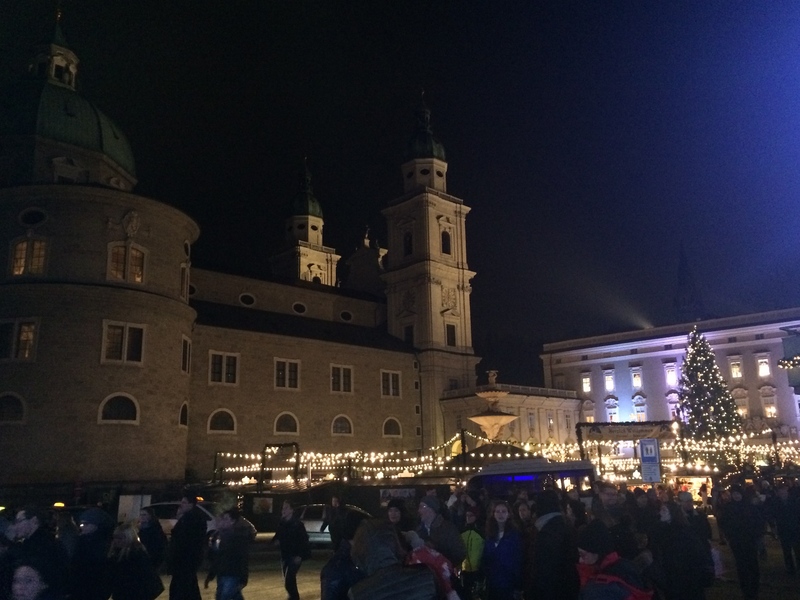 We love you Christmas in Salzburg! 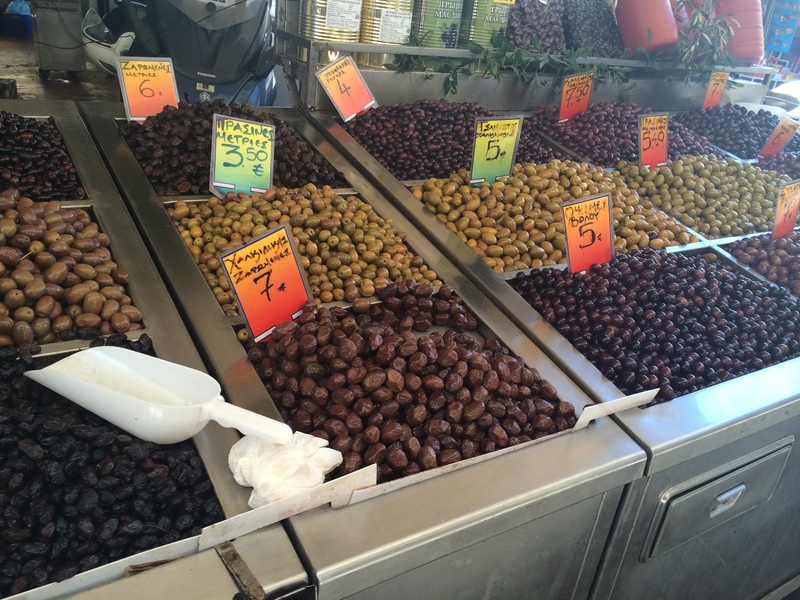 One of our favorite markets! As we were sipping on our hot drinks, we started to hear a loud clanging of cow bells accompanied by hooting and hollering. We made our way toward the commotion to find out what was going on. To our great surprise we found ourselves amidst a parade of the most horrific creatures. Dozens of people dressed in realistic terrifying beast costumes were following one another, clanging bells, and running up to the onlookers attempting to scare them (and then agreeing to take pictures with those brave enough). A group of these beasts were carrying he who appeared to be the beast of beasts, high on a chair, through the town. 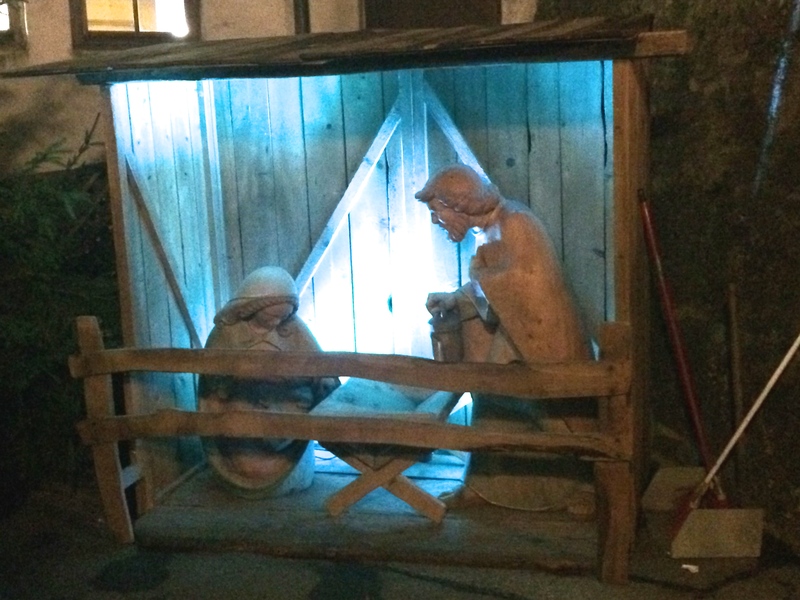 We were amazed and tried desperately to snap photos of this bizarre event. The parade moved very quickly and I only got a couple mediocre shots of one of the beasts. 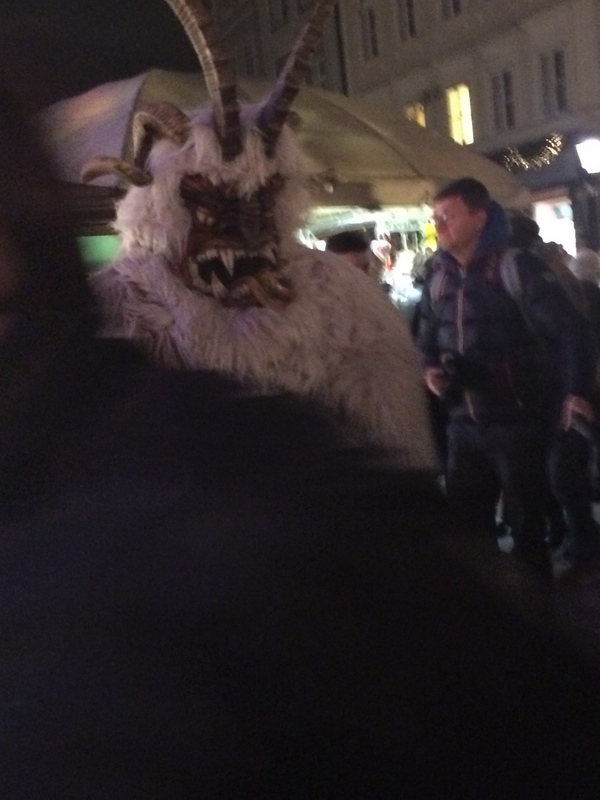 We later looked up this foreign tradition and learned that this beastlike creature is named Krampus. Krampus is an old folk evil spirit, a traditional character from many of the Alpine countries and has its roots in Germanic folklore. Krampus is a devilish counterpart to St. Nicholas who “takes care of the naughty children” while St. Nicholas gives treats to the children who have been good. Children apparently grow up learning about Krampus and know that he will either bring them coal or punish them in a much worse way if they are bad. 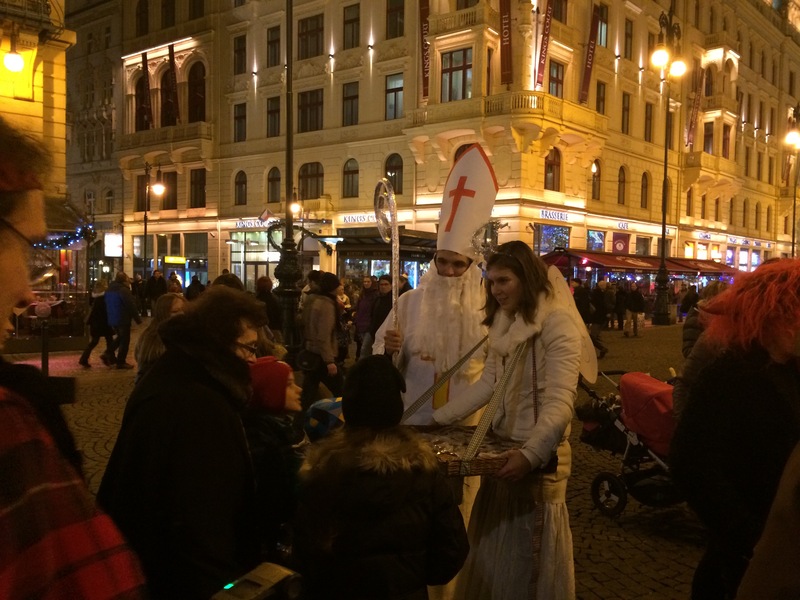 It seems to be a more extreme version of the naughty and nice list… People in Austria dress up as Krampus and roam the squares the week leading up to St. Nicholas day, hence the reason we ran into this ruckus parade! While the whole concept is a bit disturbing, it was fascinating and exciting to take part in this unique cultural tradition!!! I woke up on Thursday like a child on Christmas morning! The time had finally come; I was about to go on the Sound of Music tour!!!! We were heading to the train station right after the tour so we packed our bags, checked out of the hotel, and hopped in the complimentary shuttle for the tour! The shuttle pulled us up to the meeting place and I became giddy as we boarded the big tour bus plastered with images of Maria and the Von Trapp children, snapshots from the film. The tour guide got on the bus and started explaining the schedule of the tour. She was a phenomenal tour guide and had the whole bus laughing and engaged from the moment she got on the microphone. She explained the different sites that we would be able to see, some up close and some we would have to see from a distance because they are now private properties. 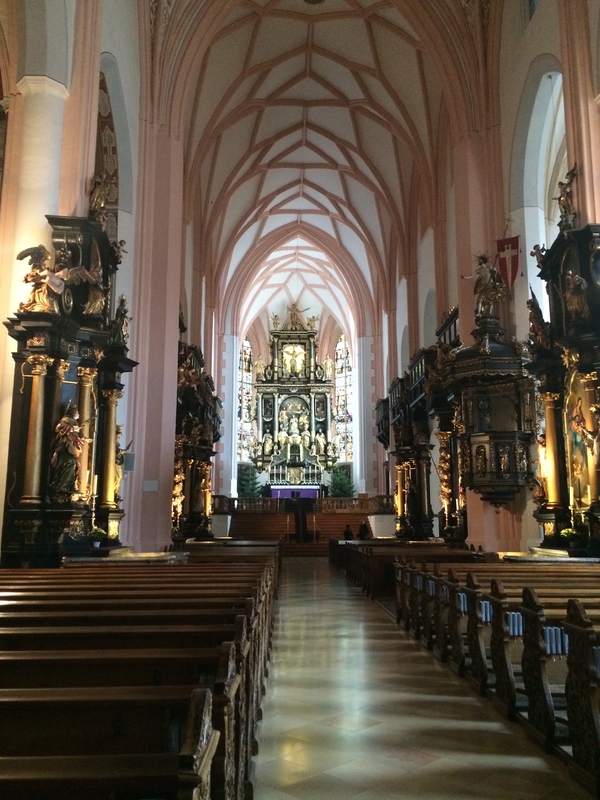 She explained that most of the interiors, with the exception of the wedding cathedral, were filmed in Hollywood, but all of the exteriors were filmed in Salzburg. So for that reason, the majority of the tour was of exteriors. We saw the abbey, which was used in the film and was the actual abbey that the real Maria was a postulant at. 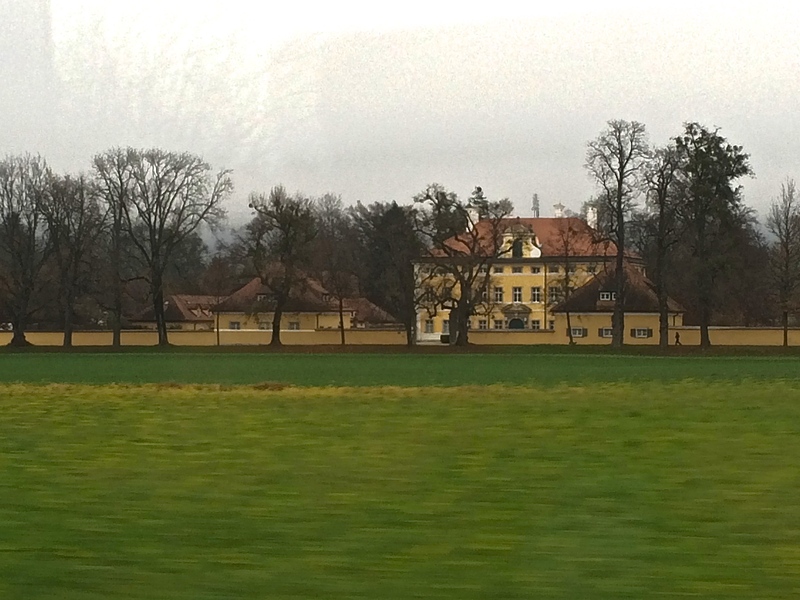 We saw the two houses used for the Von Trapp home; there are two because the back yard of the house that boarders the lake and the actual yellow house are actually over a mile away from each other meaning that several scenes had to be shot in two different locations and seamlessly edited together! We saw the gazebo, which used to be outside one of the houses but because tourists would find out about it they would climb the walls of this private property and try to visit it, for this reason the property owners donated the gazebo and had it moved to a more convenient place for visitors to visit!! 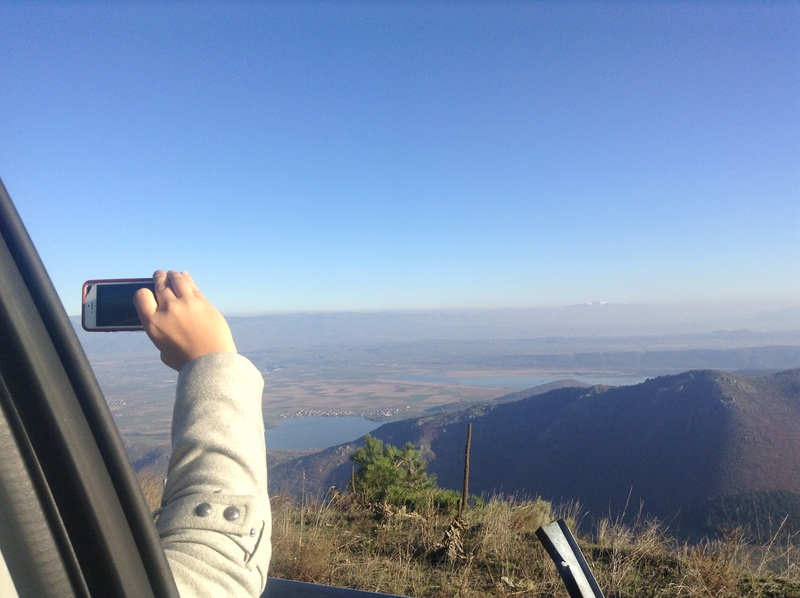 They took us into the alps to the Lake District near where the opening scenes and the picnic scene were shot – we were lucky to get a spectacular view as our tour guide said the winter fog has been getting in the way of many of the tours! And our last stop was a visit to the town where the cathedral from the wedding scene is. 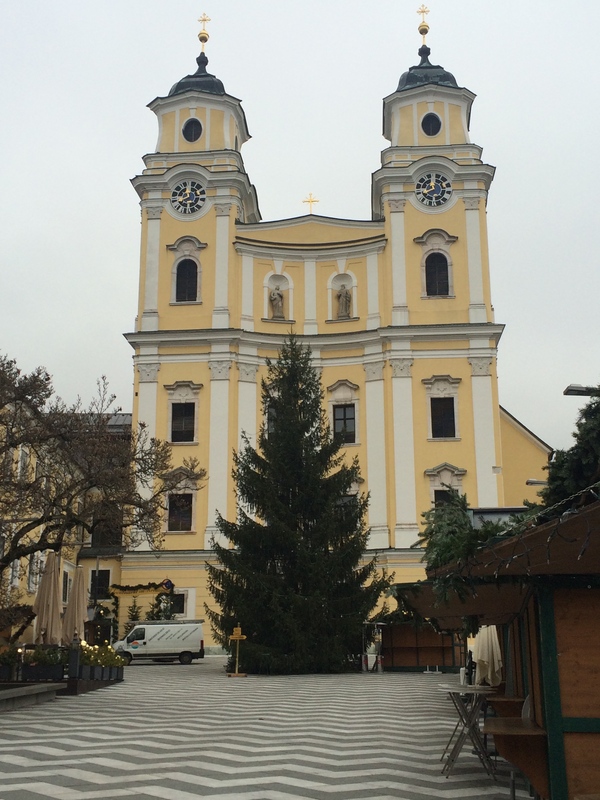 We got to tour the cathedral and spend a little time in this charming town about a half hour outside of Salzburg. The tour ended at the iconic steps at the Mirabel gardens where Maria and the children ended the classic Do Re Mi ensemble. On our way back to Salzburg they showed a film of an interview with Lisle many years later reflecting and showing footage on the shooting of Sound of Music in Salzburg. The tour was everything I could have hoped for and more! I got to see the iconic buildings of my childhood in person, I got to go to the actual gazebo that I used to pretend to dance through in my dress-up clothes in my basement, I got to experience the breathtaking scenery capturesdso spectacularly in the film, I got to Do Re Mi my way up the famous steps in the Mirabel Gardens, and I got to sing along to the sound track playing over the bus’s speakers as we rolled through the actual streets of Salzburg! The tour guide did an excellent job of narrating, sharing fascinating tidbits of information about the making of the film, explaining the historical context of Salzburg, and telling us the real story of the Von Trapp family (while a similar concept, the story of the real family is actually quite different from the film…). While I did not get to twirl and sing inside the gazebo, I did hop up Do Re Mi stairs and attempted to mimic Maria during the emphatic final scene of the song. After the tour we ran with high spirits and much joy to train station to catch our train to Prague. 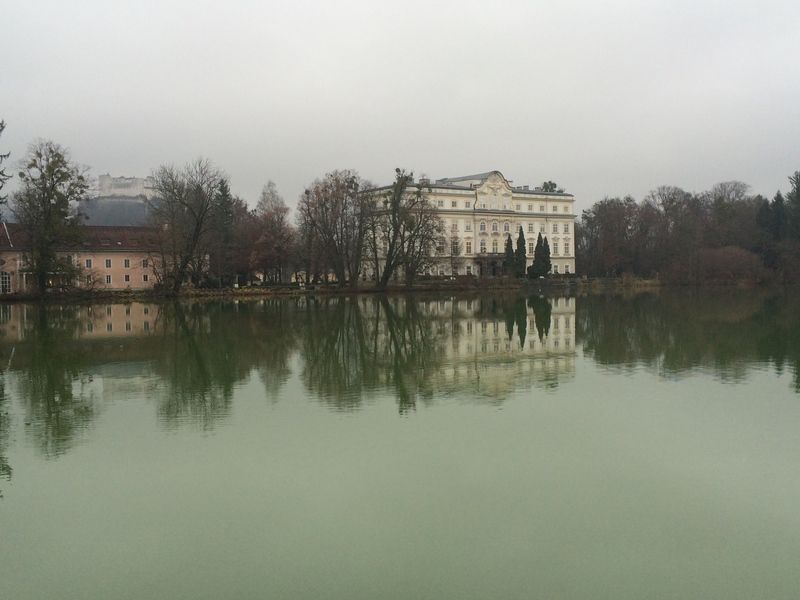 While we were only in Salzburg for 24 hours, we fell absolutely in love with the city. There is just something in the air – our tour guide said that Rogers and Hammerstein spent only 4 days in Salzburg and in that time they became enchanted themselves coming up with the lyrics “the hills are alive with the Sound of Music” and proceeded to write the entire score from their brief but moving experience in this Alpine region. There is indeed something a bit magical about this place and I am so thankful I was able to make the journey!! 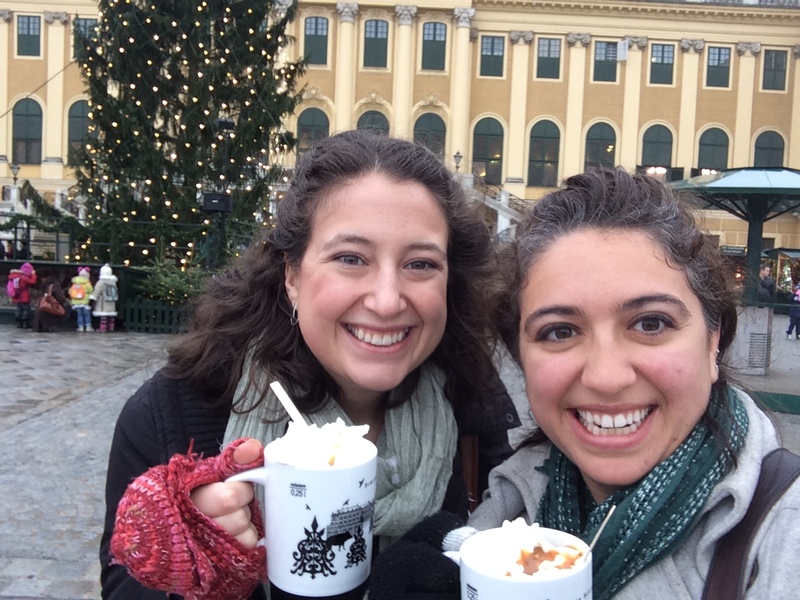 A girls trip to Christmas wonderland: Vienna, Austria! 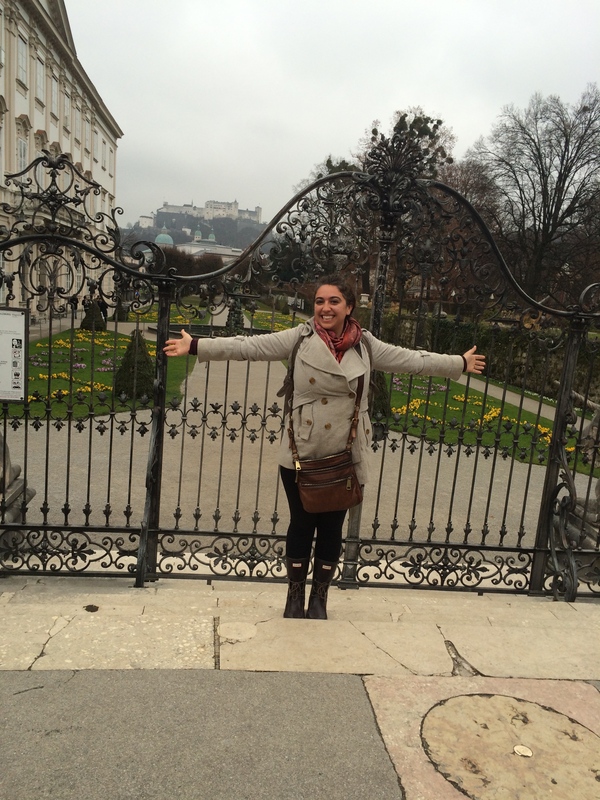 I have left my heart in Austria. This country has far exceeded all expectations I had of it. I suppose though, I did not know what really to expect. 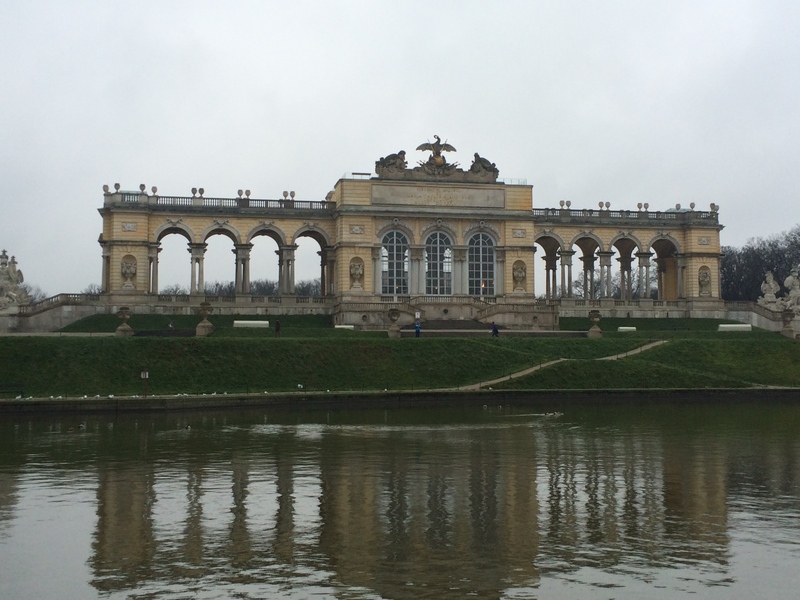 I have not heard many stereotypes about Austria and thus I had no assumptions about the personality of the country. 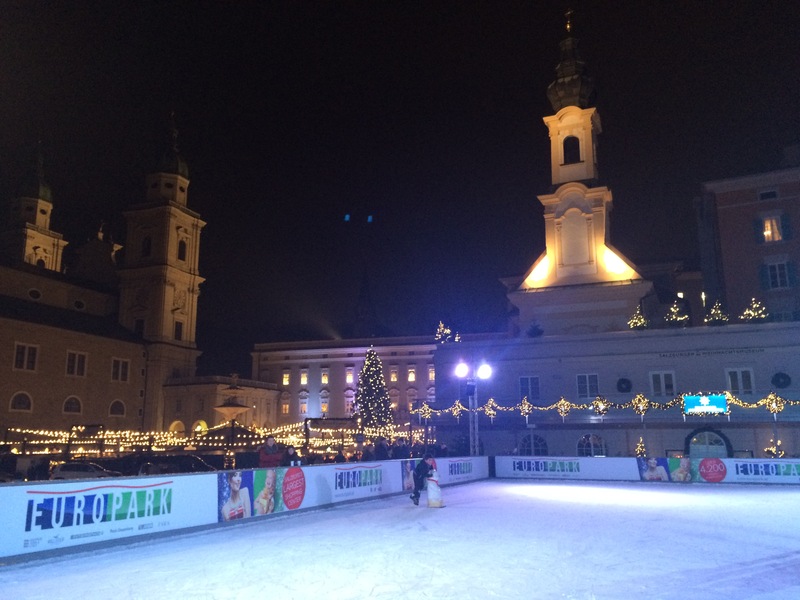 Austria has been on my list of dream countries to visit for quite some time for two reasons: The Sound of Music and the Christmas markets! The Sound of Music played a huge role in my childhood and I have continued to treasure this movie into my adulthood falling in love with it all over again each time I watch it. I have wanted to make a pilgrimage to the holy site where this movie took place since I was 10 years old. 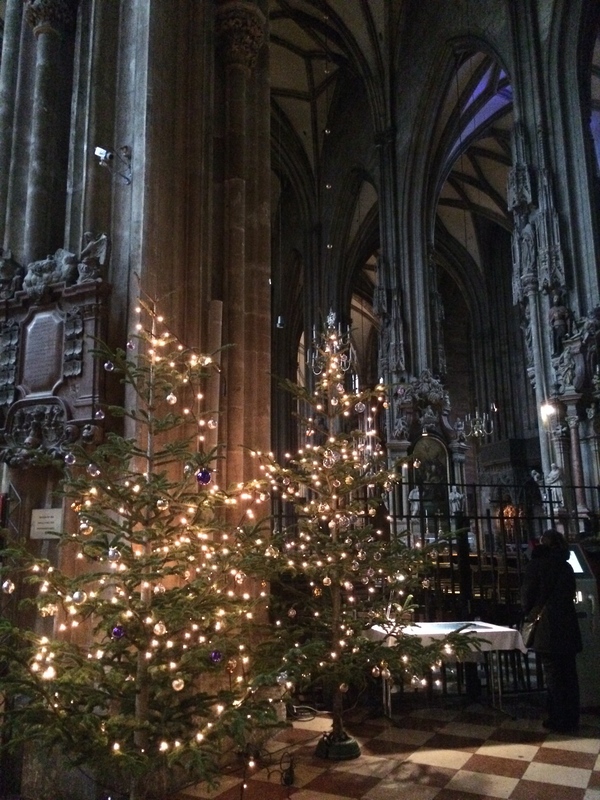 Additionally, a few years ago, a few of my friends visited the Christmas markets in Vienna and due to my extreme love of all things Christmas, they told me I HAD to go. After hearing their descriptions I knew a Christmas lover like me had to make this journey to Christmas heaven! I have been dreaming of the possibility of this trip for a very long time and finally, the stars aligned and made this trip perfectly possible. My dear friend Michelle wanted to plan a trip to visit us as soon as she heard we were moving to Greece. We also found out that our mutual friend Tina was going to be on a trip with her parents that would bring her through Vienna at the beginning of December, and Michelle has a friend that lives in Vienna, so it was perfectly logical, Michelle would come to Greece for a few days and then we would head to Vienna to meet up with our friend Tina and fill in the rest of the details of the tip ourselves. 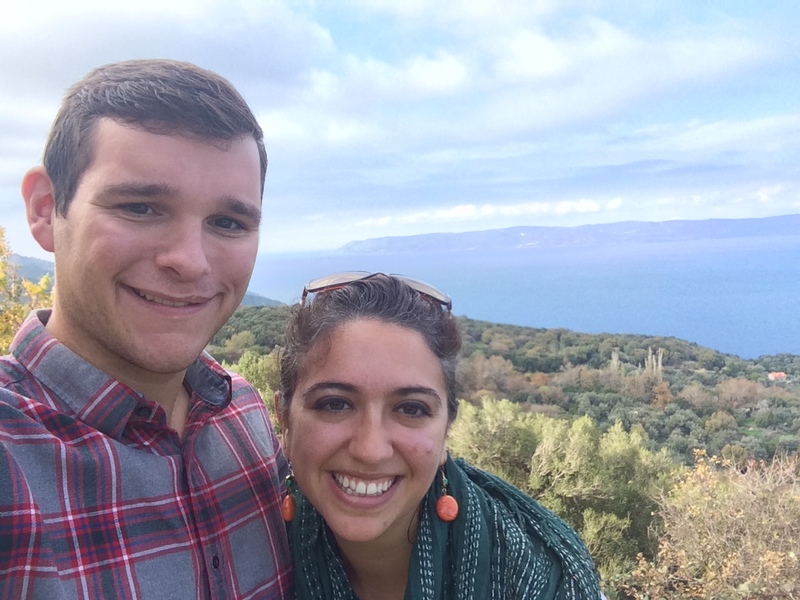 Mikey and I have been having a lot of adventures traveling around Greece but I was hoping to make at least one trip outside of Greece while in Europe. With so many countries affordably at our fingertips, you can’t keep a travel lover like me still for very long! Amazingly, my most longed for trip, started to become a reality! My incredibly supportive husband encouraged me to plan this girls trip even though it meant leaving him for a week. 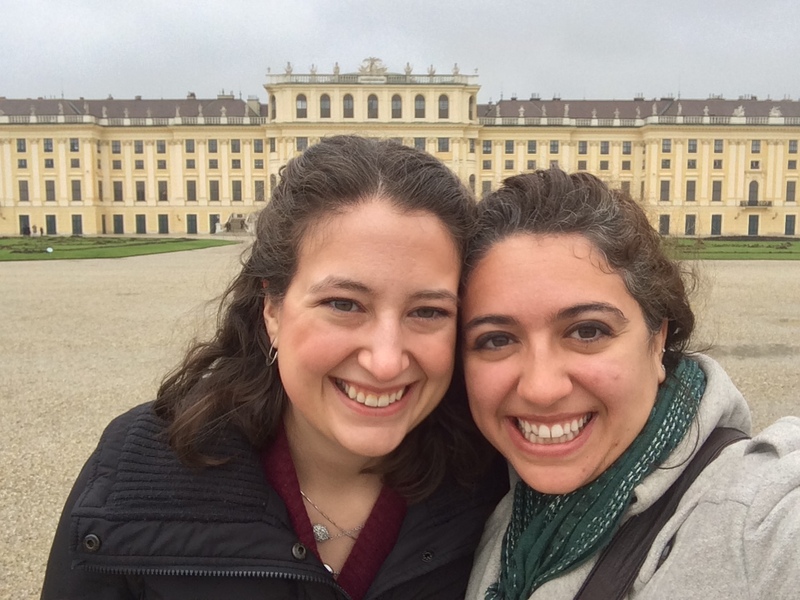 So after much researching and planning, Michelle and I decided to start in Vienna then go by train to Salzburg and from there, by train to Prague, and then back to Vienna for our final night. I am writing now on our train from Salzburg to Prague. 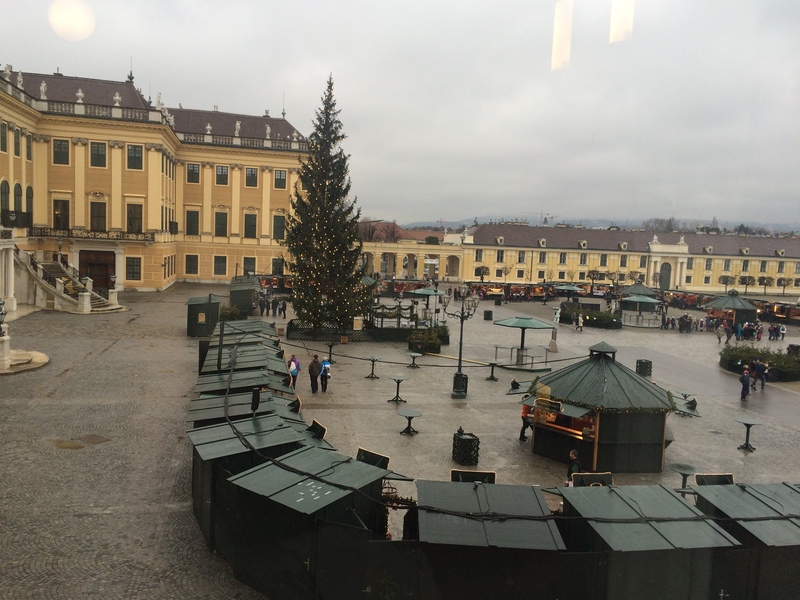 The bulk of the Austria portion of our trip is over and we are off to the Czech Republic. How can I begin to reflect on all that we have experienced the last three and a half days!! 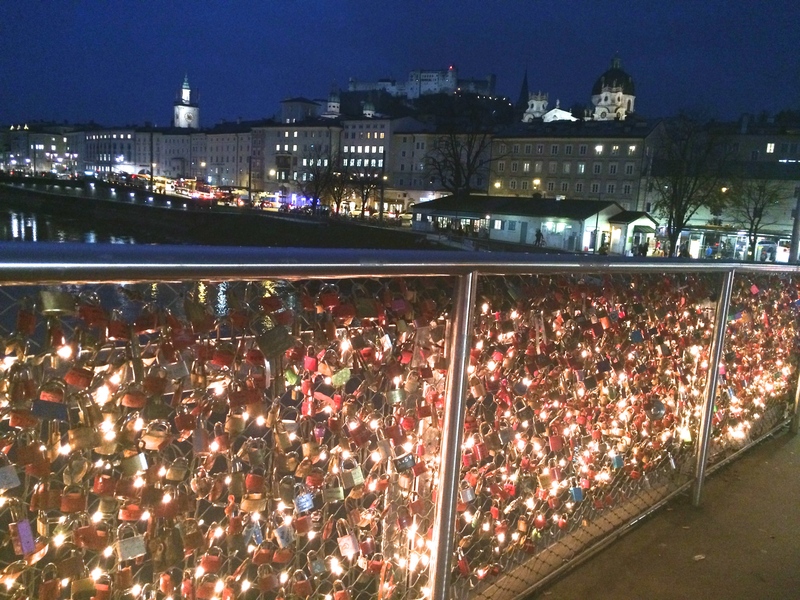 Like I said, I think I left my heart in Austria. I have absolutely fallen in love with this country. I first have to reflect on the contrast between Greece and Austria. I knew there was a heavy German influence in Austria so while I did not know what specifically to expect of Austria I assumed much of a contrast to Greece, and oh was there a contrast! 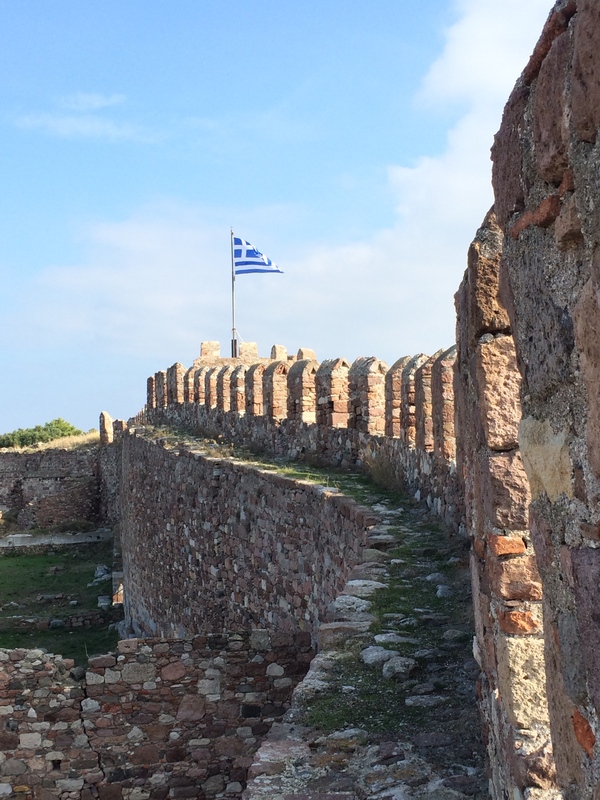 In all of the love that I have cultivated for Greece over the past three months, there are some aspects of Greece that are irritating, irrational, and not so pleasant. I am used to traveling to Europe from America, so with my American superiority complex, I am always expecting my destinations, while full of amazing history and spectacular sites, to be somewhat of a lower quality when compared to my homeland. Coming to Austria from Greece was quite a different experience. I have of course fallen in love with Greece and so I have forgotten how much I miss the simple conveniences of a more modern and progressive culture like flushing my toilet paper in the toilet, decent central heating systems, and a higher level of city cleanliness and efficiency (including the timeliness of trains and public transit). I quickly remembered as I disembarked the plane into a sleek and exceptionally modern airport and especially upon arriving at the lovely Hilton Plaza hotel. Michelle travels a lot for work and thus has achieved status in the Hilton hotels and she graciously used her points to allow us to stay in incredible hotels during our trip as well as reap the benefits of her status. We were greeted with a complimentary bottle of wine in our upgraded room and were invited to visit the executive lounge for complimentary breakfasts, drinks, snacks, and happy hours! I realized pretty quickly, that this was going to be quite a treat and I am so grateful for it! 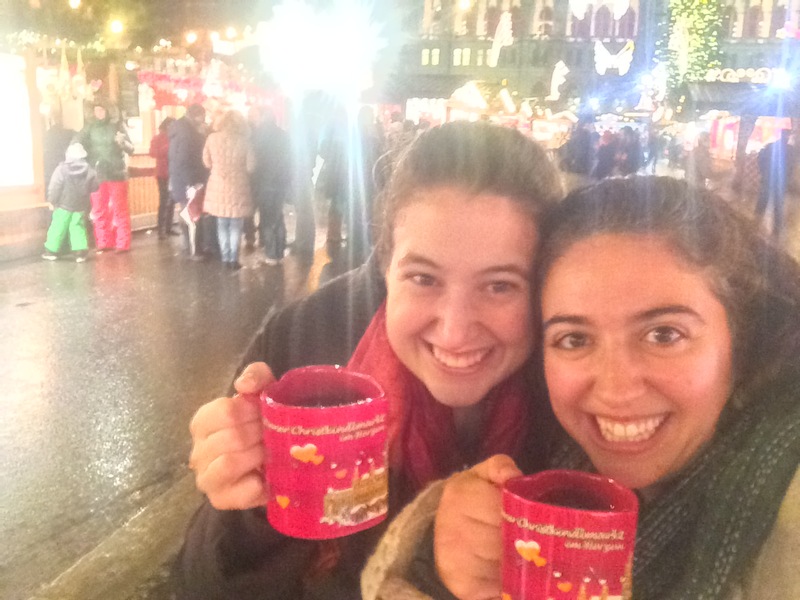 Our first order of business: the Christmas markets!!!! Immediately upon our arrival my dear friend winter greeted me with a blustering hug! Call me crazy, but I have missed winter!!! While our weather in Thess has been cool and dreary, I would not call it winter. The distinct chill that only a warm coat, wool mittens, a hot beverage, and a crackling fire can diffuse has not made its way to Greece thus far. In the days leading up to Christmas, I want nothing more than to bundle and breathe in that frosty cold air reminding me that the warmth of the holidays has arrived. Austria delivered! 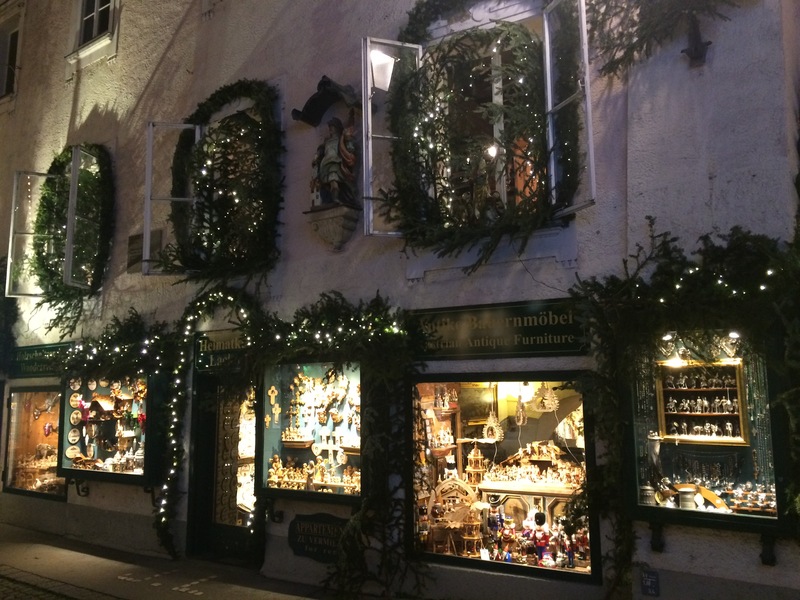 I became giddy and the Christmas spirit began to ignite as we set out to explore this festive wonderland. The concierge kindly marked several markets on our map and we bundled up and set out. 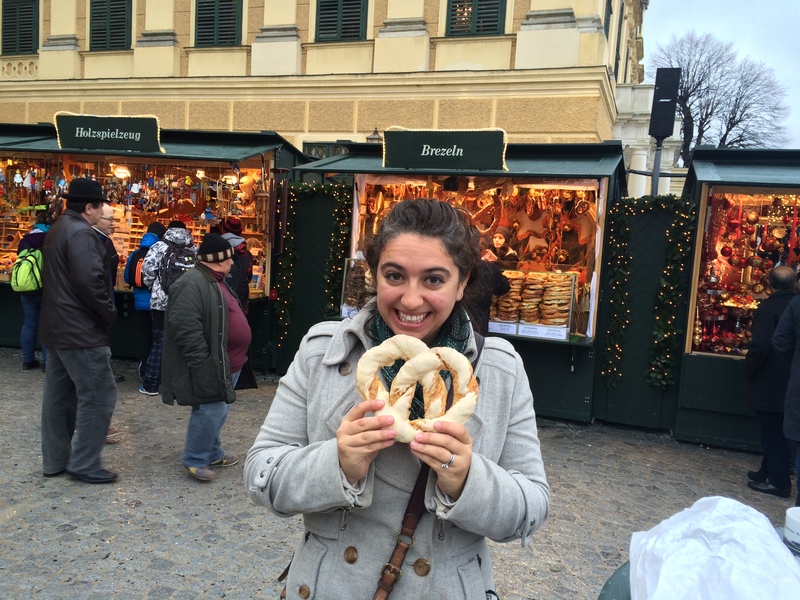 I have reflected in past posts about how I have had anxiety in the tension of being an American not fluent in Greek trying to blend in as a local in Greece – well in Austria, I had no problem being a proud tourist! We walked around, map in hand, fearlessly asking questions in English to every German speaker we needed assistance from. My confidence was back! I think I put a certain pressure on my self to blend in in Greece because we live there and also because I am Greek and thus feel as though I need to blend in better. 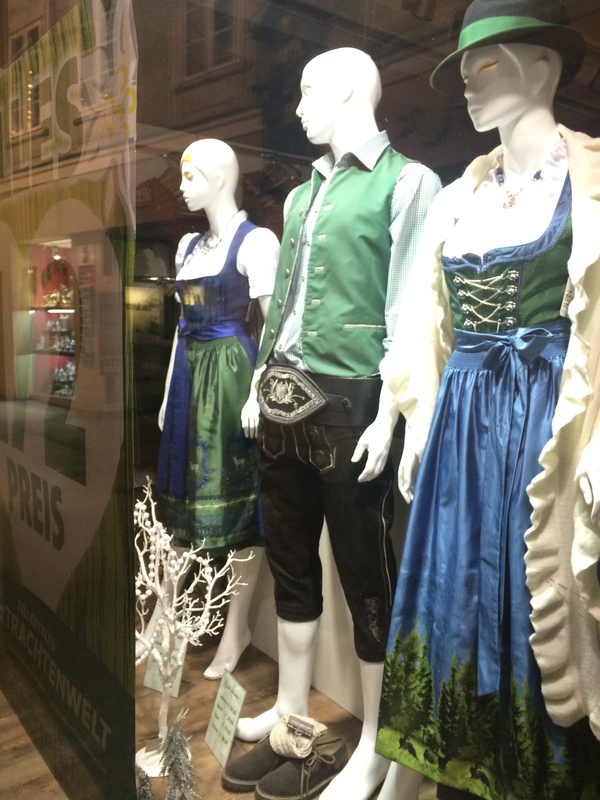 In Austria, on vacation, I am apparently just fine being an American tourist. And just about everyone there speaks English. 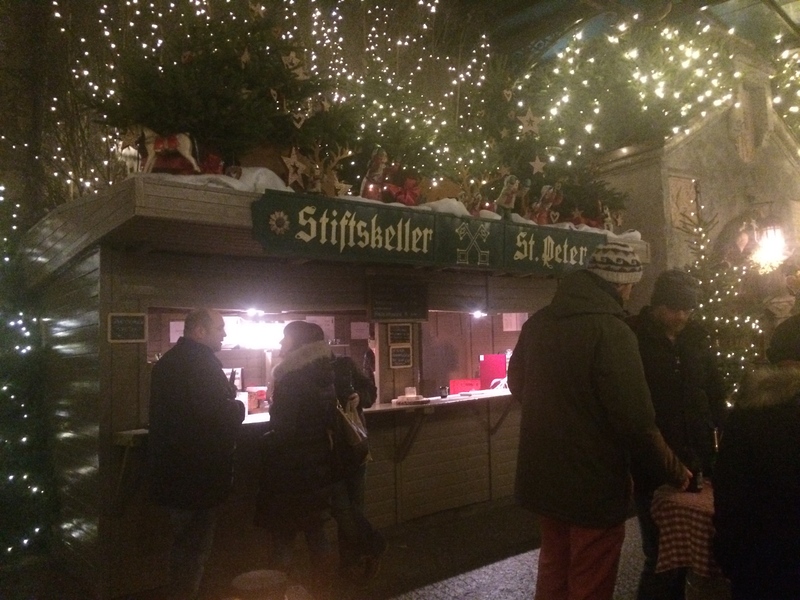 Ok ok back to the subject at hand, the Christmas markets!!! 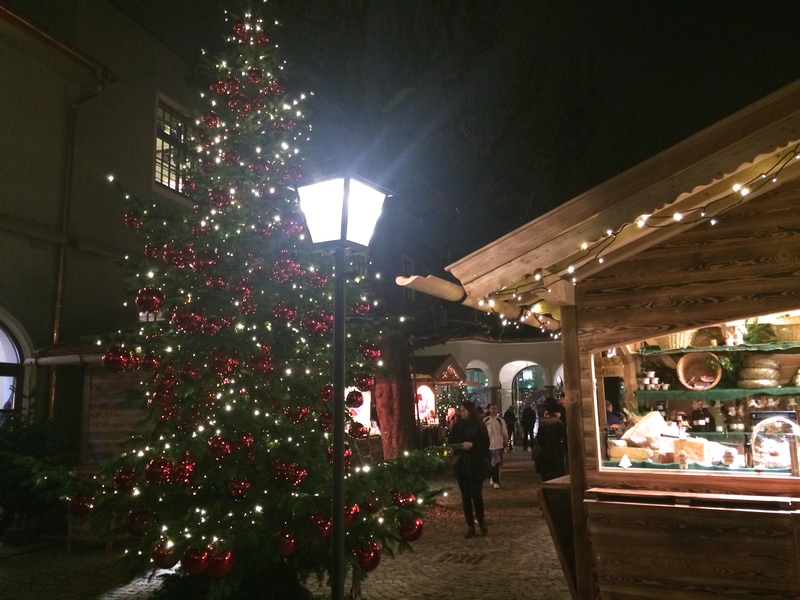 After all of the anticipation, the Christmas markets highly exceeded my expectations!!!!! 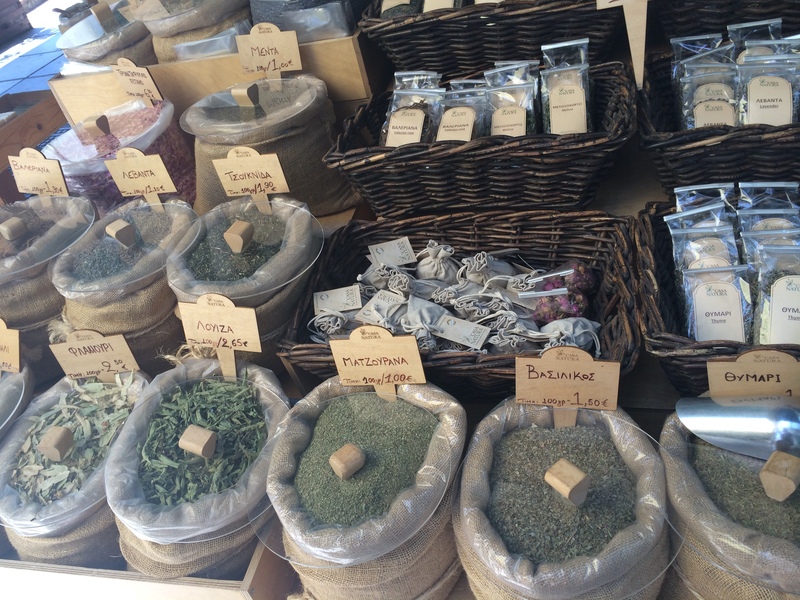 The markets are found scattered all over Austria, most commonly in the squares outside of cathedrals and palaces. 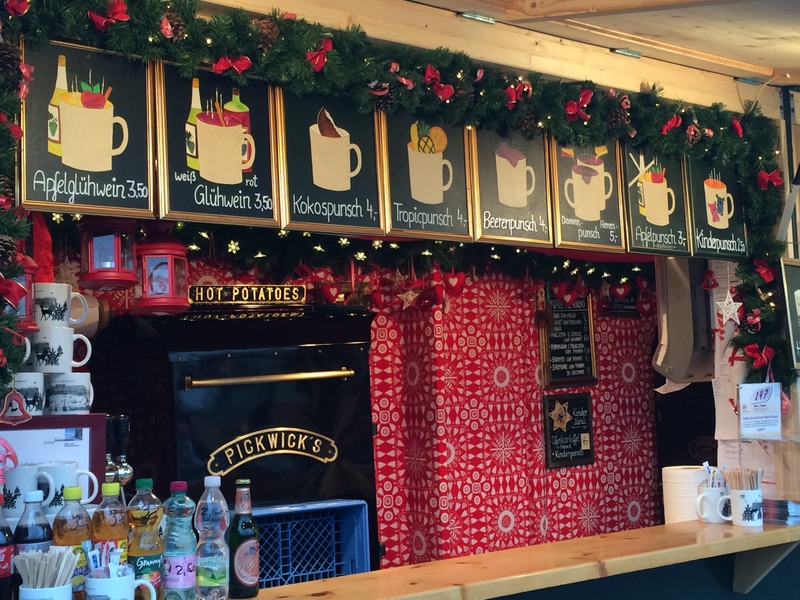 They consist of lit up booths selling hand made crafts of all types, food, and most importantly hot punsch!! 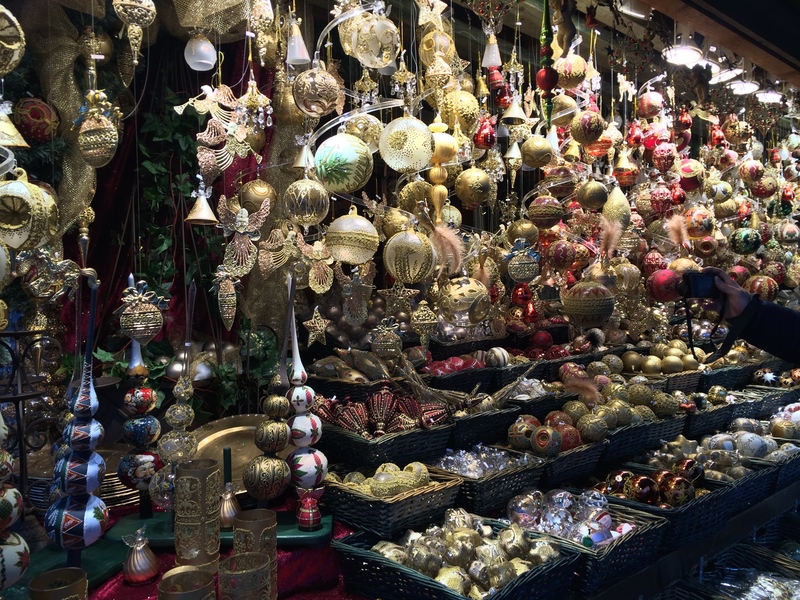 The markets are filled with clusters of decorated Christmas trees, nativity scenes, and other festive décor. 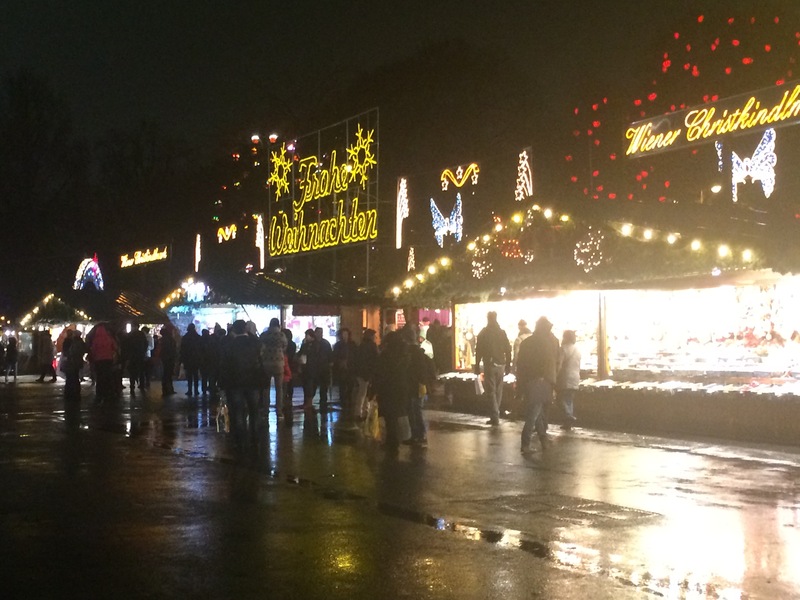 The food and drink booths emit the most heavenly smells of hot mulled beverages and freshly cooked local fare. The craft booths are surprisingly not chincy at all! Instead of being filled with useless cheap trinkets the displays are draped with hand carved wooden items, colorful woolen hats, purses, and dolls, glass blown vases and bowls, hand painted ornaments, strands of dried clove, orange, and cinnamon garland, nativity scenes in every shape and size, and other amazing works of local art. To say I was impressed is an understatement. The goods were beautiful and enticing and a pleasure simply to peruse and admire. 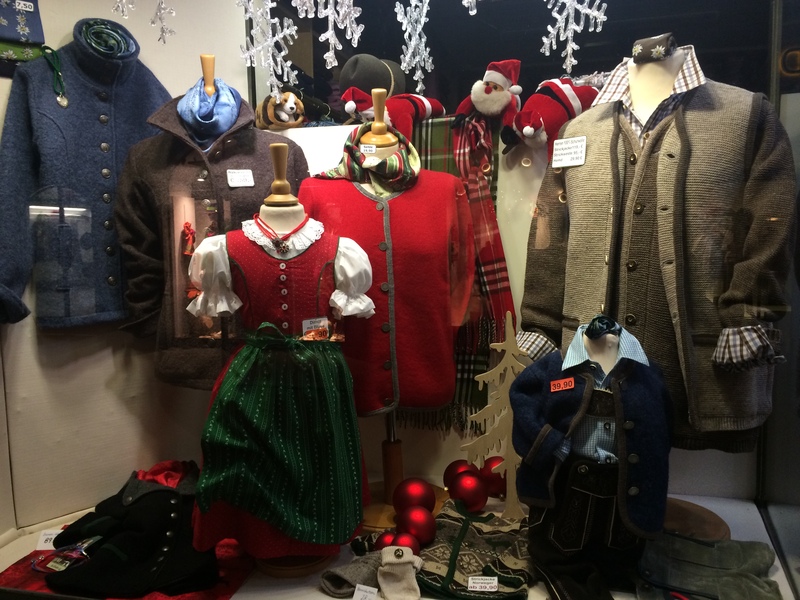 After a total of seven Christmas markets so far, I have not grown bored of “window shopping”. While there are some consistent goods sold at the different markets, each market has its own unique personality and has different products for sale. So while we have been to seven markets thus far, I am in no way tired out of exploring the spectrum of talent that these markets display. I know I sparked your interest with my mention of hot punsch didn’t I?! We had read about this Austrian delicacy prior to our arrival but did not know what exactly to expect. 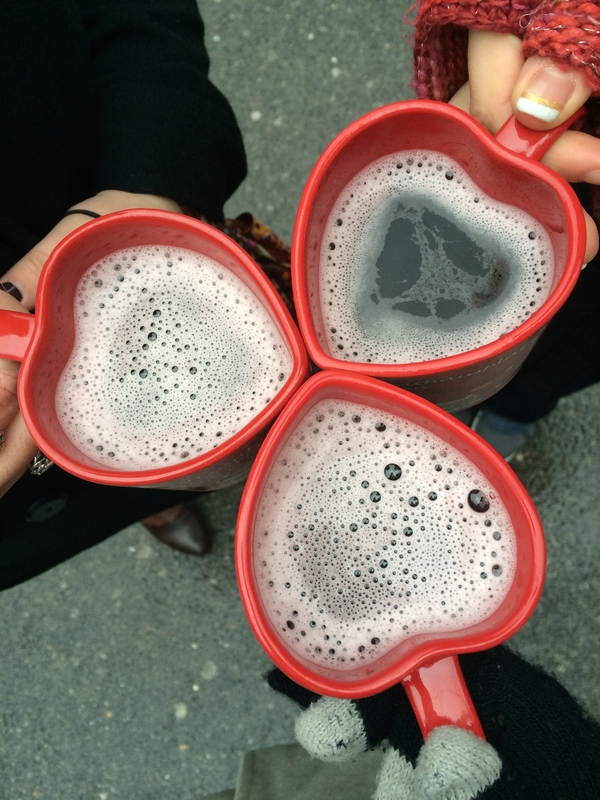 What we found were mugs full of piping hot fragrant and flavorful juices and ciders mixed with various alcoholic delights. 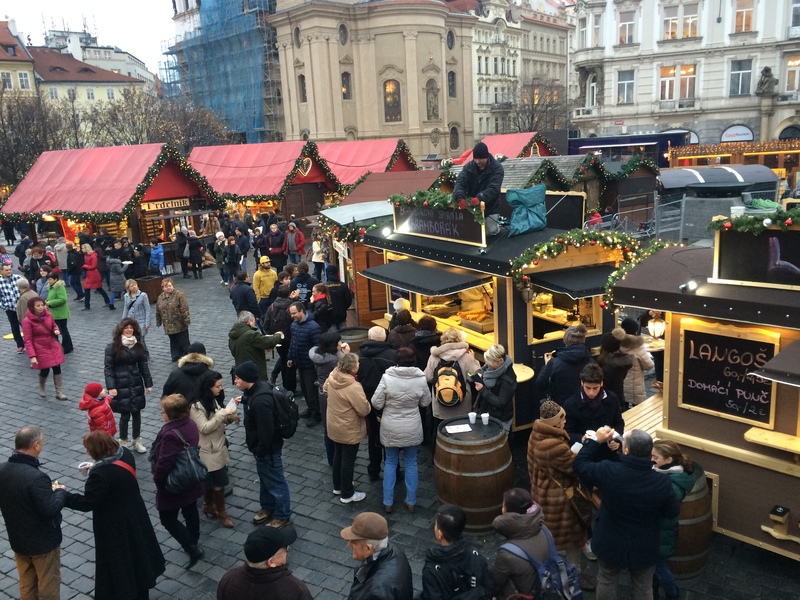 Gluewhein, known to us as hot mulled wine, is also a market specialty! 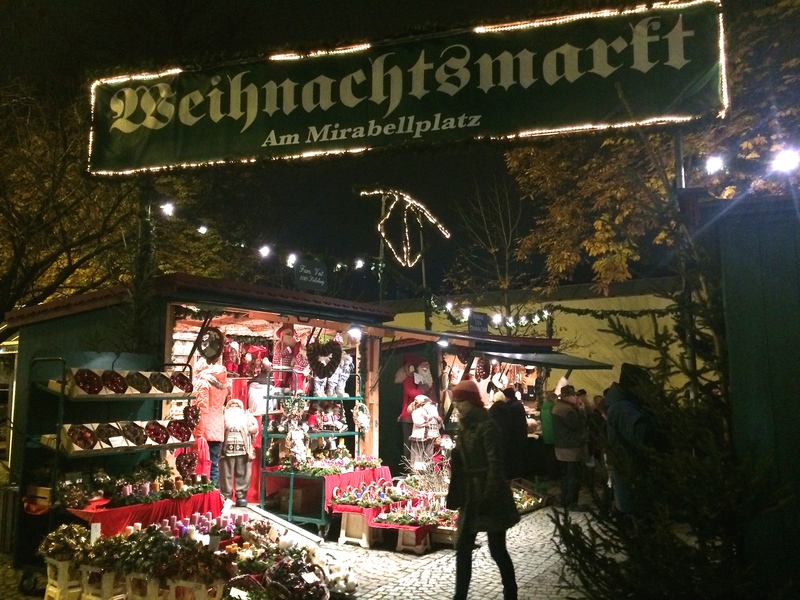 There is nothing more perfect while perusing stands of local crafts in the crisp chilly evening than sipping on a perfectly hot and spiced beverage. The alcohol of course is a warming agent in and of itself and combined with the flavors and aromas you have the perfect recipe for a wonderfully cozy experience. 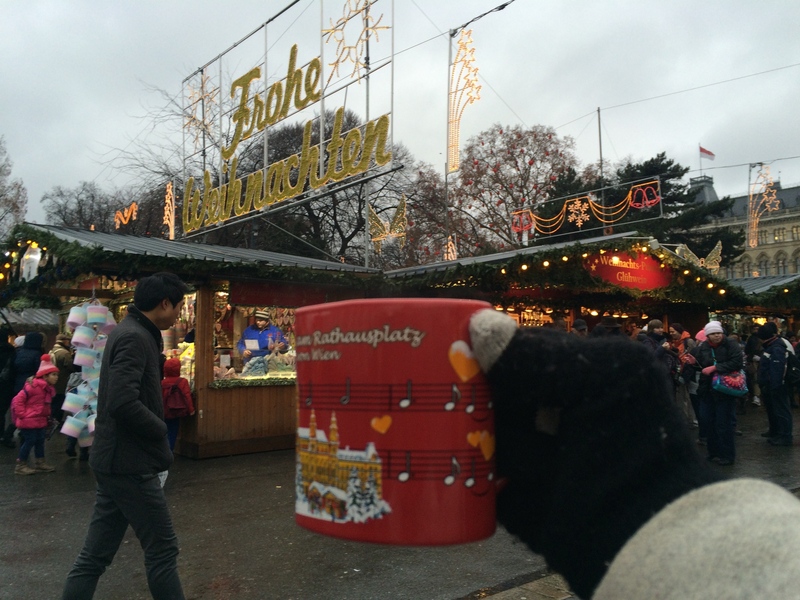 Another fantastic aspect of the punsch (yes, I am insisting on spelling it the German way), is the fact that they serve it in ceramic mugs instead of disposable cups. A hot beverage in a real cup is exponentially more enjoyable than that in a disposable cup. They charge a deposit for the mug (about three euros) and you can either keep the mug or return it and get your deposit back. This is another genius concept! Different markets have different mugs and they typically say the name of the market and have some design significant to its location on it. Michelle and I have started a nice little collection of souvenir mugs to remember our markets by!! And of course, I must mention the food stands in the markets! 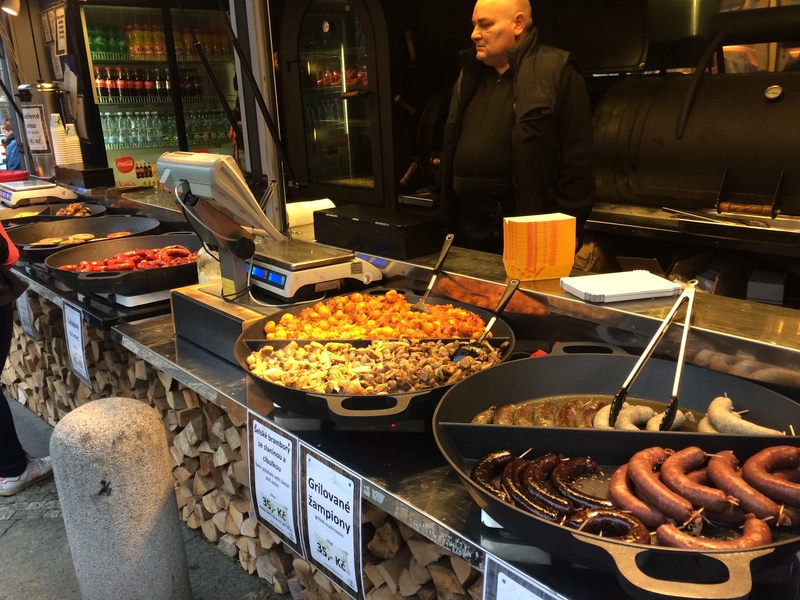 In each market there are numerous stands selling different types of local Austrian fare. 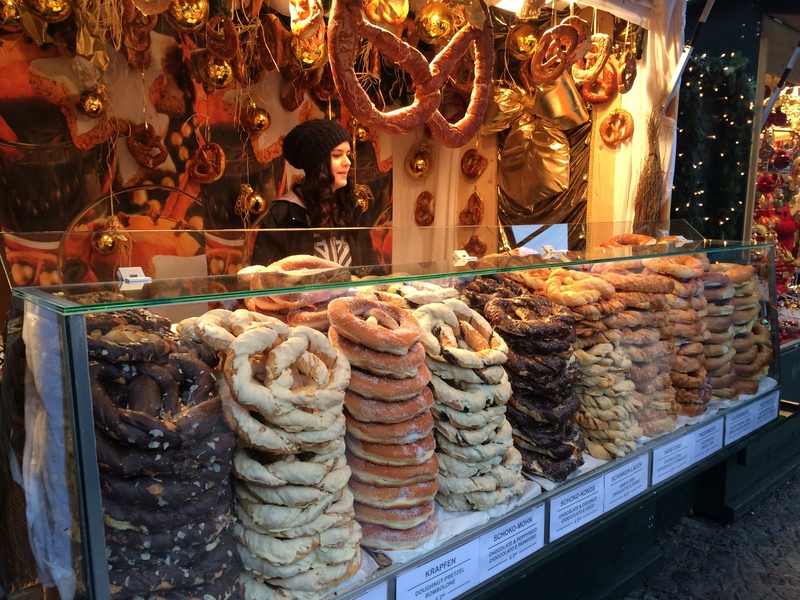 There are booths with massive soft pretzels in many different varieties both salty and sweet (Auntie Anne’s pretzels don’t come close to these masterpieces!) 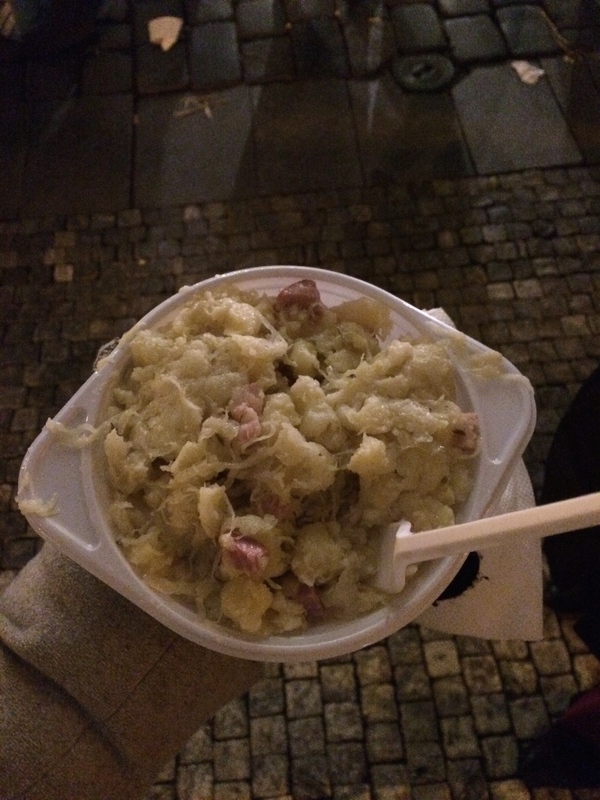 There are soup booths selling Gulasch and other native soups. 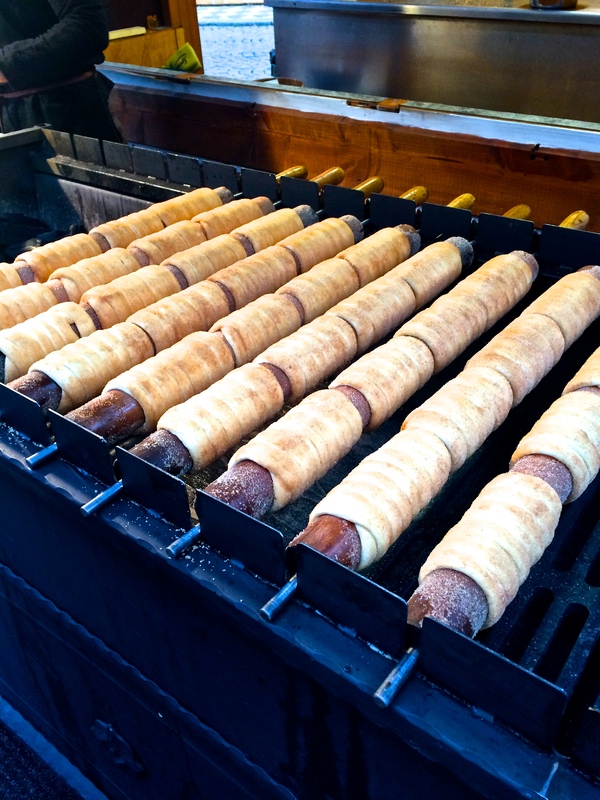 There stands selling many varieties of hand held food items like wurst (which we found out later are brotwursts…we call them brots, they call them wurst) and Langos (these big flat fried breads smothered in garlic…yes they are as amazing as they sound). 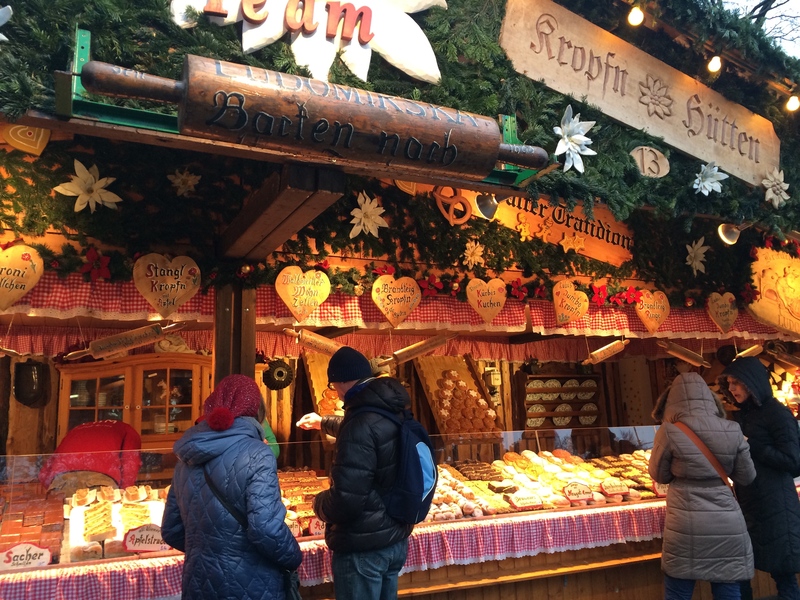 There are booths lined with sweets like snitzel and other struedals as well as chocolates, fudges, spiced nuts, and chestnuts, quite literally roasting on an open fire! The food options at the markets are plentiful to say the least. With options like these, we have found no need to go and sit at expensive restaurants; we have eaten the majority of our meals from the market stands attempting to try all of the local delicacies!! 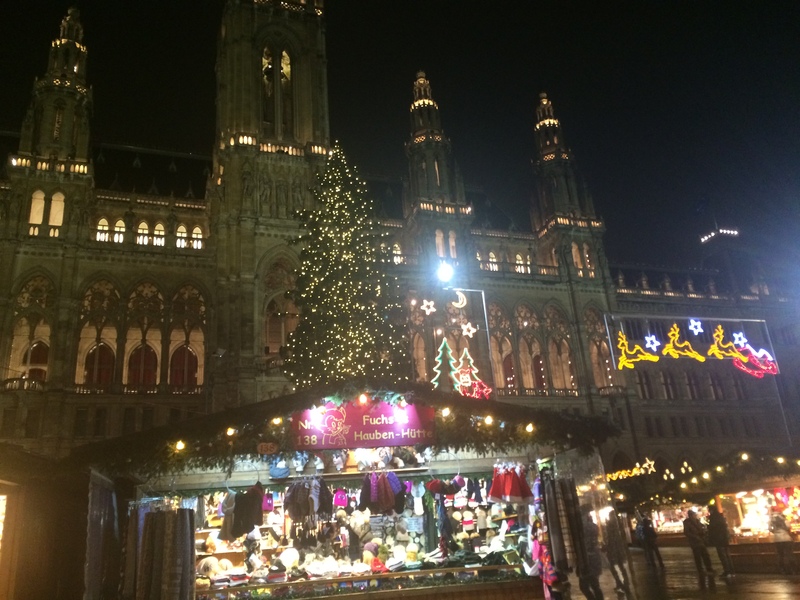 Our first night in Vienna, we visited two markets, tried our first hot punsch and had a bowl of piping hot gulash in a bread bowl as we perused and reveled in the festive splendor of Vienna. 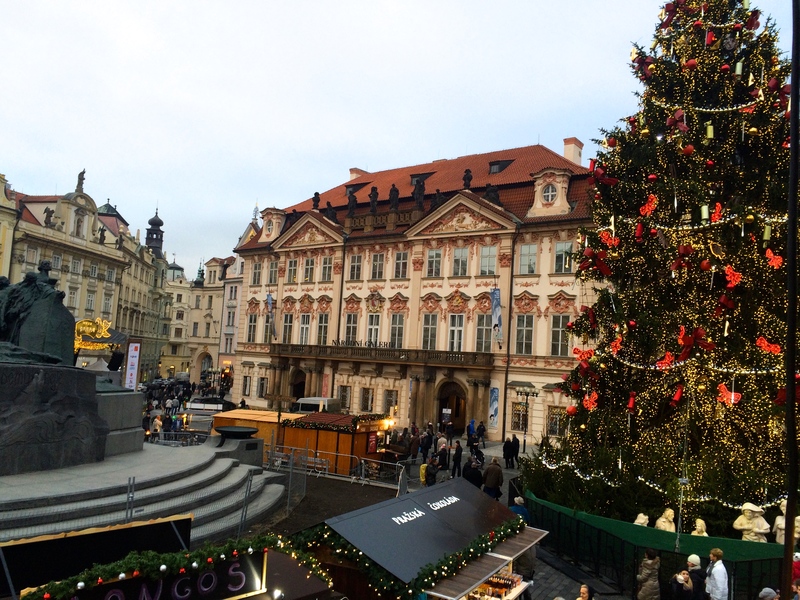 My first impressions of this city were: clean, grand, cozy, festive warmth, friendly, and joyful. While this city is modern, clean, and efficient, it is not stiff and sterile. 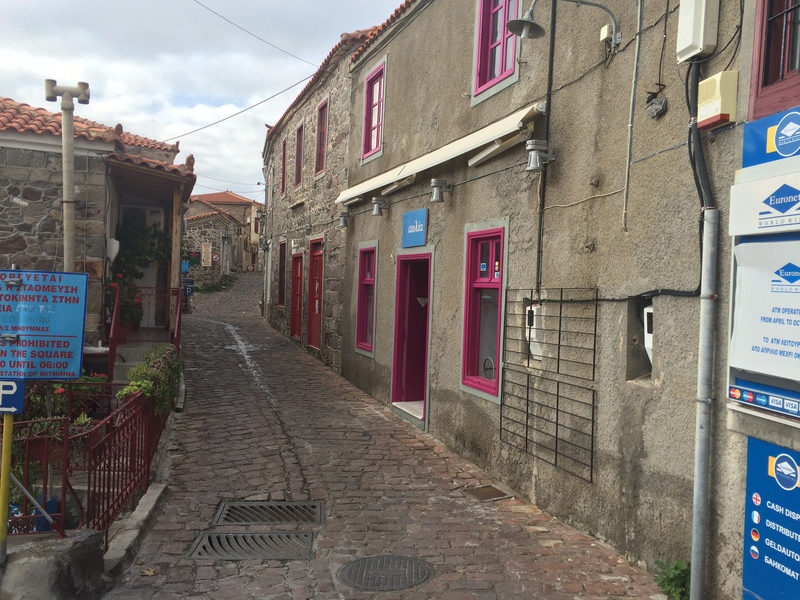 The people are very friendly, the atmosphere has an authentic joy about it. The city is adorned in festive décor, which creates a cozy warmth, and the buildings are beautiful and updated while still maintaining their old charm, intricate designs, and historical integrity. 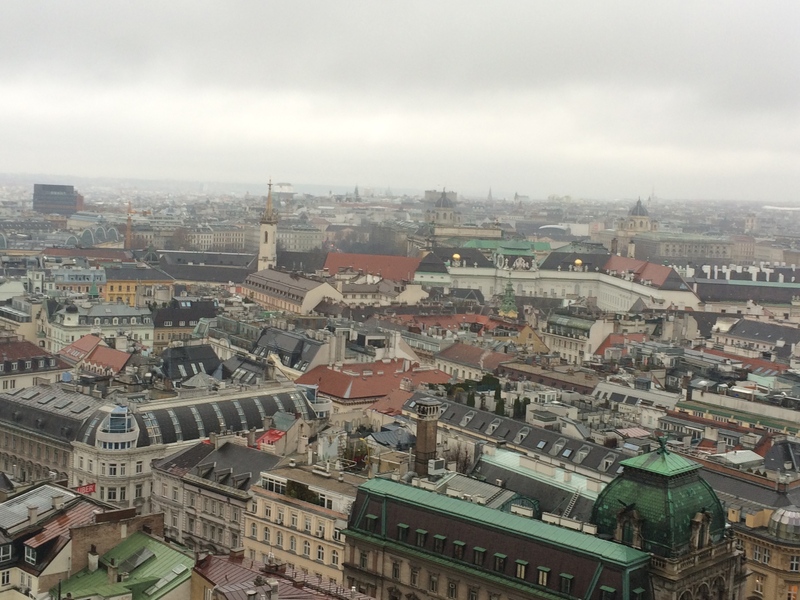 We fell asleep in our glorious hotel room extremely pleased by our first impressions of Vienna. 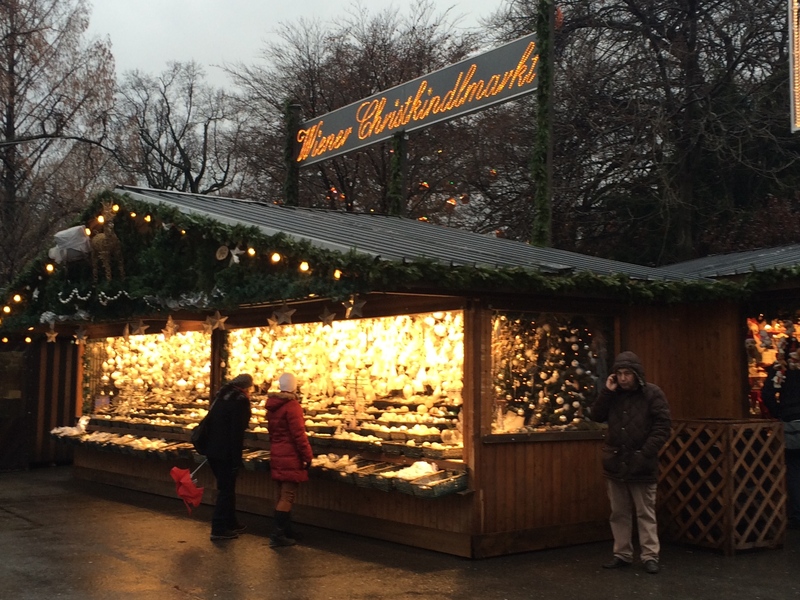 Our first glance of the christmas market! We woke up the next morning eager to hit this town running! And to meet up with our friend Tina!!! Tina was my roommate in Boston for two years but she moved back to California a year ago and I haven’t seen her since she moved! Michelle, Tina, and I all went to CrossRoad together almost 10 years ago and have maintained wonderful friendship ever since! I was SO excited to see my roomie! We arranged where and when we were going to meet and Michelle and I planned out our plan of attack prior to our meeting time. 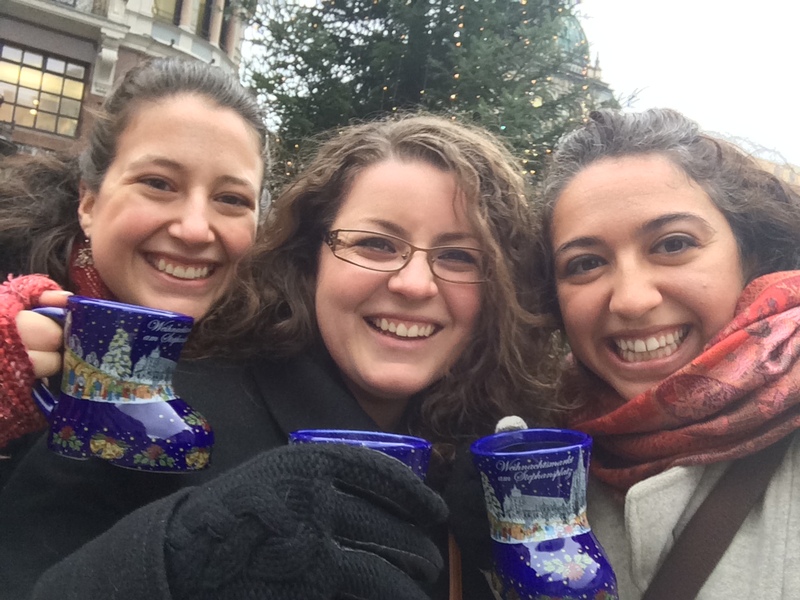 Michelle’s friend tipped us off to an incredible find, the Rick Steves Audio Europe App! Rick Steves has a free app for smart phones where you can download various tours for cities all over Europe and then listen to them on your phone while you physically tour the sites. These tours are free and you don’t need any kind of data or wifi to listen to them once they are downloaded! I am SO happy we learned about this app! 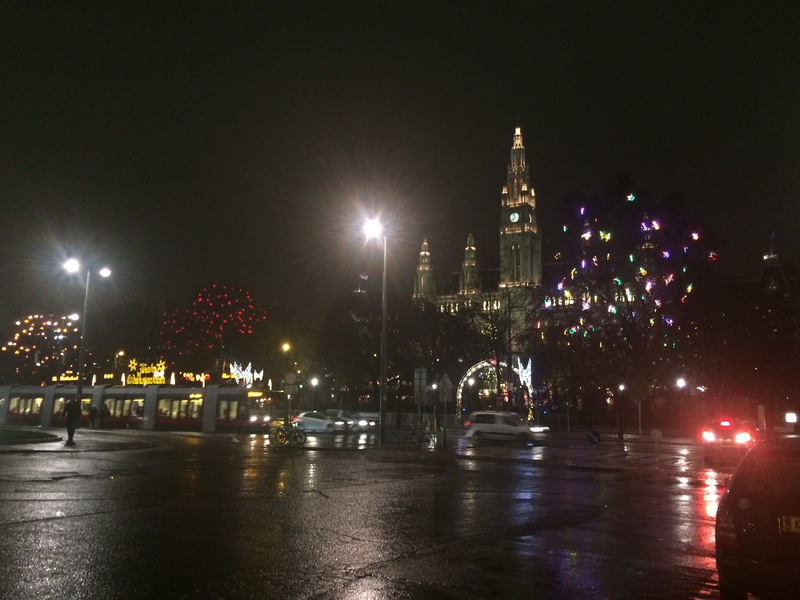 There is a tram that goes in a ring around Vienna hitting many of the most prominent things to see in the city. Rick Steves has a tram tour which allows you to sit in the comfort of the tram “rubbing shoulders with the locals” looking out the windows while listening to his fascinating commentary on the history and interesting facts about the city. I highly recommend this app to anyone traveling to Europe! 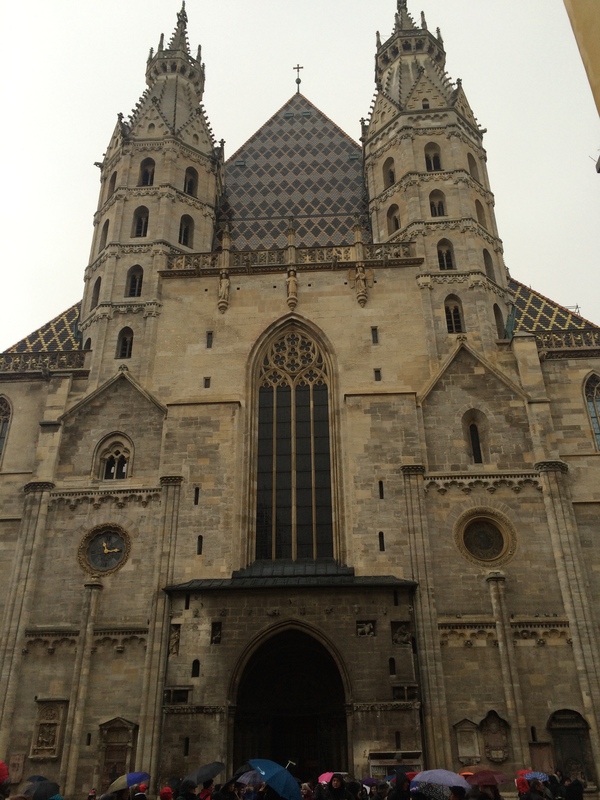 We took the tram tour and got a great overview of Vienna. 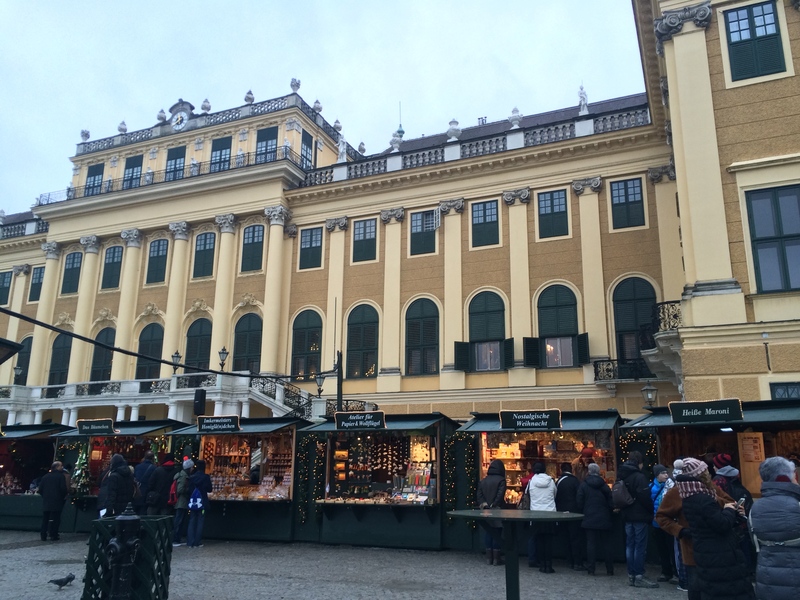 We got off the tram near the Hapsburg Palace and selected Rick Steve’s more in depth tour about the palace complex learning about the fascinating time in Austria’s history during the reign of the Hapsburg Emperors and when this dynasty came to an end. It is so interesting to learn the history of this tiny country and how it fits in to the limited history I know about the rest of the world. 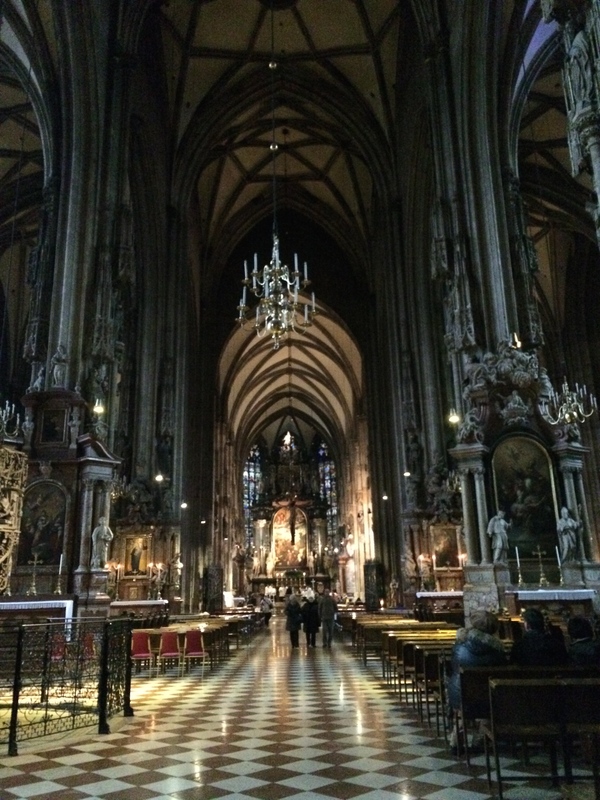 We then made our way from the outer ring to the very center of Vienna where the magnificent St. Stephen’s Cathedral stands. 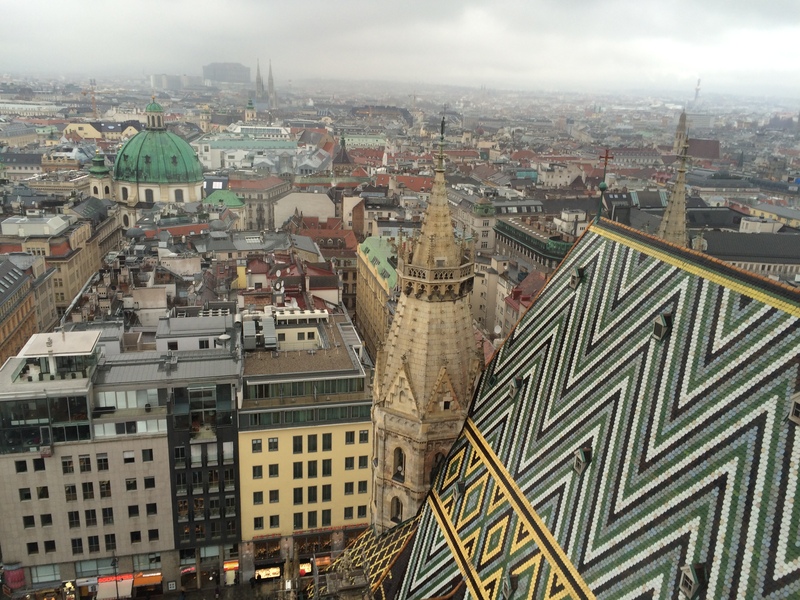 We toured the intricate gothic architecture both inside and out and then made our way up climbing the tiny windy staircase high up the spire to enjoy remarkable views of Vienna. 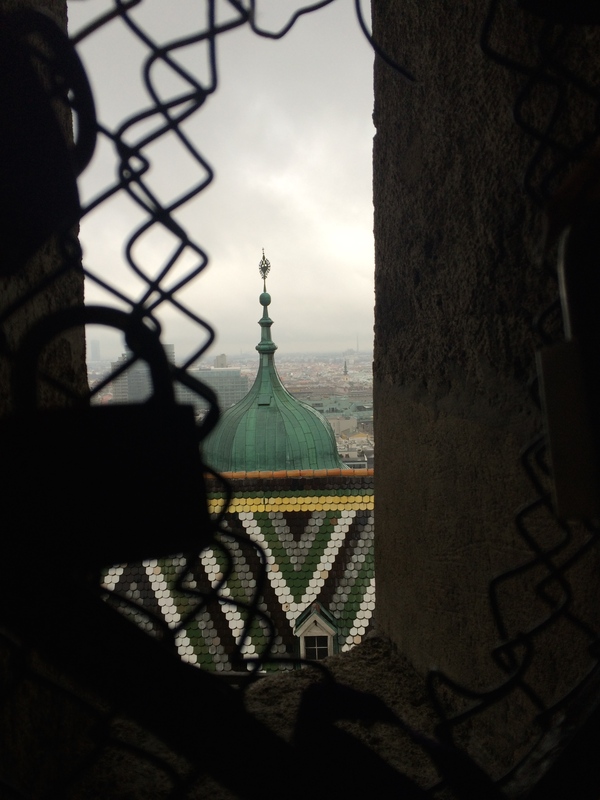 We looked over the colorful buildings and prominent green copper domes. What a grand and majestic cathedral! Made it to the top! notice the beautiful roof! After exploring the cathedral we finally got to meet up with Tina! We found her in no time and repeatedly pinched ourselves not quite believing that we were all together in Vienna of all places!!!! 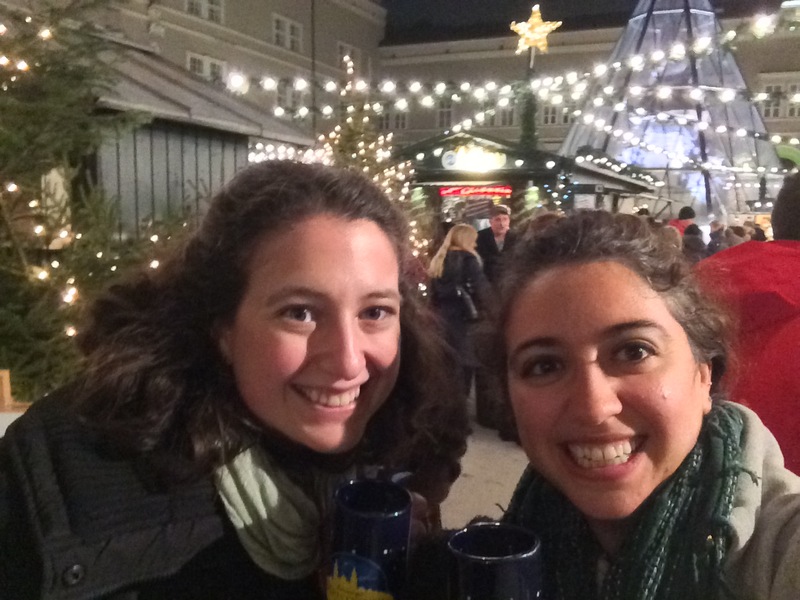 For the next several hours we perused Christmas markets, drank mulled wine, and caught up on each other’s lives!! It was a lovely afternoon! 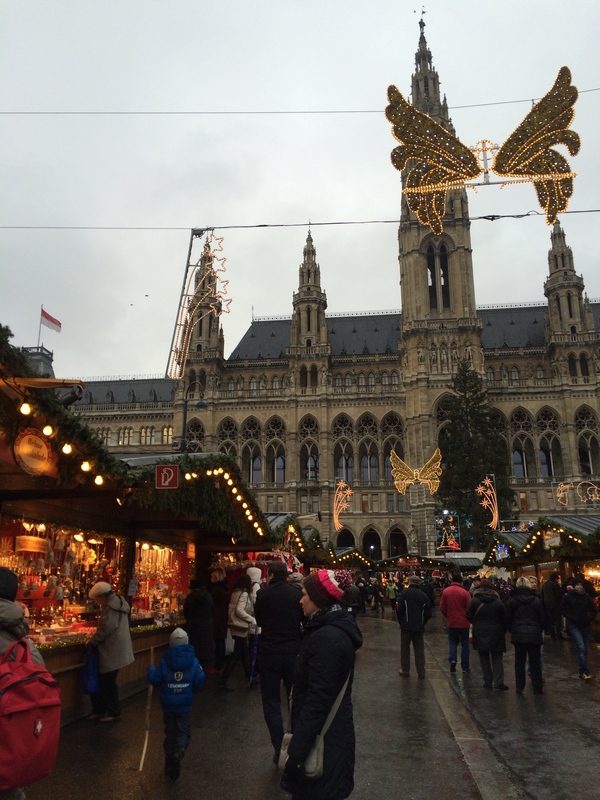 We ended at the biggest Christmas market in Vienna outside of city hall. On the main floor of city hall they had various children’s activities taking place as well as a variety of gorgeous nativity scenes on display. In the gardens on either side of the market the big trees were adorned with lit up objects each tree having its own theme. There were other festive displays scattered all over the front lawn of city hall and there was a huge lit up Christmas tree in the center of the market! A little while later Tina had to meet back up with her tour group and so we said our sad farewells! 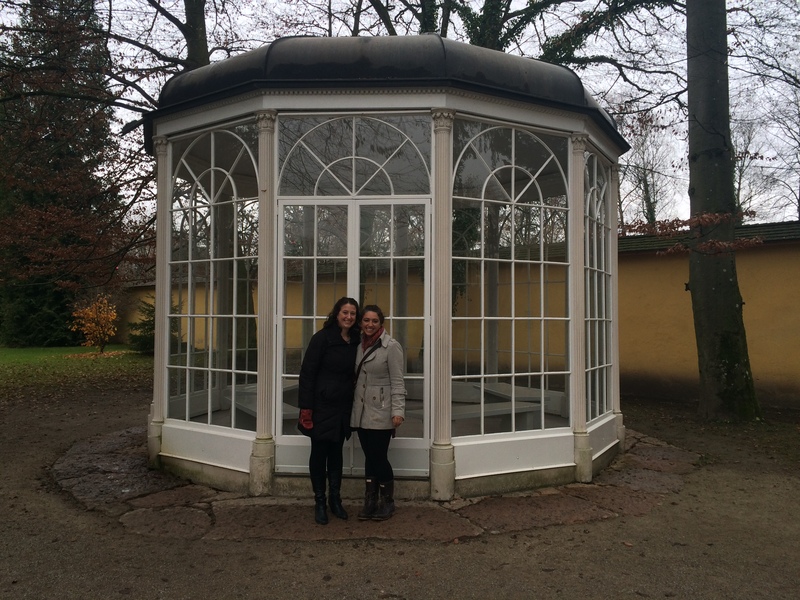 I’m so thankful for these several hours catching up and exploring Vienna with Tina! So fun to be with Tina! 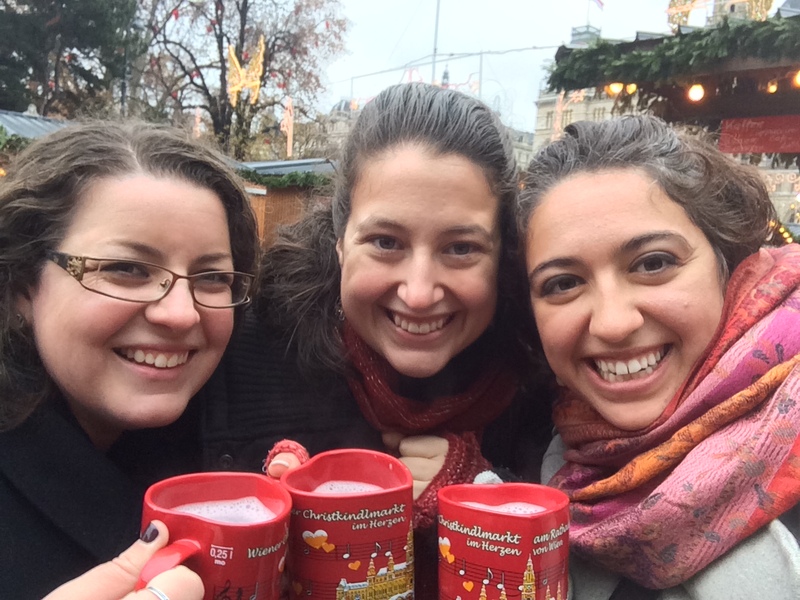 cheers to you christmas markets! Langos smothered in fresh garlic, soooo yummy! Michelle and I finished our tram tour and then went back to the hotel to get ready for our dinner and classical concert! 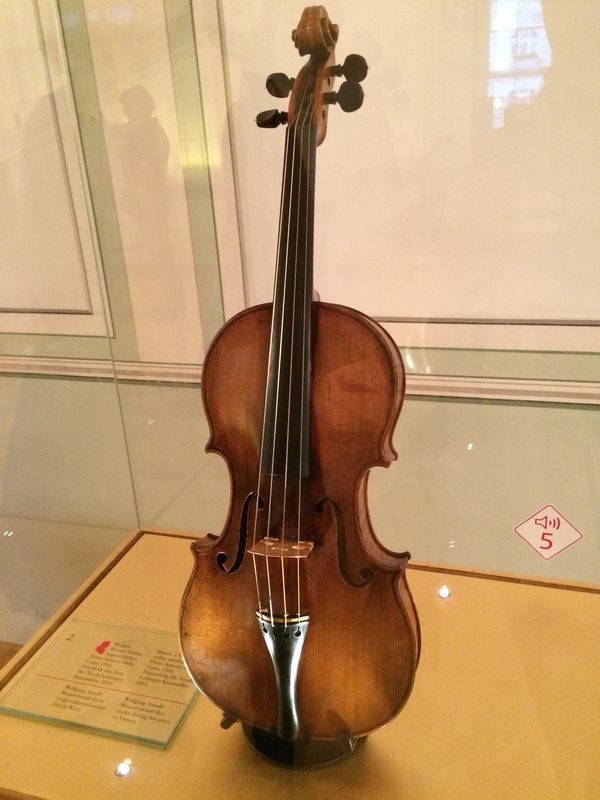 Austria is the home to many renowned classical musicians most notably Mozart and Strauss. 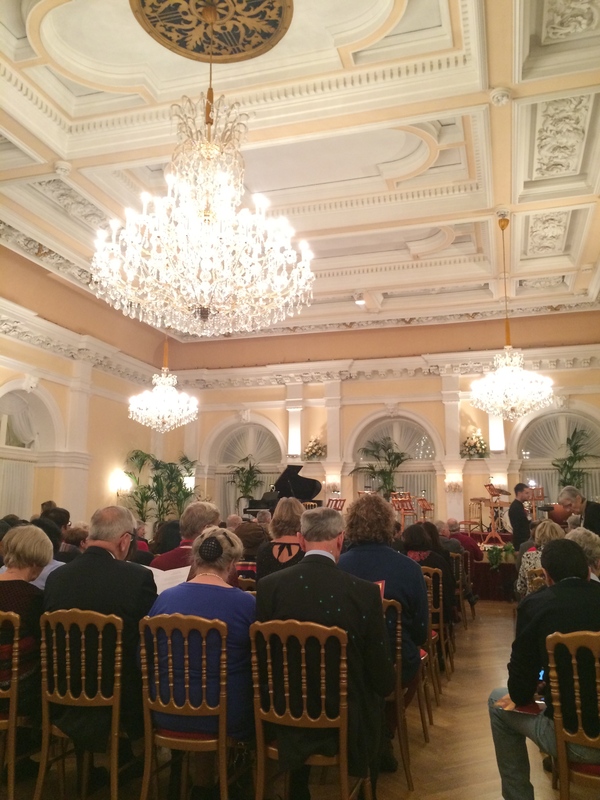 As a result, the city offers frequent high quality classical concerts in many of their incredible venues. 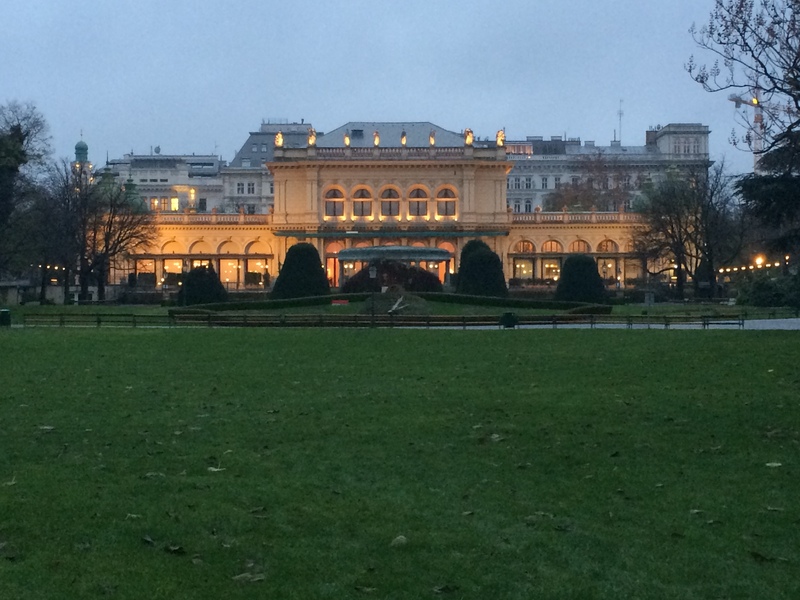 Our concert was held at the Kursalon where Johann Strauss used to hold many grand balls and perform many concerts. 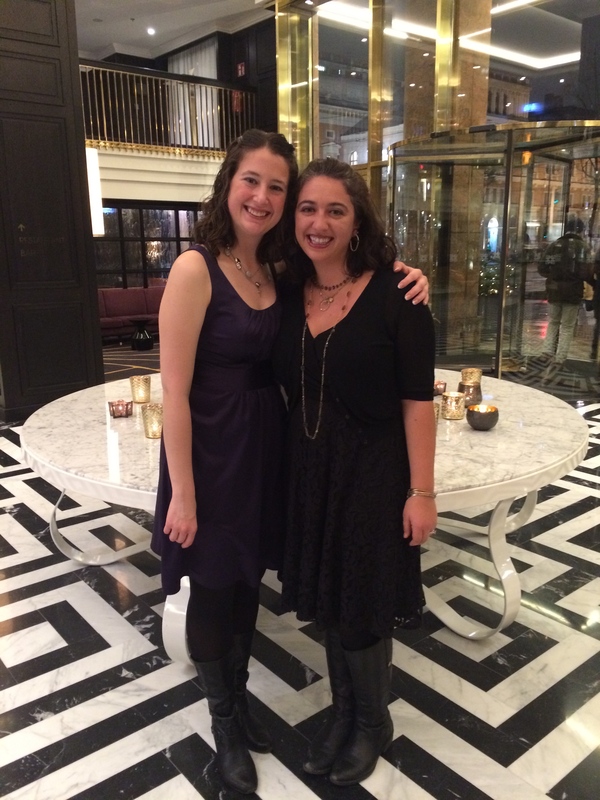 We chose a dinner and concert package and so we enjoyed a phenomenal dinner in the venue’s restaurant before our show. The concert itself was beyond impressive. 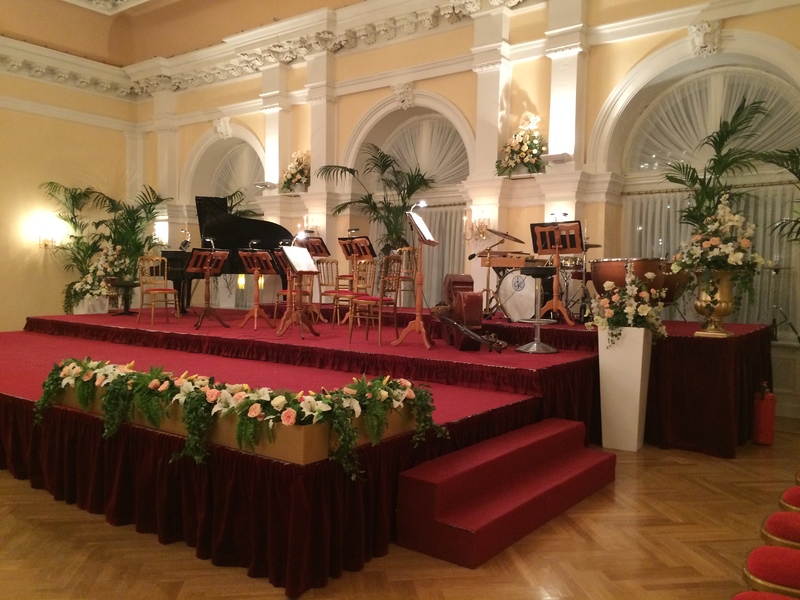 There was a nine-piece ensemble that played many pieces by both Mozart and Strauss in an intimate and ornately decorated concert hall. The musicians were extremely talented. Opera singers and ballet dancers accompanied many of the pieces. 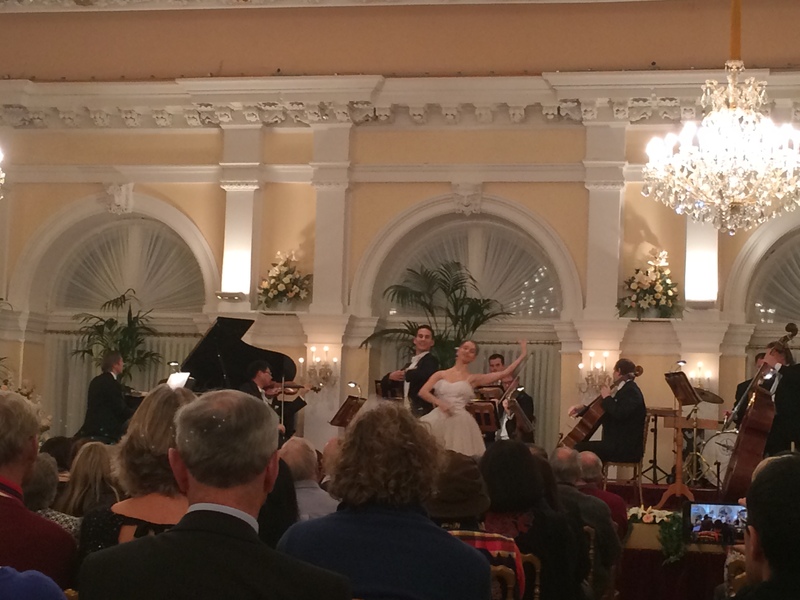 It was a beautiful collection of classical pieces and made for lovely and enjoyable evening! It was so moving to hear these classic works of musical genius in one of the original spaces where they were performed!! 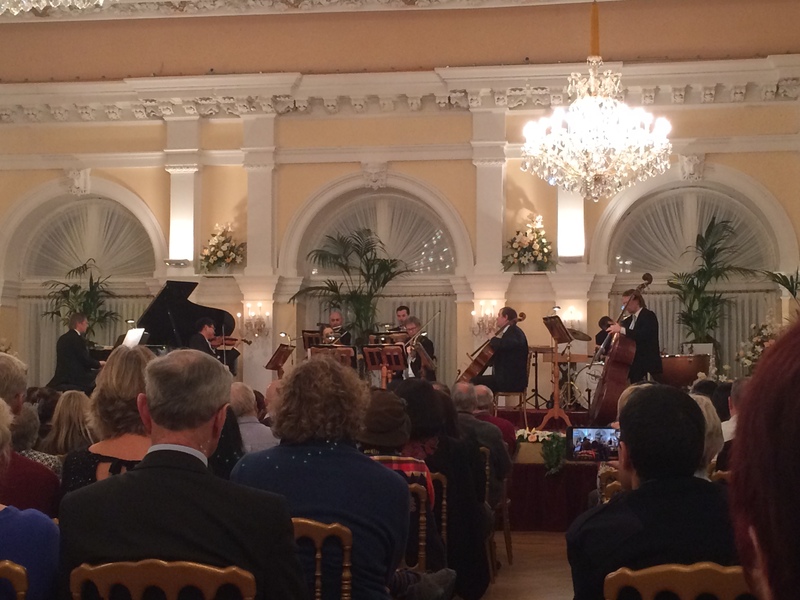 Austria is a major center of classical music it was so exciting to partake in this cultural tradition. 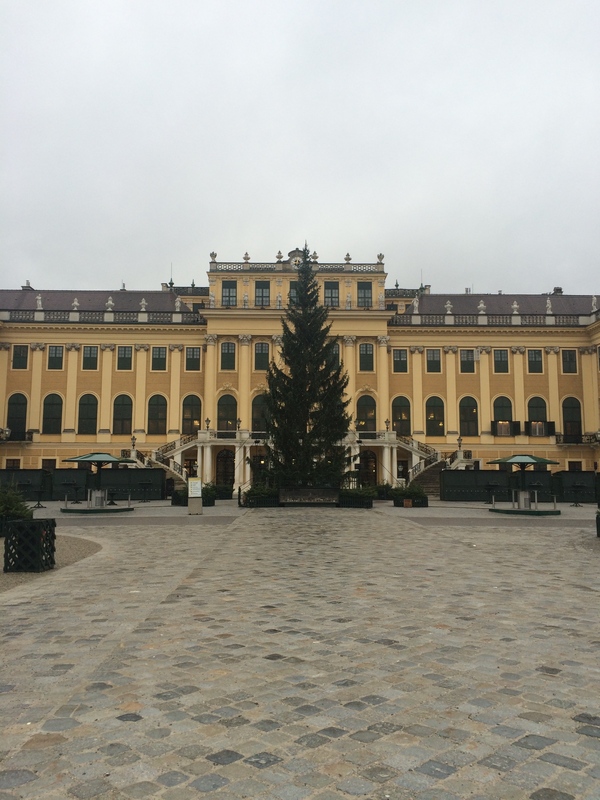 The following morning we got up early, packed all of our things, and headed to the Schobrunner palace where we were planning to spend the morning touring the palace and the Christmas market out front of the palace before getting on our train to Salzburg. We managed to lug our suitcases successfully by public transit out to the palace. 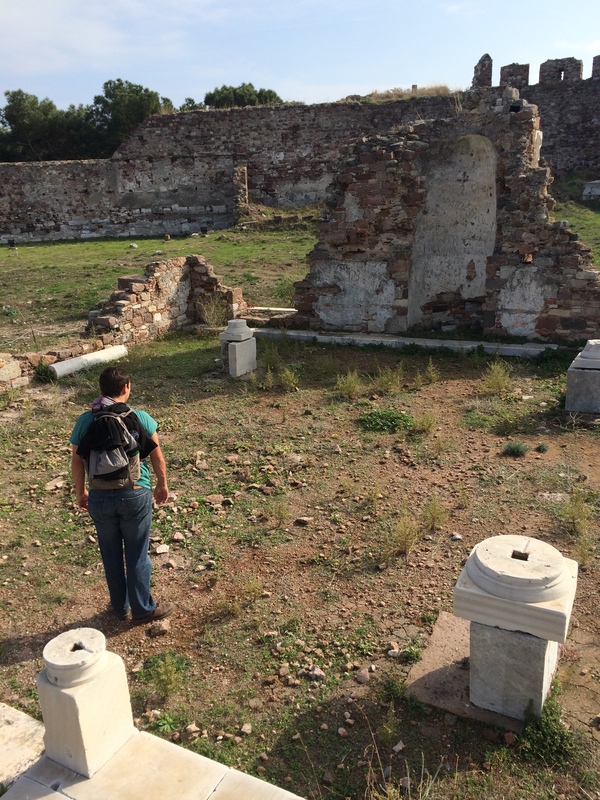 Thankfully, the kind workers of the palace agreed to store our bags so we could tour freely! 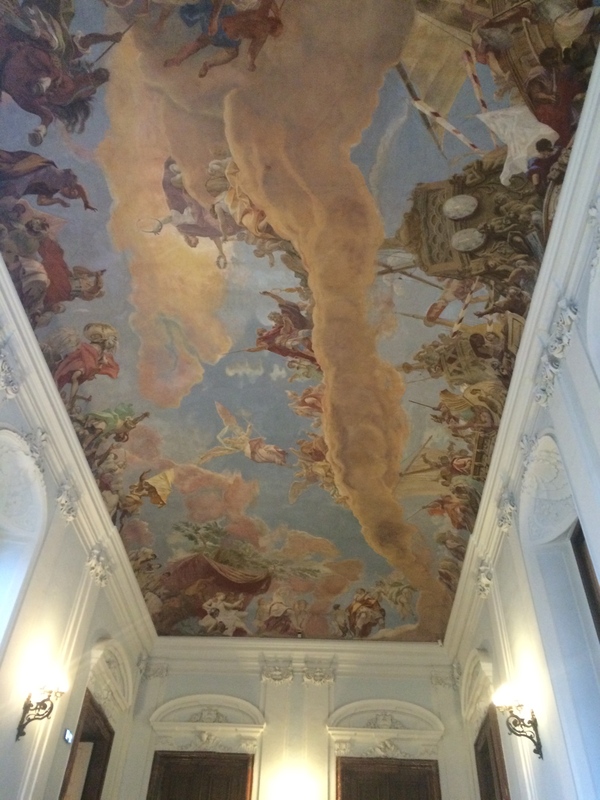 We purchased the Grand tour tickets that would allow us to tour 40 different rooms of the palace with an audio guide. 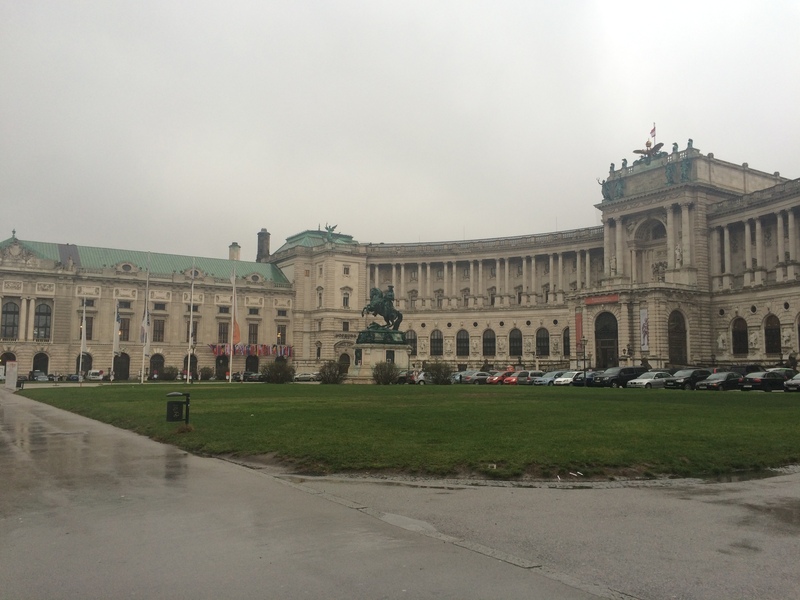 This palace was the summer companion to the palace we toured in the center of Vienna. 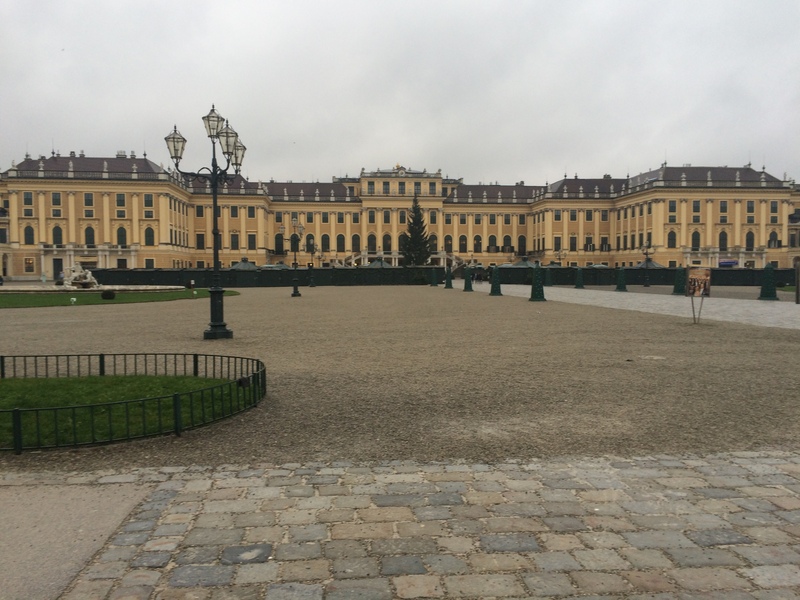 It was the Hapsburg’s summer palace… I can’t even fathom how one family owns two unbelievably large palaces or what it must have been like to grow up in these palaces!!! 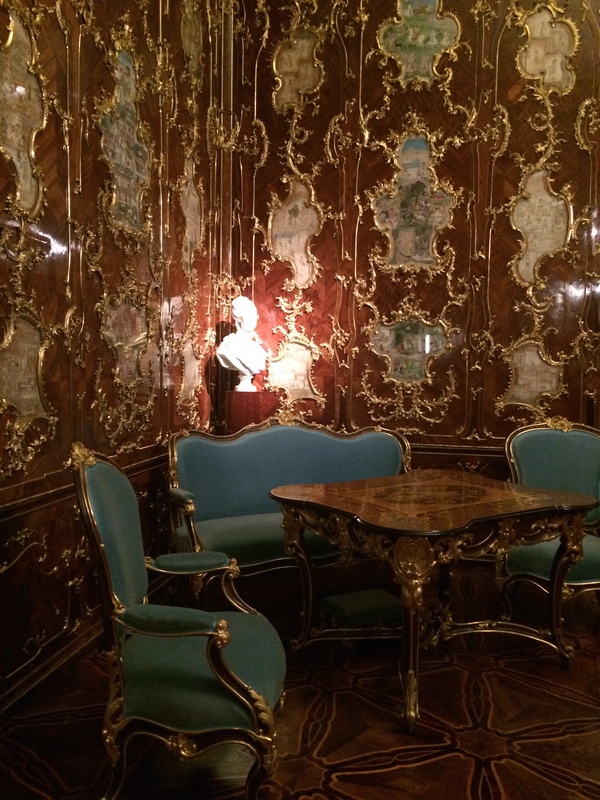 We toured through the incredibly ornate and beautifully preserved rooms of the palace. The 40 rooms we toured of course only scratched a small surface on the entirety of the palace. 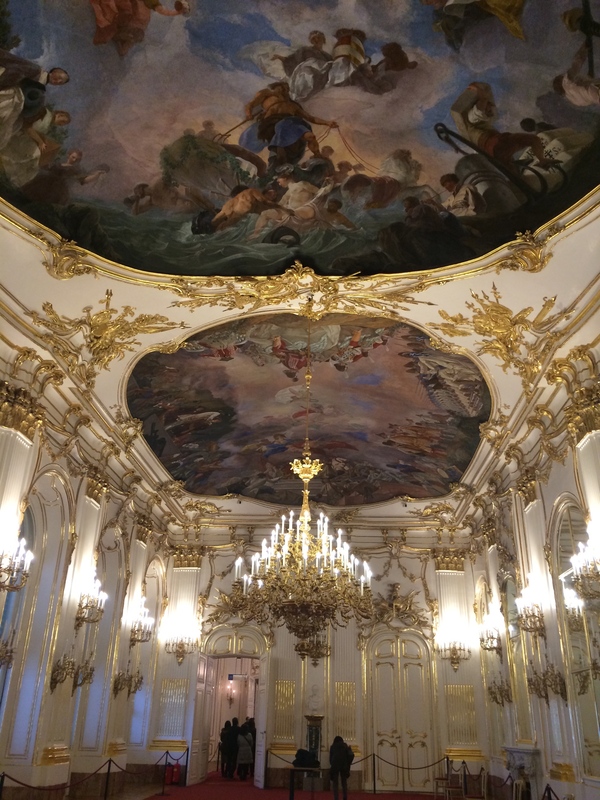 It was fascinating to learn more about the Hapsburg dynasty and the royal and political history of Austria and I was in awe of the intricacies of the different designs in each room. 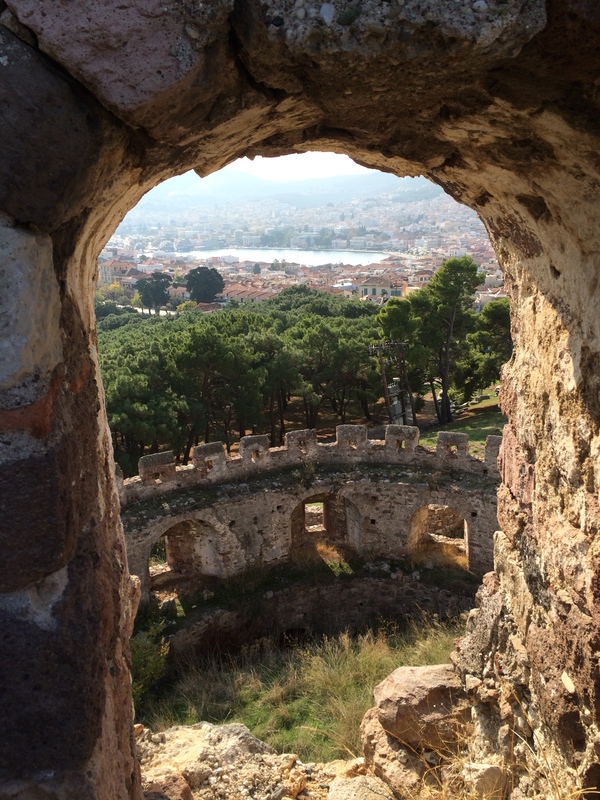 After our interior tour, we walked around vast grounds and made our way to the top of a hill where there stood beautiful huge arches and where we enjoyed a wonderful view of the palace. loving every moment of the markets! 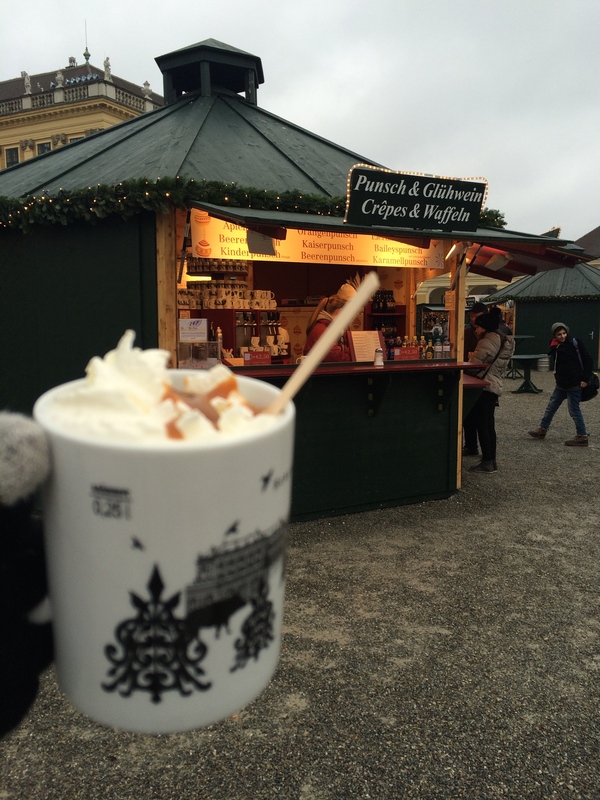 After touring the palace we made our way to our fifth Christmas market, perused the stalls, enjoyed caramel punsch, had a massive apple pretzel, and bought some spiced nuts for our train ride! We made it to the train station and boarded our train a little sad to leave this city we had come to love so dearly, but extremely excited for our next stop: Salzburg, the home of The Sound of Music and the birthplace of Mozart!!! 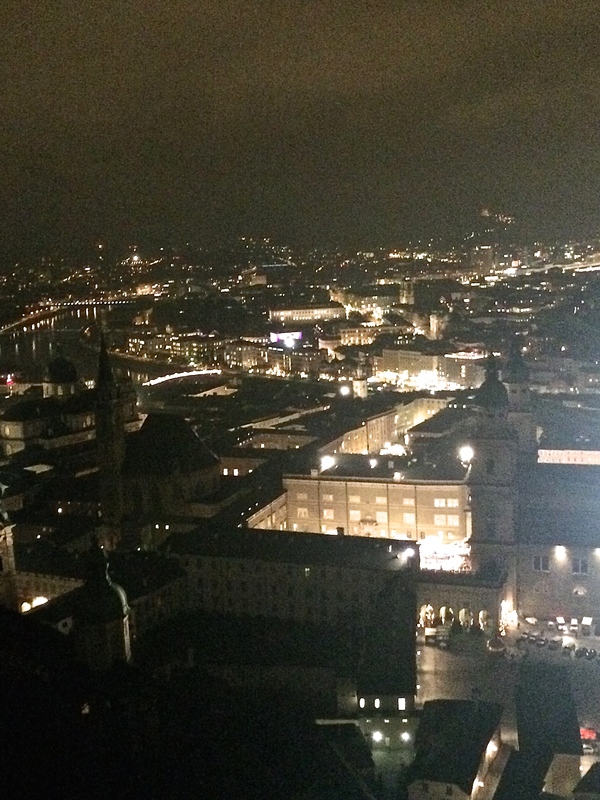 I have written way too much for one day… stay tuned for our adventures in Salzburg. 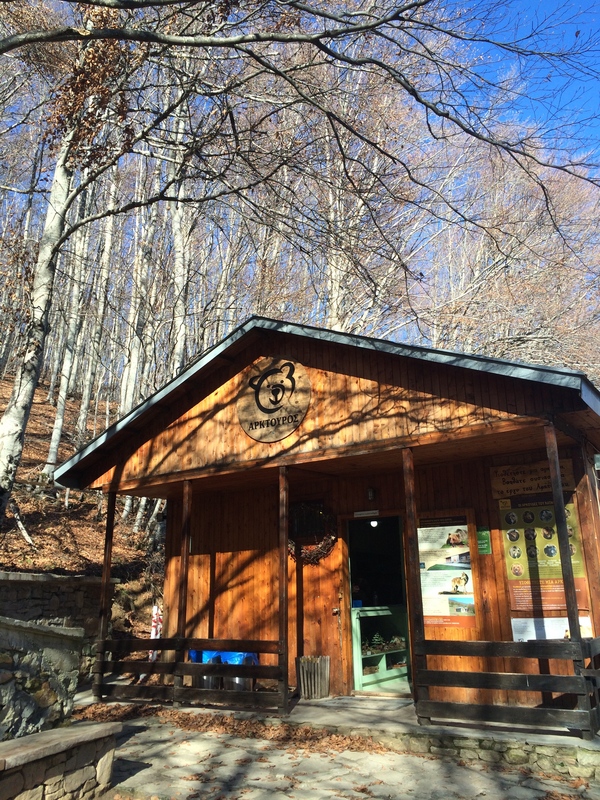 Escaping to a mountain village…with bears! While I have been enjoying every minute of our time in Greece, there have of course been aspects of America that I have missed. During the fall and winter I especially have been missing Vermont. Vermont has been my weekend getaway for the past 5 years. Only a three-hour drive from Boston, I have so enjoyed retreating to this woodsy cozy state to visit my family especially during the fall and winter. 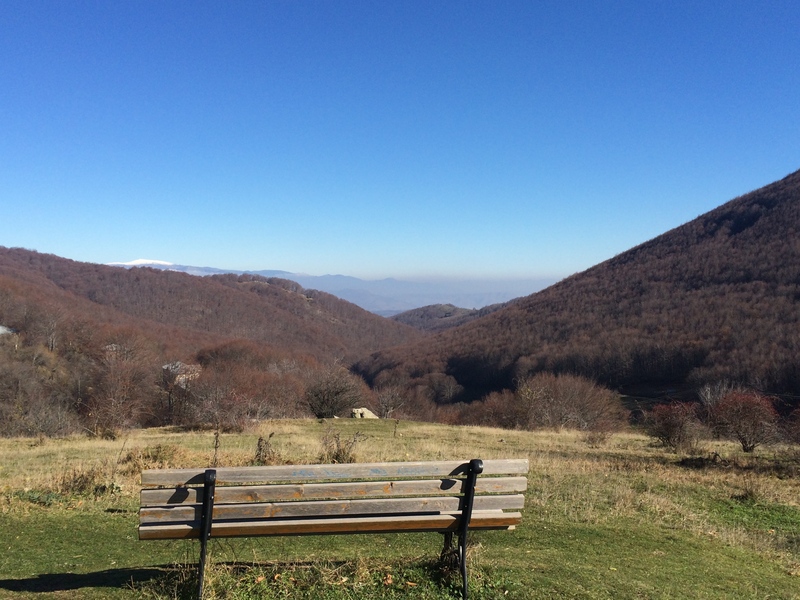 It is so refreshing to drive out of the busy city into the refuge of the rolling forested hills. I love trading the congested paved roads for the deserted dirt roads on an occasional weekend. I love being welcomed by the smell of wood-burning stoves, the smell of a crisp fall or winter day, and beautiful scenery everywhere your eyes turn. 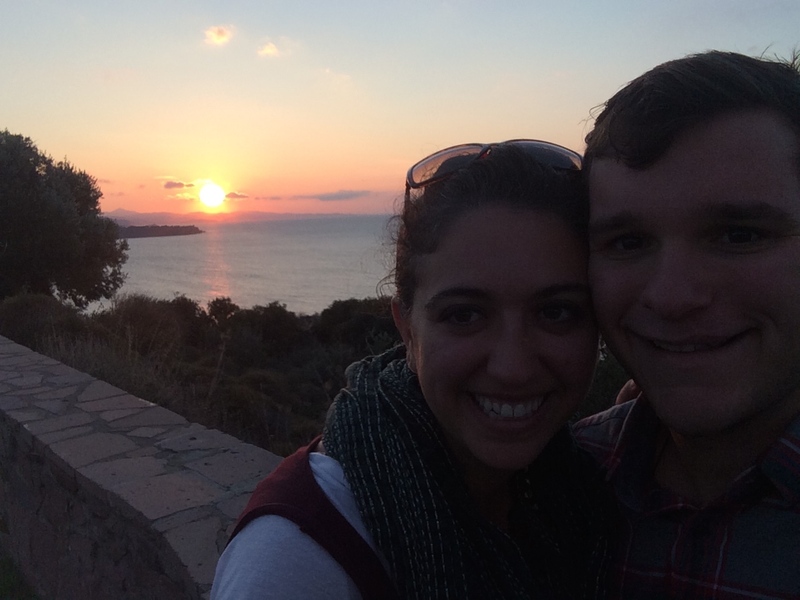 Yes, this is the experience I have been missing, and I am happy to report that we have found our Vermont in Greece! 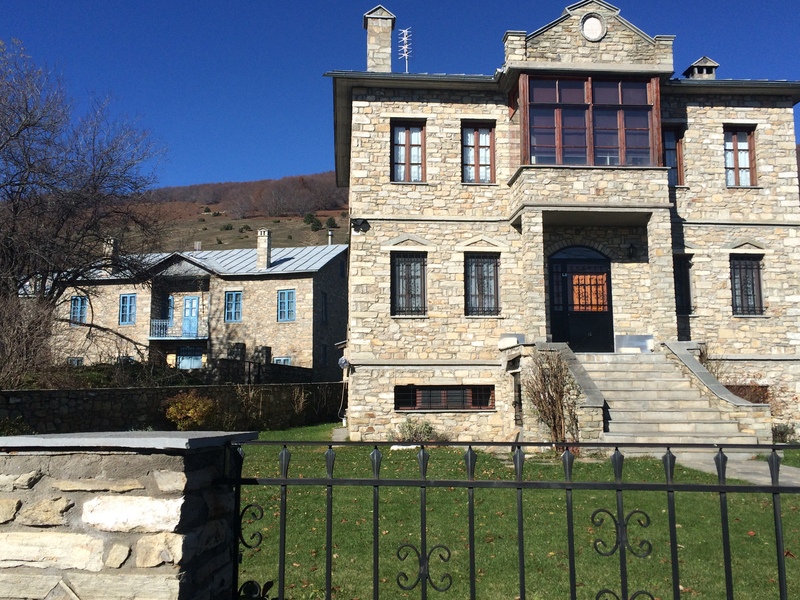 A couple weeks ago Mikey’s Greek class was reading an excerpt about a brown bear preservation organization in a beautiful mountain town not far from Thessaloniki. It peaked his interest and he asked his teacher about it. She gave him raving reviews and encouraged us to go. 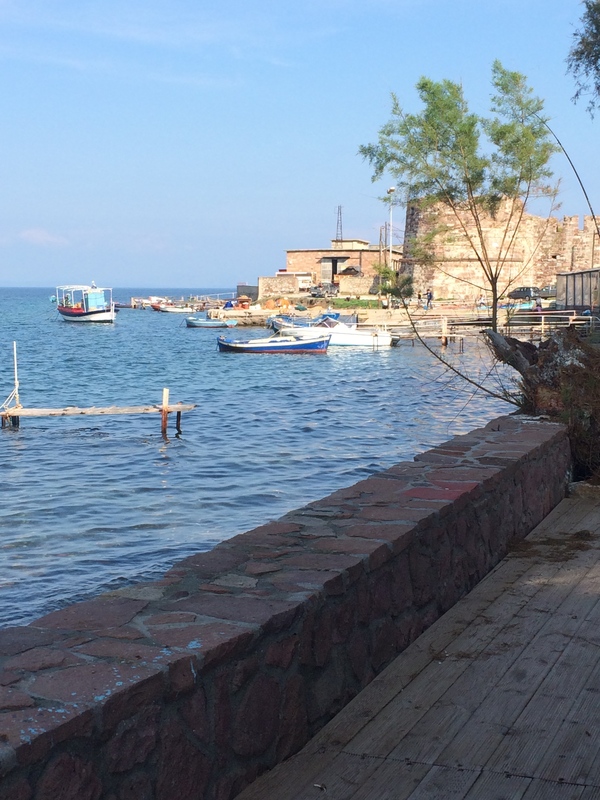 The next week when we were on our way to Lesvos, I read about this same place in the Agean Airlines magazine. 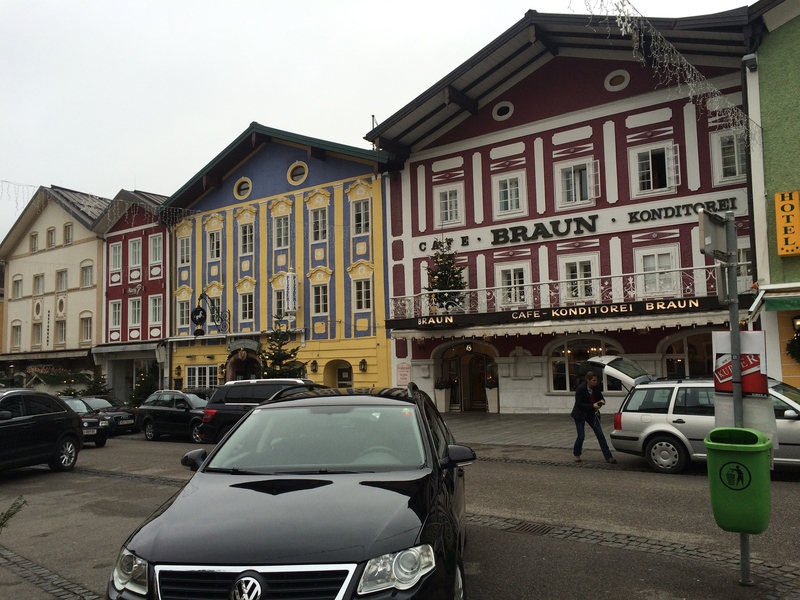 The town looked incredible and the brown bear settlement was very intriguing! I agreed that it was worth a visit! We rented a car and planned to go when Alexandra (who has now officially become our adopted 18 year old daughter) visited again last weekend. 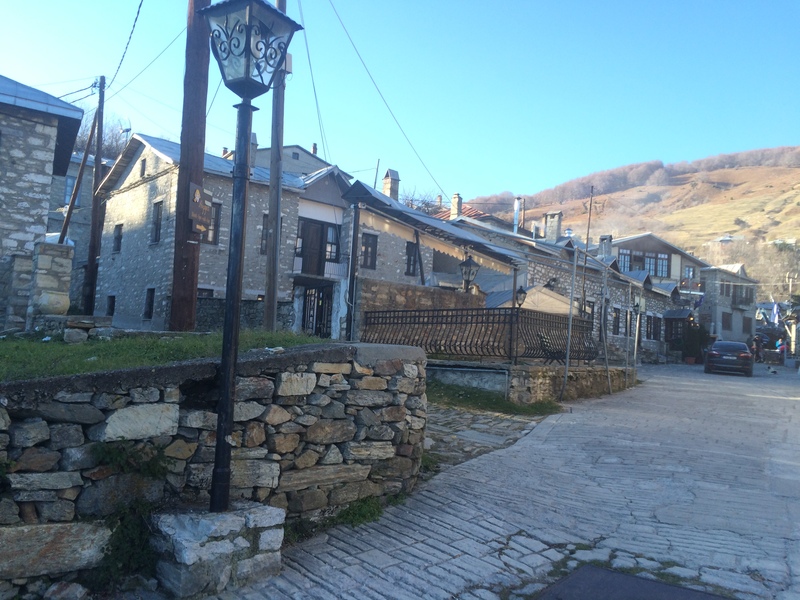 We retrieved our car early Saturday morning and set out on a two and a half hour trek to the town of Nymfaio. 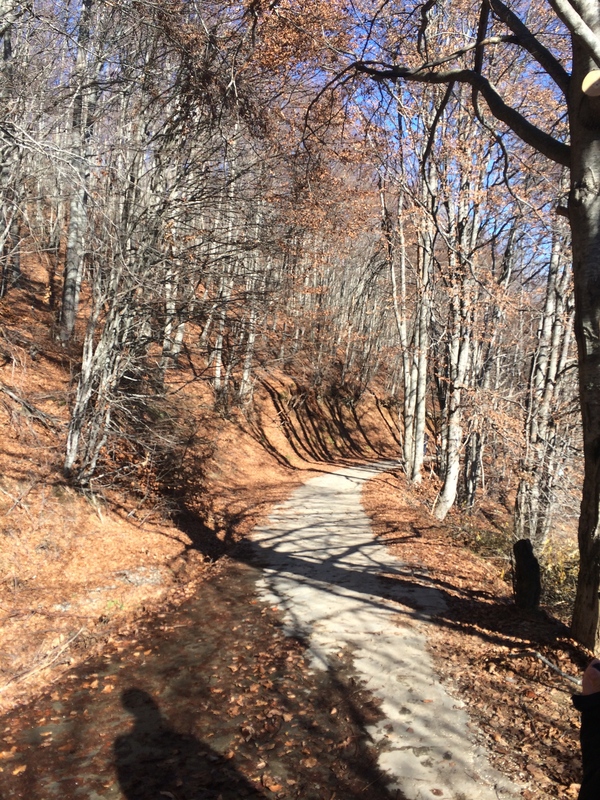 As we approached the town, the signs started directing us up…and up…and up… an incredibly steep and windy road. 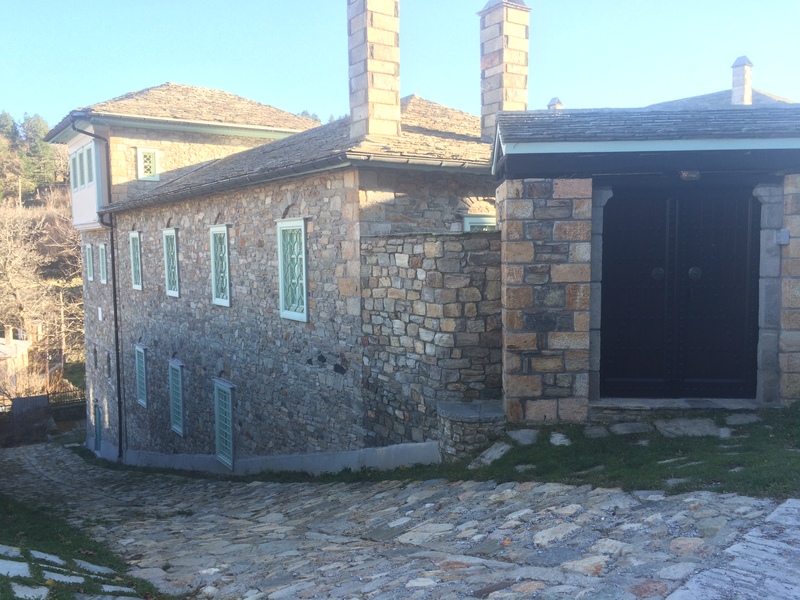 We soon came to the top of the and found a charming stone arched entry to the most beautiful village built completely out of stone and nestled into the mountain. 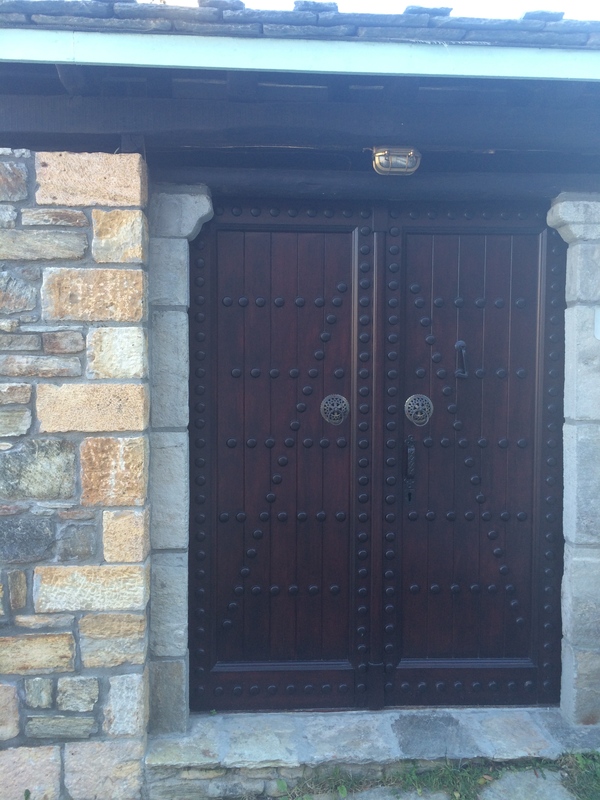 Most of the homes paired their stone structures with incredible dark wooden doors and windows. The slate color of the stone paired with the deep brown wooden accents made for a cozy village feel a little reminiscent of the English countryside. 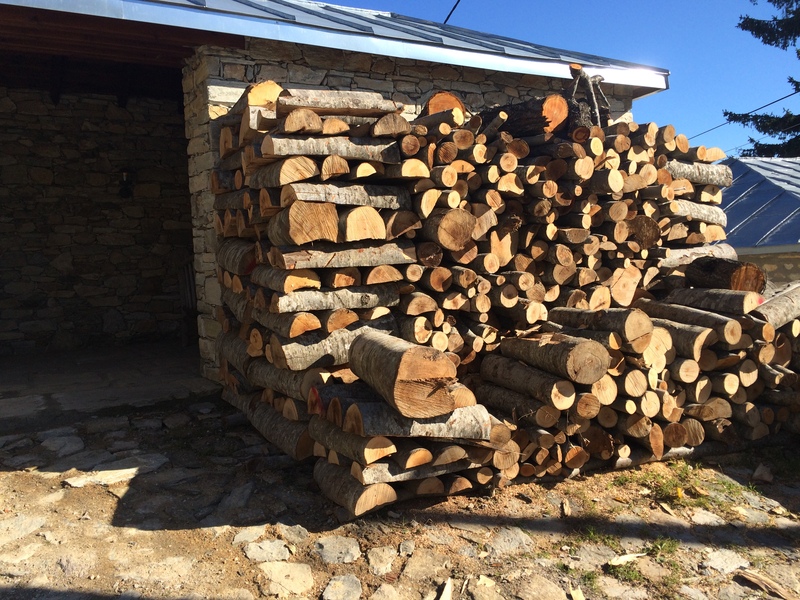 There were hundreds of logs stacked along the side of almost every house and the smell of wood burning stove flowed down each street. The town was full of trees most of which were barren but some that still had the colorful remains of fall clinging to their branches. As we parked our car and stepped out to walk around, we breathed in the fresh chill of a perfectly crisp late fall day along with the comforting aroma of wood burning stove. I reveled in the peaceful rural silence free of the excessive honking and reviving engines of the city. 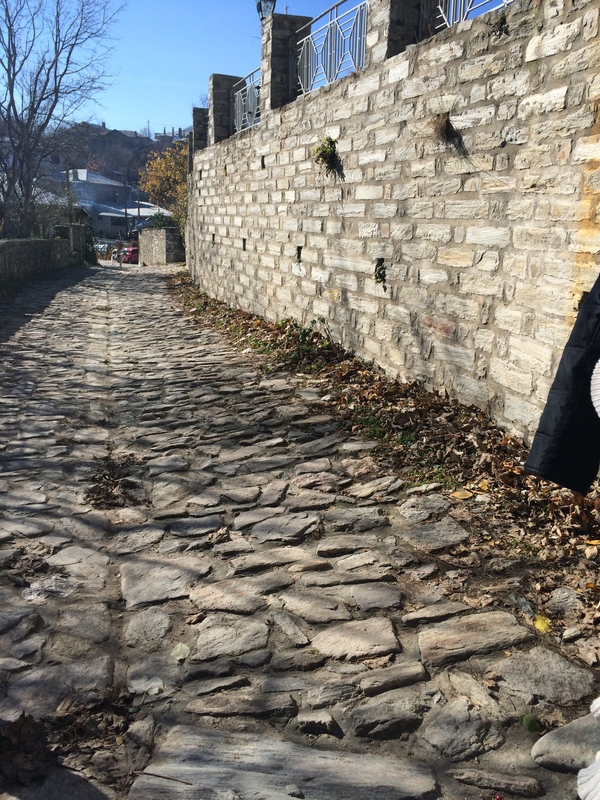 Unlike Thessaloniki, we experienced the crisp cool weather that the middle of fall is supposed to bring (at least in the places we come from). While the warmer weather has been nice in Thess, I was excited to partake of a taste of fall. 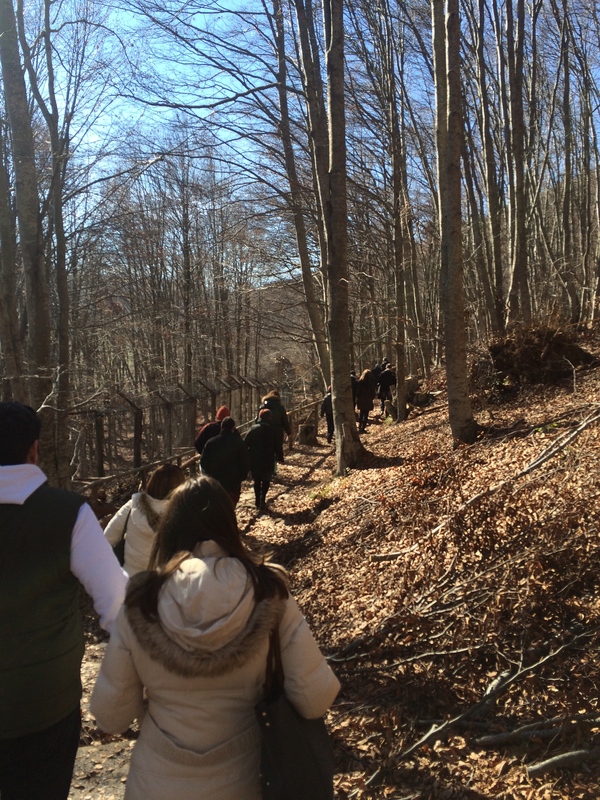 After a bit of exploring, we made our way down a trail in the woods that led us to the Arcturos brown bear habitat. We made it just in time for the start of the next tour. 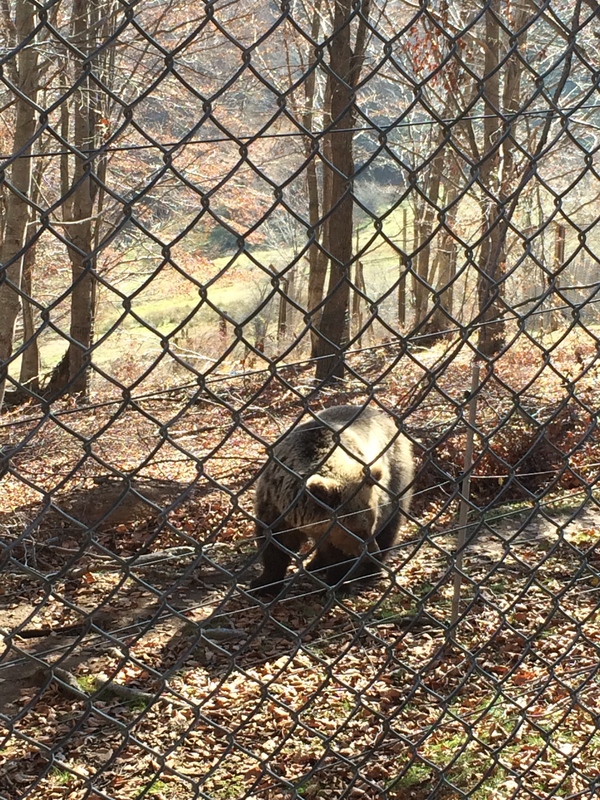 The tour began with an explanation of the mission and purpose of the Arcturos organization and the work they are doing to preserve the brown bear population in northern Greece. 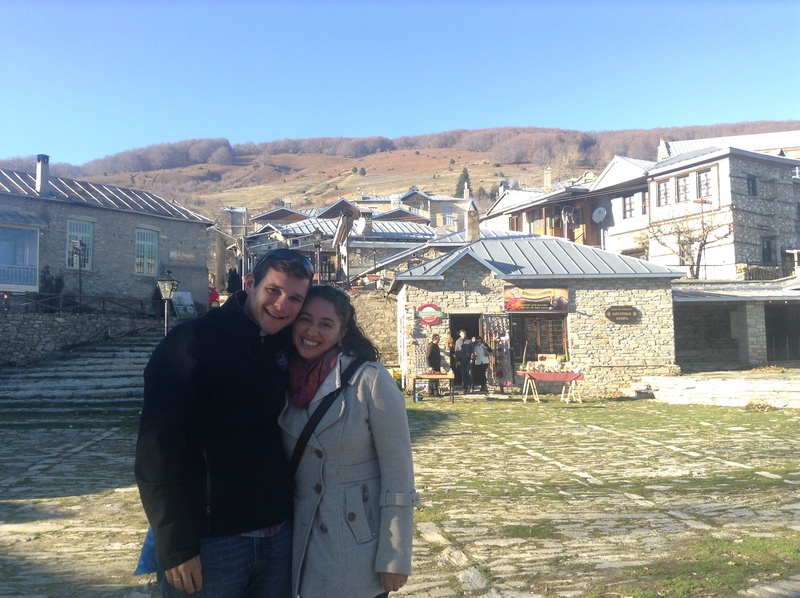 We realized pretty quickly that this was more of a local destination, all of the visitors were Greek natives and the tour did not have an English counterpart. We did our best to translate and asked the guide to fill in the gaps after the end of the tour. He apologized not realizing we were American (thanks to Mikey’s proficiency in Greek!) and explained that they rarely get foreign visitors. He was kind enough to give us the spiel in English and we learned the history of the brown bear, how it was becoming extinct in Greece, and the mission of Arcturos to offer them an expansive natural habitat as well as protect the mountainous ecosystems. We learned a lot about the history of the abuse of the brown bears most prominently for the purpose of the circus. Bears by no means naturally stand on two feet and dance. The circus trainers forced the bears through an extremely painful and unnatural process in order to teach them to “dance”. Overall, Arcturos was a very impressive organization and seems to be doing very tangible and effective work. 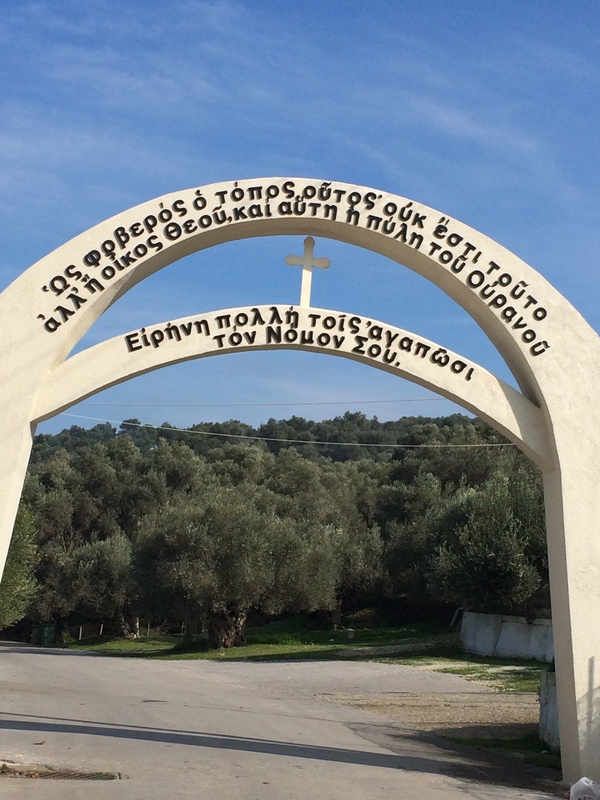 I was surprised and impressed to learn of such a professional environmentally aware organization in rural Greece. After the explanation, our tour took us to see the bears!! I do not have much experience around wild animals, especially bears, so it was very exciting to be a mere few yards away from creatures I have only since in pictures and movies. 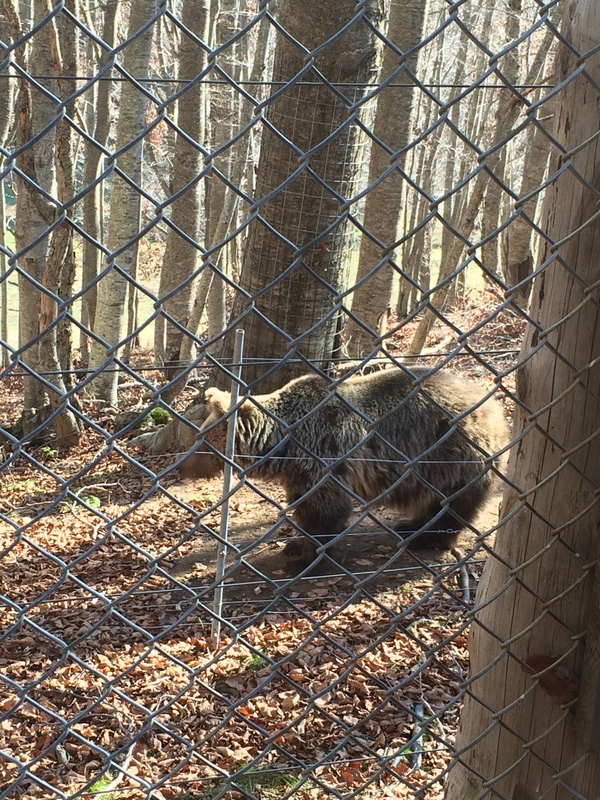 They were behind a large fence and we observed them going about their daily routines. I couldn’t help but think how cute they looked! 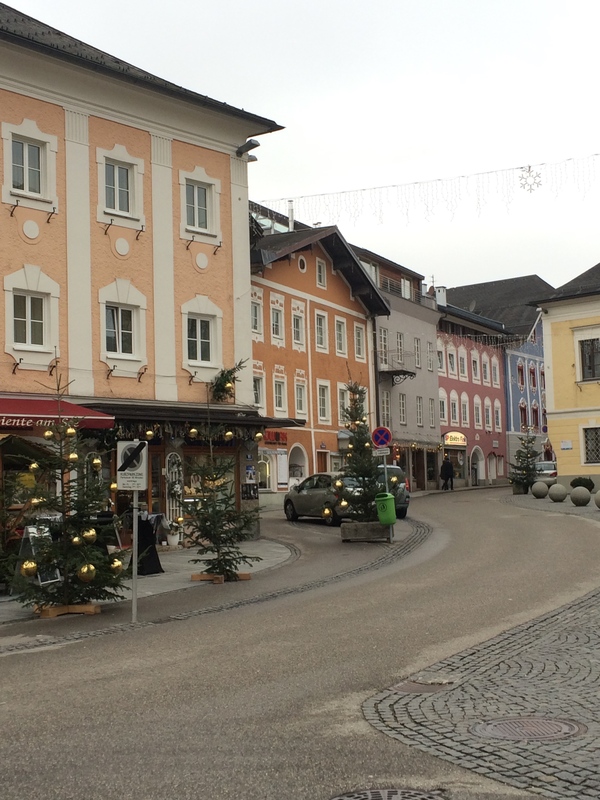 After our tour we perused the gift shop and then trekked back into the town for a long anticipated lunch. 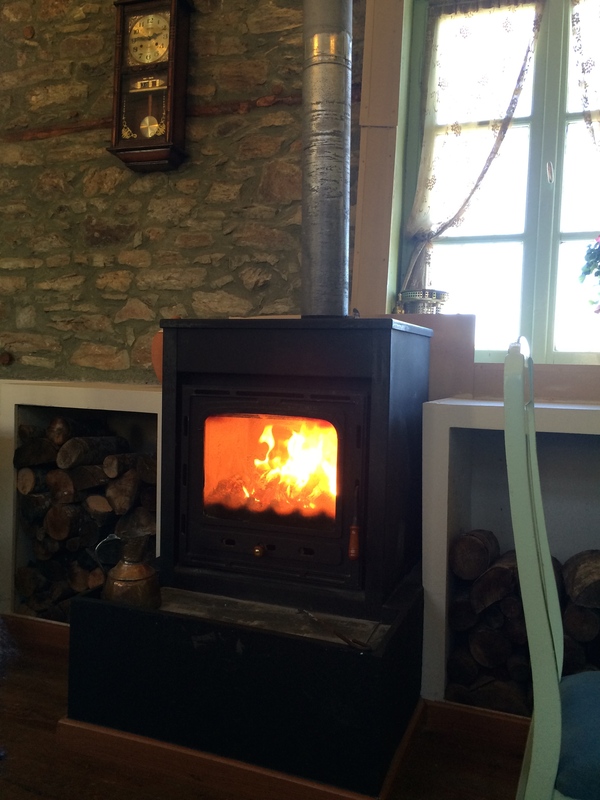 We walked in to one of the several restaurants in the town and chose a table close to the wood-burning stove; I was in heaven! The waiter kindly translated the menu for us as the majority of the items were local to this region and thus our vocabulary was not specific enough to understand them. 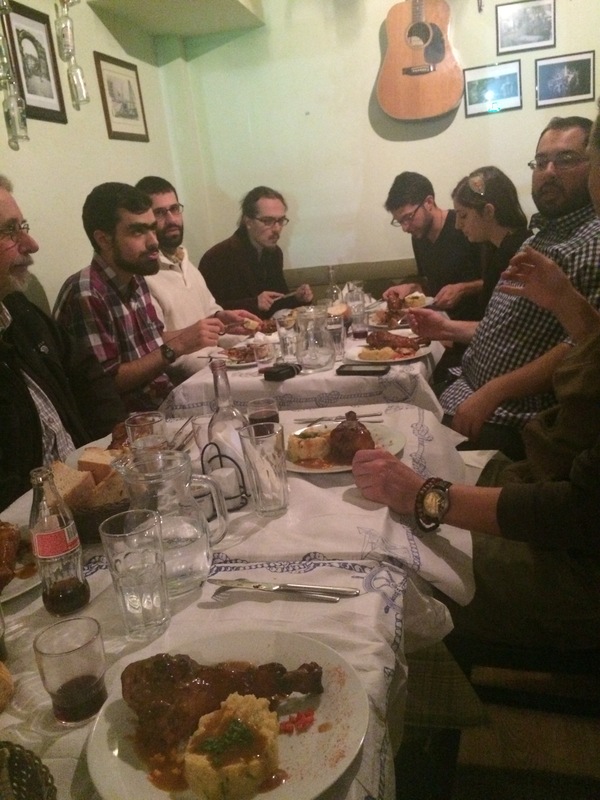 We selected four or five dishes to share – all dishes that we could not get back in Thess. 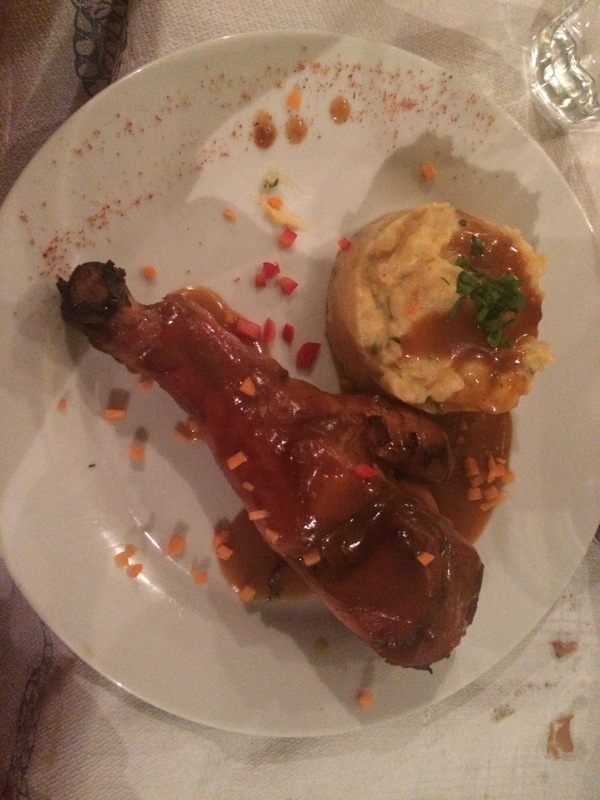 As the waiter brought out each dish our jaws dropped and the salivating commenced. Each dish was better than the next. They had a home-cooked quality and the unique flavors of the native peppers, pine needle-opita, and the melty baked feta were a much-welcomed presence in our mouths. 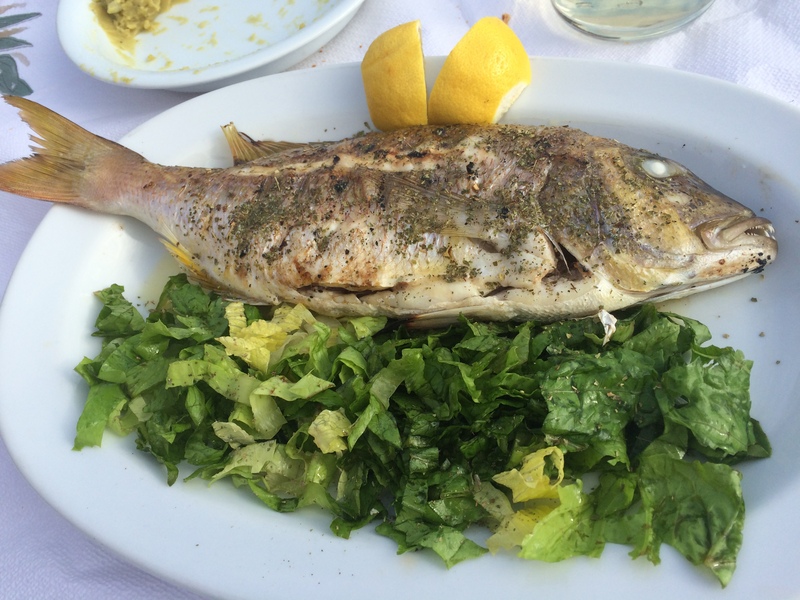 This was without doubt the best meal we have had so far in Greece. 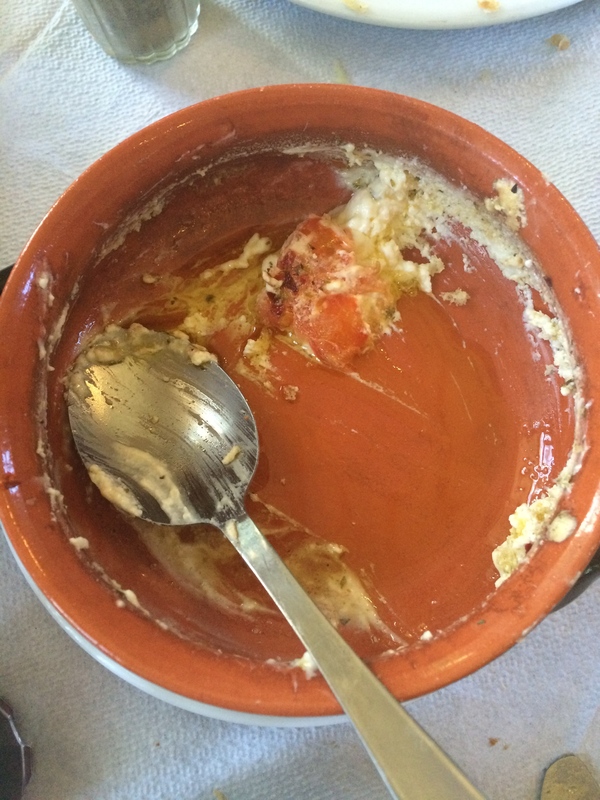 We finished every last crumb and then licked the plates completely clean in awe of the culinary expertise of this tiny rural village. I know I have reflected a lot on the delicious Mediterranean cuisine we have been partaking of, but truly, this meal was on a different level! After some more exploration of the town and a visit to the Arcturos museum, we visited the little shops full of local products. We had to leave with something yummy to take back with us and settled on rose petal chocolate, the most incredible smelling loose-leaf tea, and a big jar of local honey. The shop owner let us taste the honey before we bought it – I have never tasted honey that good! 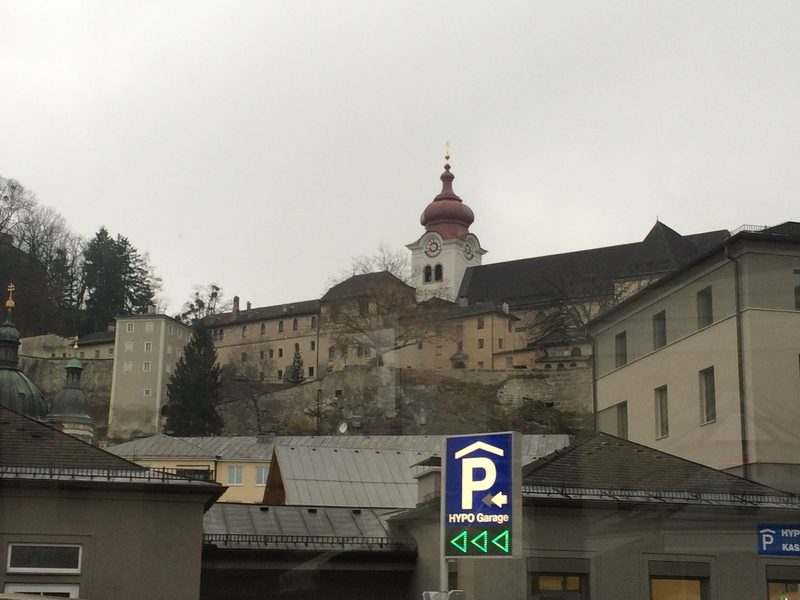 We decided to head down the mountain before it got to late, wanting to stop through another town on our way back. 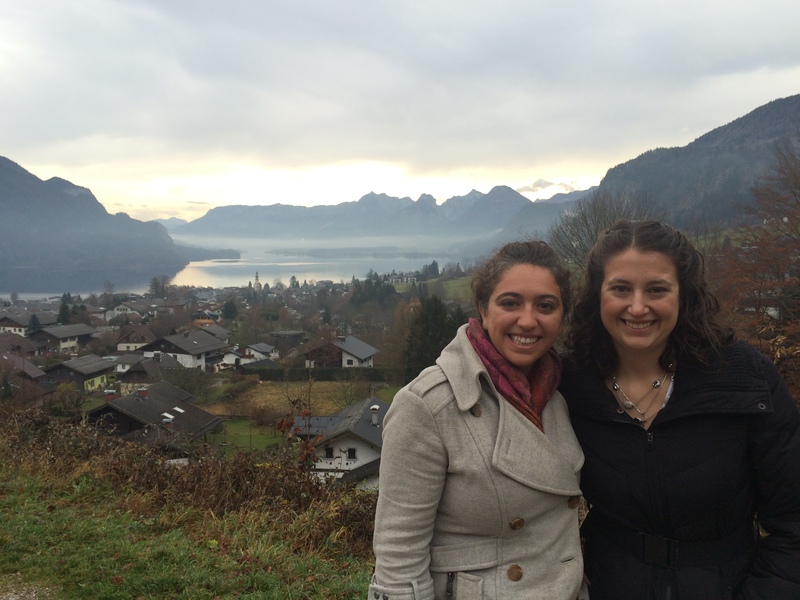 I was sad to say good-bye to this special gem of a town but so thankful we discovered it! Our drive back was beautiful to say the least and we made it to a beautiful waterfall in a nearby town just before dark! 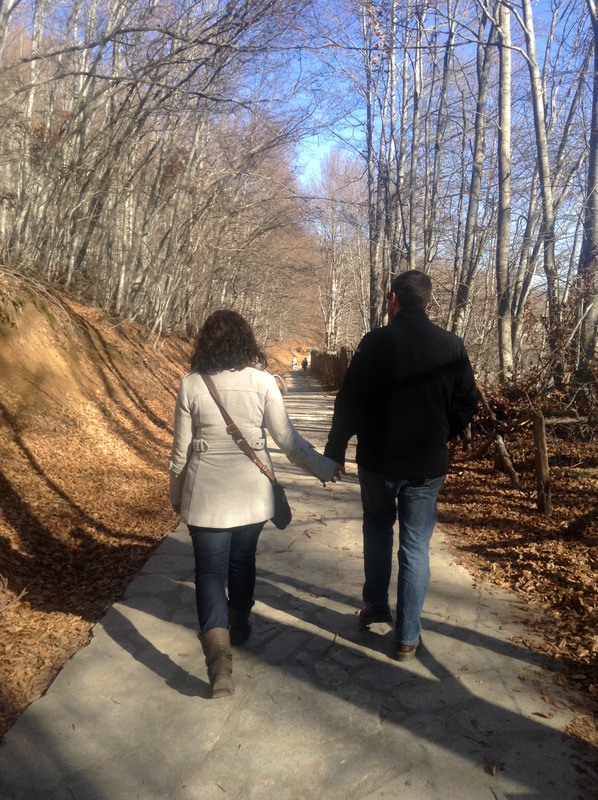 It was a wonderful day exploring the northern Greek countryside and a refreshing escape from the hectic city life. I was obsessed with these doors! I forgot to document our meal…we ate too fast! 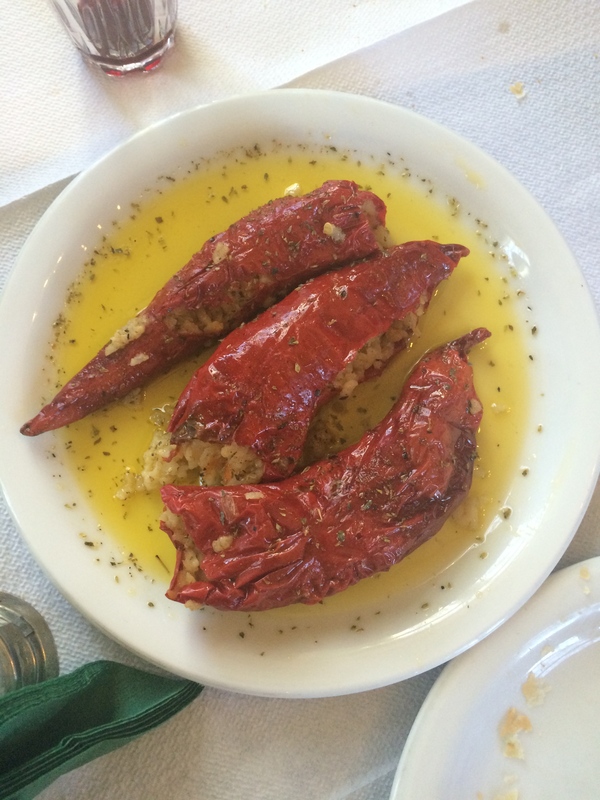 I did manage to photograph the most amazing stuffed florina peppers!!!! 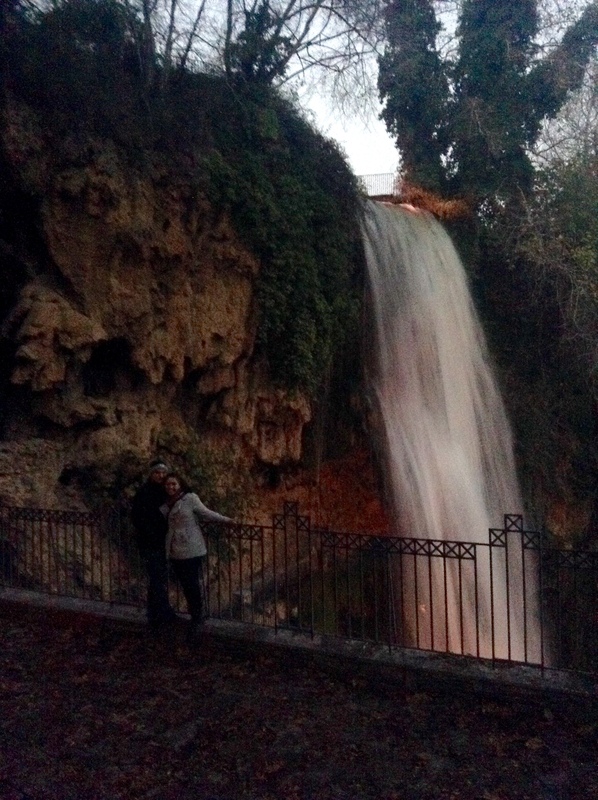 Stopped by a nearby town with just enough daylight to see the waterfalls! 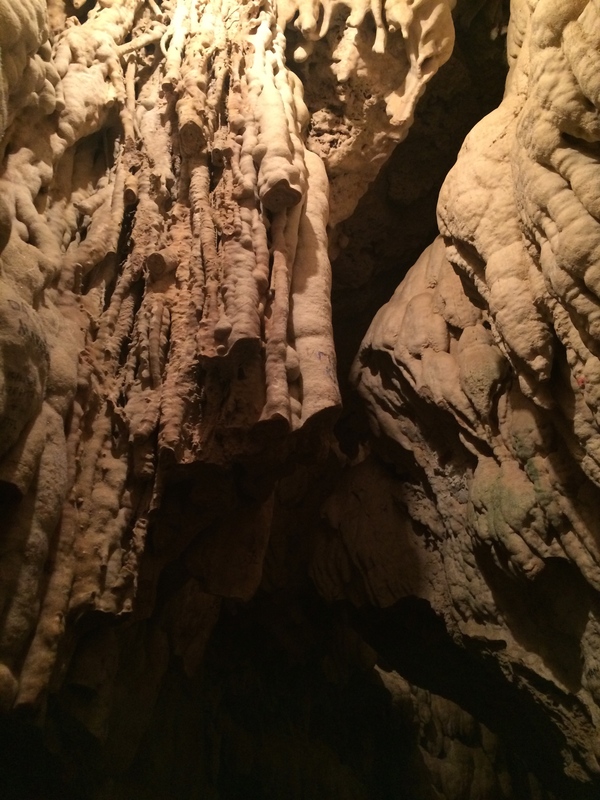 inside a stalagmite cave behind the waterfall! The spirit of Thanksgiving prevails, even on this side of the pond! I love Thanksgiving. Thanksgiving marks the start of my favorite time of year. It is an excuse to gather as an entire extended family over a delicious home-cooked feast, laughing and enjoying the company of loved ones in the cozy warmth of one of my aunt and uncle’s homes. It is a day off of school or work along with the promise of no school or work on the following day. Regardless of what religion one is, everyone in America celebrates Thanksgiving. The rich smells of pumpkin pie and roasting turkey fill the house. It is a day to set aside the everyday stresses of life and enjoy fellowship with loved ones. It is a time to relax, reflect, and revel in gratitude. So you can imagine my slight disappointment when I awoke to a city going about its day just as it was any other; you can imagine my disappointment when I awoke and remembered that I would not get to pass the day in a cozy home full of the laughter of my beloved family members; you can imagine my disappointment when I awoke and realized that the holiday was happening, but I was not going to get to be apart of it. 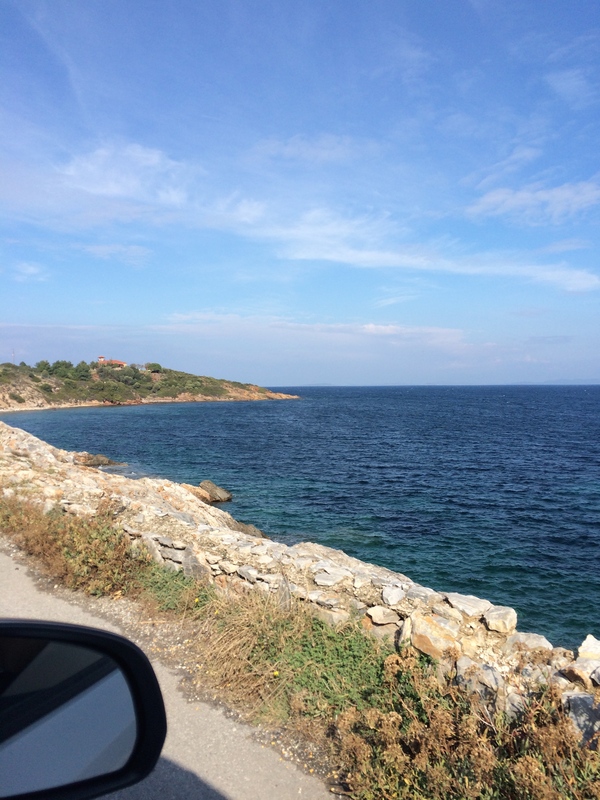 Ok… ok… enough of my sob story… I know, I’m in Greece, life could not get much better than this, but I promise I’m not complaining, I’m just experiencing a bit of longing today. This is the first time since crossing the Atlantic Ocean that I have actually felt homesick. It is a bizarre thing waking up on a holiday that you have celebrated so prominently for 25 years in a country that has no concept of this holiday. 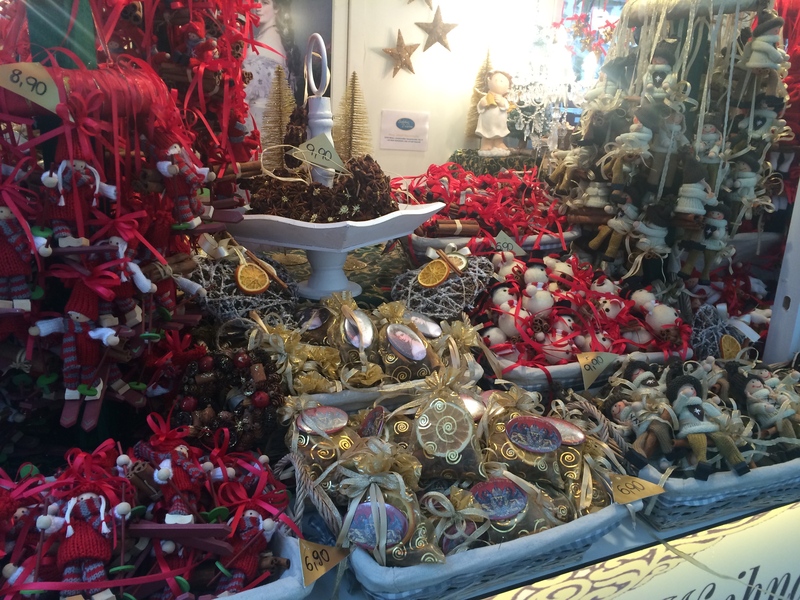 Christmas will be different; everyone in Greece celebrates Christmas, but this holiday is just bizarre. Our day was like every other. I woke up, made breakfast, ran my own personal 5k Turkey Trot, showered, and went to class… Mikey and I wished each other a Happy Thanksgiving, both of us in similar disbelief that it was in fact, Thanksgiving. Last week when I was thinking about what I wanted to write in this Thanksgiving blog post (because my ideas for my posts are constantly running through my mind), I anticipated a simple post of gratitude. I am so grateful for this life that I am living and I feel that today is a very appropriate day to express those emotions. As you can see however, I awoke with a slightly sad longing instead of a heart of thanks. I am choosing to interpret this longing in a positive light. My longing to be in a house full of love and laughter on this day is only indicative of the life full of love and laughter that I am so blessed to have. If there is any way to be sure you don’t take something for granted, it is to remove yourself from it. Today, thousands of miles away, I am painfully grateful for the rich life that I have! It is of course a striking and unique experience to wake up in a country on a prominent holiday that is not celebrated in said country. I can only imagine the days that my great-grandparents woke up anticipating a cultural holiday only to find no one reveling in any kind of celebration; and they were committing to this for life! I used to sometimes question the super “Greek-y” communities, wondering why they cling to their former culture so intensely. During this time living abroad, and especially today on Thanksgiving, I have developed a softness towards these tendencies. It is hard to shed your cultural traditions, especially on holidays. 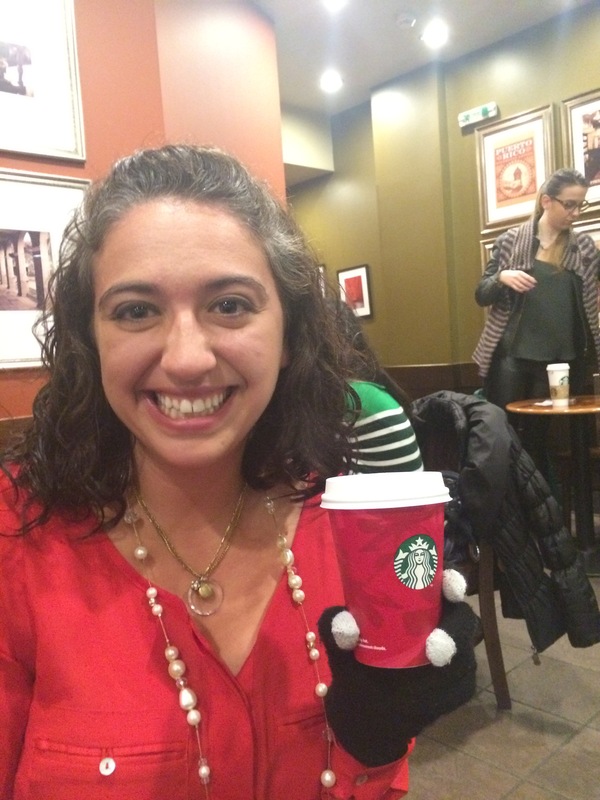 And of course, I found my way onto American soil, aka Starbucks, to write this blog post, enjoying the Christmas carols playing, while sipping on the first decent filtered coffee I have had in months!!!!!! (while the Greeks make excellent frappes and delicious small espresso-esque Greek coffee, their regular filtered coffee is awful! I have been missing normal coffee so much!) While we will be missing those closest to us, we are making the most of this holiday and celebrating as best as we can! I must close this post with my expression of gratitude, for I am indeed so thankful for life. I am thankful for my husband who loves me so deeply, supports me even in my craziness, takes care of me, and makes me laugh constantly. I am thankful for an unbelievably supportive family, who grounds me, unconditionally loves me, and offers so much vibrancy in my life. I am thankful for the most incredible friends anyone could ask for, friends who have walked by my side through all seasons of life and who enrich every moment of my day. I am thankful for the inspirational mentors who have guided and shaped the woman I have become. I am thankful for a rich education, for the experiences of travel that have broadened my horizons, for this incredible four-month excursion, and for the security of knowing that we are soon going back to a familiar place to be surrounded by those we love once again. Life is good, God is great, and I am truly blessed. The spirit of Thanksgiving prevails, even on this side of the pond! P.S. We ended up having a wonderful Thanksgiving! The staff at the restaurant made a beautiful Turkey dinner with a Greek twist! We ate until we were about to burst and then we went out for more deserts. 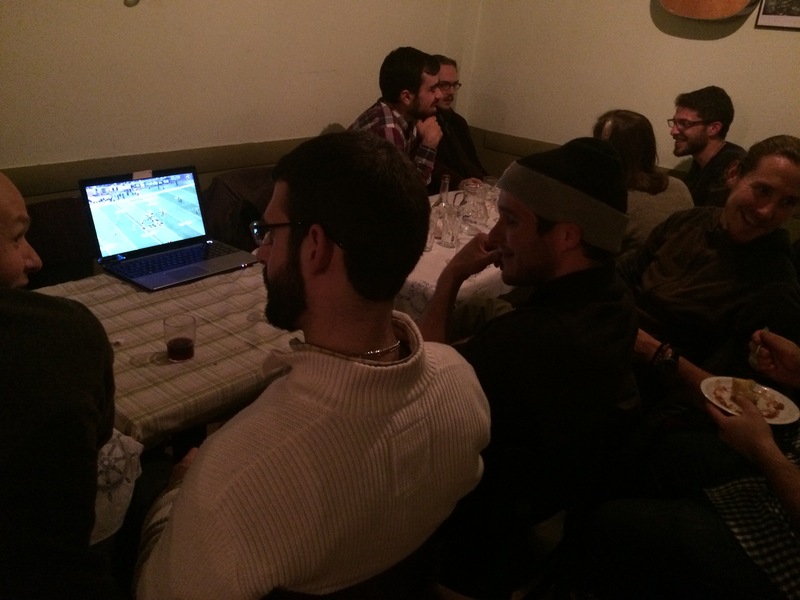 We laughed and enjoyed great conversation and the boys got to watch their football. We capped off the night by FaceTime-ing into my family’s Thanksgiving back home! 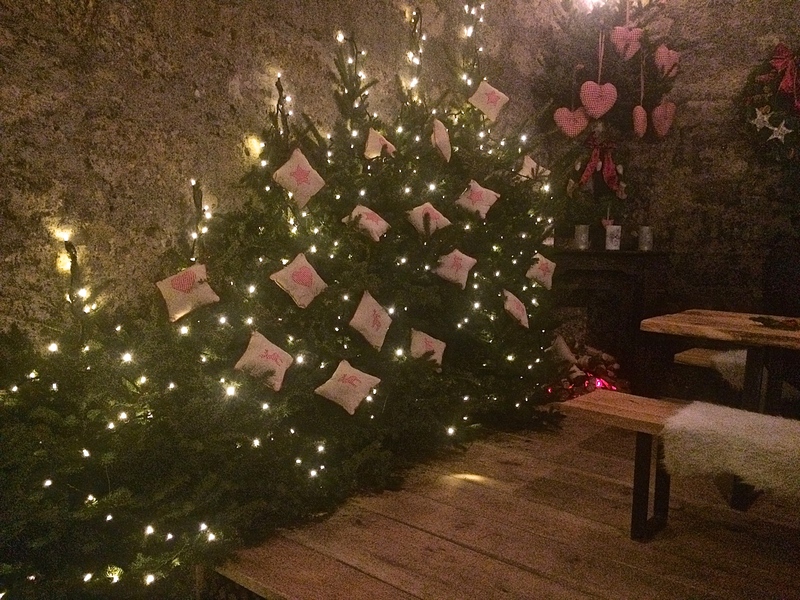 All-in all, the day turned out to be very festive! So much to be Thankful for! Wen went with a Greek-style pre-dinner meal! Everyone got a massive Turkey leg!! So beautifully presented and very delicious!!! 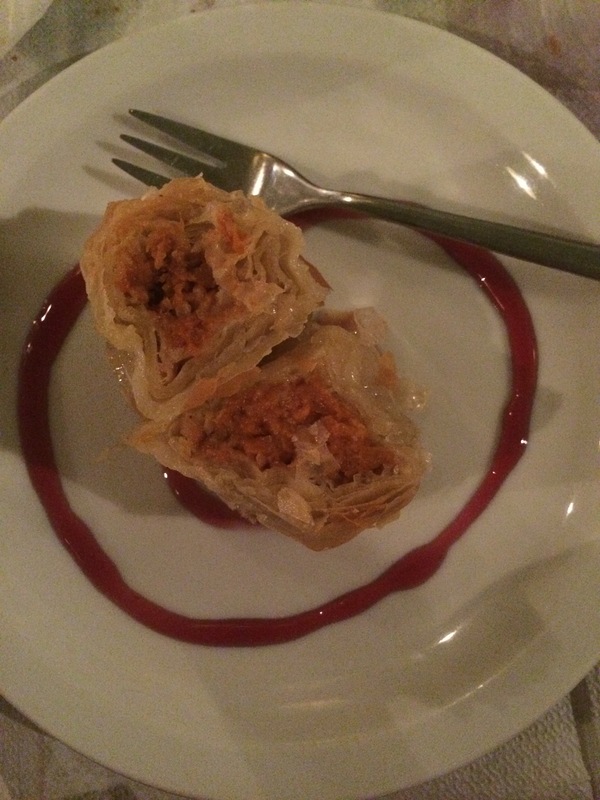 This was my favorite, Greek-style pumpkin pie, in filo dough of course! It was SO yummy!!!!! The boys got their football! 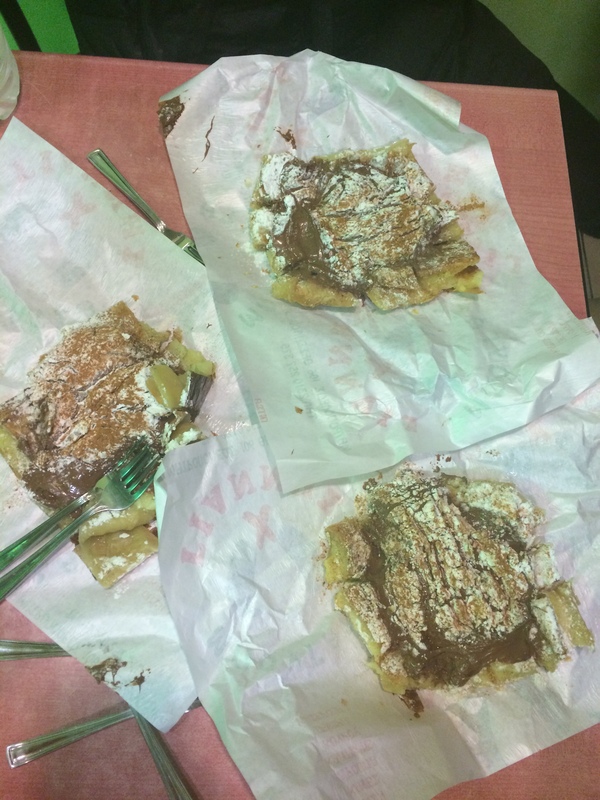 It is only fitting to cap off the night with some Nutella bougatsa! About a month ago I decided to make a concerted effort to give up the grocery store as much as possible. Everywhere we walk we pass fresh fruit stands and little specialty shops that sell eggs, cheeses, nuts, dried beans, etc. I love the idea of shops that specialize in certain products and thus sell fresher and higher quality options. For whatever reason I am enamored by the concept of buying fruit from a fruit stand and fish from a fish market especially knowing that the fruit was grown not far out of the city and that the fish was caught from the water that I can see. There is something a little enchanting about buying a bag of freshly roasted cashews from our “nut guy”, selecting fresh eggs from a 15 x 15 stack rather than pulling a carton off of the grocery store shelf, and watching an eighty year old man hack my pork chops right in front of me. I love the idea of having a nut guy, a fruit guy, an egg guy, a meat guy, etc. So, a month ago, I decided to only go to the grocery store for necessities like toilet paper, and stick to the local shops for my more regular purchases. There is of course a reason we shop at grocery stores, they are far more convenient and often less expensive. Why make five stops instead of one, why pay $50 instead of $30? For me, it is not all about the charm; I truly believe the quality of our food is valuable. 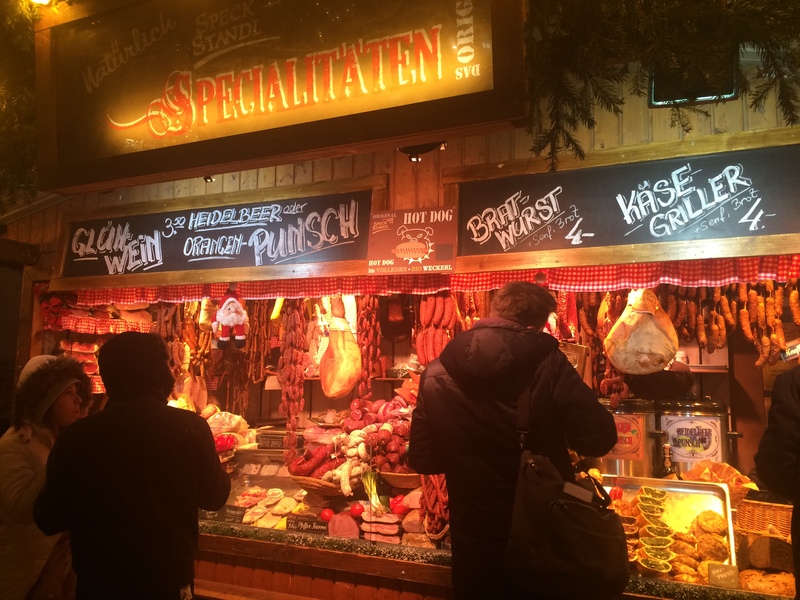 When we first started stumbling upon these specialty shops, I assumed that the quality of the food in these shops was better than the food in the grocery store. It makes sense, the more mass-produced food is, the more processed it must be and the less fresh it is. 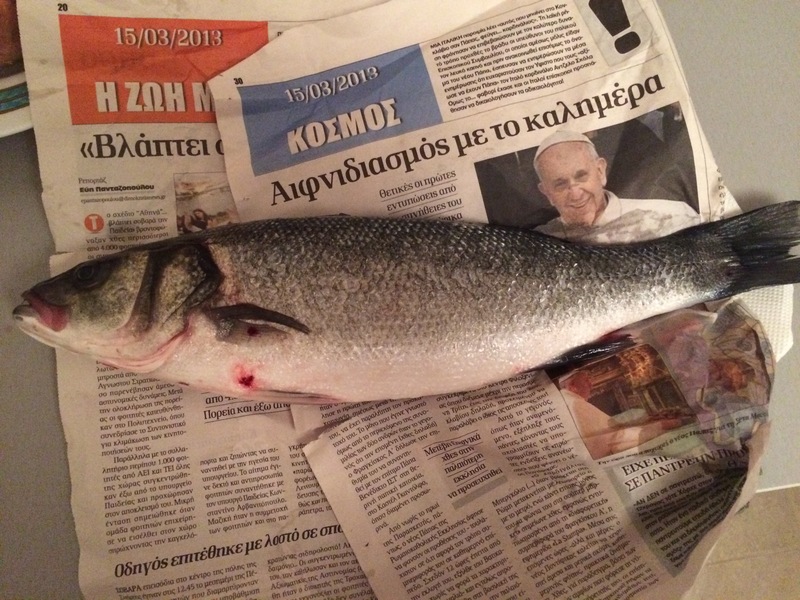 After talking with my Greek teacher about grocery shopping in Greece, she confirmed with me that my hypothesis was correct; the smaller shops generally sell fresher and better quality foods. 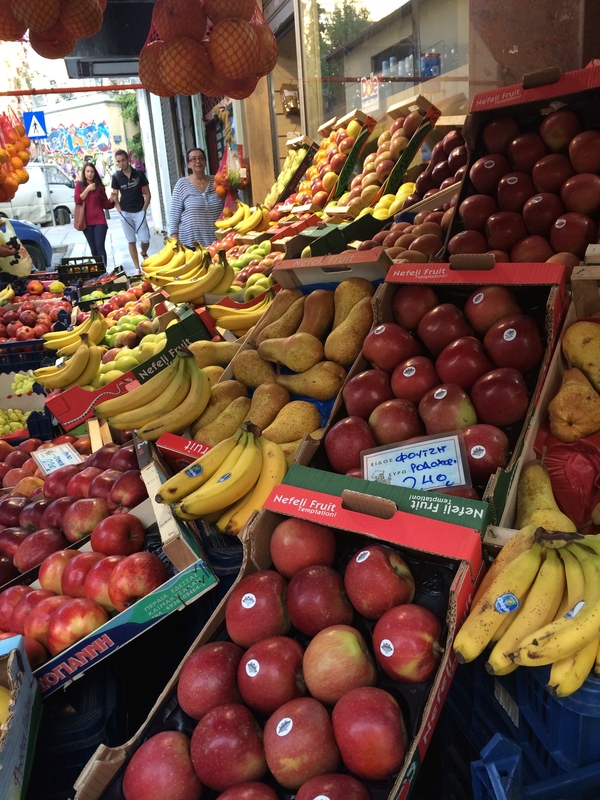 The supermarkets are more convenient but they have not entirely prevailed and thankfully in Greece, the fruit stands and specialty shops are not fancy and overpriced; they are only slightly more expensive than the supermarkets. It takes extra planning, but we have for the most part, been “specialty” shopping. I love perusing the abundance of plentiful seasonal fruits and vegetables in the fresh open air of the streets and smelling the salty freshly roasted atmosphere as I order my quarter kilo of cashews, but my favorite shopping experiences thus far have been at the “kreopolio” (meat store) and the open-air fish market. The kreopolio is just a couple blocks away from our apartment. 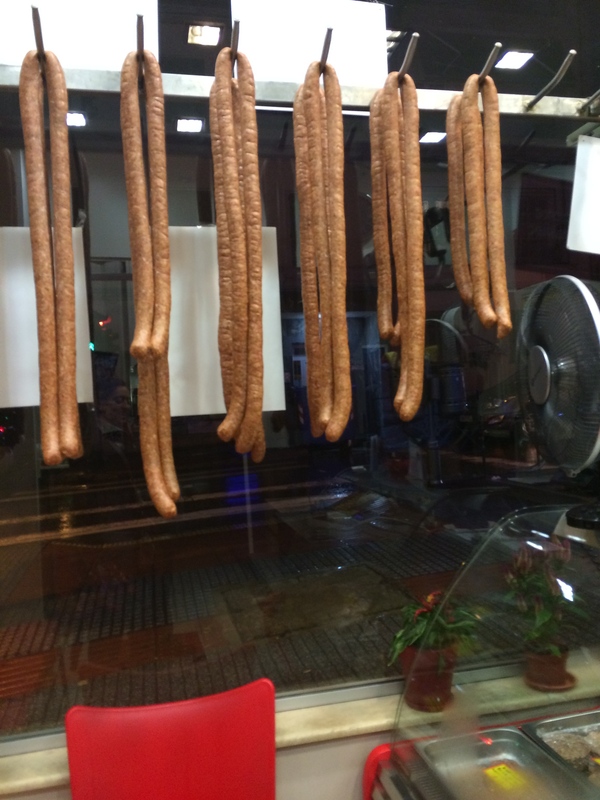 You can immediately tell before reading the sign that it is a meat shop from the long chains of sausage links drying out in the windows. It is a small shop. 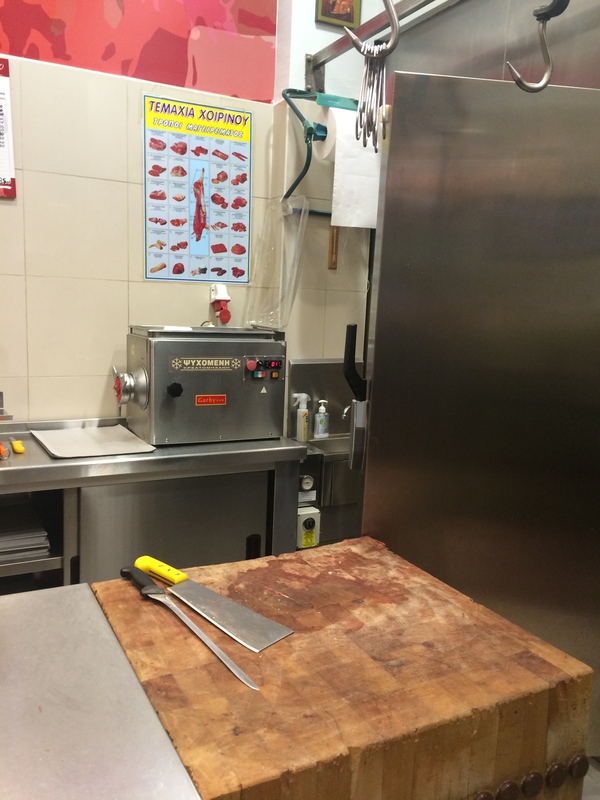 When you walk in you see a wide butcher block and a refrigerated case displaying the fresh pre-marinated options. To the right is a huge walk-in refrigerator, the secret realm where all of the freshly butchered goods are held. I would love an opportunity to peek inside just for a moment! The owner of the shop must be around 80 years old. 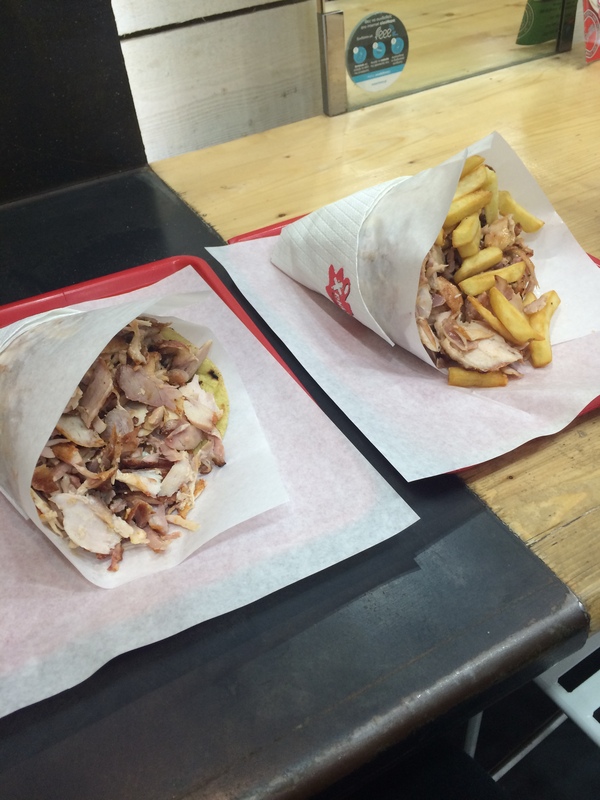 We go in, give him our order, and he brings out the meat to freshly prepare it right in front of us. If we ask for ground beef, he brings out a huge chunk of meat and runs it through the grinding machine for us to watch. If we ask for pork chops, he brings out a huge slab of meat, slams it down on the butcher block, and hacks off our portion. And when he hacks, he raises his cleaver above his head while holding the slab of meat with the other hand and swiftly and quickly makes his cut barely avoiding the fingers on his other hand. 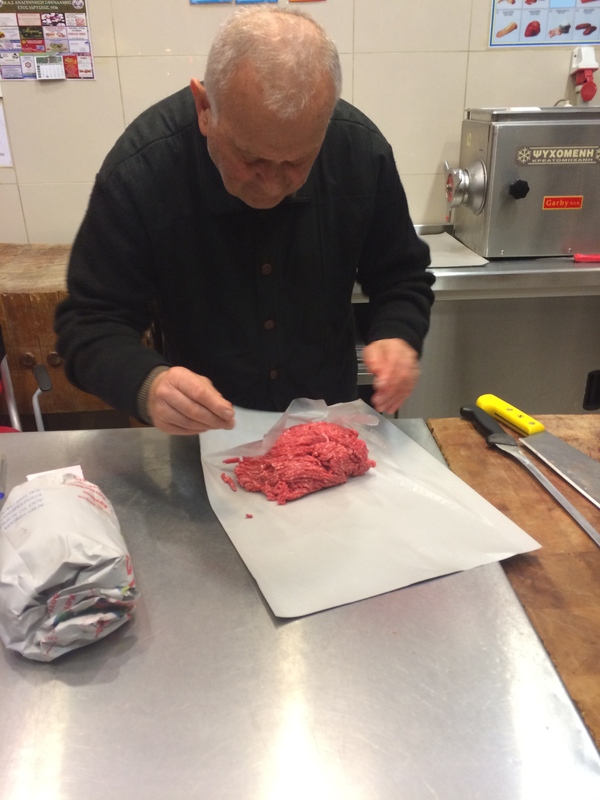 We are amazed every time; after decades of owning a meat shop, he still has all of his fingers, this guy is legit! See – all of his fingers are still intact! As for the fish, there are two different places we get our fish from: the big open-air market in the center of the city and the rotating neighborhood open-air market. As long as you make sure the fish has come from the sea and not a fish farm, the quality is pretty much the same from the two markets. The rotating market is near our apartment on Thursdays and right next to our school on Fridays, so I plan out my shopping accordingly. 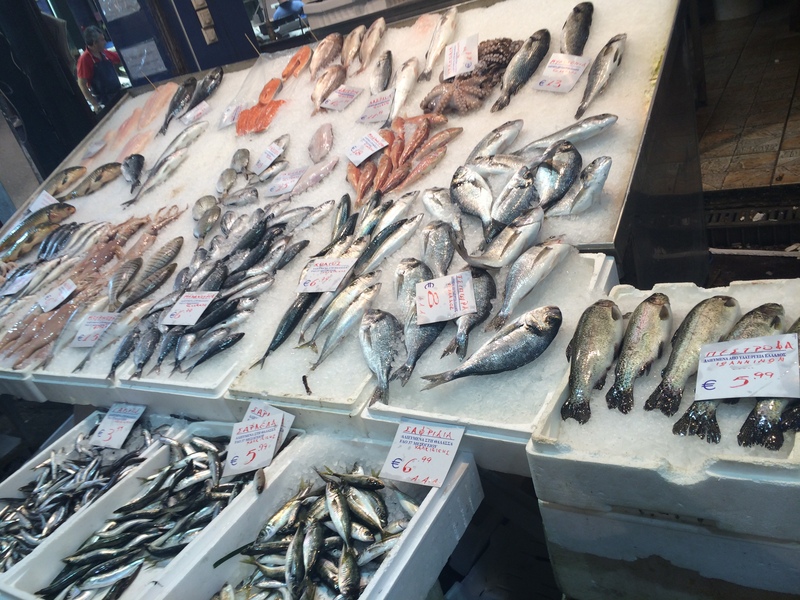 Similarly to our other specialty shopping experiences, buying fish at the open-air markets includes perusing the plentiful displays, smelling the fresh salty sea air, and having a conversation with the fish guys. Shopping in this manner is a much more personal experience, I think that is what I like most about it! 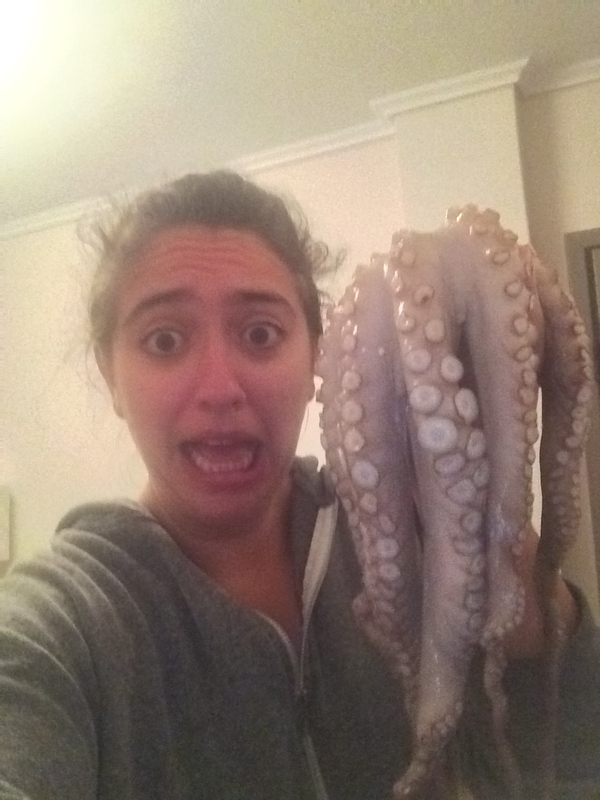 Last week I bought my first whole fish and my first octopus! 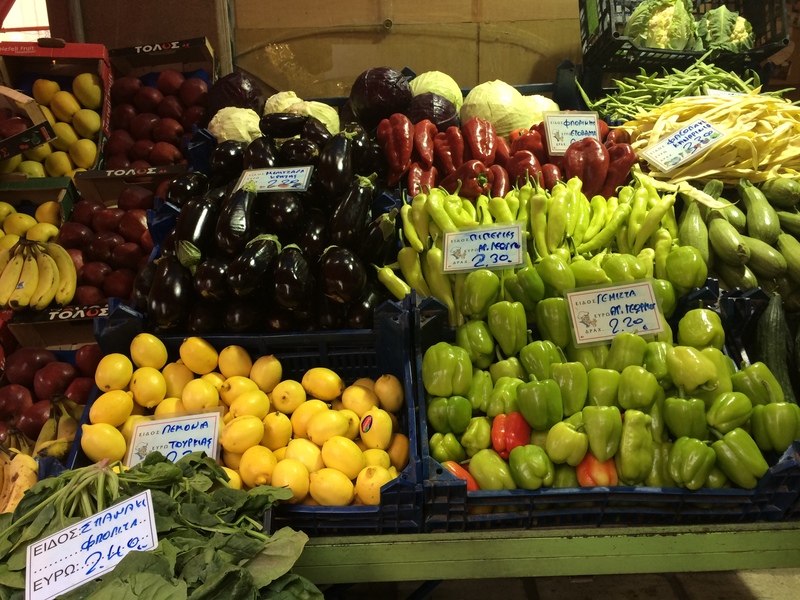 As I have mentioned before, I have been trying to keep my cooking simple while in Greece, both to save money on ingredients and because of my lack of cooking space and appliances. I am still cooking yummy meals but I have recently become bored in my kitchen. I have desperately needed to spice things up (pun intended)! 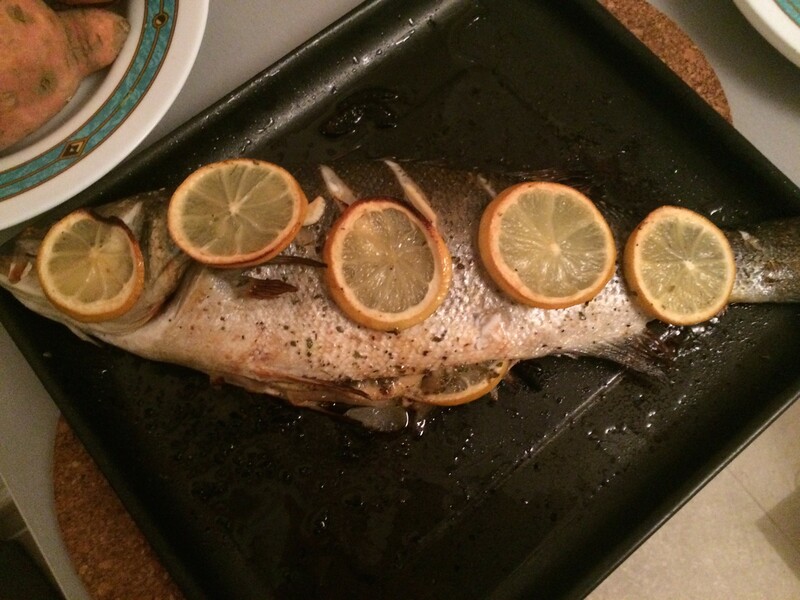 Fresh whole fish and seafood, in a form that I have never cooked before is exactly what I needed! I have not had so much fun cooking in a long time! I Googled various recipes, acquainted myself with the process of cooking both a whole fish and an octopus, added my own variations, and went for it! My mouth is watering just thinking about these meals. I have to say, both my fish and my octopus came out exceptionally! Cooking the fish was mostly intuitive, I have cooked plenty of filets, so I was at least acquainted with the flavors that go nicely with a white fish, but I have never tasted such a perfectly tender fish in my life! I made a nice little onion and garlic stuffing that I cooked in the cavity of the fish as well. I have eaten a lot of delicious fresh fish from restaurants, but there is nothing more satisfying than pulling out my own fresh fish creation out of the oven and placing it on the dinner table for my hubby and me to share! 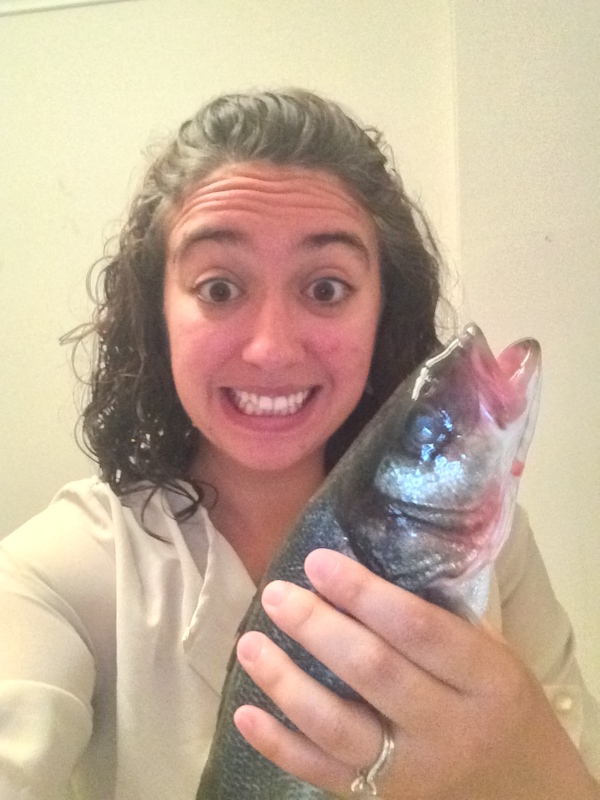 I am also impressed that handling this whole fish, complete with its eyes, mouth, and teeth, did not completely gross me out!! The octopus was a whole other experience! 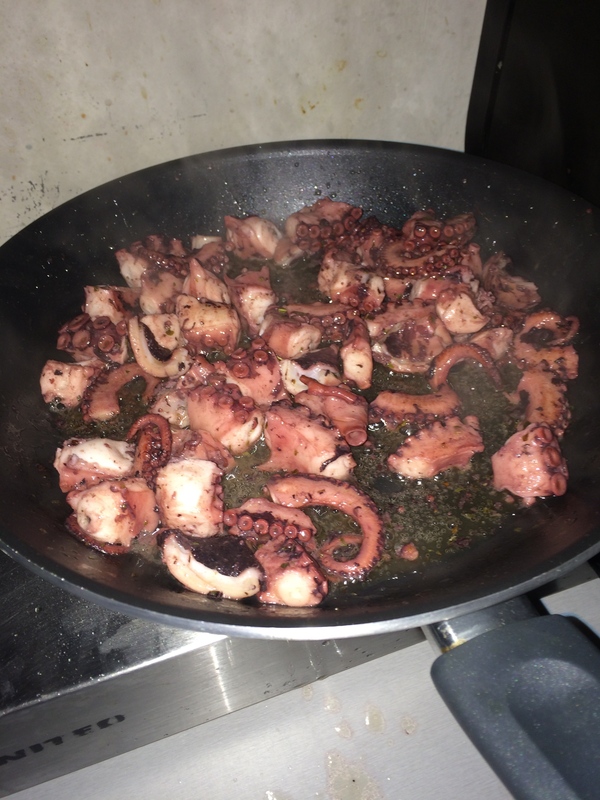 I had never ever cooked octopus before and did not even know where to begin! Thankfully I did my research ahead of time because my intuition would have ruined this meal! 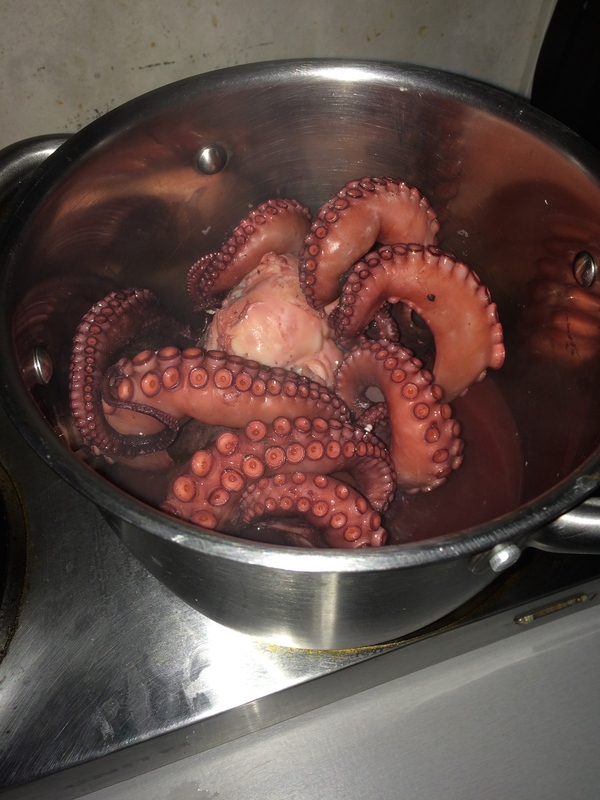 I had no idea, but before you grill an octopus, you have to cook it for about 45 minutes. You can do this in the oven or in a pot. I chose the pot method. 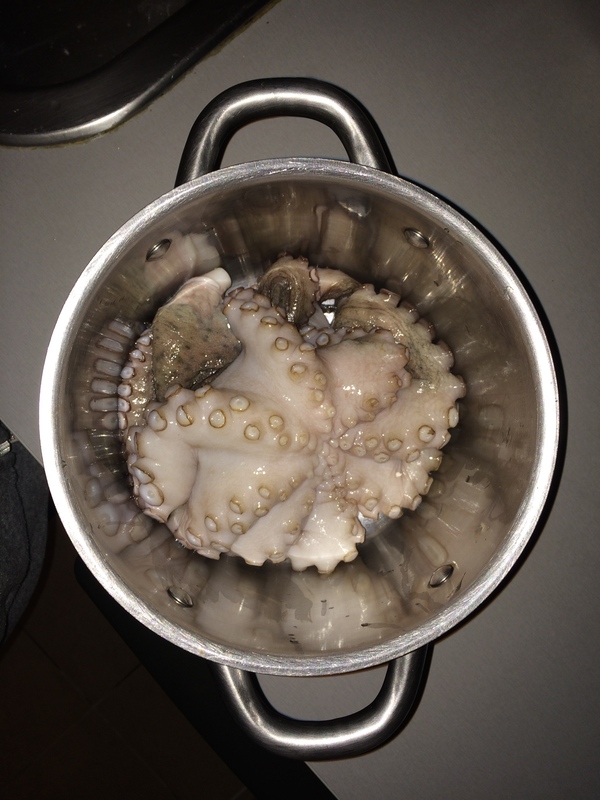 You begin by putting just the octopus in a pot and setting the stove to high. As the octopus heats up, it releases some kind of liquid, a substantial amount of this liquid, and you cook the octopus in this liquid (along with some other ingredients) for 45 minutes. The octopus shrinks to about half its size and becomes firm. At that point you season it more (I soaked mine in red wine for about a half hour), cut it up, and grill it. It was another incredibly satisfying experience. I LOVE grilled octopus, but again, I have only ever had it at restaurants. It was too much fun to prepare it in my own kitchen. And it was SO delicious!!! Ahhhh! can’t believe I touched that! Breaking out of the grocery store bounds has allowed me to experience more fully the richness of the Greek food culture. I love taking advantage of this fresher and more personal way of grocery shopping as well as enjoying the final products it allows me to produce. While we are both loosing weight over here, it is definitely not due to a lack of eating well! If I could only use one word to describe last weekend I would choose colorful. 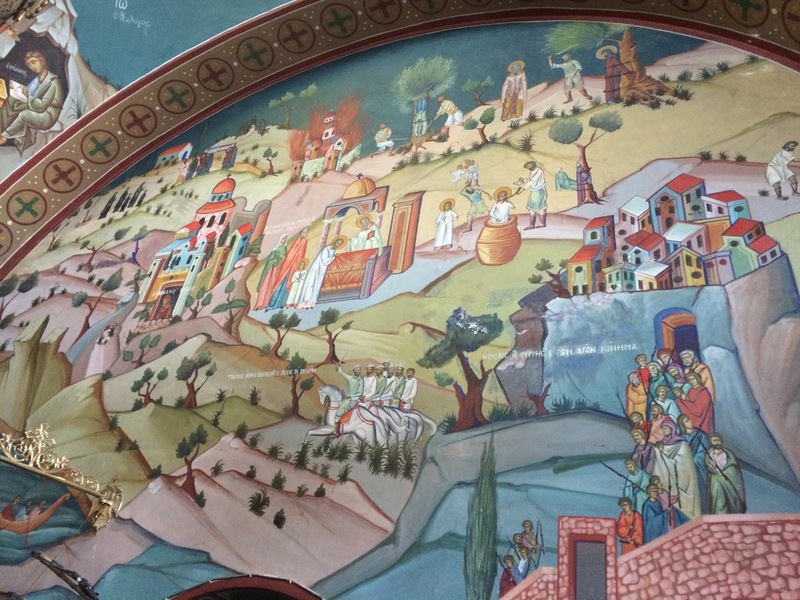 We partook of an array of experiences, we witnessed the vibrancy of the Greek culture, and the city we visited was quite literally, painted in many colors. 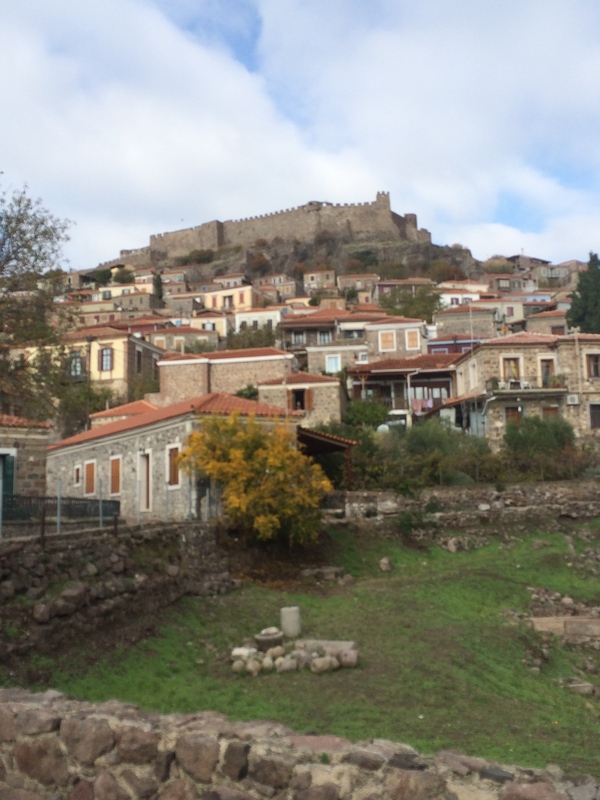 Last weekend we took a brief trip to Lesvos, also known as Mytilini. I have to give Mikey the credit for the initiation of this trip. Sts. Raphael, Nicholas, and Irene were martyred on this island and we have small pieces of their relics at our school in Boston; since we have this connection with the saints, Mikey really wanted to make the trip to the island. I did not know much at all about the island but I am always up for traveling so there was not much convincing needed to get me on board. We should have realized we were going to have a unique weekend from the moment our plane attempted to land on Lesvos. Yes, I did say attempted. On Friday night, as we were in the midst of our descent, the pilot abruptly shifted back up and out of his landing. A few moments later he explained to his very confused and concerned passengers that the weather was not conditional for landing but that he would try one more time. 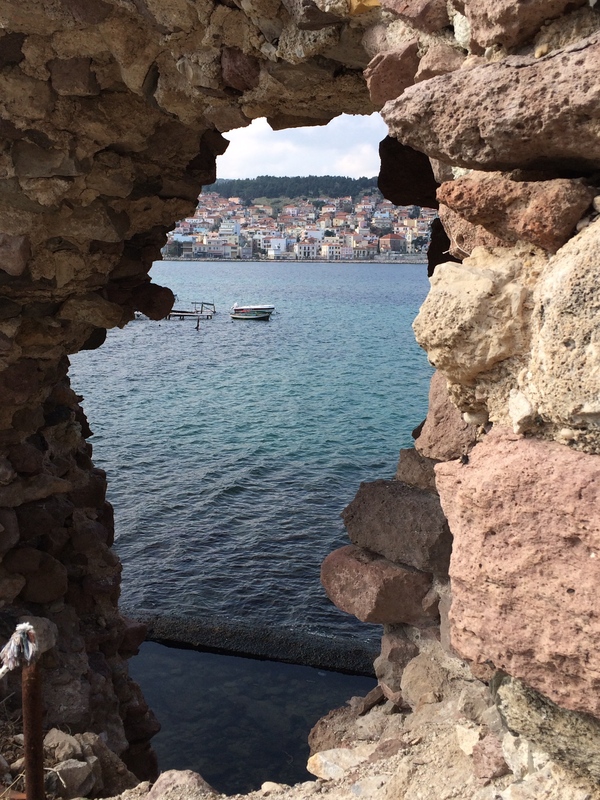 If he couldn’t make that landing, we would be going back to Thessaloniki for the night… Most of the passengers I believe were murmuring out of nervousness for their safety; I however was anxious that we would not get our weekend vacation that I was so excited for! About 20 minutes later we made it safely to the ground and the plane erupted in applause. Not just the type of applause that you would anticipate in a situation like this, but they type of hooting, hollering, and whistling you would imagine at a European soccer match. And when the applause finally settled down, there was a second round of hooting, hollering, and whistling. Mikey and I couldn’t stop laughing. Before the plane had even stopped moving, people where unbuckled and getting their bags from the overhead bins. The flight attendants had to run down the aisles and make the people sit back down. Even on my flights to and from Athens, I have never experienced such a rowdy Greek crew on a plane! Once we were safely on the ground, we made our way to our hotel and checked-in. We were staying at a very inexpensive hotel but the owner was extremely welcoming and gracious. He gave us a map, showed us were many different restaurants were, and encouraged us to go to one in particular where he explained the mother of the owner was the cook. Our ears perked up at the sound of that. He also told us if we needed a rental car the next day he would call a place in the morning. We weren’t sure at this point if we completely trusted the guy but we figured we would give the restaurant a try. We got settled in and headed out to explore the city. 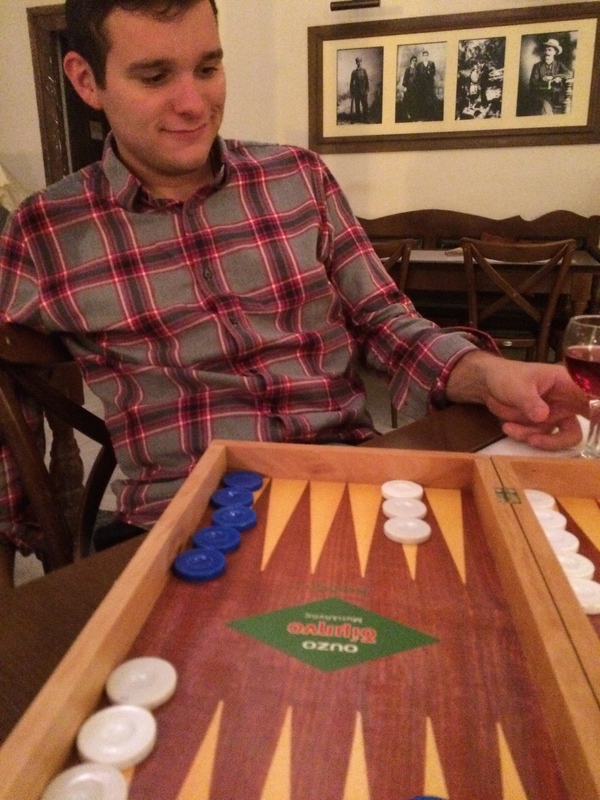 It was dark and still a little rainy so we didn’t get very far but we window shopped a little and then stumbled upon a huge café with Tavli boards obviously situated on the tables. 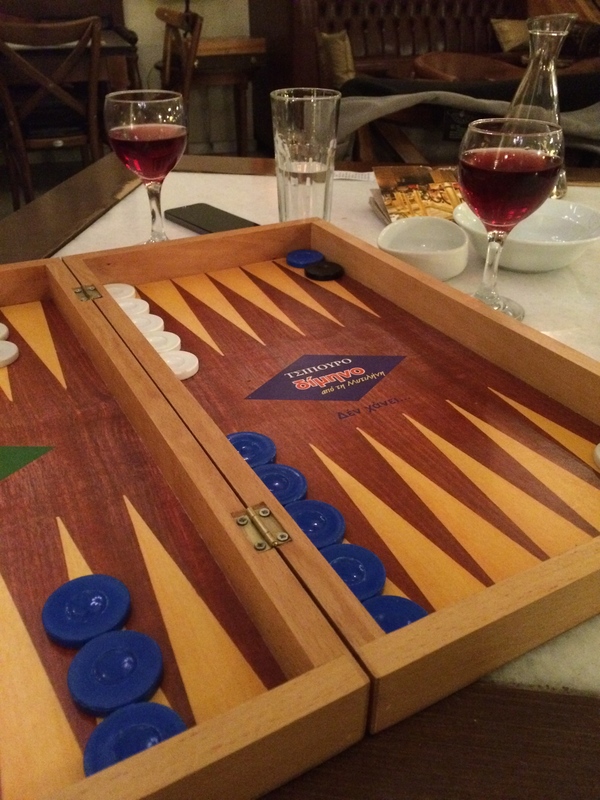 It was only around 8:30, not quite dinner time yet for the Greeks, and we didn’t want to embarrass ourselves by walking into a restaurant at this hour, so we decided to get a glass of wine and warm up for dinner with a friendly few games of Tavli. We laughed and relaxed in the comfort of this spacious café decorated with floor to ceiling black and white photos of Mytilini from days long past. We then set out to find the restaurant and finally stumbled upon it. We thought perhaps we were being sent to one of the touristy places but we were most definitely wrong. This was a hole in the wall local spot for certain. We perused the menu a little bit but ended up asking the waitress for her suggestions. When she brought out our various plates of dinner “mezedes” style, we knew this was going to be a fantastic meal!! It was home cooked for sure and ever so tasty!! The next morning we woke up pleased to find the sun shining; the bad weather was behind us! Mikey went down to find out about a rental car (we decided we trusted the man at the front desk after his suggested restaurant passed the test with flying colors) and about 5 minutes later Mikey came running up the stairs explaining that he was going to get the car and he would be back soon. Slightly confused but not at all surprised, I continued to get ready. He came back shortly after and explained that he signed nothing, left them no credit card to have on file, gave the no telephone number, only gave them a copy of his passport and 25 euro in cash and they handed him the keys to a car for 24 hours. The whole situation was slightly sketchy and pretty humorous! 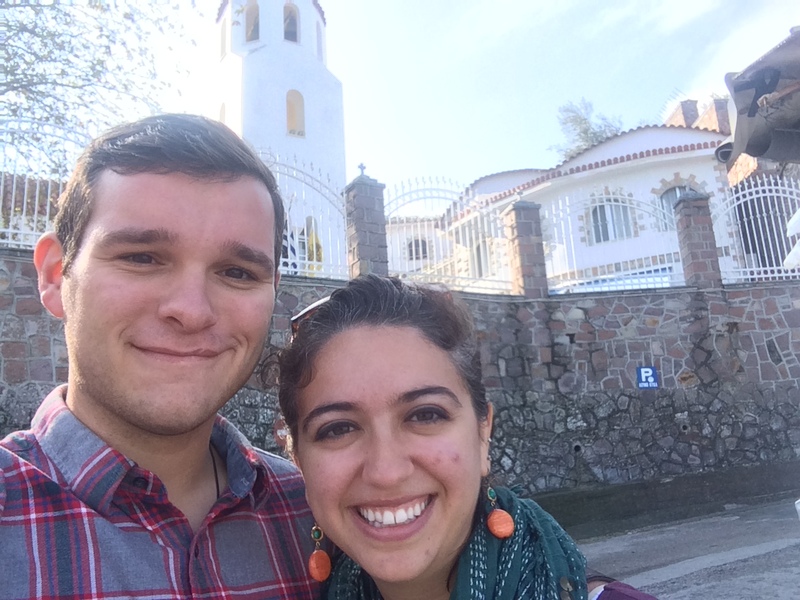 We set off on our day of adventures: first stop the monastery! As Dr. Tim taught us, you always honor the place you visit by visiting their saint(s) first! 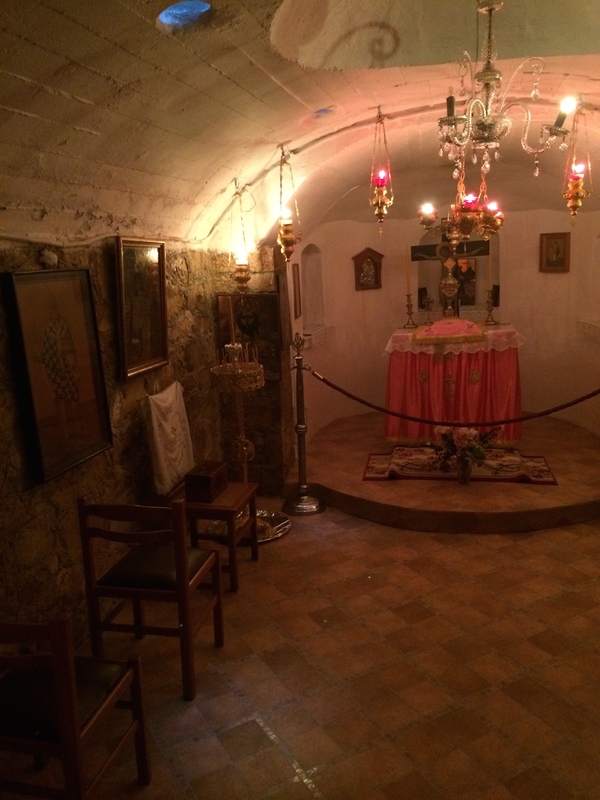 We entered the monastery and found the two different chapels where the relics were held. 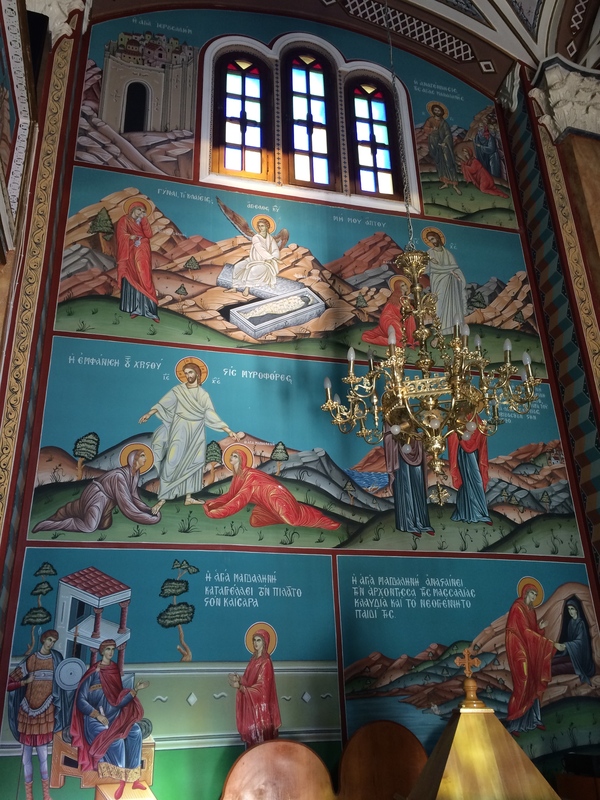 The churches were beautiful and covered in iconography depicting these saints’ lives. Many people flowed in and out of the chapel taking their turns venerating the relics entreating to the saints to intercede for them. I was moved again by the sincere piety. 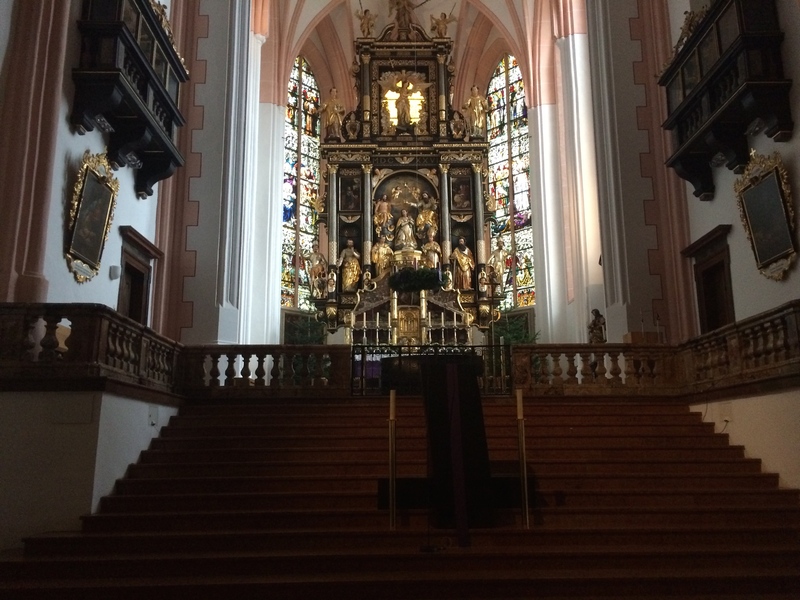 We asked one of the nuns to tell us more about the saints and any stories she had about them. She gave us the full story of these holy saints who defended their faith and in turn suffered the wrath of the Ottomans. 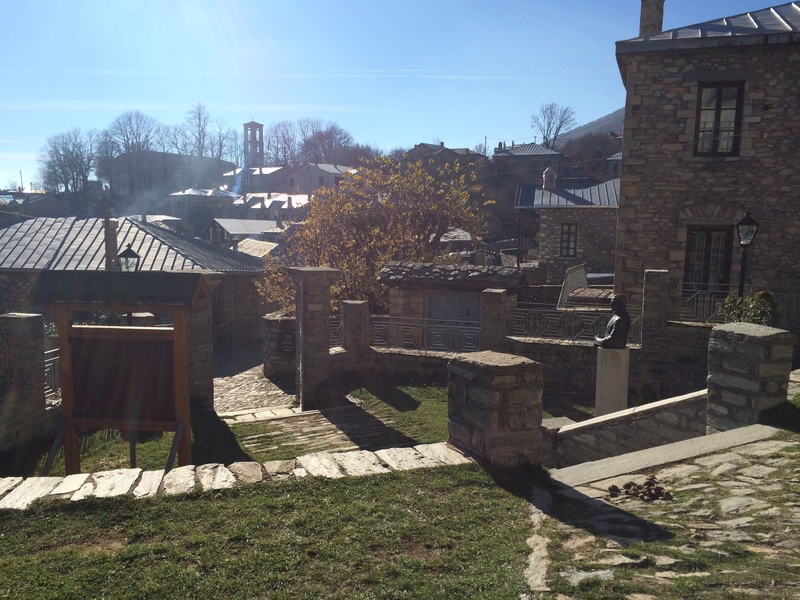 The nun directed us to her grave, which was in an area not open to the public, as well as to a beautiful catacomb chapel that the Gerondissa built in honor of the Virgin Mary. 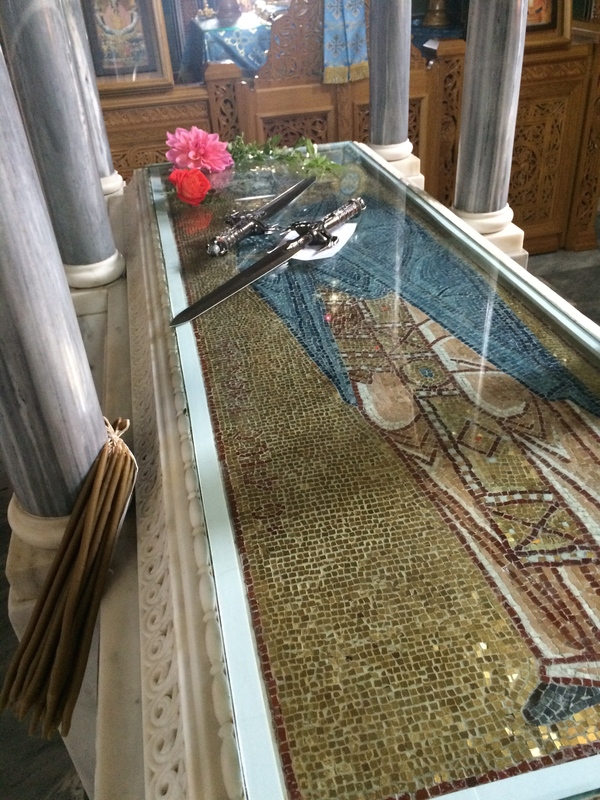 The Gerondissa’s first dream was to build a monastery to St. Mary Magdalene and so there is a church right next to the monastery dedicated to her. I love St. Mary Magdalene so much and so the nuns opened the church for us and let us see the incredible iconography depicting her life. We were so thankful to have been shown all of these treasures in the monastery! The nuns were so incredibly hospitable. We left feeing spiritually full and refreshed. Our next stop was in the hopes of achieving a bodily cleansing: the famous hot springs! 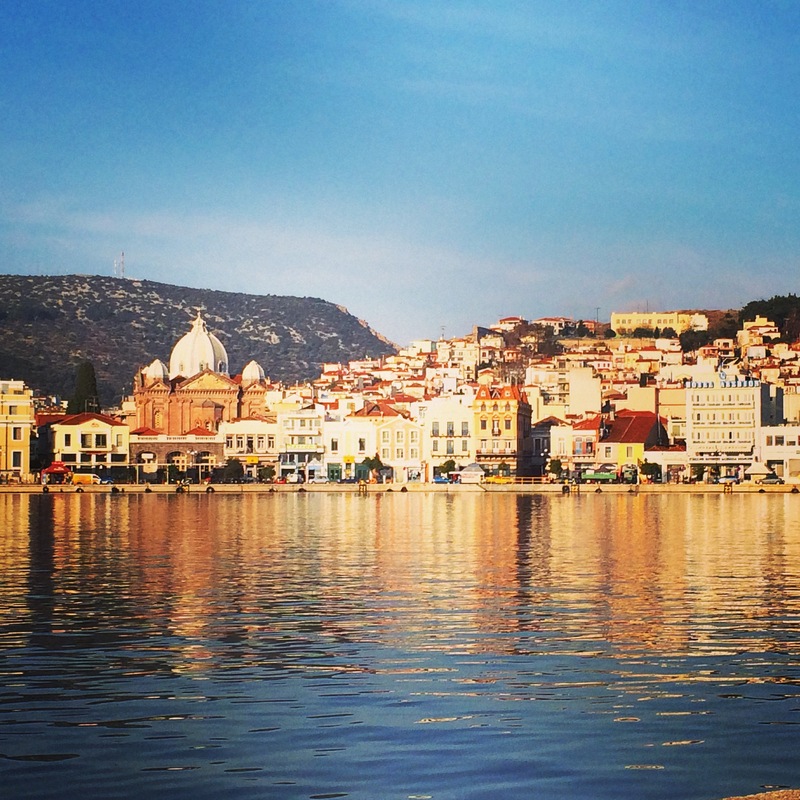 Lesvos is famous for its natural hot springs. These are areas in the ground that spring forth medicinally hot water. We had read about them and selected one to visit. 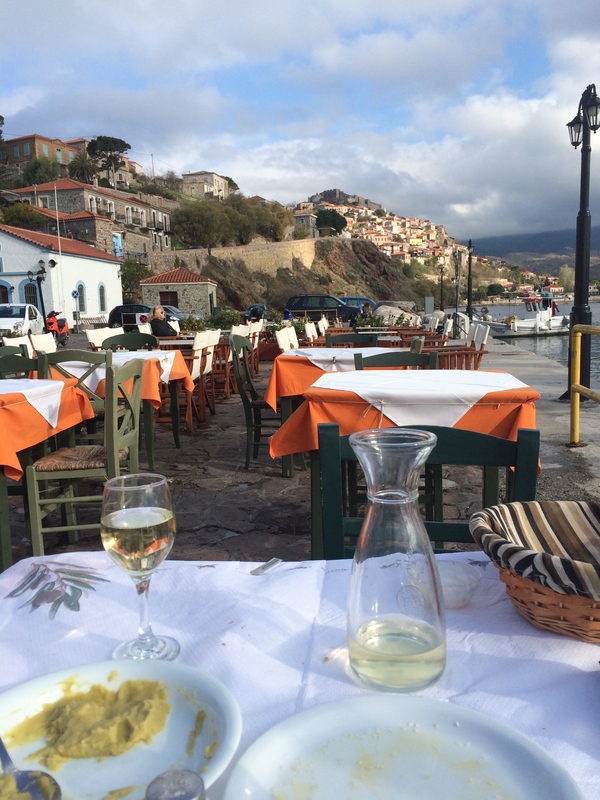 But before we visited the springs, we stopped in the town of Molyvos to enjoy a meal on the harbor. Now, it may be the middle of November, and while it is a little too cold to swim in the sea, it was a perfect afternoon to sit in the open air by the water. The sun was shining, the breeze was perfectly comfortable, and I found myself happily situated near that glistening turquoise sea that I grew to love so deeply on Paros! The waitress came and gave us a run down of the menu, including our fish options. 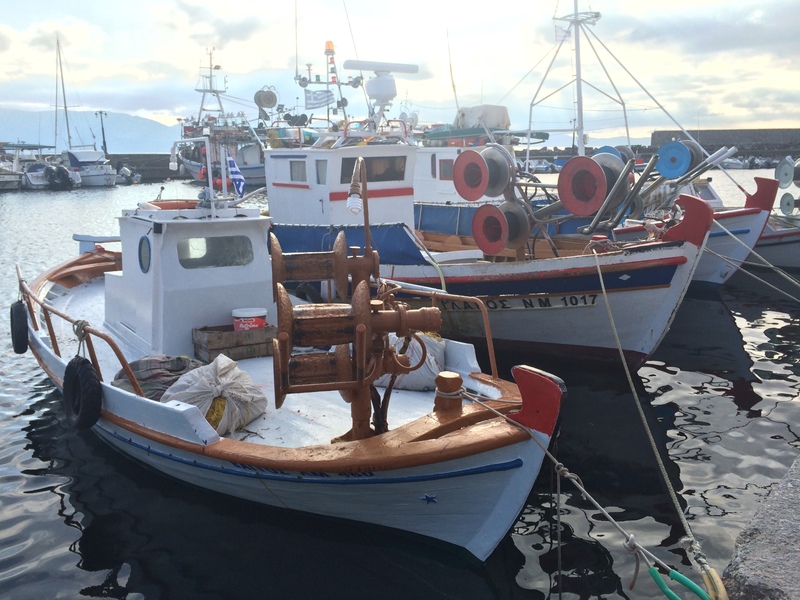 When we asked her which fish were local and fresh she chuckled, pointed to the boats only meters away from our table, and said, all of the fish is fresh and comes from these boats. We settled on the red snapper along with a few small plates. 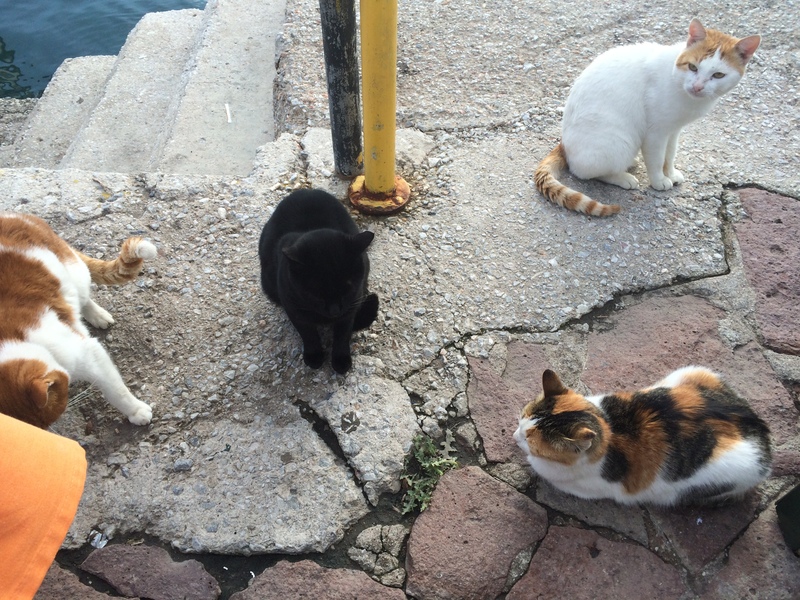 As we waited for our food we noticed about six or seven cats in a crowd next to another table. 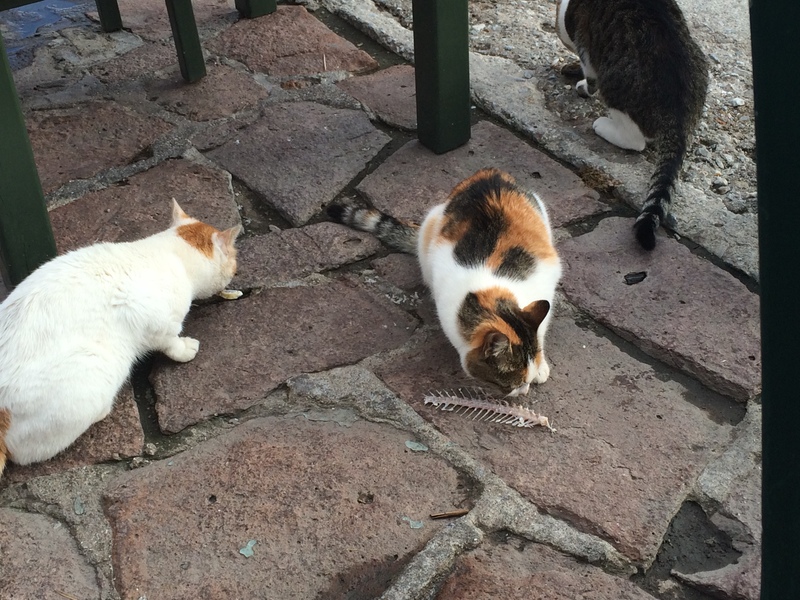 It is very normal to see stray animals out and about the streets of Greece but we observed that these were not your normal stray cats; these were a bolder and hungrier breed. Almost at the exact moment as our food was brought to our table, all of the cats made their way to our feet. We fileted our tender and buttery red snapper and tried to ignore the cats. Just as we dug into to our meal, a cat leapt ONTO the table and zoomed in directly for my plate! I jumped and didn’t quite know what to do. Mikey yelled, “push it off!!! !” and when it finally registered that I needed to get that cat off the table immediately – I shoved it off! Thankfully the cat was not quick enough to get to my food!!! I was stunned at the boldness of the cat! And then, just a few moments later, another cat leapt on the other side of the table and before we could shove him off, he grabbed the head and backbone of the fish that we had set on a separate plate! Still in shock, we could not contain our laughter! Never have I ever experienced anything quite like this before, especially at a restaurant! We are still laughing about it! 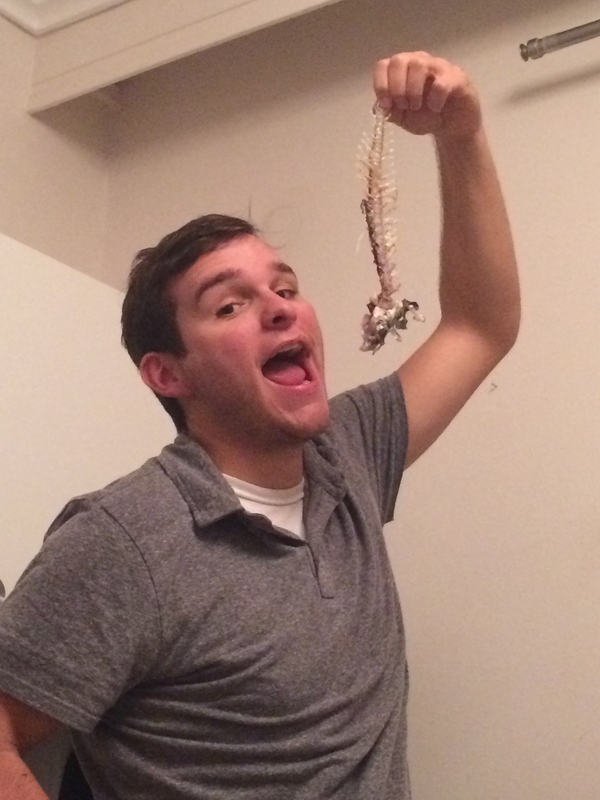 devouring our fish bones…thank goodness the actual fish made it to our stomachs! After lunch, we set off for the hot springs. Again, our map and the road signs made it easy to navigate. 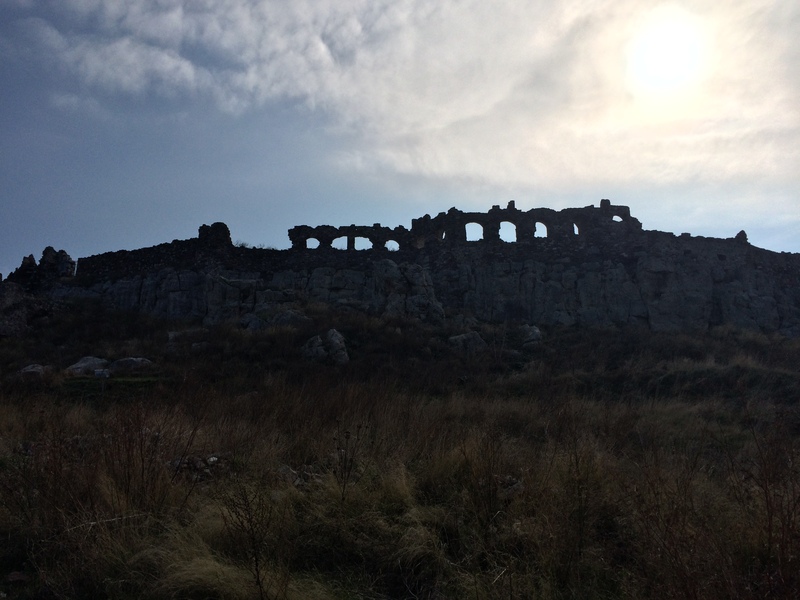 We drove up to find a stone building situated right next to the water. You could only drive so far so we parked and walked the rest of the way along the shore. We found a very hospitable couple siting in the main room of the building. They welcomed us and gave us the run down of the springs. The building held a few private baths and the main bath. 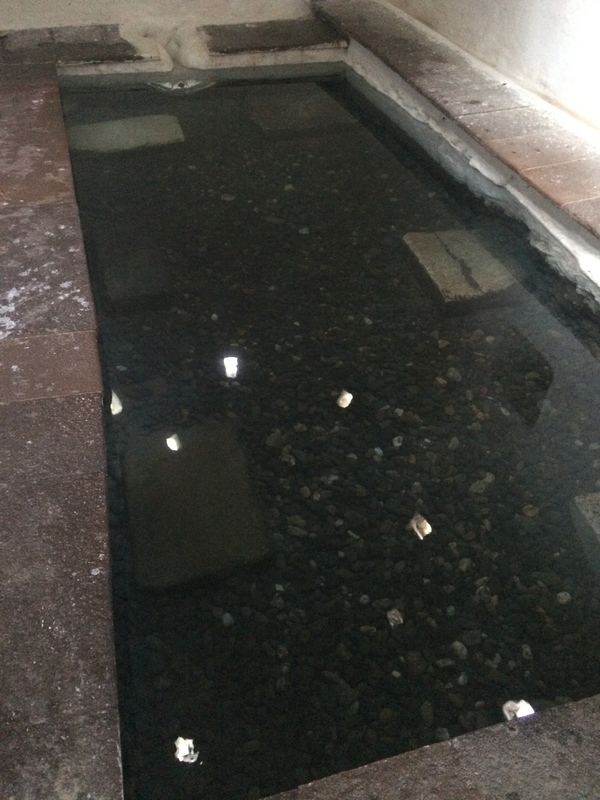 The main spring basin is from the 16th century and the water is naturally 115 degrees Fahrenheit! We wanted to use the main bath and it ended up being a private experience because we were the only ones there! The owner explained to us that you go into the bath for about 5 minutes and then come out for a few minutes and repeat that cycle several times. The body can only handle the heat for short periods of time. She said if we really wanted an experience, each time we came out of the bath we could walk outside and go into the sea!!! We of course wanted the full experience. I could not believe how warm the water was (naturally!) It was incredible soothing and relaxing. I felt my muscles almost immediately completely relax. I understood though how your body could not be in that kind of heat for too long. My heartbeat went up significantly and I could tell when I needed to come out for a break. We took the owners advice and went out to the sea! Now, while it is not nearly as cold as Chicago or Boston, it is definitely not swimming weather! However our bodies were so warm from the bath that the sea was a welcomed crisp and refreshing experience! We went all the way in for a few moments and then made our way back to the bath to heat up again. I have never experienced a sensation quite like this! I literally felt like my entire insides, from my throat down to my toes, especially my lungs, had been cleansed. After repeating the cycle a few times, I was literally floating. We walked out on clouds and I tried desperately to cling to the sensation for as long as possible. For those of you who have ever gotten a massage – you know the feeling when it is over, when you feel like you have a brand new body? This was a very similar experience. That is the sea we jumped in! From there we set off to our final destination of the day before heading back to our hotel. 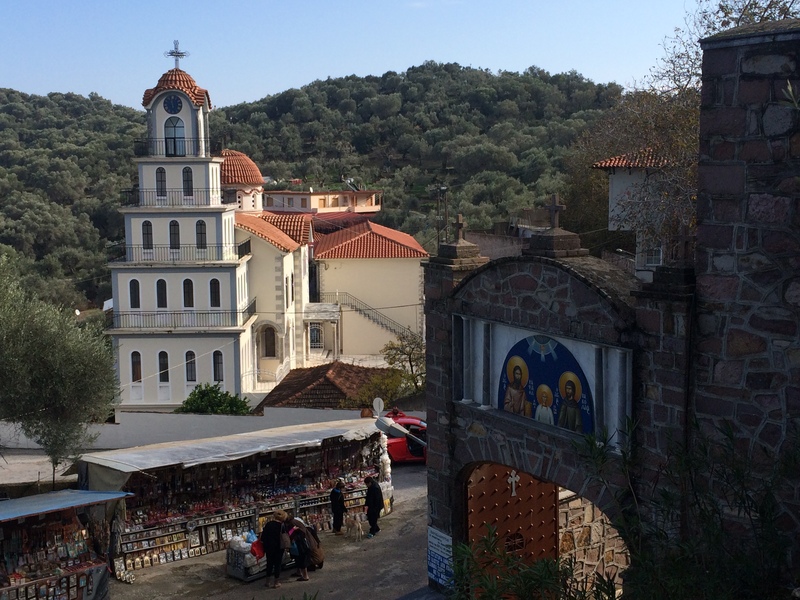 Our final stop: the ouzo capital of Levos. 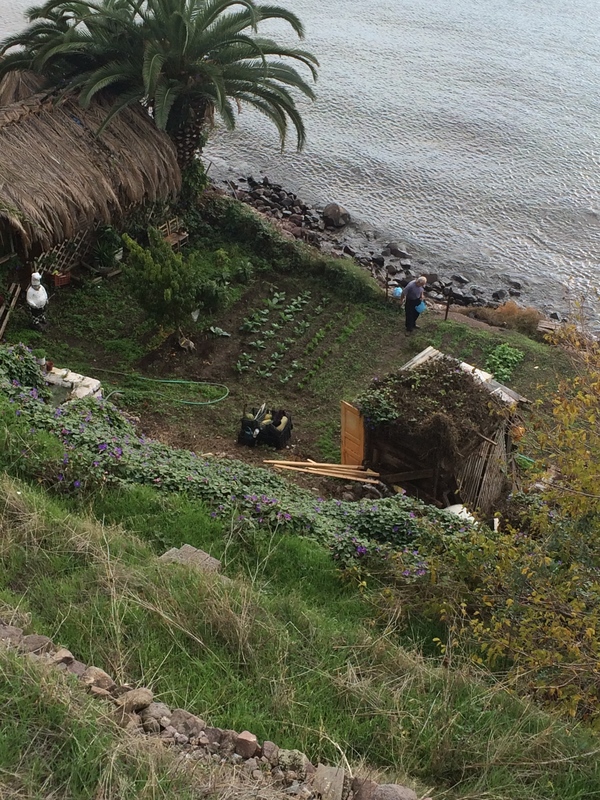 We were at the northern tip of Lesvos and we needed to get directly to the very bottom. Ouzo is one of the major commodities produced in Lesvos. 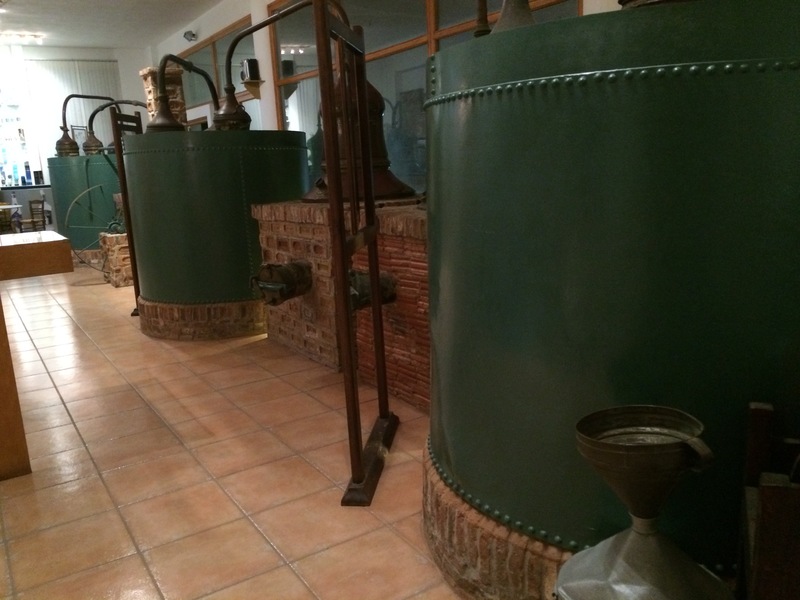 In Plomari, there is a family who has been making ouzo for over 150 years. 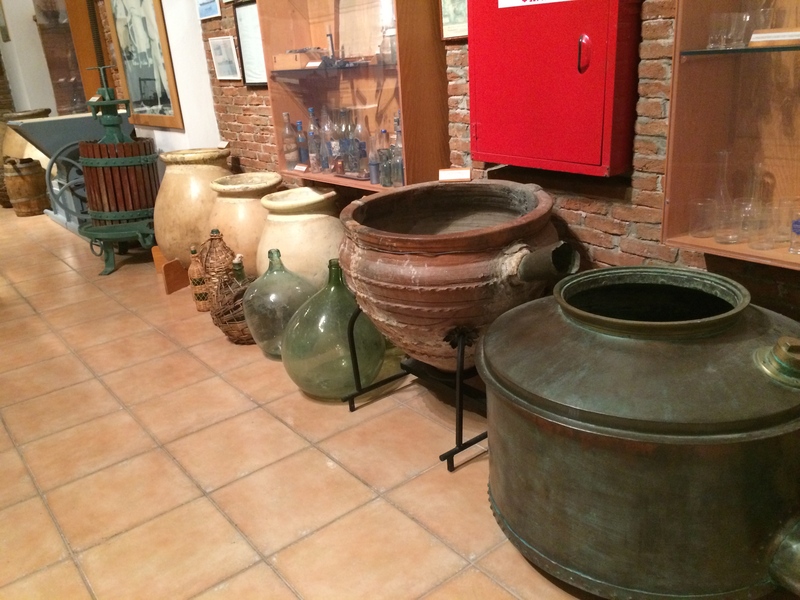 They have maintained the integrity of the ouzo production process over the years and they have a museum in Lesvos that we were very interested to see. 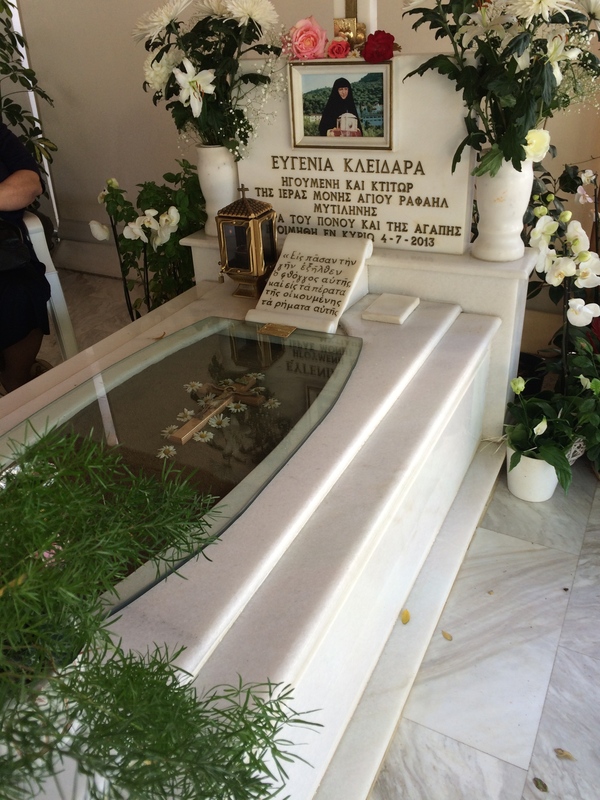 Neither of us are big ouzo drinkers but seeing as ouzo is a big part of the Greek culture, we decided this was a must see during our time on the island. We had no idea what time the museum closed and we realized that we might not make it but we decided to go for it. What a drive! It started out as absolutely breathtaking. 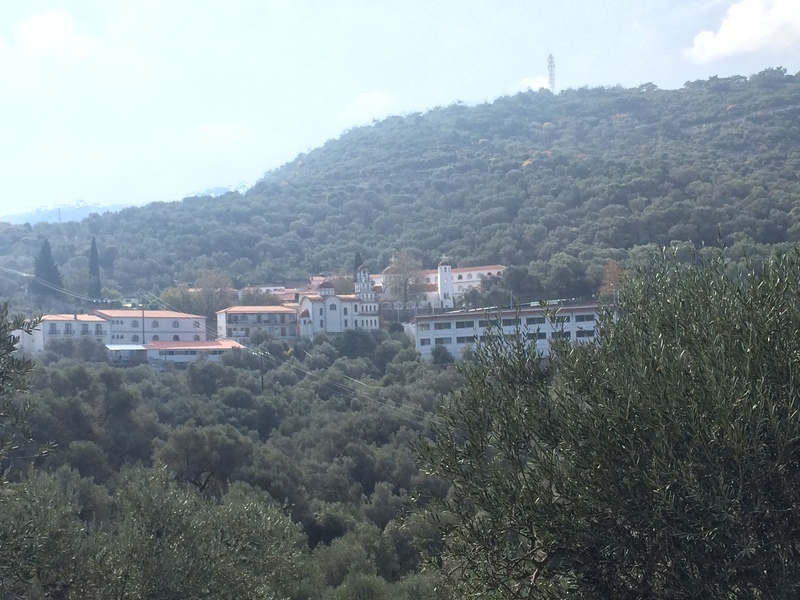 We traveled through the olive tree coated mountains enjoying spectacular views of the sea. 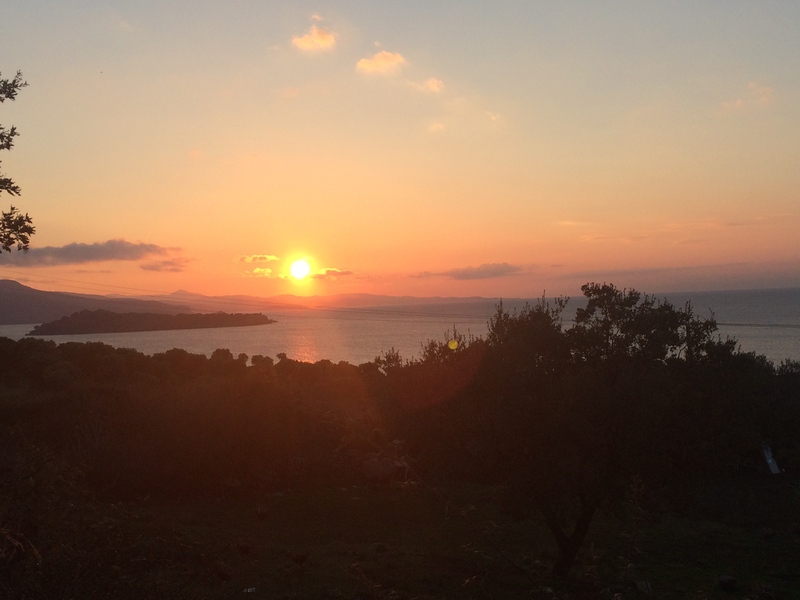 Turkey is so close to Lesvos that we could clearly see it across the water! This is not your typical “blue and white” Greek island as most of us imagine the Greek islands to be. 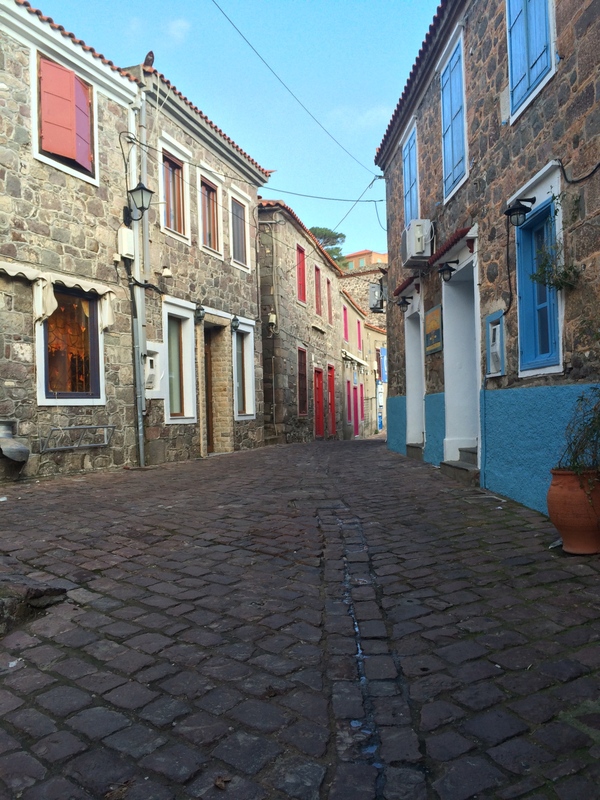 The buildings on Lesvos are all built from beautiful stone accented with a variety of bright colors. I fell in love with these homes. We enjoyed a brilliant sunset to close out the scenic part of the drive. 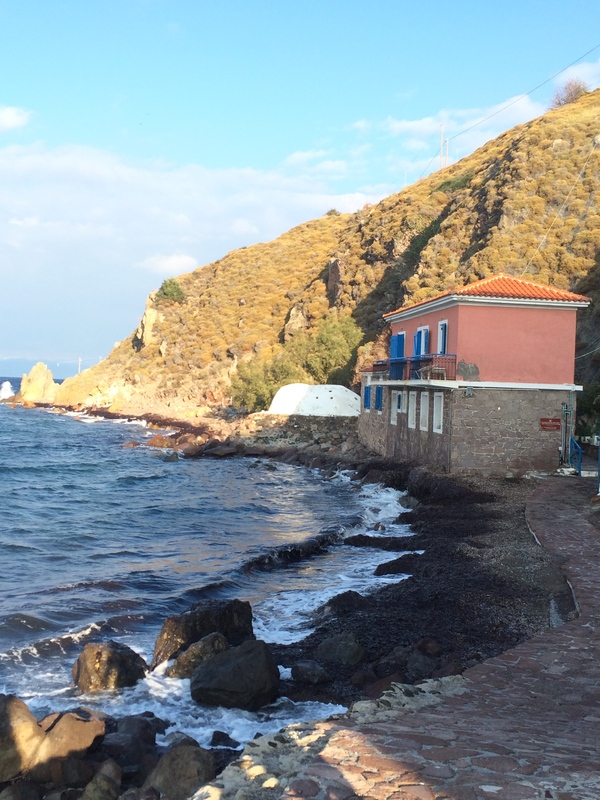 From dusk until we arrived in Plomari, we had and adventurous, curvaceous, and hilly drive. We were traveling true mountain roads. I was thankful that Mikey was driving and he was thoroughly enjoying the manual shift car on these turns and hills. An old man tending his crops! We finally pulled into Plomari around 7. 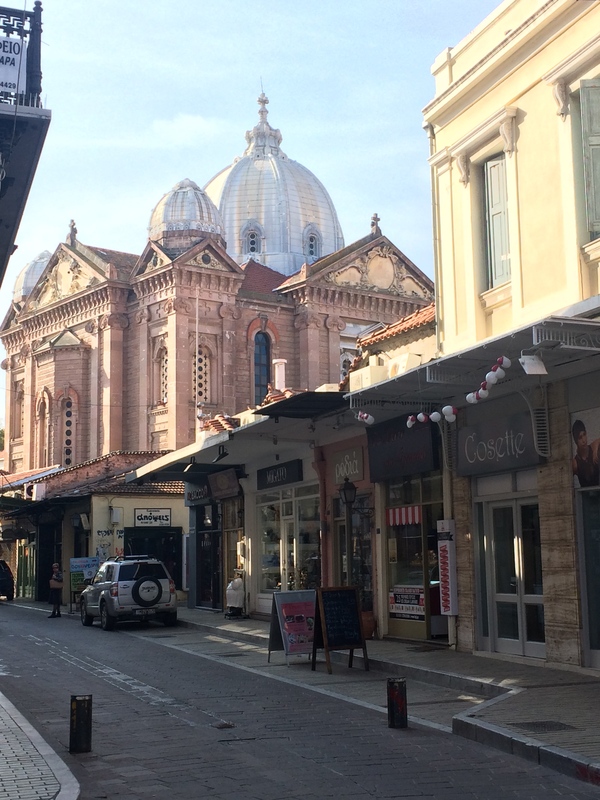 We were sure the museum would be closed but we thought perhaps there were some shops we could go in and get an ouzo experience from. 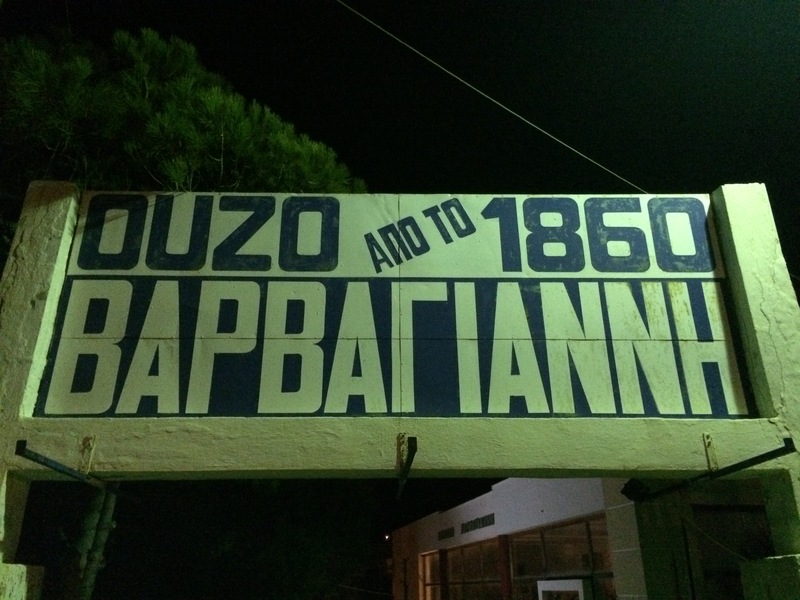 We parked in the center of town and after walking only a few moments, we found an ouzo shop with the same name as the famous ouzo company. We went in and began to inquire about the museum. The man who was managing the shop informed us that the museum was closed. 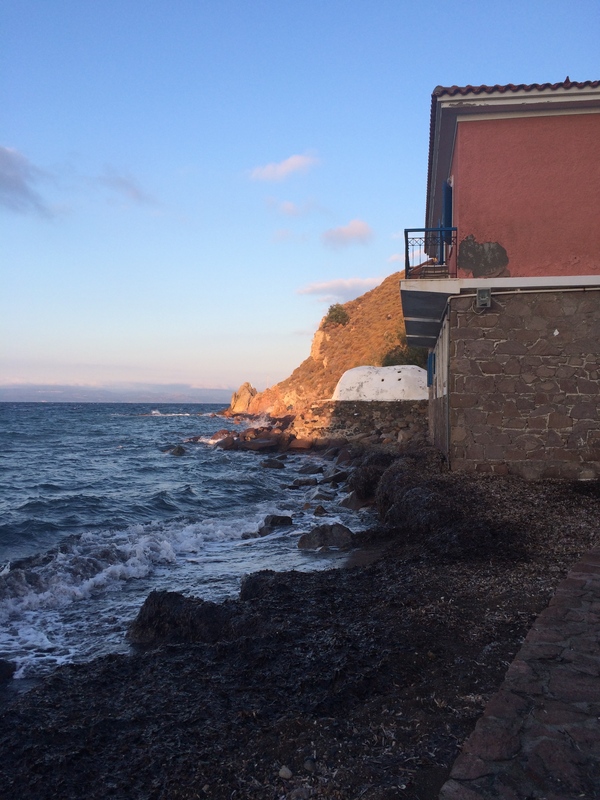 He asked where we were from and where we were staying and when he learned that we would be leaving Plomari that same night, he seemed bothered that we would not be able to see what we came to see. Mikey asked the man if he could tell us a little of the history and the next thing we knew, we were sitting at a small table in his shop, pouring through a beautiful coffee table book about the museum, and our new friend was ordering us Greek coffees from his buddy the owner of the café next door. Mikey turned to me and said, “you know we are going to end up at the museum before this night is over, right?” I laughed, skeptically. 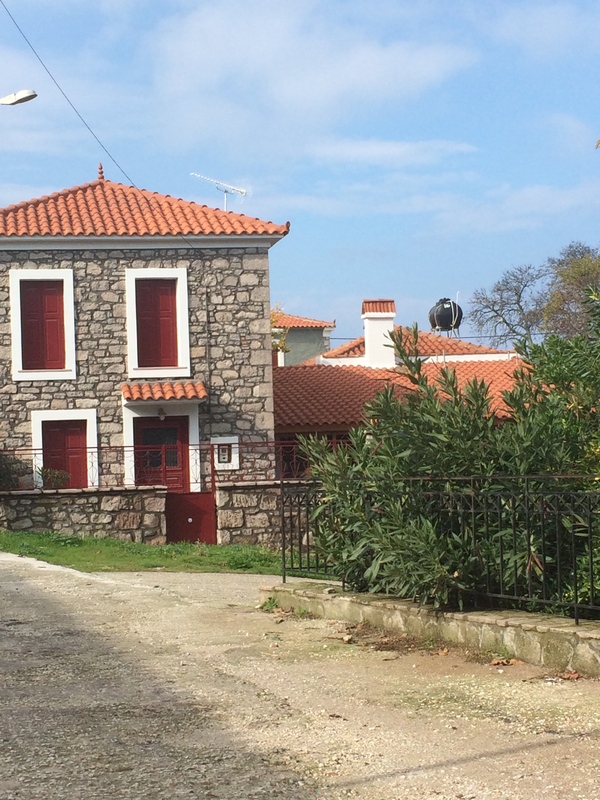 family and how they grew their ouzo company, maintained the integrity of the production process, and still remain a family company today. As we closed the book and started to thank Panayioti for his hospitality, he interjected and explained that he has some work to do at the museum and that he found someone to watch his shop so we could all go to the museum! I couldn’t believe it! Mikey and I both supposed that at 7:30 on a Saturday night he could not have very pressing work to do at the museum; we were extremely grateful for this unique hospitality. We got in our car and followed Panayioti, who road his moped a few minutes up the road to the museum. He opened the museum and left us to take a private tour for about a half hour. It was a fascinating museum and was very nicely put together! 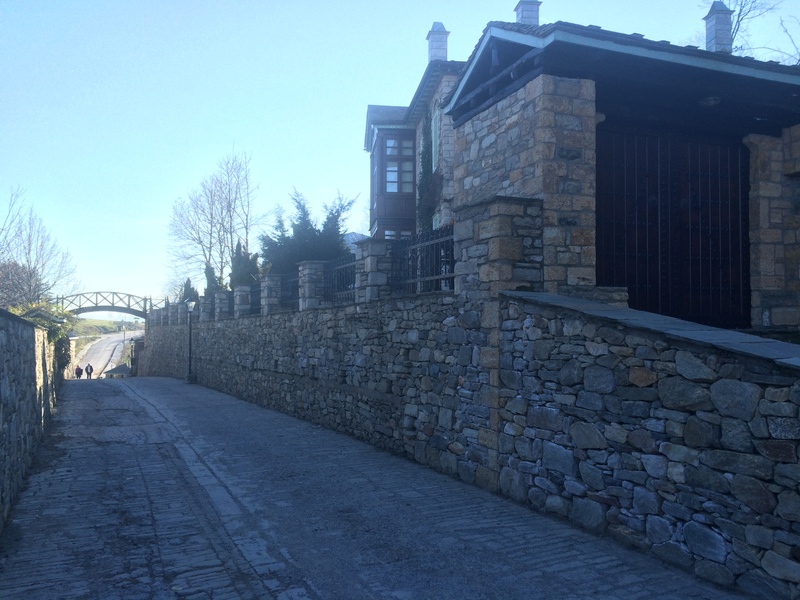 We enjoyed getting a glimpse into this family’s history and into the production of this product so famous to Greece. After we left the museum we followed Panayioti back to his shop to thank him profusely and to buy a few little bottles of the famous ouzo. Far more than the interesting museum, I was moved by this stranger’s unbelievable hospitality. I have to say, this is one thing the Greeks do so well. We had come a long way to visit his town and in his mind, there was no way he could send us on our way with out taking us to see what we came to see. There was no question about it. And of course he took care of us with coffees as well. That instant welcoming and care for a total stranger is so unique. 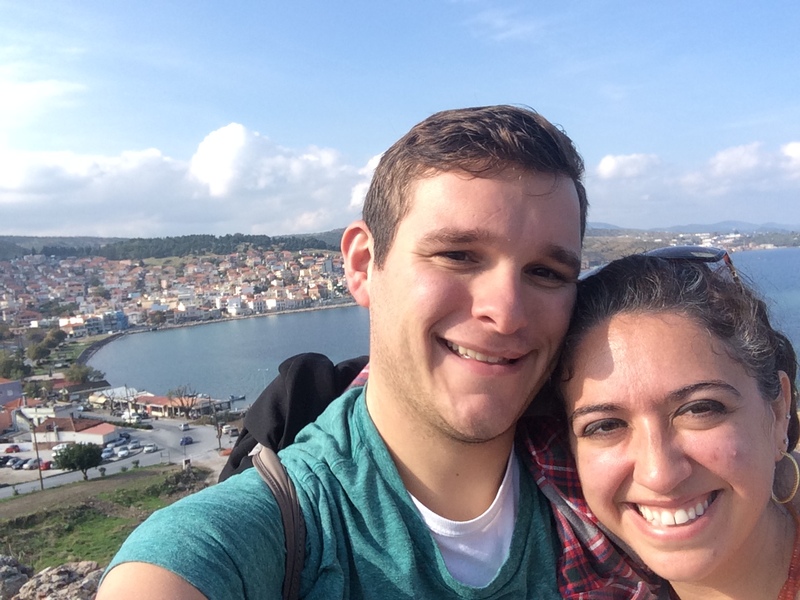 It is my favorite aspect of Greece and it is a way of being that Mikey and I strive for in our home. 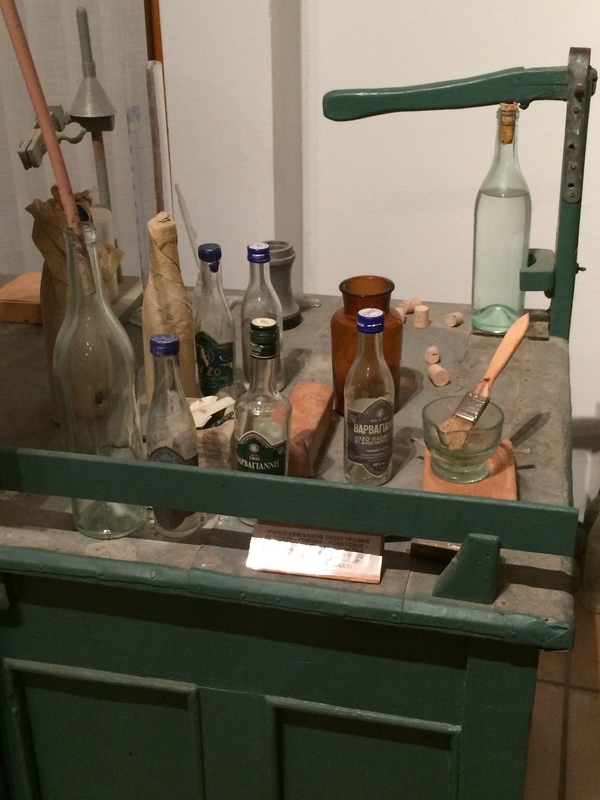 They used to label the bottles by hand! 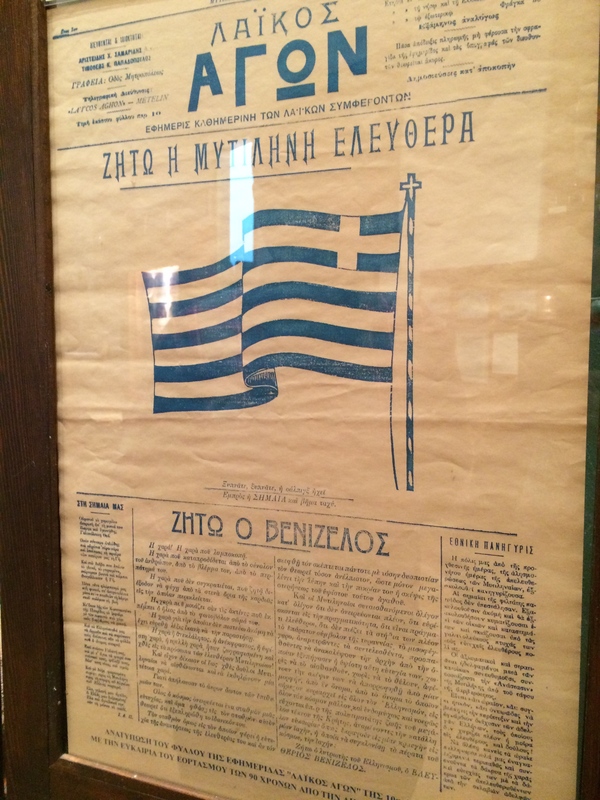 An article on the day that Greece regained their freedom from the Turks! 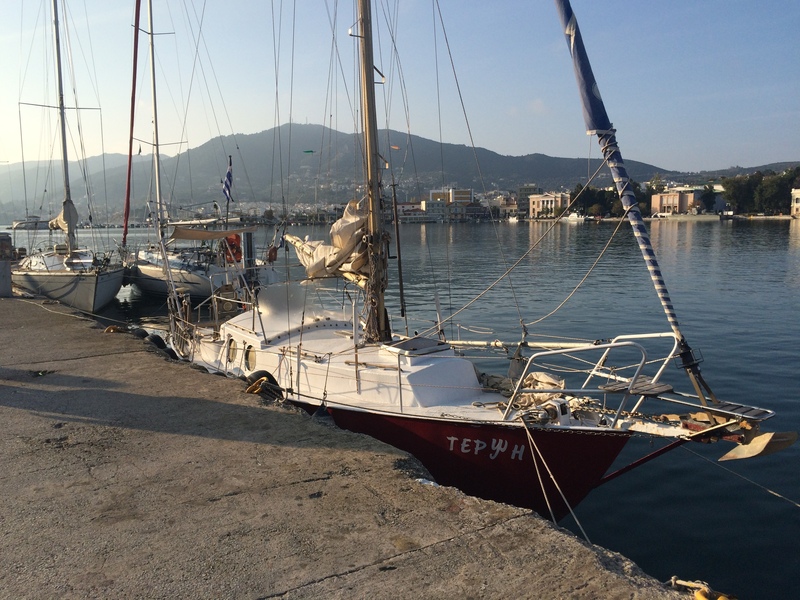 We departed Plomari and headed back to Mytilini after our long day of adventuring! We grabbed a quick dinner followed by a few sweets and slept ever so soundly! Sunday was more relaxed. 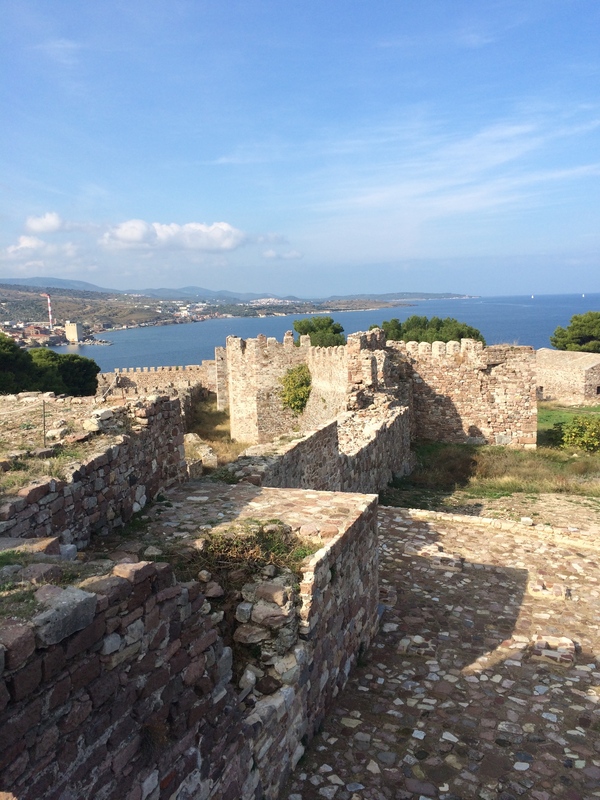 We went to liturgy at the city’s cathedral, explored the town, had another delicious meal on the water, and toured the amazing castle of Mytilini. 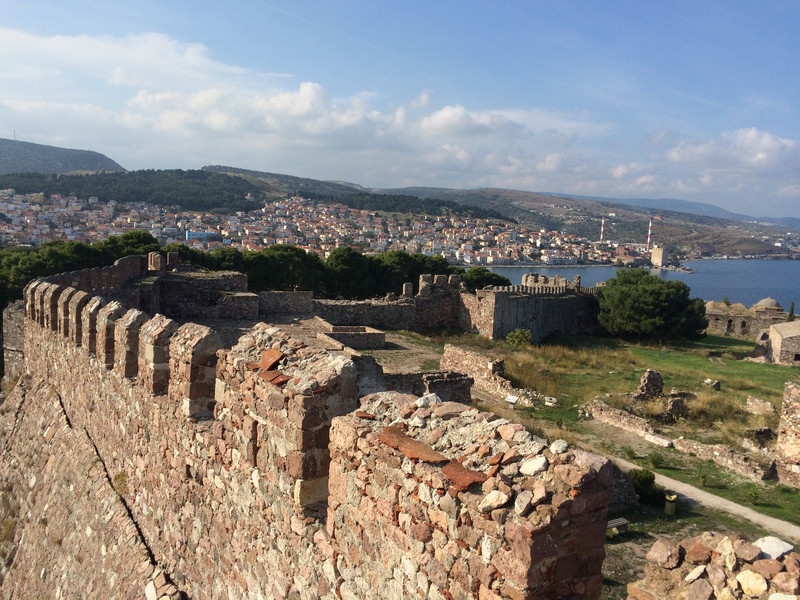 This castle was built in the Byzantine times and then was used by the Ottomans during the Ottoman occupation. 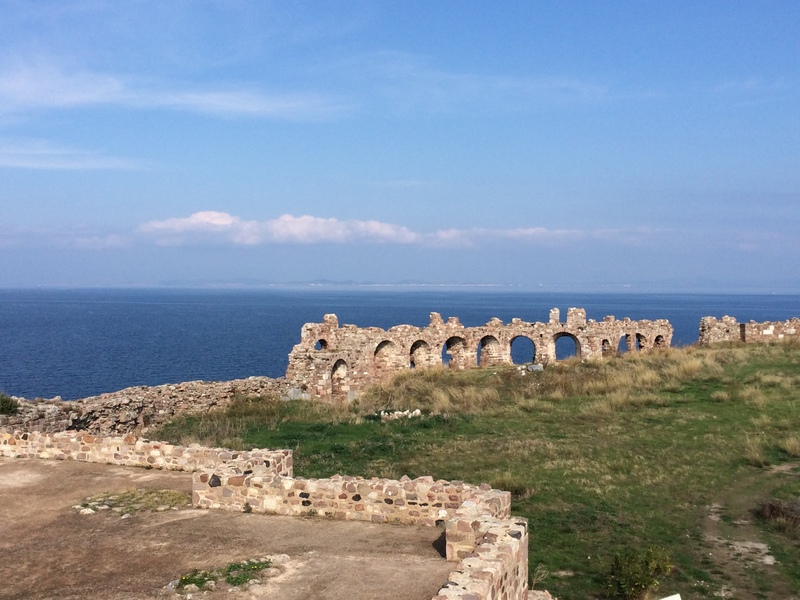 We enjoyed the history and views that this castle offered us. The beautiful skyline of Mytilini! 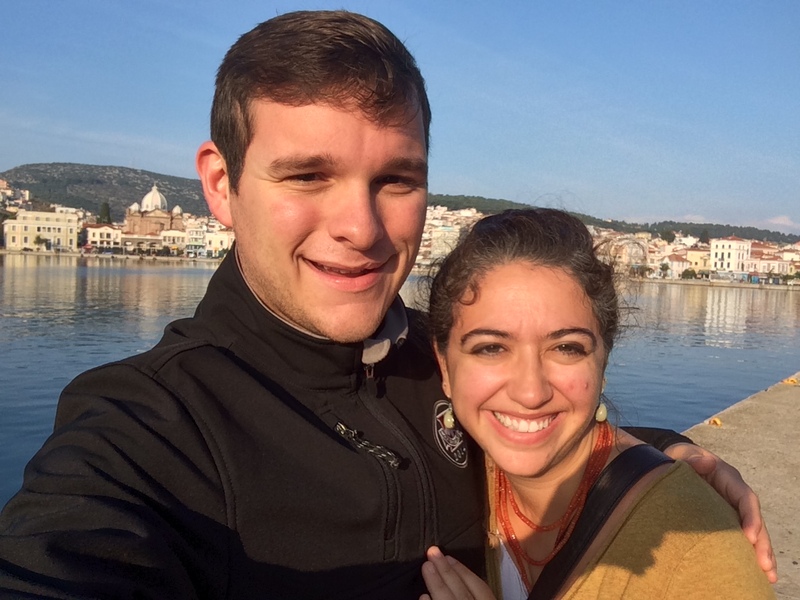 Can this second honeymoon last forever?! We left for the airport spiritually full, physically cleansed, and emotionally warmed. What a fun and rich weekend on this unique island! We invite you to share in a glimpse of our travels as we explore our spiritual and cultural roots. #nationalsiblingday = an excuse to post photos not of Jonah. Love you to death dear brother of mine! Thanks for being such a wonderful brother and now uncle to my son! !